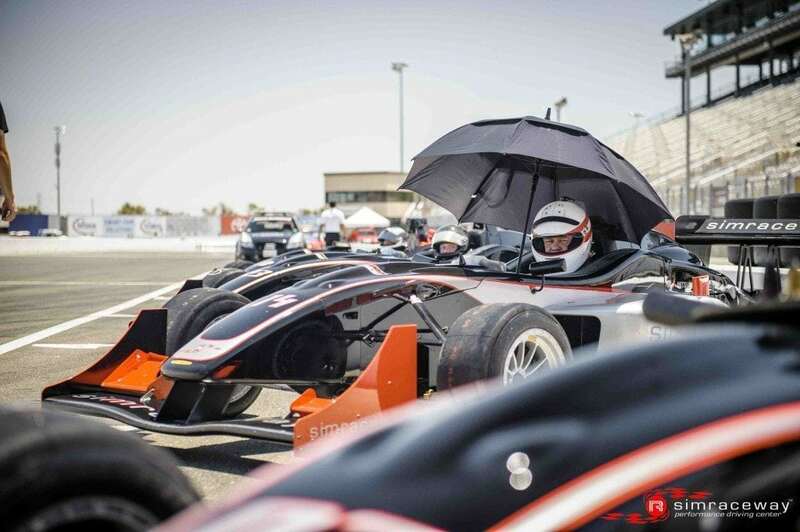 A bright sunshiny day greeted the drivers for race 1 of the 2014 Jim Russell F3 racing series. 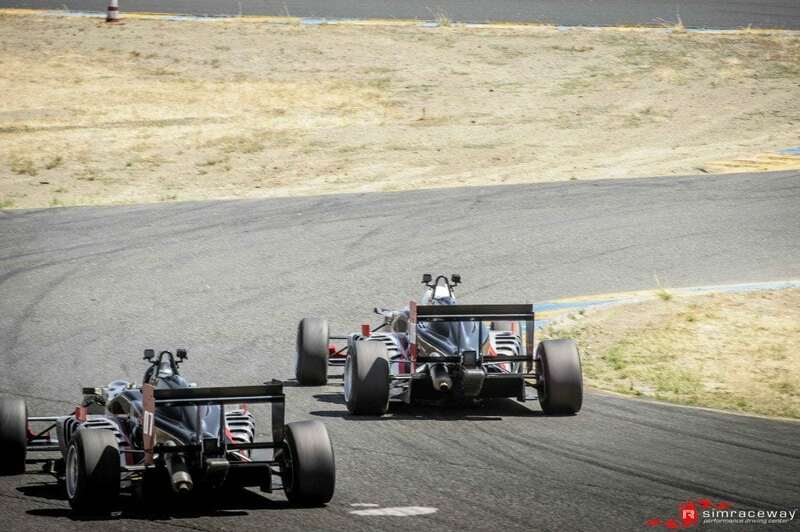 The #3 car of Poleman and 2013 Simraceway karting champion Kevin Woods led the way up the hill into turn 2, but a mighty start by Tim Adolphson saw the #5 car jump from 4th to 2nd position as the elder statesman used some keen reaction and guile with a move on the outside putting him just ahead of No. 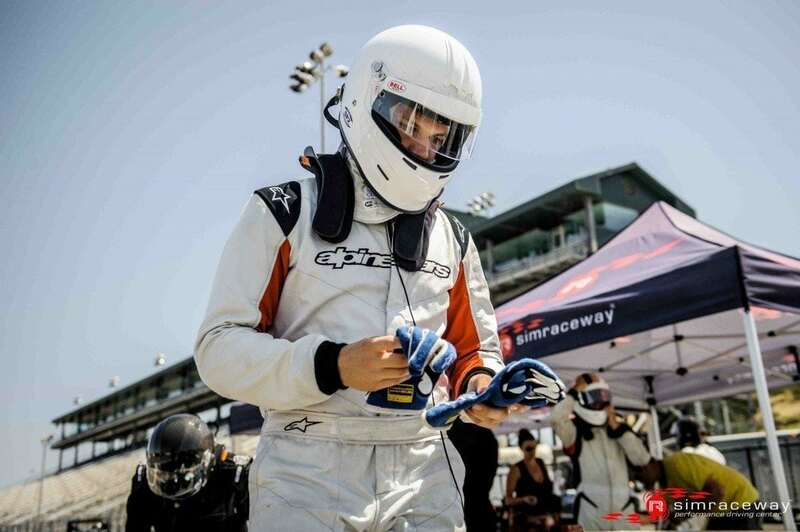 2 starter Ryan Garcia. 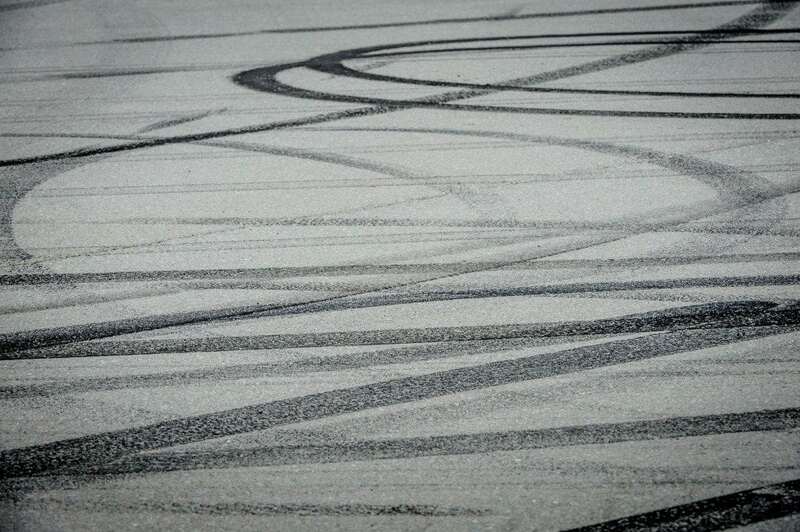 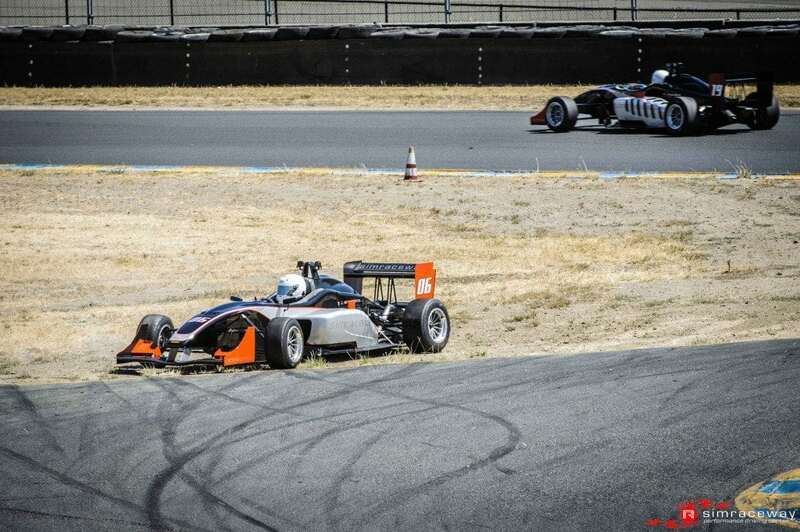 This was short lived however as a some aggressive speed on cooler tyres led to a massive sideways moment on the exit of turn 2 that allowed the 2 cars back by before he gathered it up and was back on his way in a more forward direction. 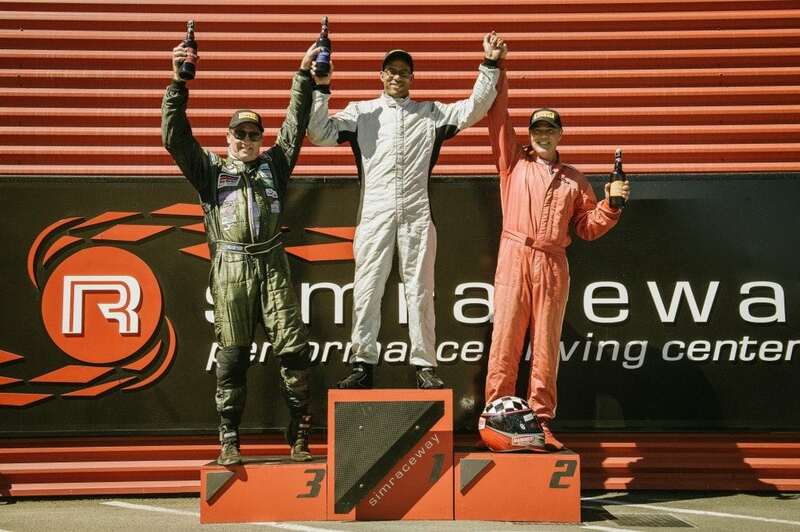 Things evened out at the front as Kevin, Ryan and 3rd place Chase Murray pulled away from the rest of the field. 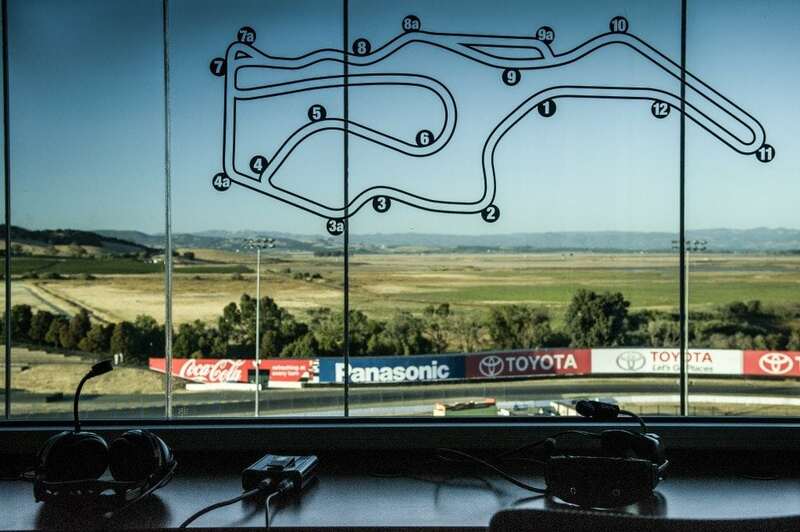 But the battle of the race was for 5th place, initially held by Steve Campbell he soon came under pressure from the Argentinian Roy Block to the delight of his impressive fan base watching from turn 2. 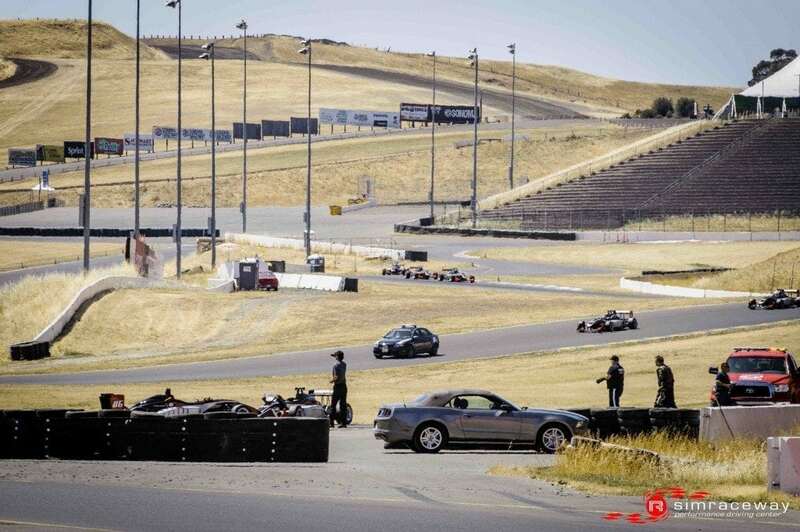 Roy reeled in Steve and waited for his chance as he sized him up in the braking area for turn 7. 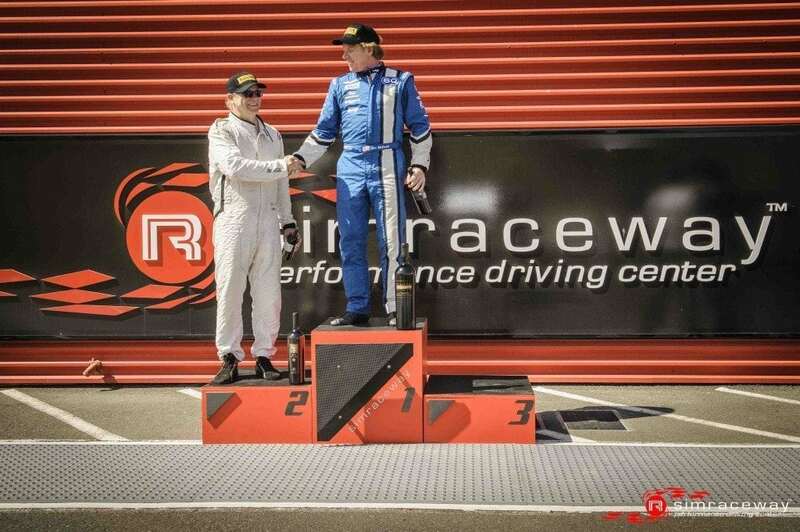 Job done, but Mr Campbell didn’t quit, initially losing some time Steve re-lit his flame and went back after Roy in an epic tussle of bobbing and weaving but Roy would not be swayed and kept his composure to the flag. 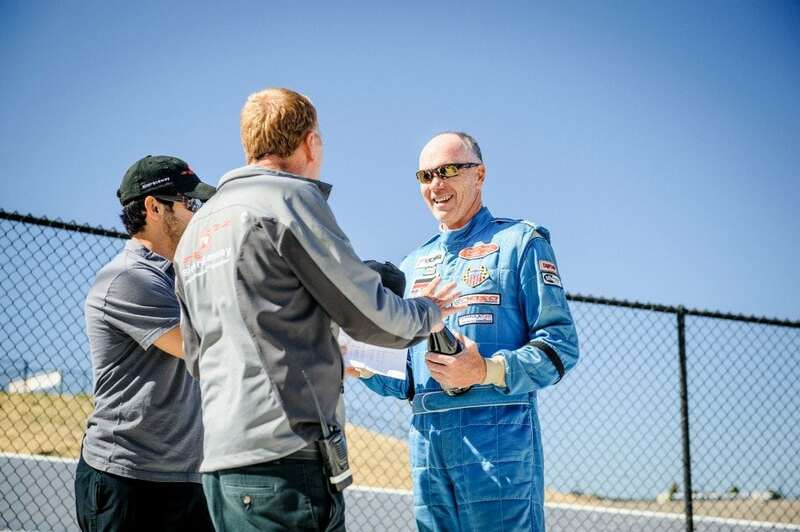 Kevin showed some great smooth fast driving to end the day over 7 seconds ahead of nearest rival Ryan Garcia, next came Chase Murray in 3rd, Tim “the big move “ Adolphson in 4th, Roy Block 5th, Steve Campbell 6th, Robin Macgregor 7th and our lone female driver Jackie Heinricher learning some great lessons in 8th place. 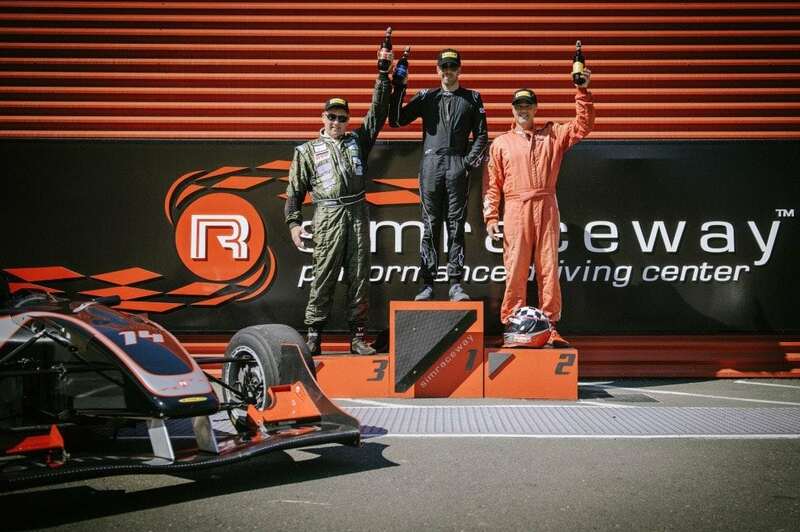 Podium ceremonies followed as the exhausted racers rehydrated and celebrated a great day of racing. 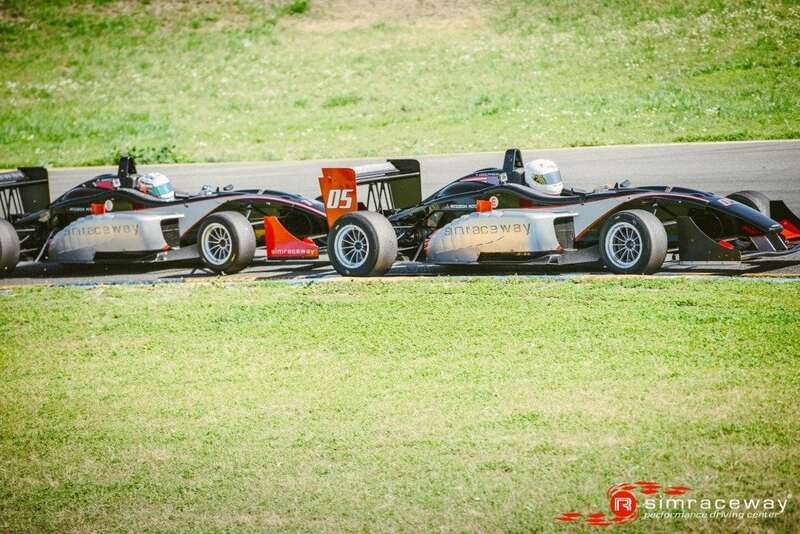 Sunday and it was time for drivers to refocus and bring lessons learned from race 1 and look for a fresh and better Race 2 result. 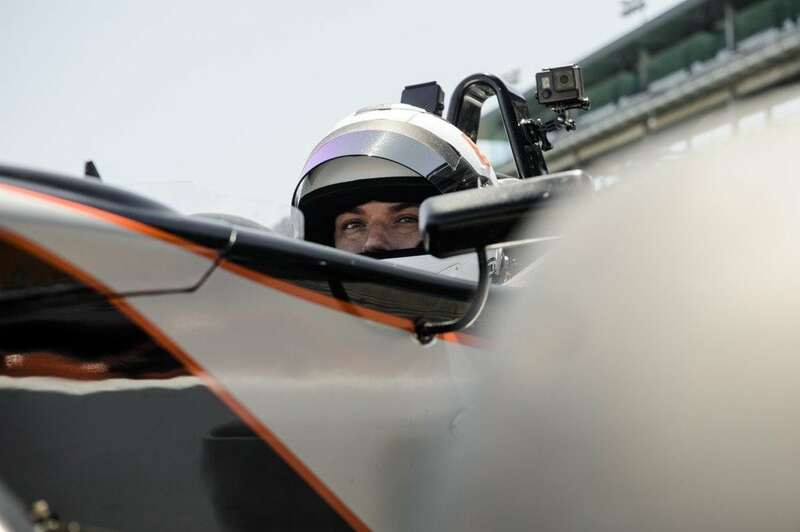 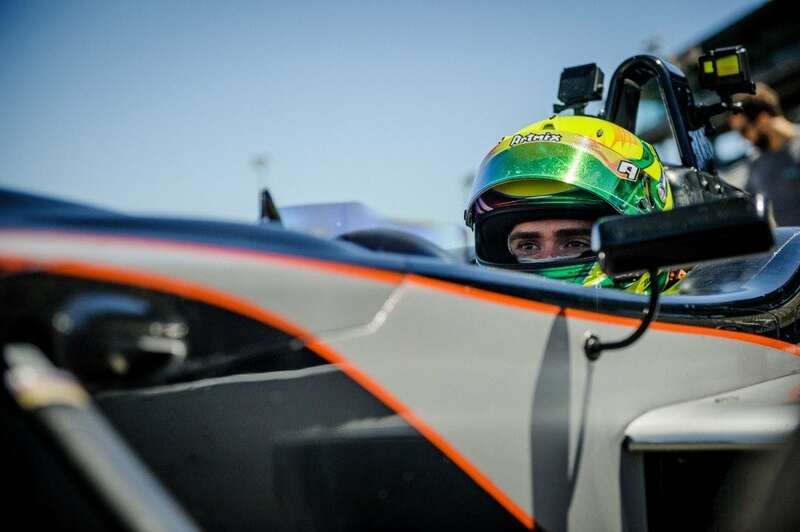 Lining up on pole this time was Ryan Garcia, with the” Texas flash” Chase Murray alongside, feeling challenged by the pace of his fellow front row starter Chase was on a mission to not let him get away today. 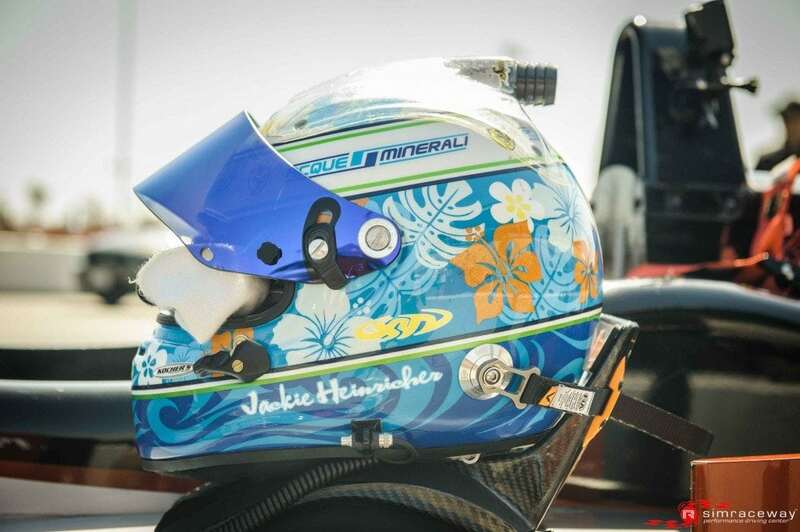 An impressive qualifying and massive gain in speed also saw female racer Jackie Heinricher lined up in 6th! 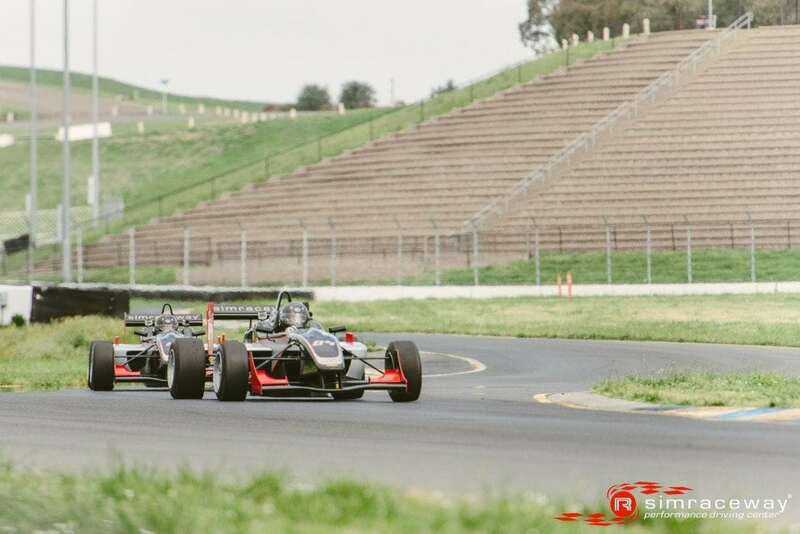 The race was on and as hard fought as the Block/Campbell battle was in race 1, this time it was the front of the field to entertain the crowd. 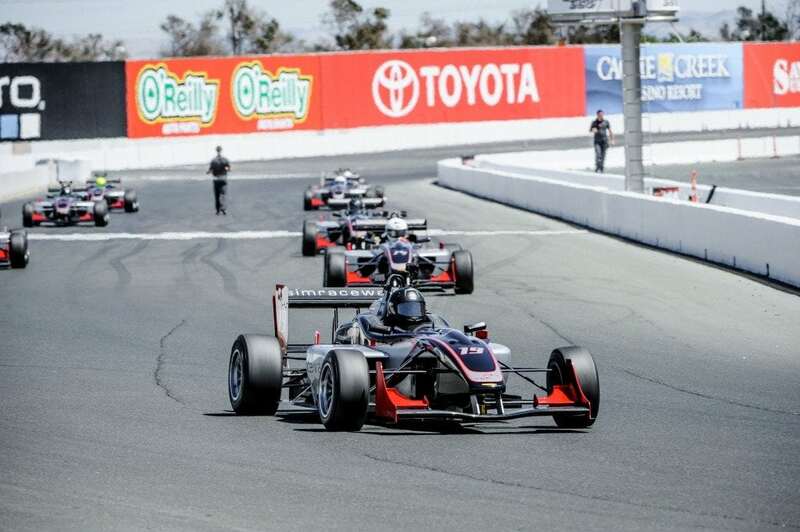 Ryan Garcia led from the get go but Chase was bound and determined not to let him get away, cleaning up his act he stayed on Ryan’s tail like a mongoose on a snake throughout the race, Ryan seemed unflappable however and while struggling a little under braking still didn’t show any sign of giving up that no.1 slot. 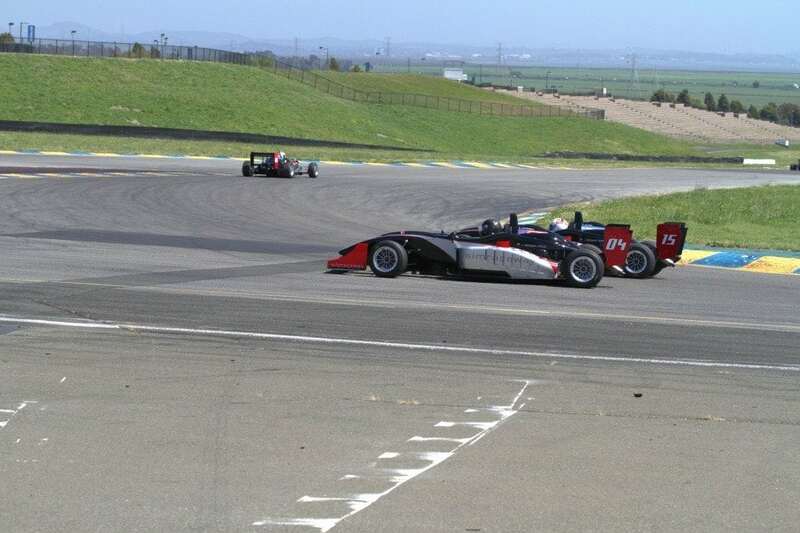 Further down the field Jackie kept the improved Robin Macgregor at bay for a few laps but a slight miscue on the exit of 3a put her off the track and Robin was by and away. 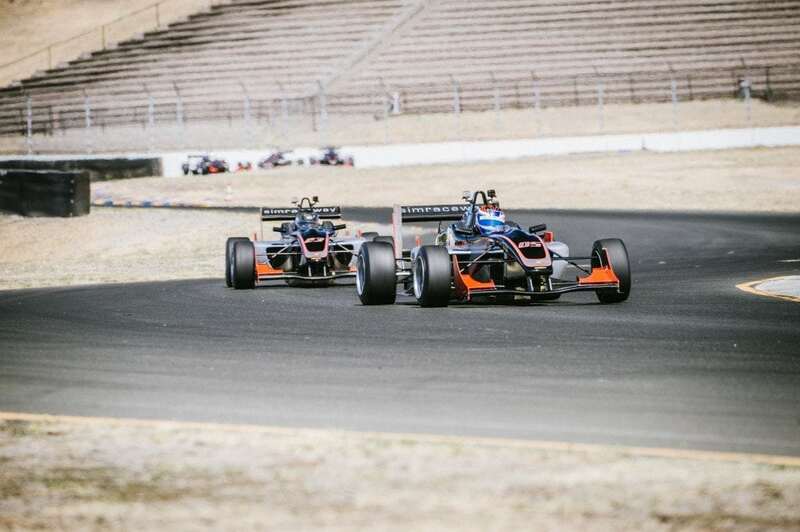 Both Robin and Jackie made great gains in speed for race 2 and with a little more seat time could be biting at the heels of the front 5. 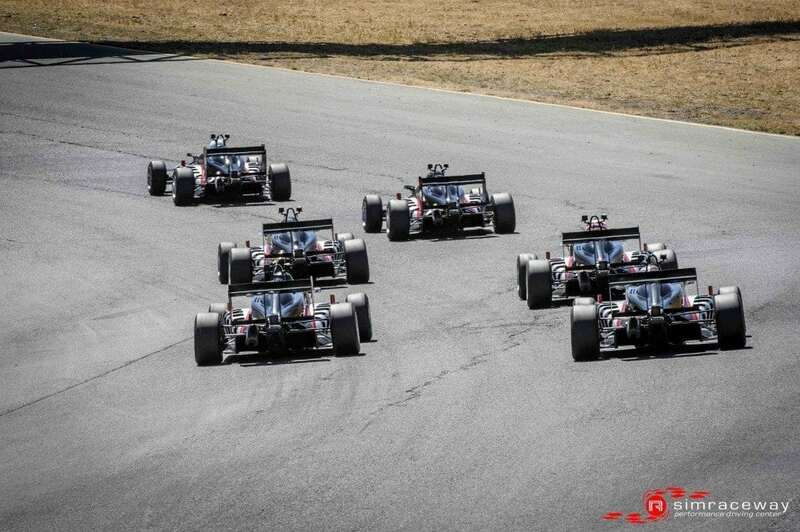 Back to the front and the fans were on the edge of their seats waiting to see if fireworks would ignite, and ignite they did! 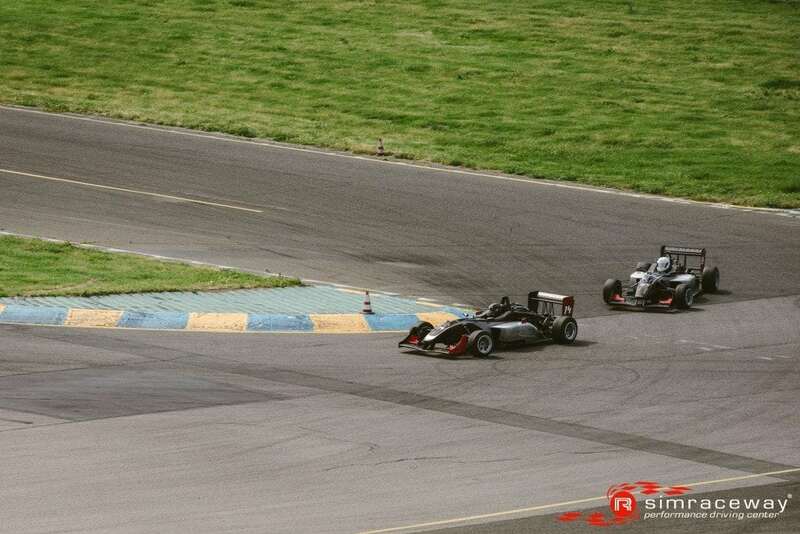 As the white flag fell Chase was as close as ever to the back of the #18 putting the pressure on as the headed out of turn 6. 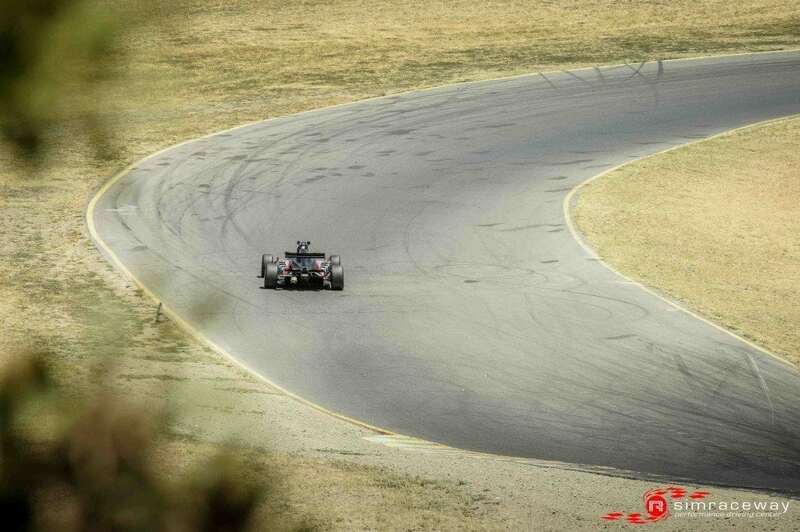 Knowing a move was in the offing Ryan drove to the inside to cover any of Chase’s ideas but this backfired as Ryan got caught out by the marbles and overdrove the entry allowing Chase to dive to the inside and gain the upper hand on the exit. 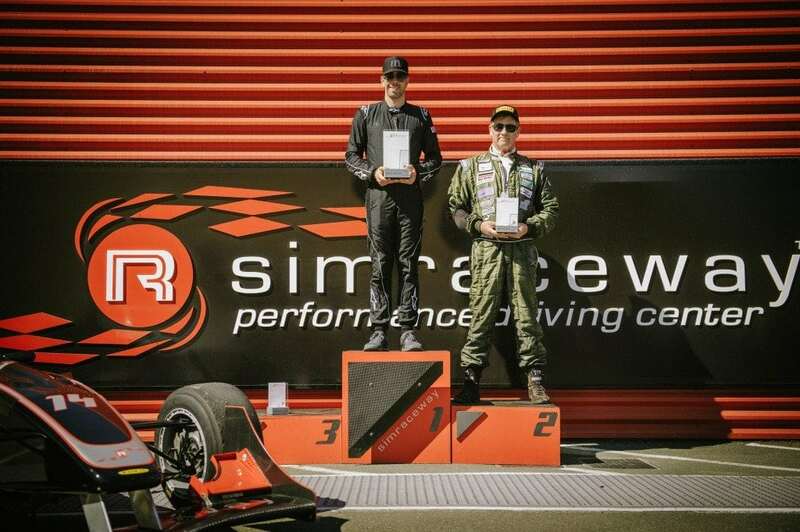 Chase held on to the flag to win by just 1 second as Ryan couldn’t regain the time lost in the last few corners to mount a counter challenge. 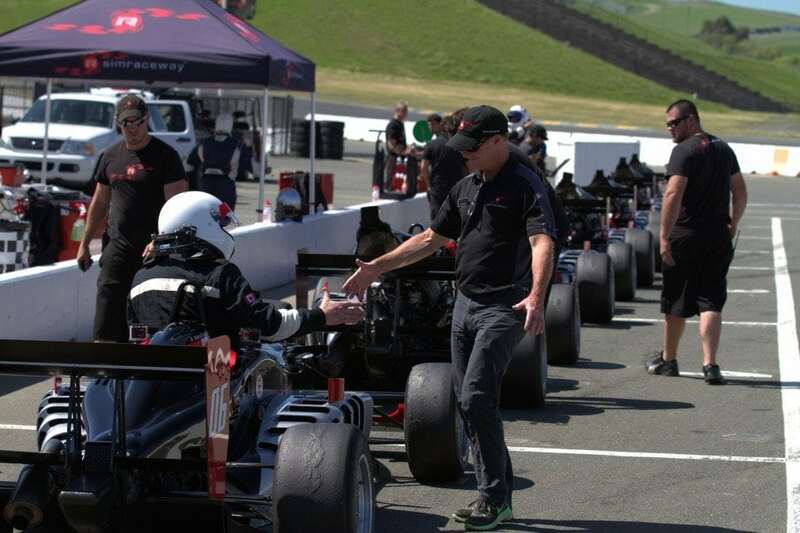 Handshakes were abound as some great sportsmanship from the drivers summed up a fantastic weekend for the 2014 series. 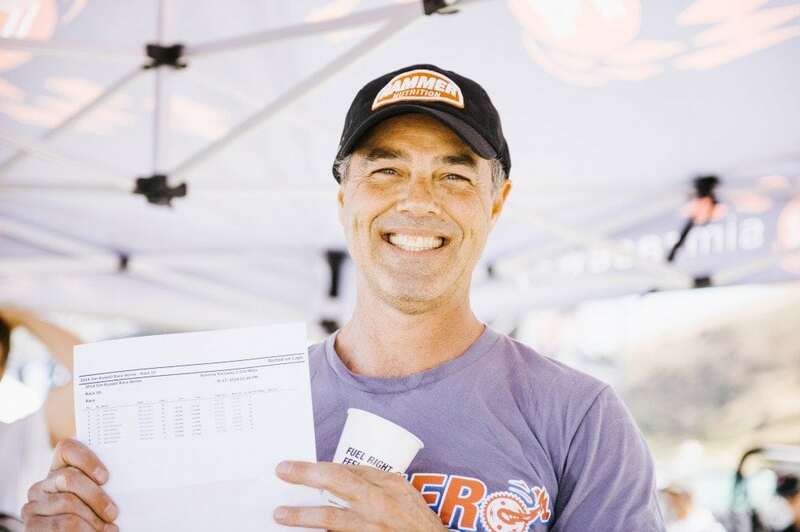 Finishing 3rd was Tim Adolphson, 4th Roy Block, 5th Steve Campbell, 6th Robin MacGergor and 7th went to the recovering Jackie Heinricher. 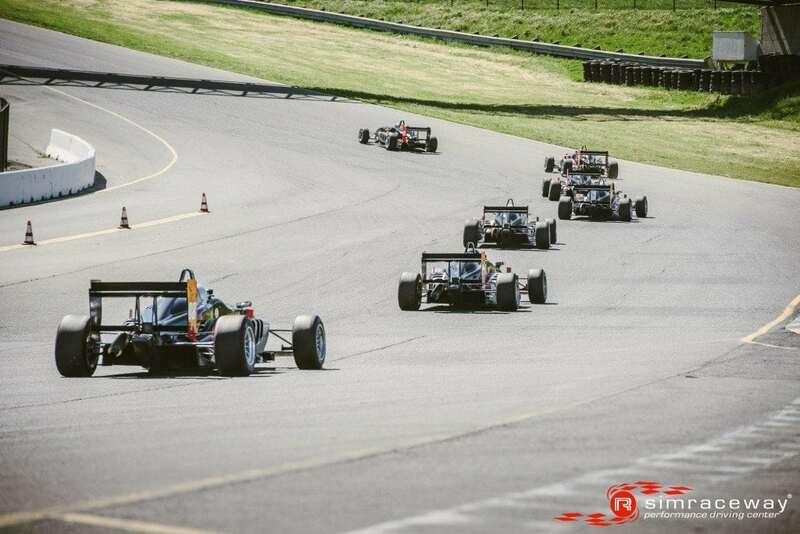 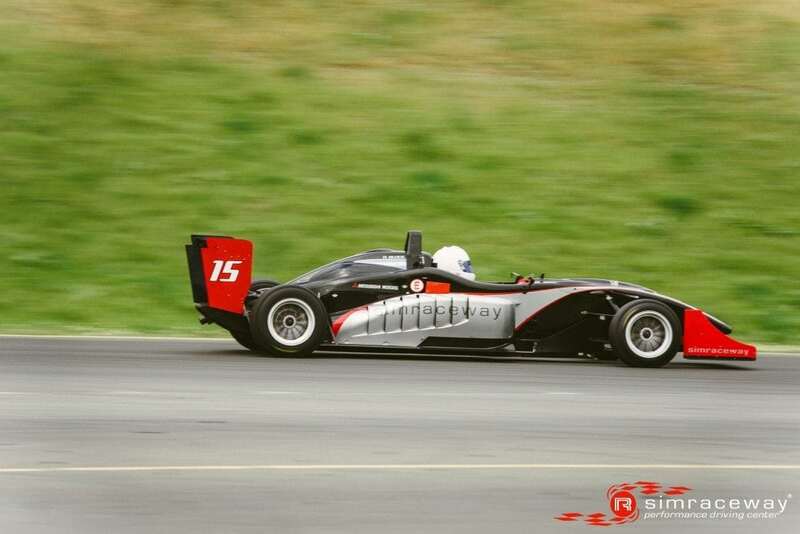 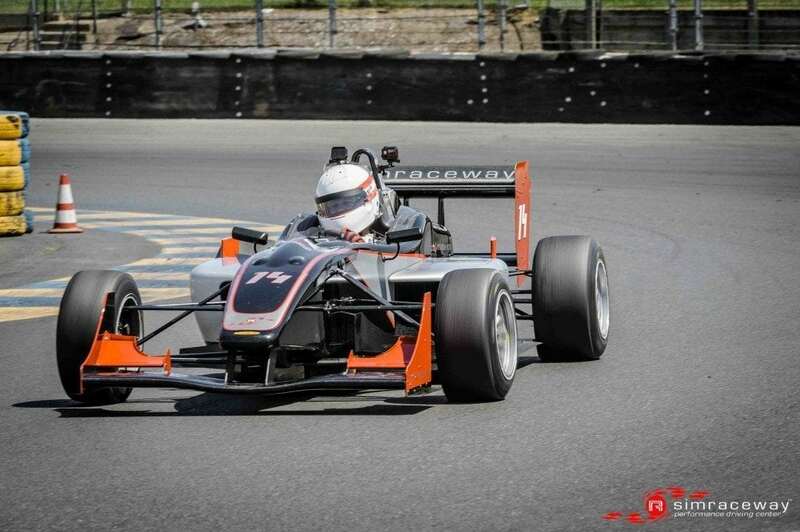 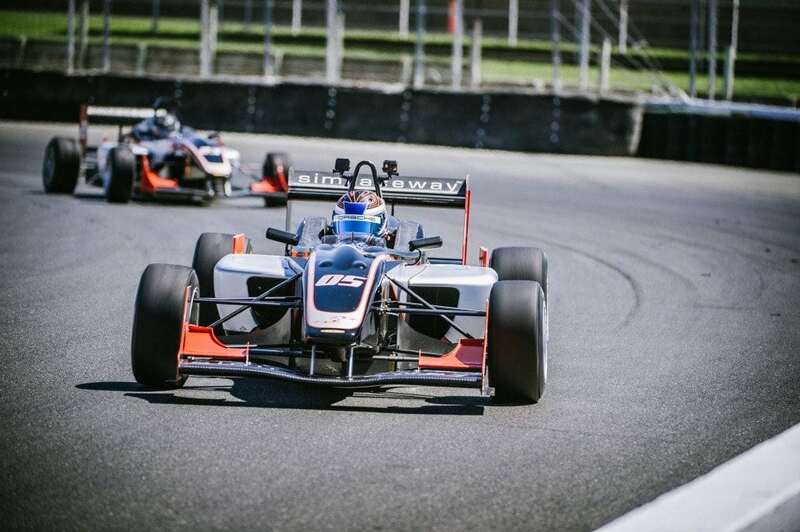 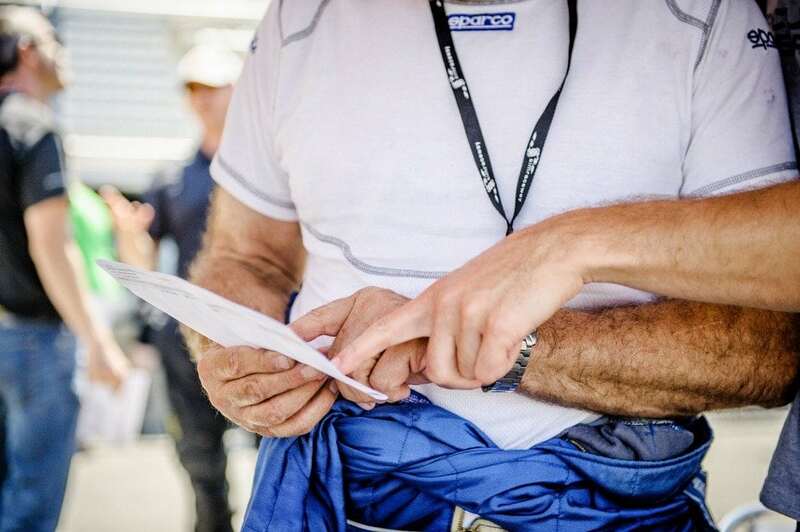 A busy schedule for Race 3 in the Jim Russell Racing Series led to a later than usual start for the competitors, the late afternoon wind was brisk so the drivers would need to be aware of the aerodynamic implications to their SRW F3 cars especially in the notorious esses. 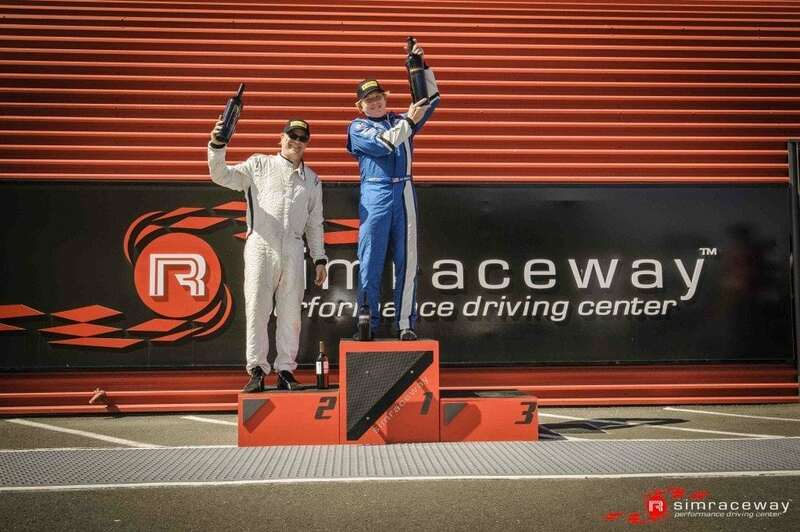 Starting from pole was Race 2 winner Chase Murray alongside Kevin Woods, the winner of the inaugural race to the 2014 season. 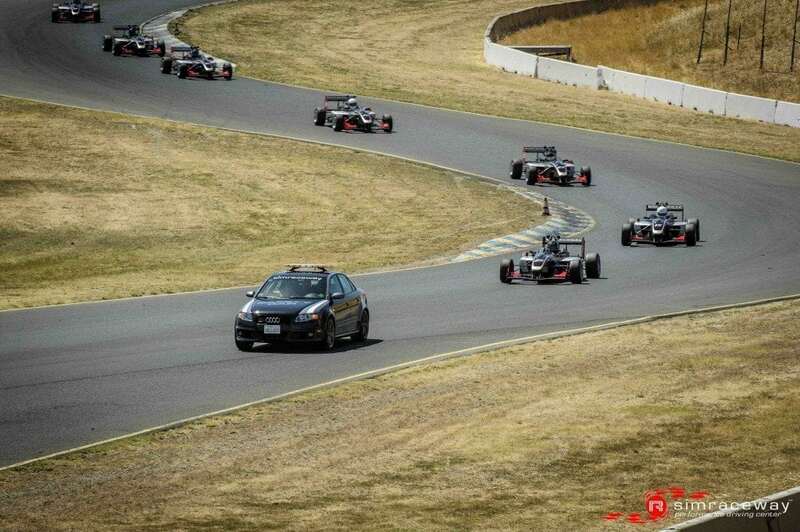 The more experienced Woods got the jump on the start and led the field through turn 2 as the pack ran nose to tail. 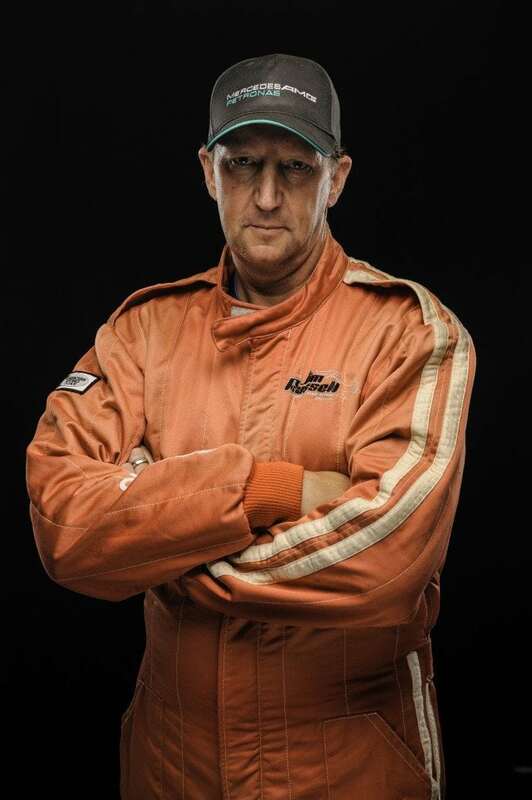 The first couple of laps Woods built up nice 8 car a gap but the tenacious Texan Murray got the wind beneath his wings quickly and started to claw that time back. 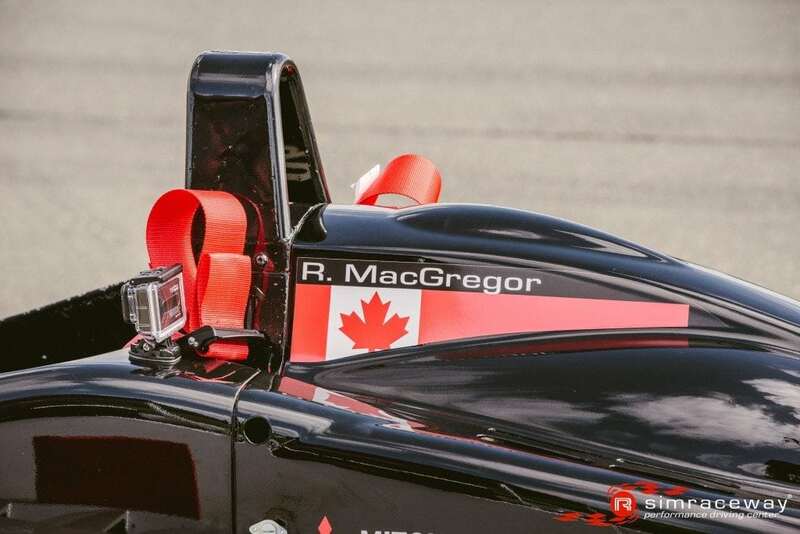 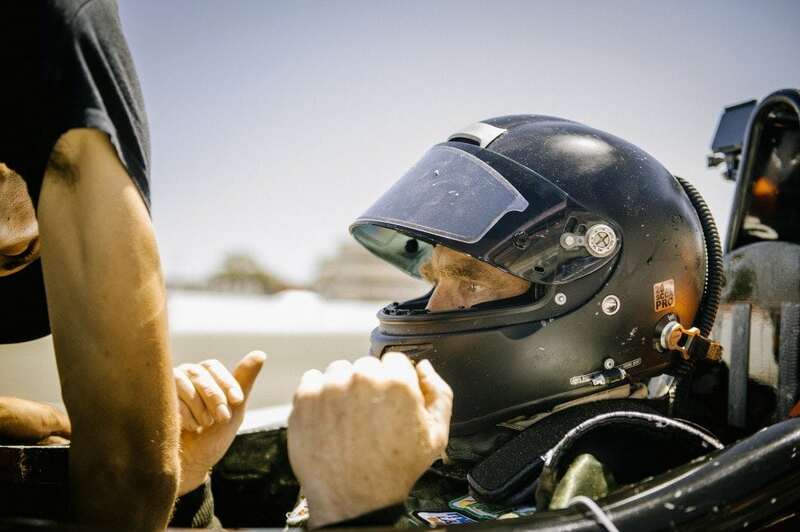 There were dogfights forming all the way through the pack as 3rd place Tim Adolphson had his mirrors filled with series newcomer Doug Tuttle, also the fight for 6th was intense between Robin “Rocky” Macgregor & Alex Coigny , Robin had to use all his focus to keep the Swiss driver at bay. 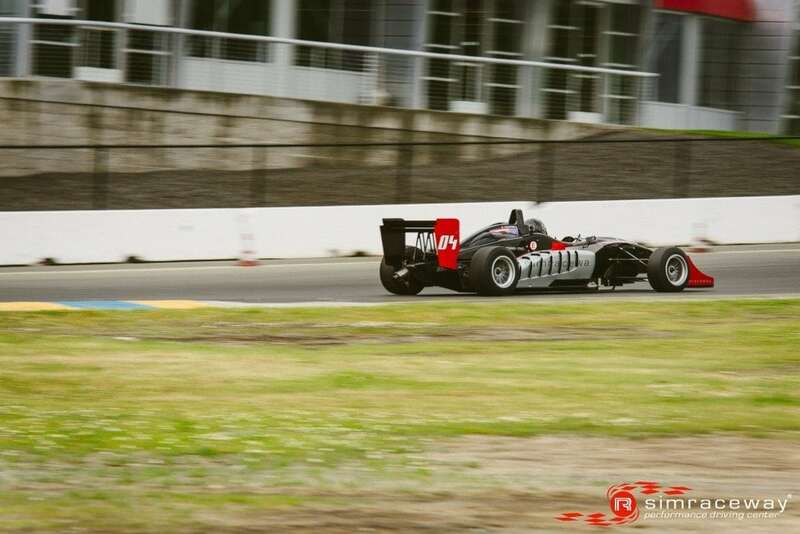 The only driver to probably be able to breath at this point was Paul Whiting who was keeping the 3rd place battle honest, doing a great job of driving clean consistent laps in his series debut. 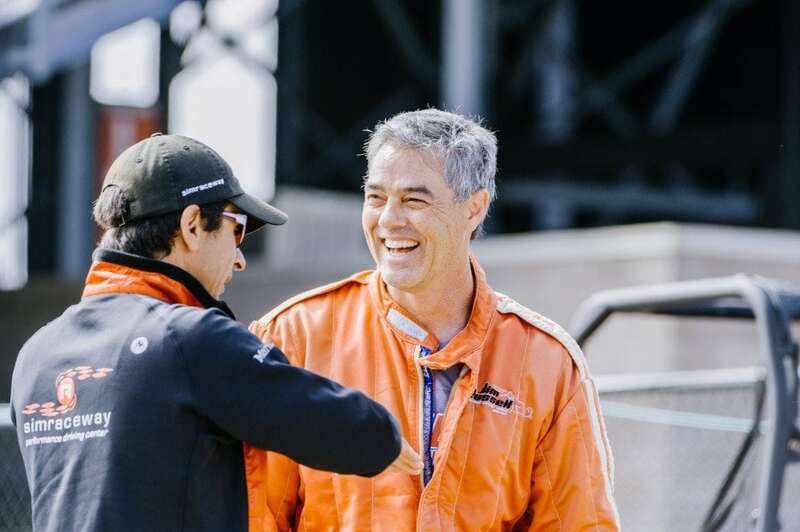 As the race wore on a couple of mistakes by Tuttle and Macgregor allowed those battles to ease, but it was all eyes on the lead as Chase was firmly locked on the tail of leader Kevin Woods. 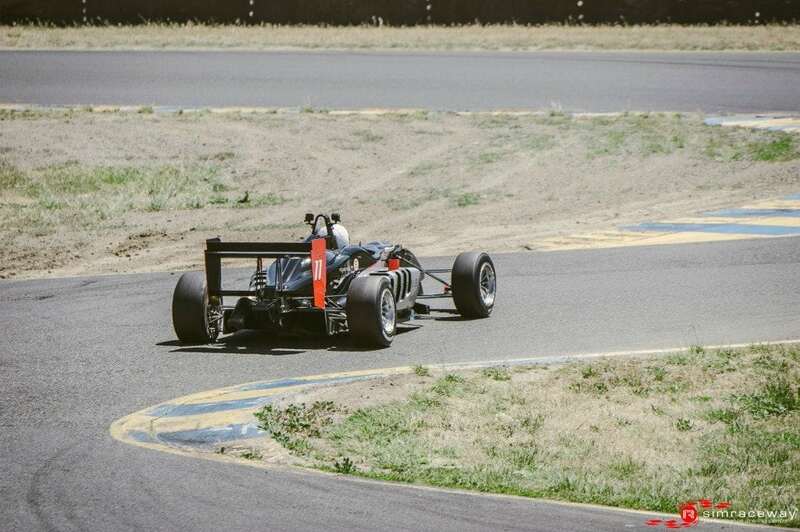 Lap after lap Chase would get the run down to turn 7 lined up for a pass attempt, but the Wiley Woods seemed to have an answer to every move from inside to outside Kevin’s mental strength with the intense pressure was impressive. 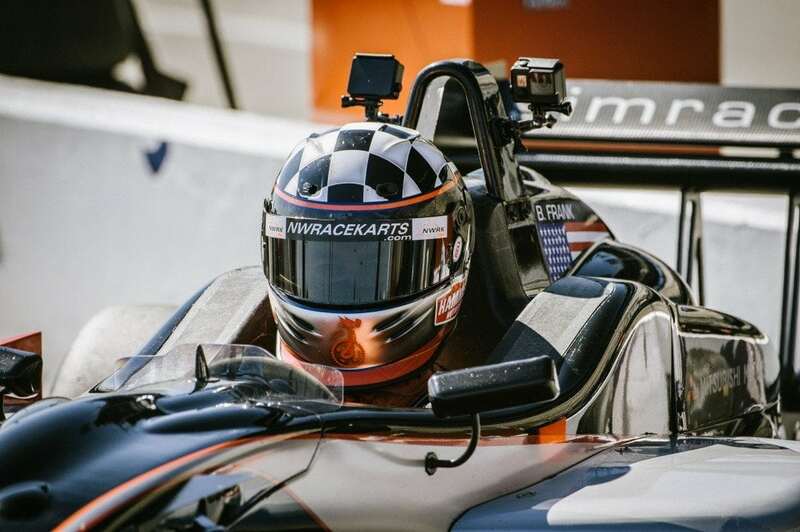 One strong move by Murray after a great run out of 7 led to light wheel to wheel contact in the turn 9 braking zone but both drivers did a great job of playing nice and getting out cleanly and on with the race. 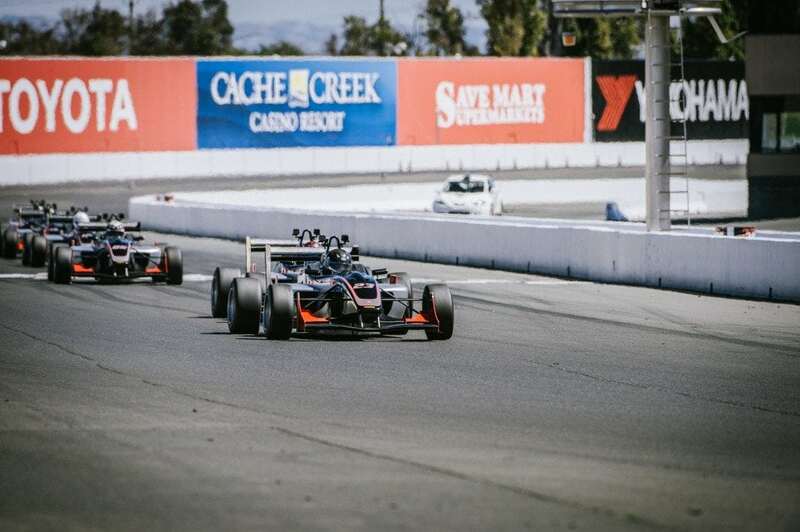 The excited commentator in turn 11 could barely speak quick enough as it all came down to a sensational ending as Chase made a move inside , both drivers on the edge of adhesion as they ran wide & side by side on the last lap. 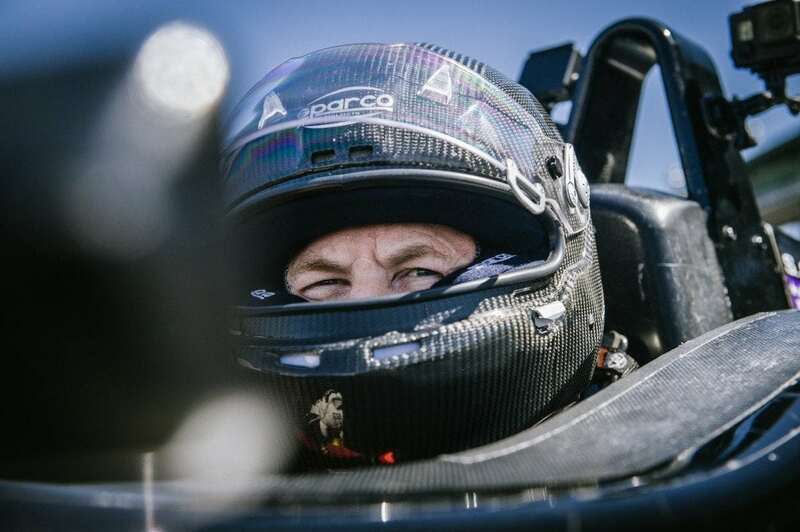 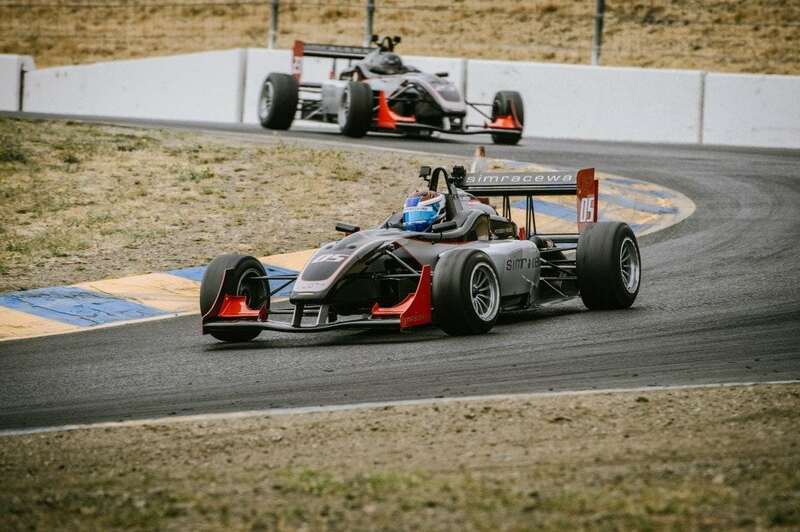 Kevin Woods was able to get the power down just that much better to win by a nose (0.059 sec to be exact) as they crossed the Sonoma Raceway finish line. 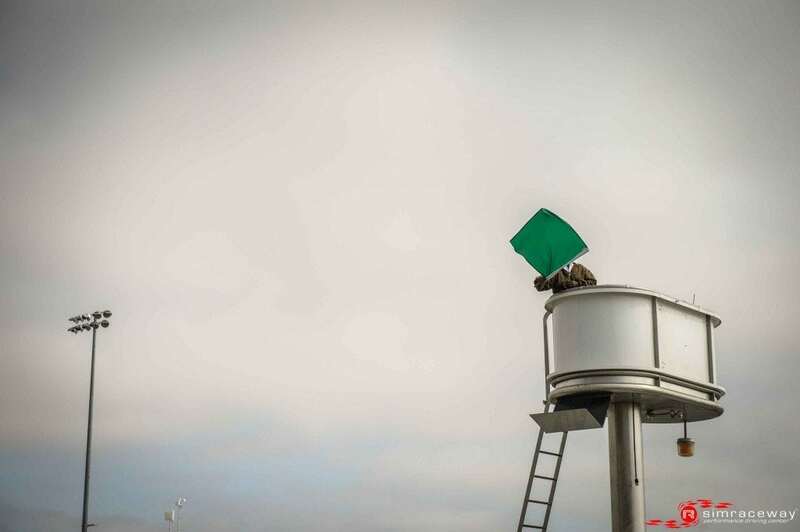 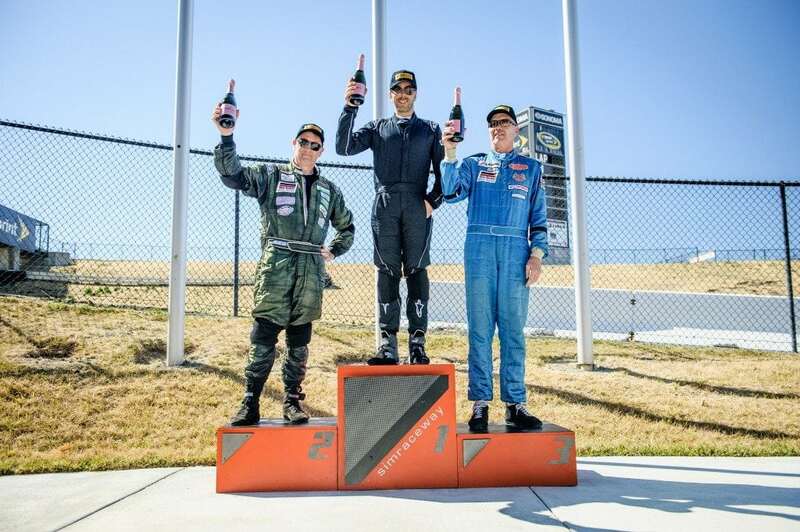 A fantastic race was celebrated in true Month of May tradition with a podium not for lactose intolerant, as some ice cold pints of Sonoma’s finest was held aloft to the cheers of the crowd. 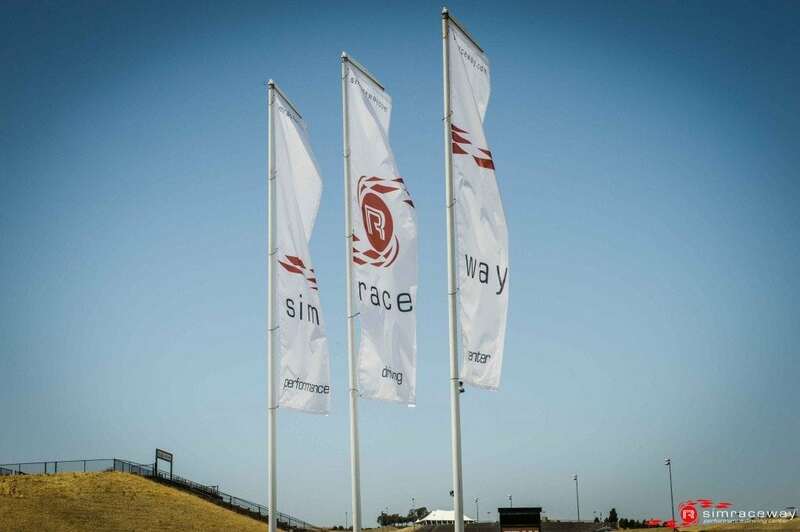 Hats were all off to the Simraceway Technical team as well, as the cars ran perfectly to allow the racers to enjoy a great day of racing. 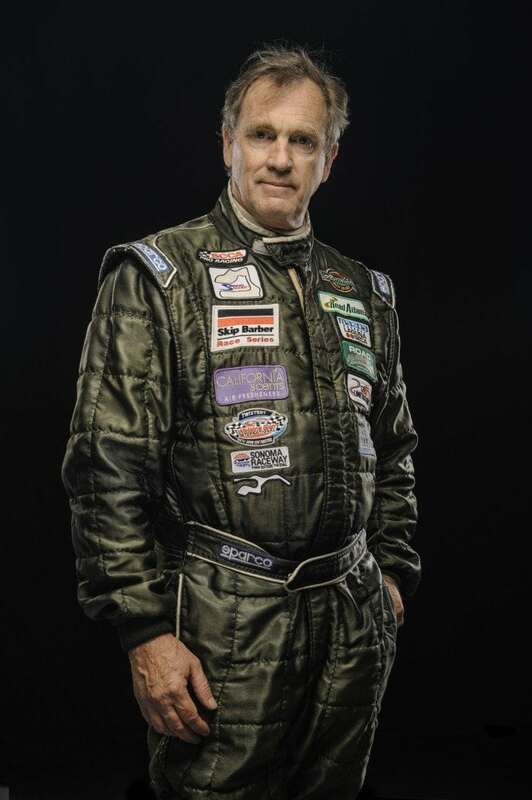 There are no photos with those IDs or post 28466 does not have any attached images! 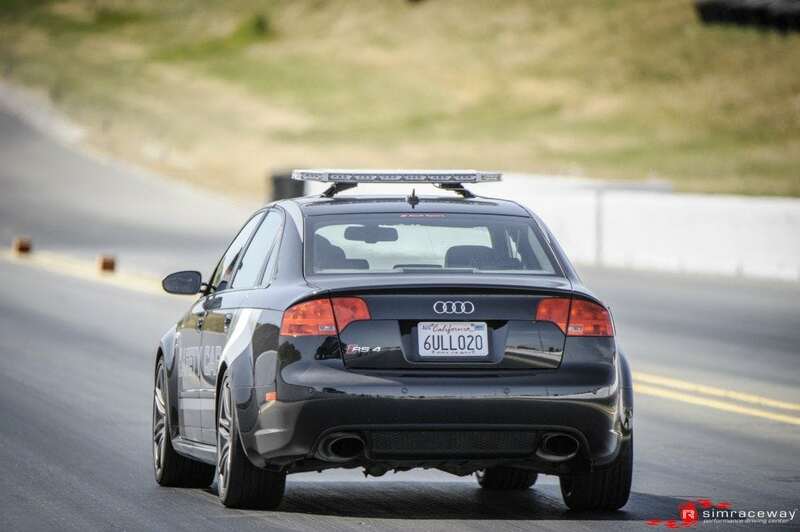 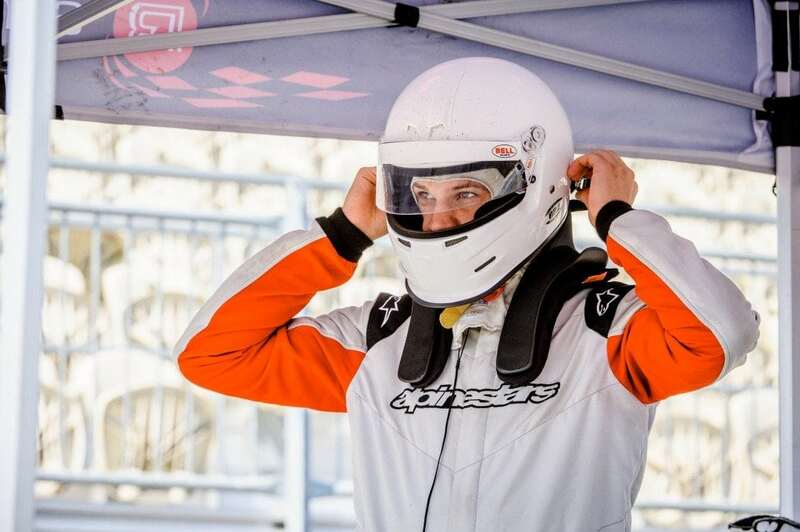 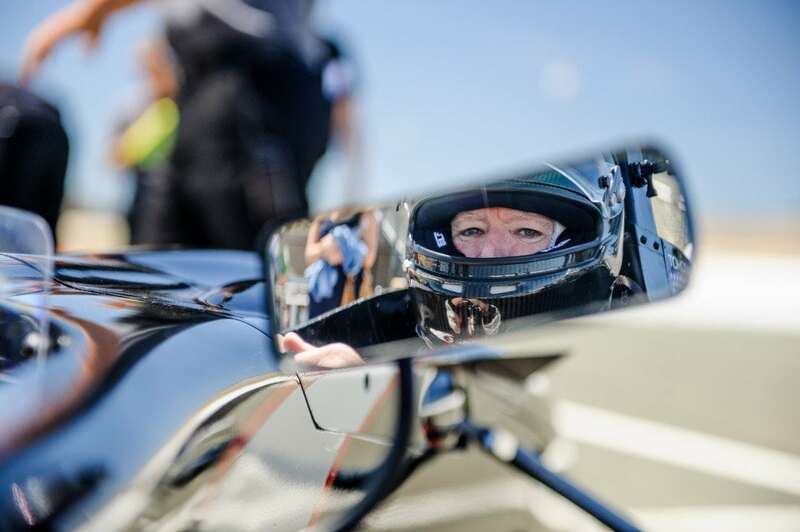 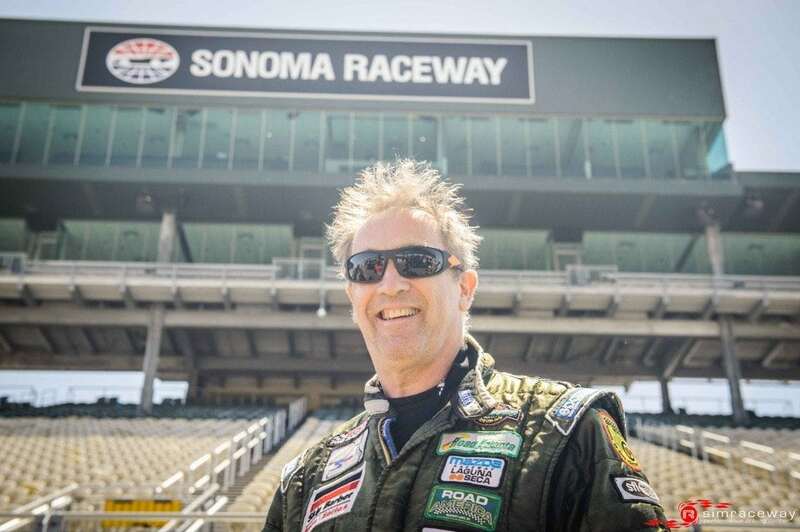 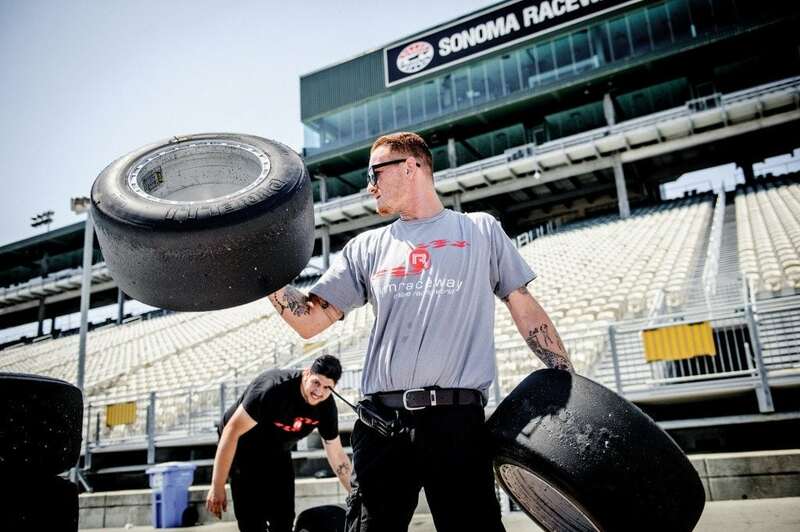 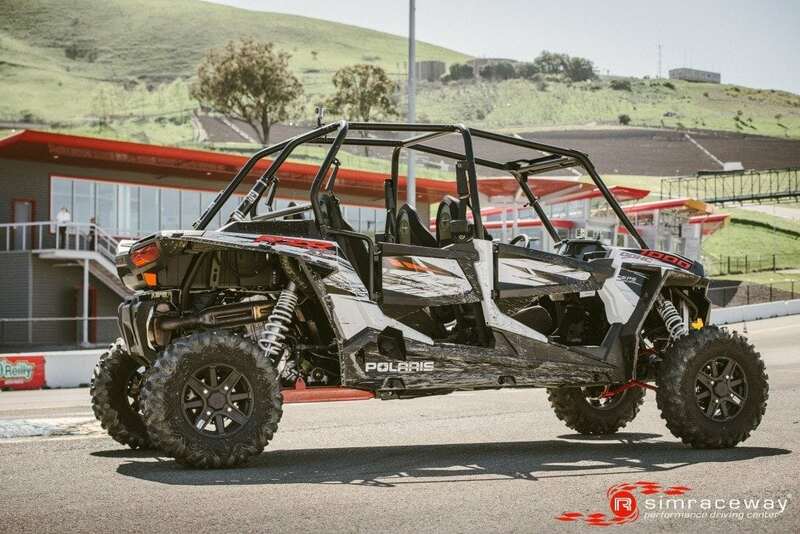 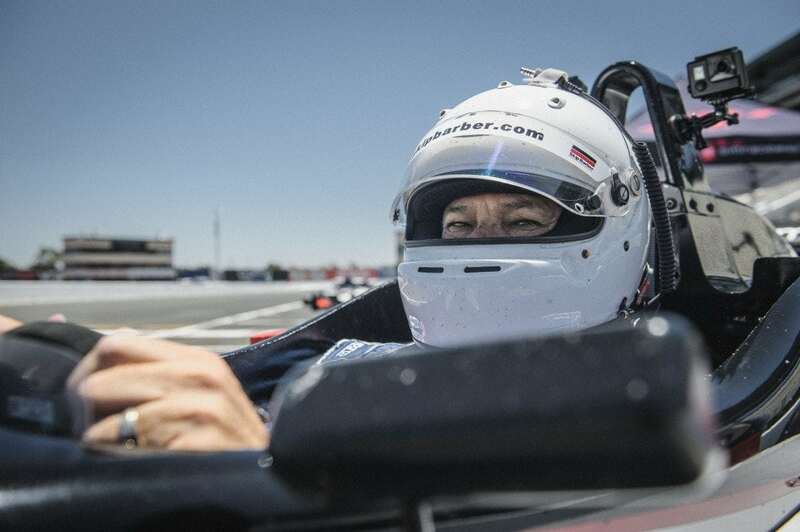 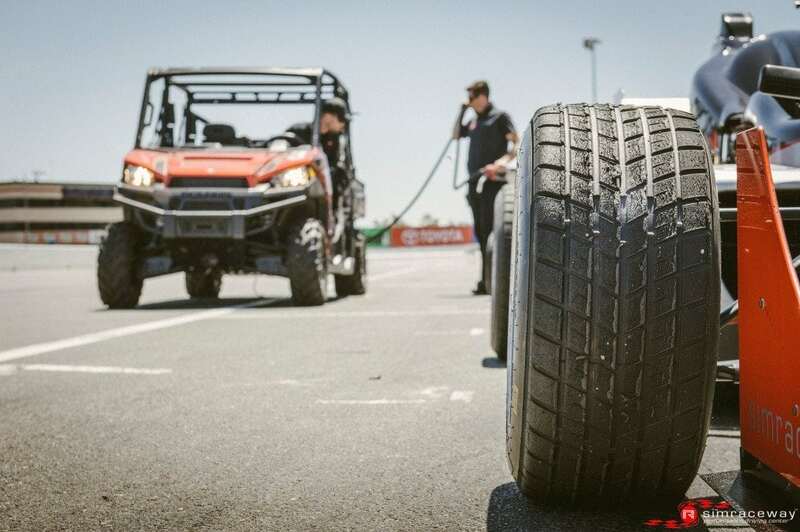 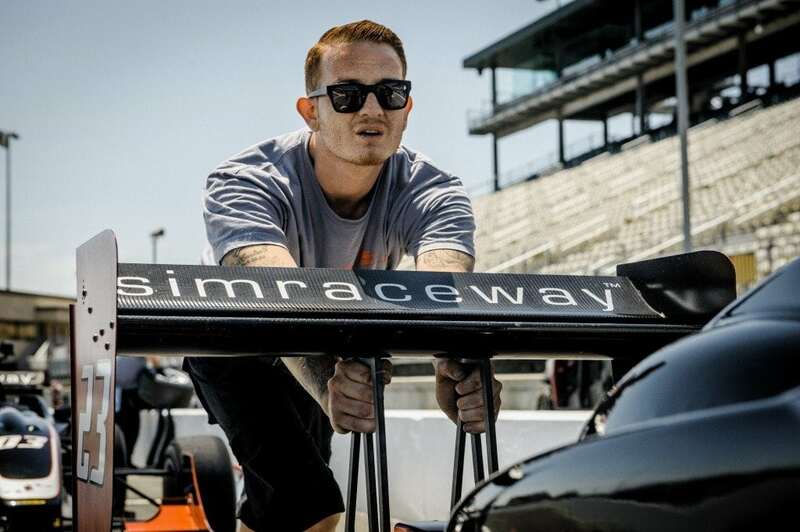 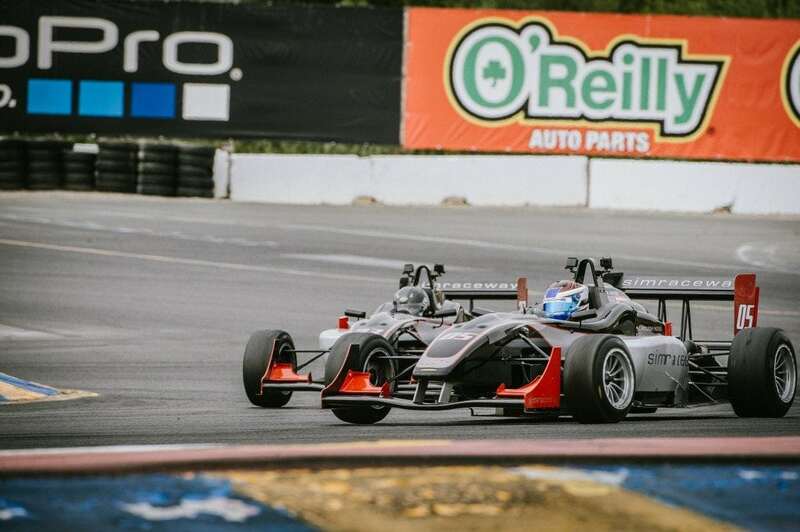 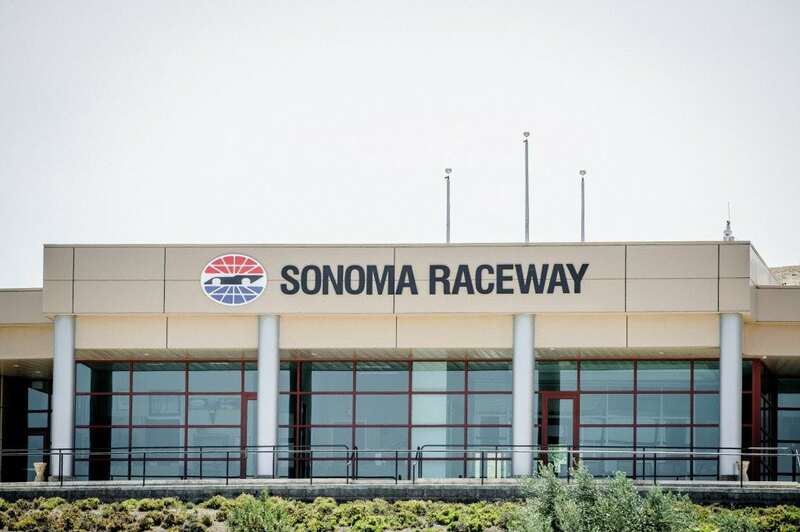 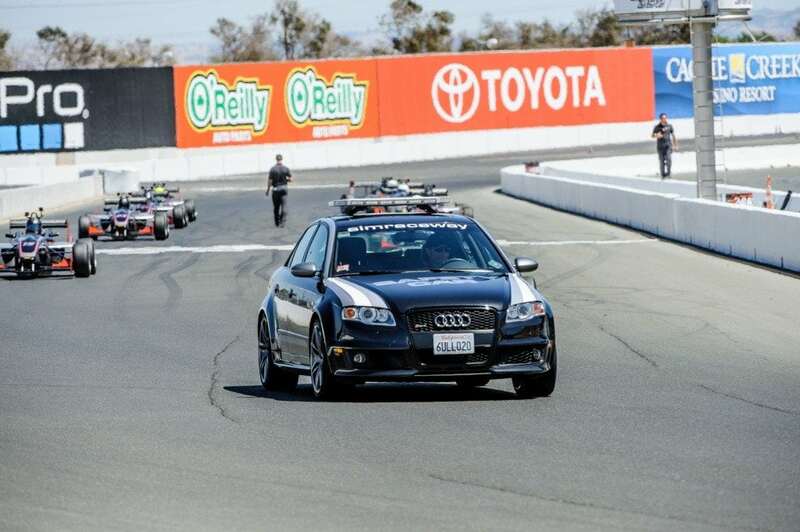 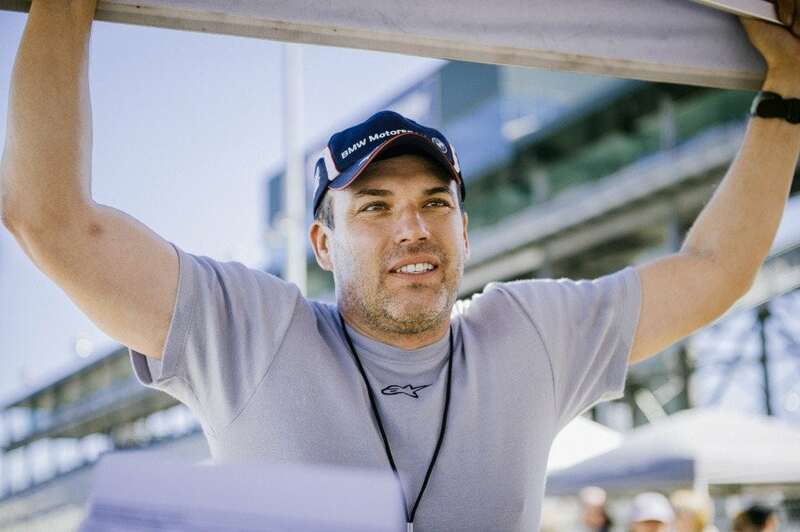 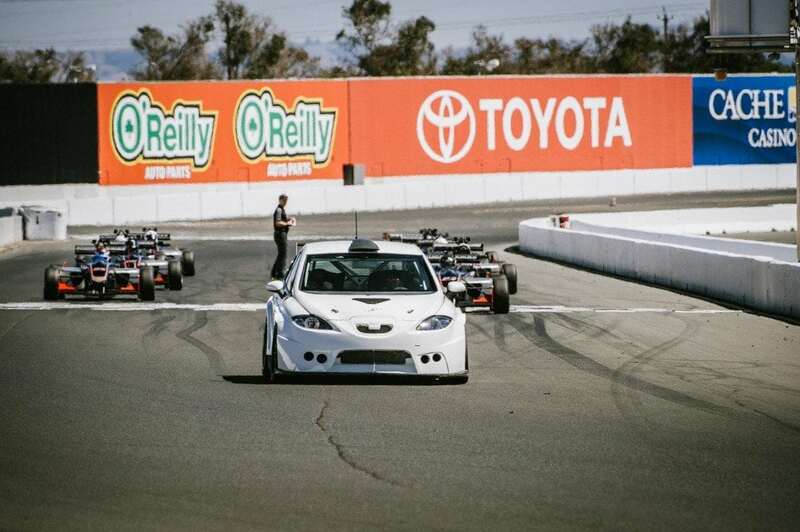 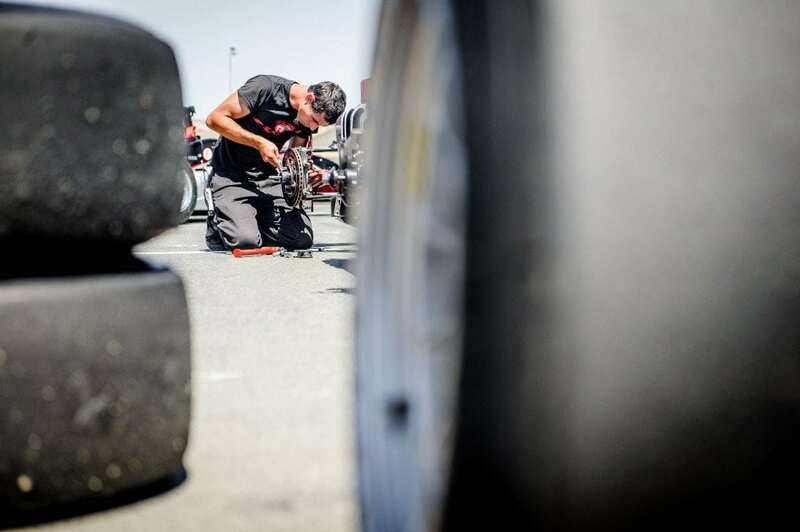 As Mother’s day fell upon Sonoma Raceway the Jim Russell Series not only had sweet thoughts of their Mums but also the sweet smell of success on their minds. 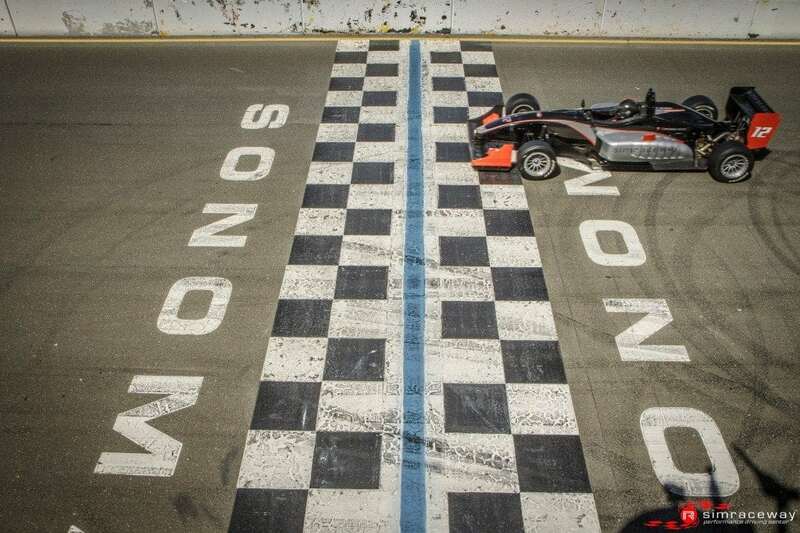 It was time for race 4 and pole sitter Chase Murray was out to stamp his mark on the Championship. 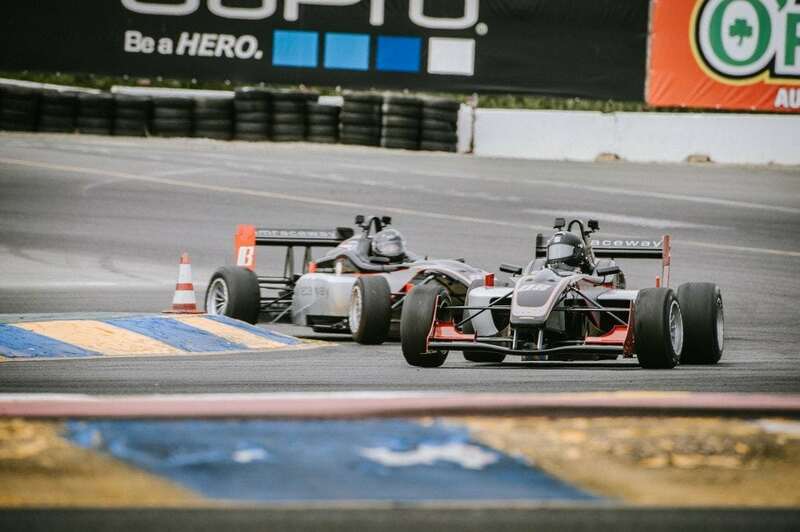 As the green flag dropped he didn’t look back and with a successive run of fastest laps to gave himself a safe margin from the eager pack behind. 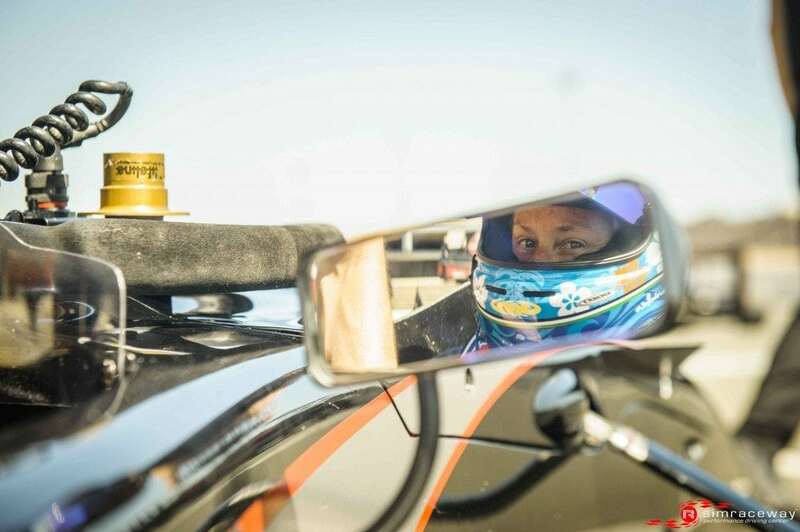 Doug Tuttle our other front row starter lost that 2nd spot to the ever quick off the mark Tim Adolphson at the start but Tuttle was not to be denied as he stuck to the tail of Tim till it was time to strike. 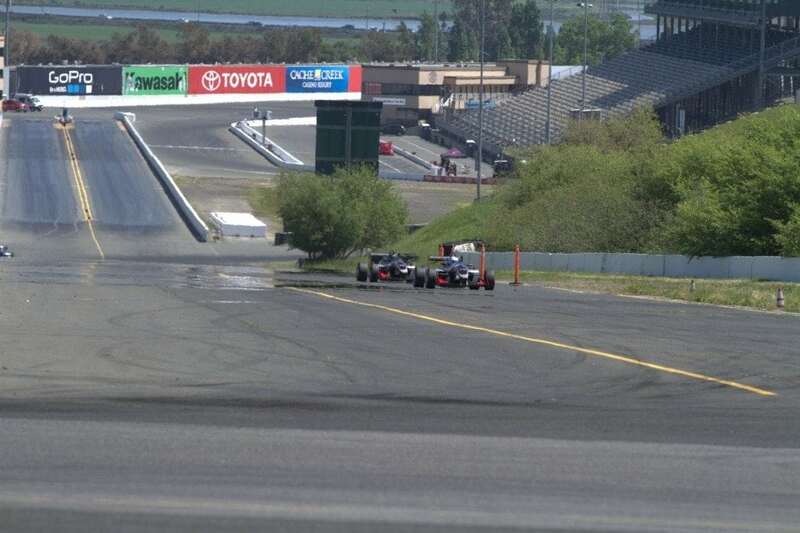 With a fantastic move to the inside at turn 7, a clean exit gave Adolphson no chance to attack back, Tuttle inching away lap after lap to the 3rd place runner. 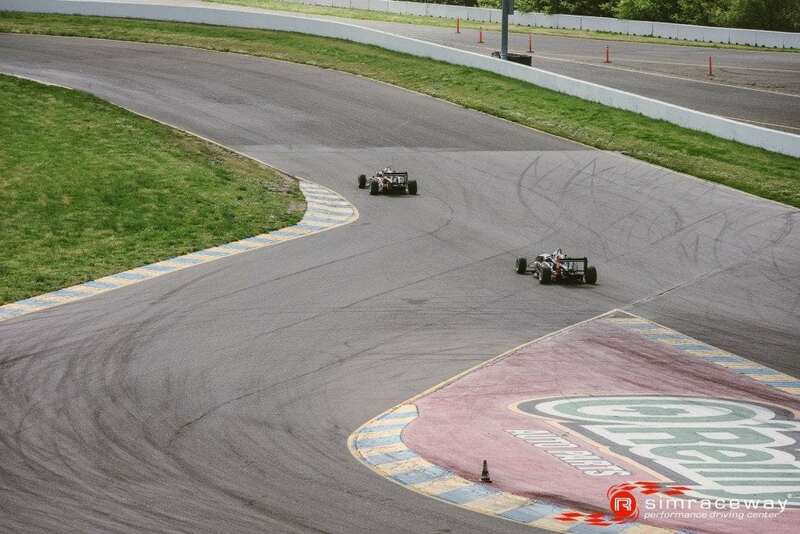 A spin at the top of turn #2 really hurt Tim’s chance of another podium as the ever improving Swiss driver Alex Coigny seized his chance and found a safe gap to go by and try to put some daylight between them. 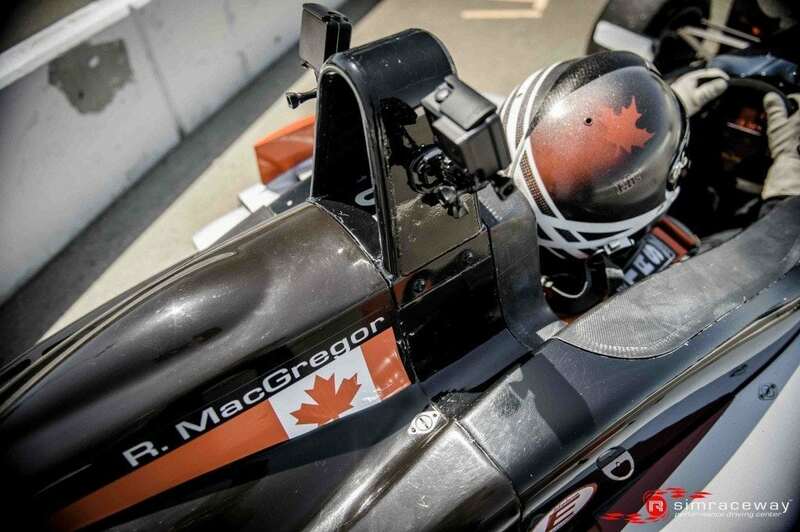 A slight technical problem saw Robin MacGregor starting from pitlane, but as the race wore on his speed increased and the carrot of Adolphsons rear wing spurred him on to his best lap and finish ever in the series. 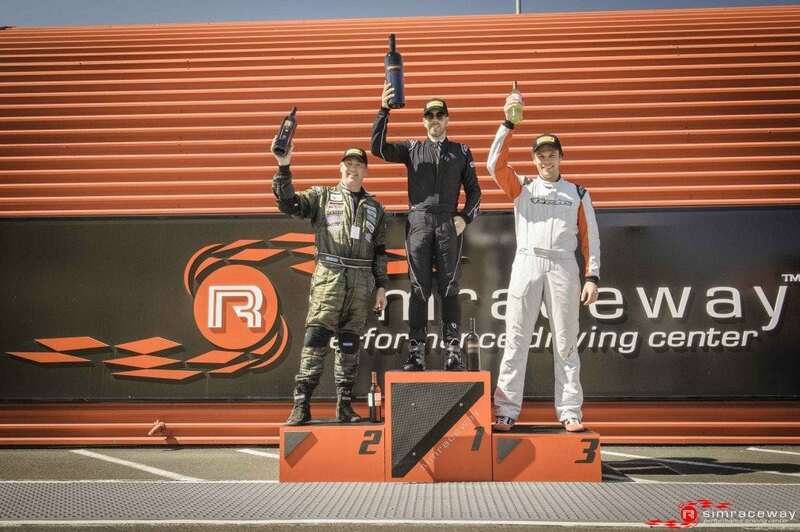 As Chase kept making the gap ever wider but a late race spin in turn 9 by Alex really spiced things up allowing Adolphson to close right back up into contention before the flag, but it just wasn’t quite enough as Coigny focused hard on the road ahead and put in his best time of the weekend on the last furious lap and seal the last podium spot. 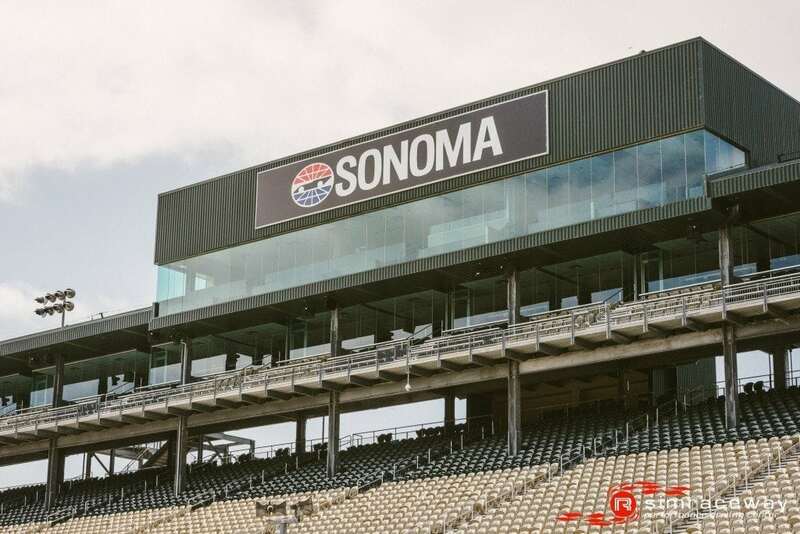 So Chase Murray checked off win number 2 with the treble of pole, fastest Lap and of course the race win to take the lead in the championship. 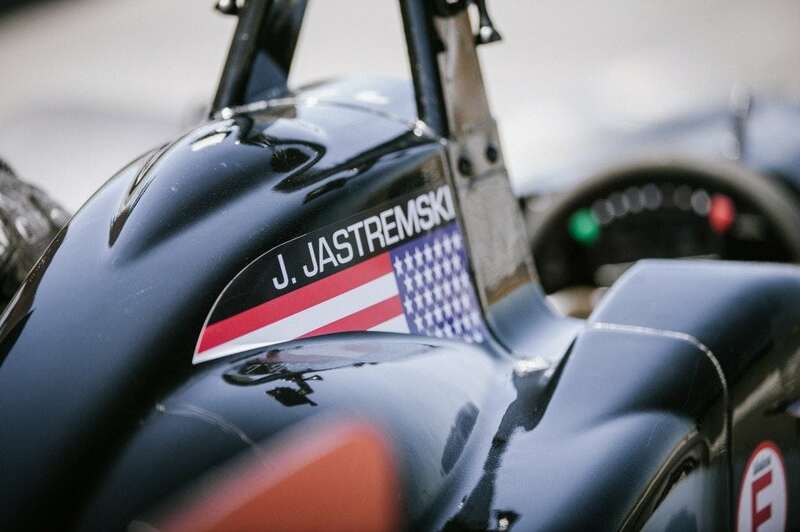 Job done by the Texan but there’s many races left in the season and wins like this may not be as easy to come by as the talent level seems to keep on rising. 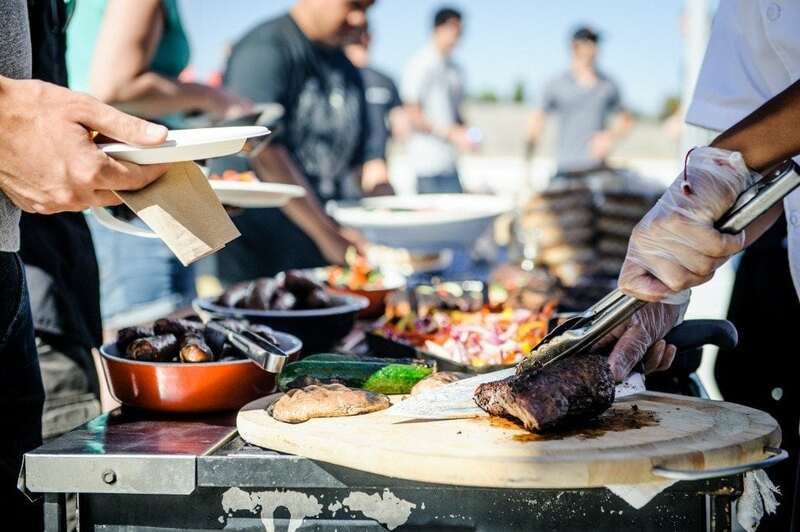 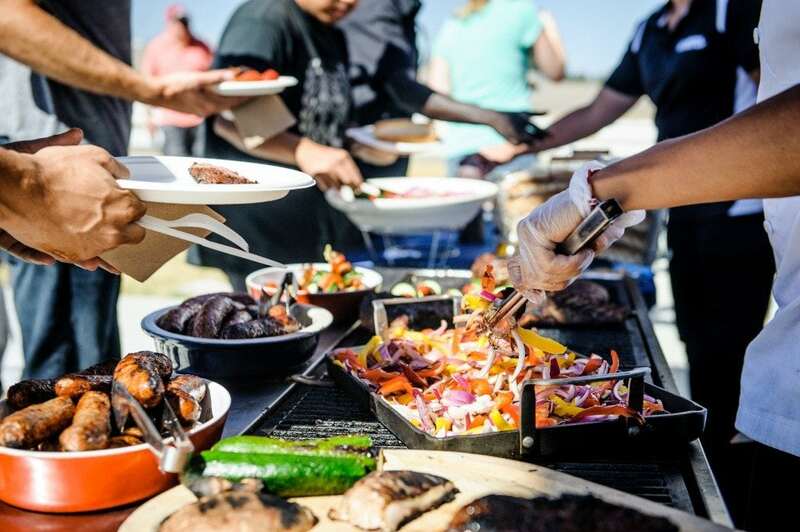 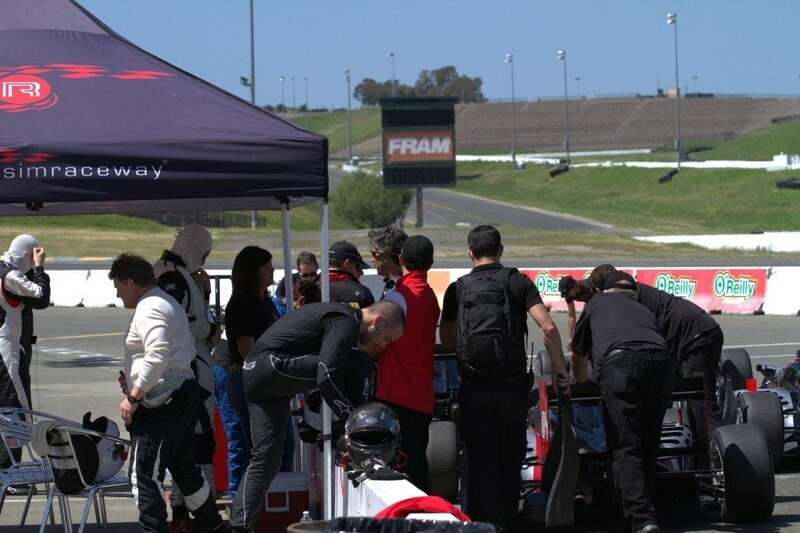 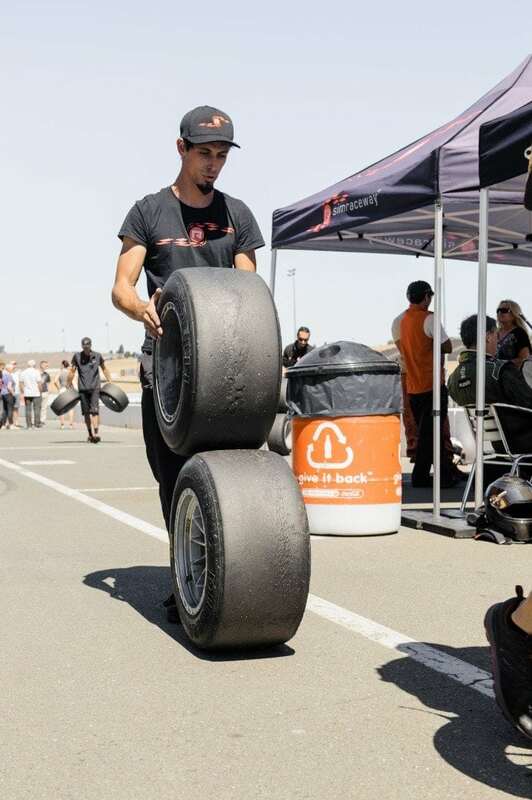 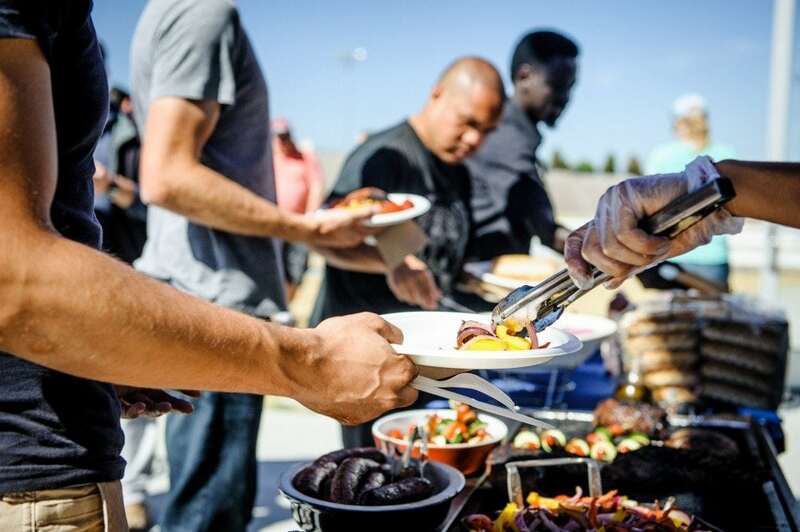 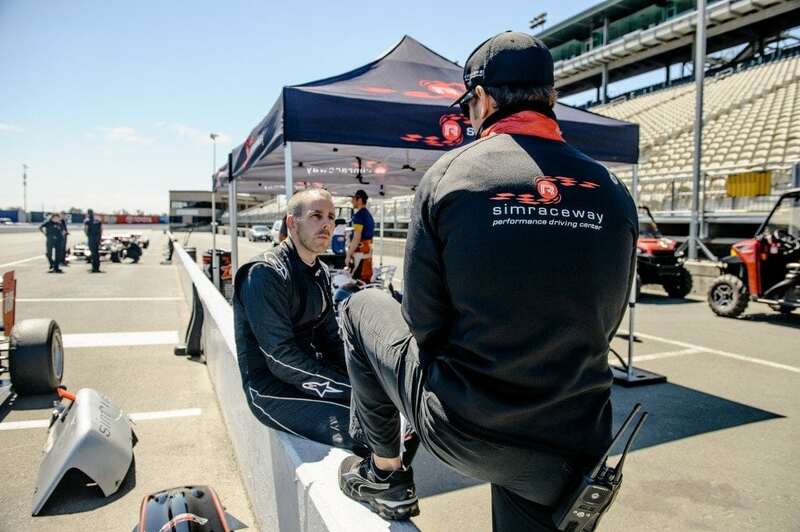 As the hot sun of Sonoma in June baked the track, the Hammer Nutrition station was kept busy as each driver knew it was going to be a long hot race 5 of the Simraceway F3 series. 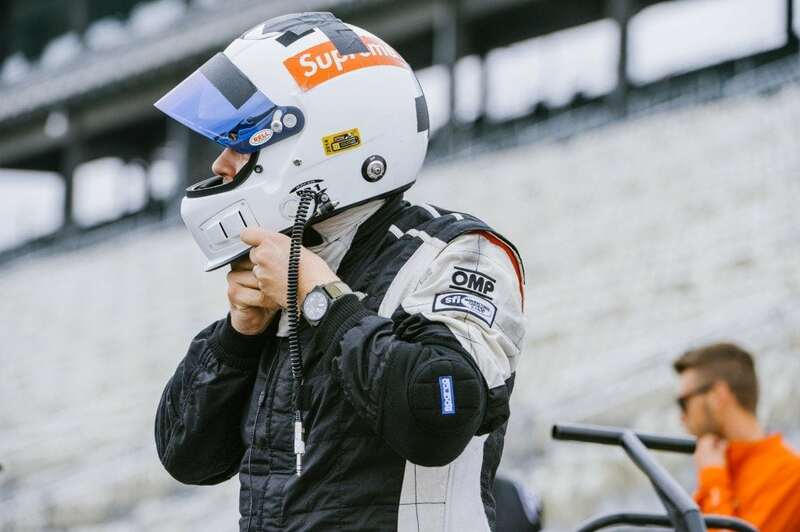 With some of the main protagonists unavailable Chase Murray had it all his own way in qualifying , but all eyes were on the battle for the other positions as lap by lap grid positions swapped back and forth , and in a last lap charge Doug Tuttle secured the other illustrious front row spot. 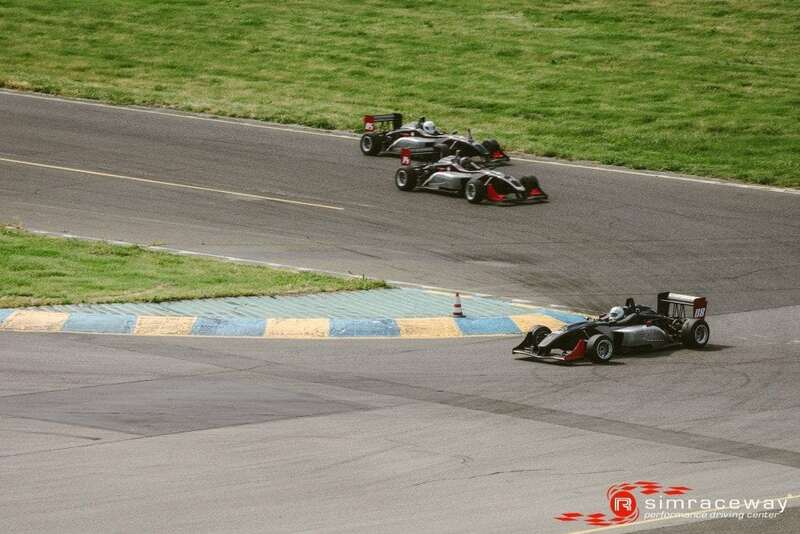 With the field packed up tight the ever fast starting Tim Adolphson moved into 3rd in the run up to turn 2 then used that aggression to late brake Tuttle for 2nd near the end of lap 1 in the chicane. 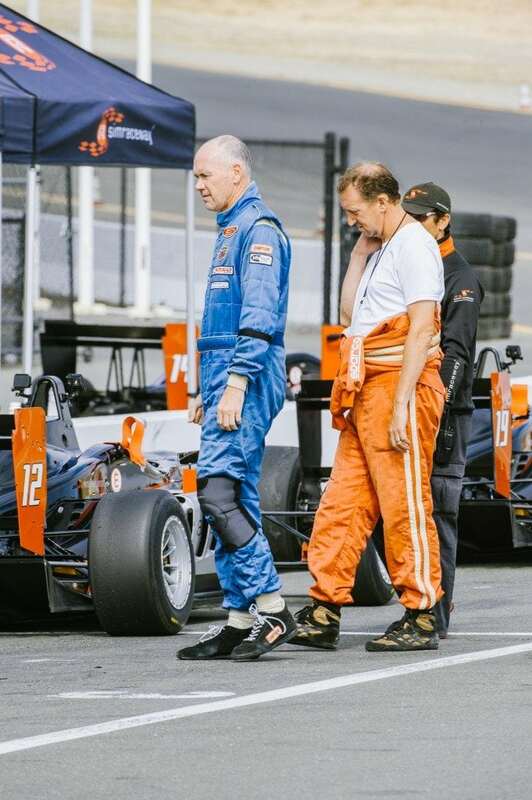 Meanwhile first time starter Mark Schiller settled down in 4th with Steve Campbell close on his heels. 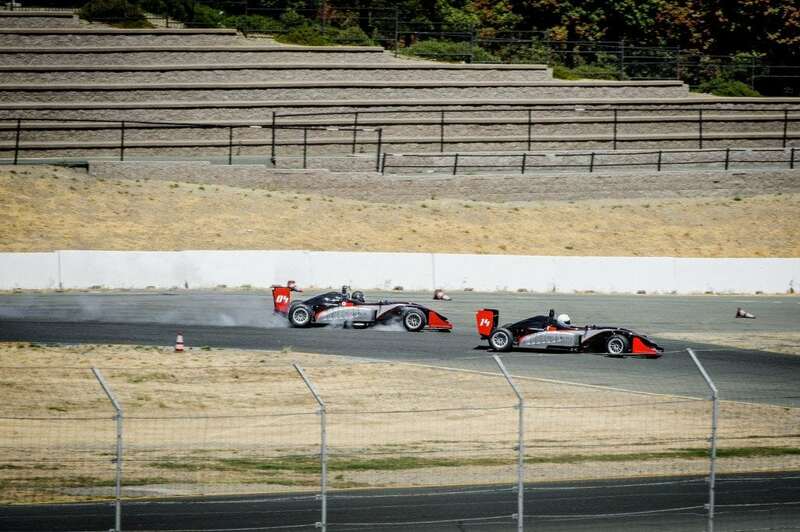 Those 4 were running in close proximity for the first ½ of the race till a late move in turn 9 by Campbell ended up with a trip to the grass and thwarted Schillers momentum enough to allow Adolphson and Tuttle to break free. 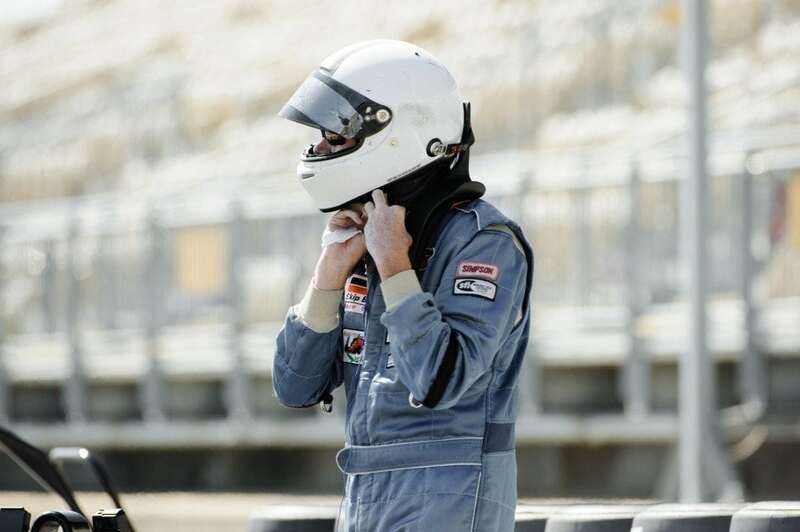 Further back we had Jim McGuire making a welcome return to the series, Erickson Shirley & ever improving Robin MacGregor in 8th place. 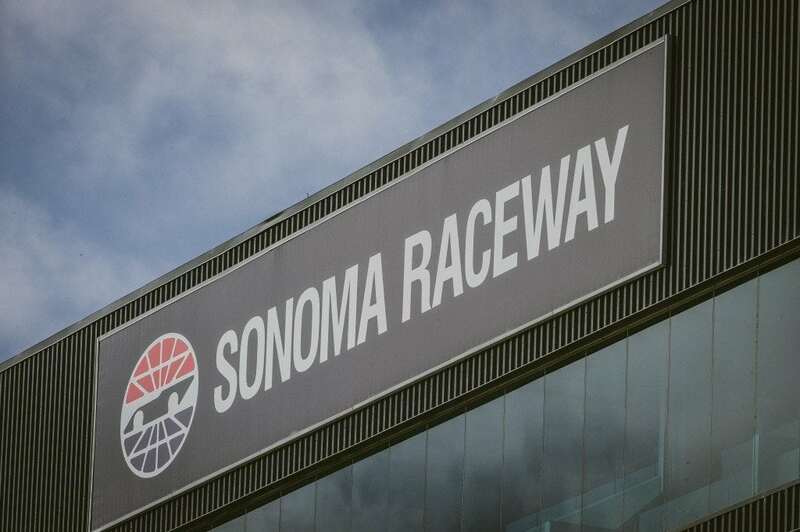 As predicted from qualifying form Chase Murray steadily drew away from the field while the battle for the podium raged. 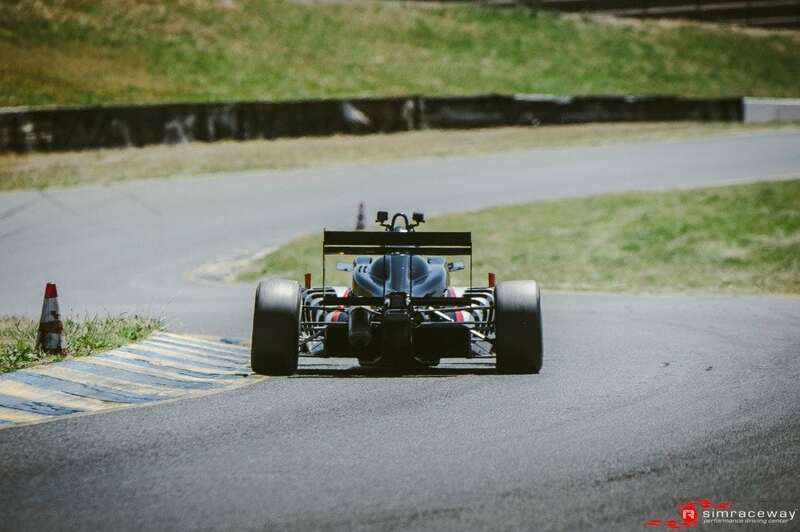 Adolphson had to run lap after lap with intense pressure from the tenacious Tuttle as the gap never stretched to more than a couple of car lengths. 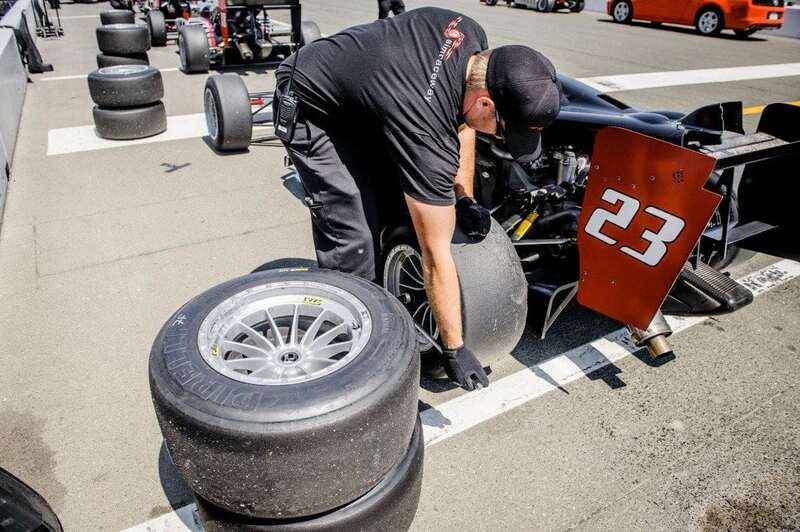 Tuttle was gaining in the first half of the track but Tim would make sure his car was positioned perfectly to not allow Doug by. 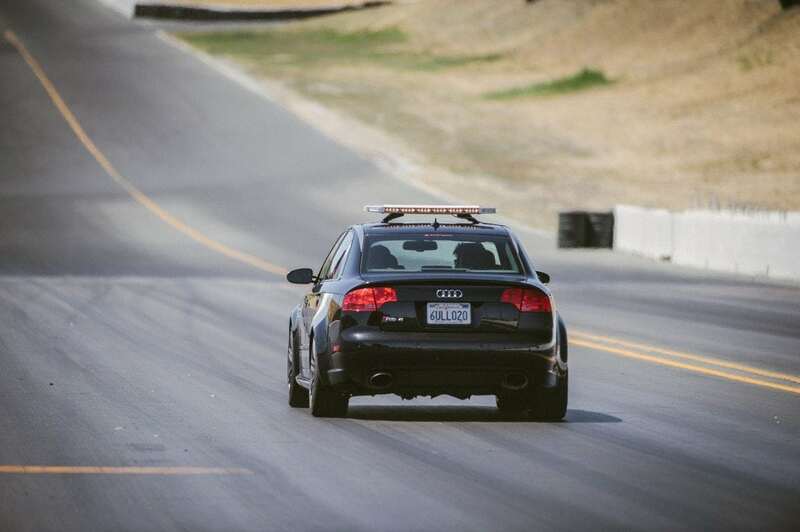 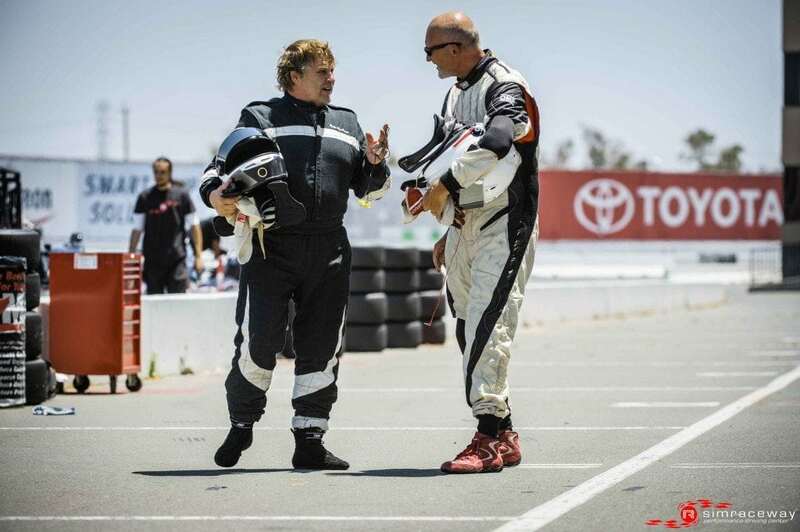 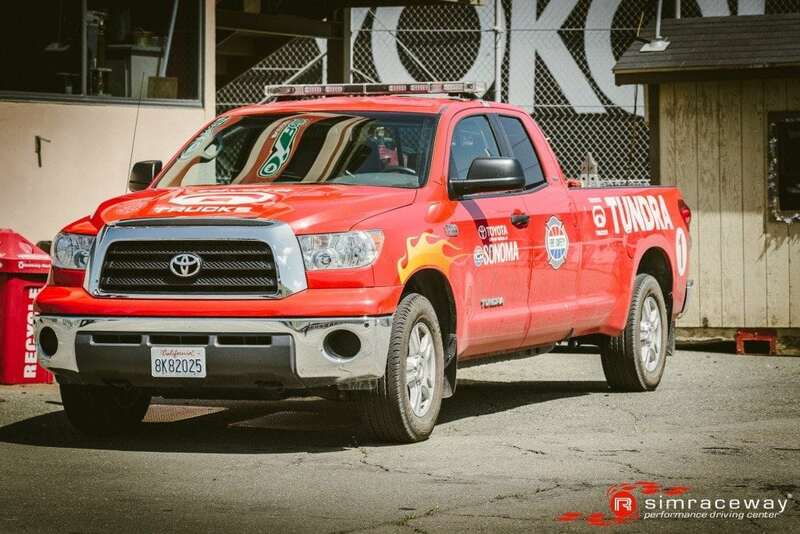 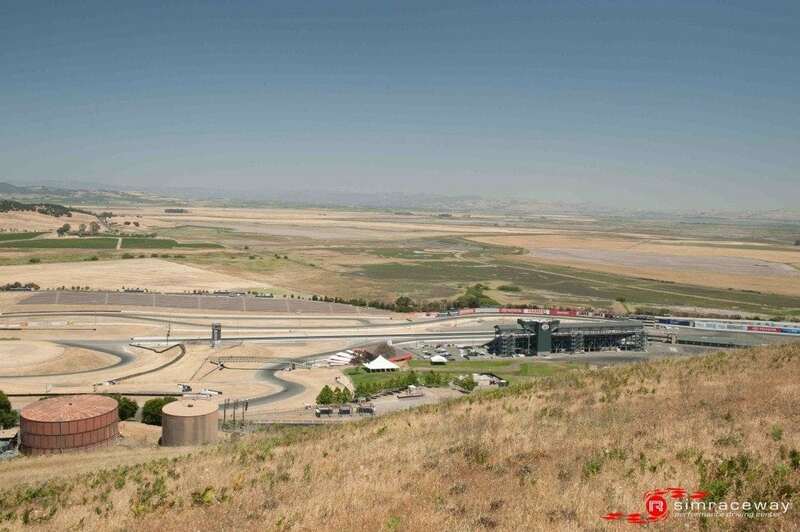 Constantly you would see Tuttle try the inside and outside on the run to the best spot for passing at Sonoma Raceway the hairpin turn 7 but he could never get enough of a run to get ahead before the esses. 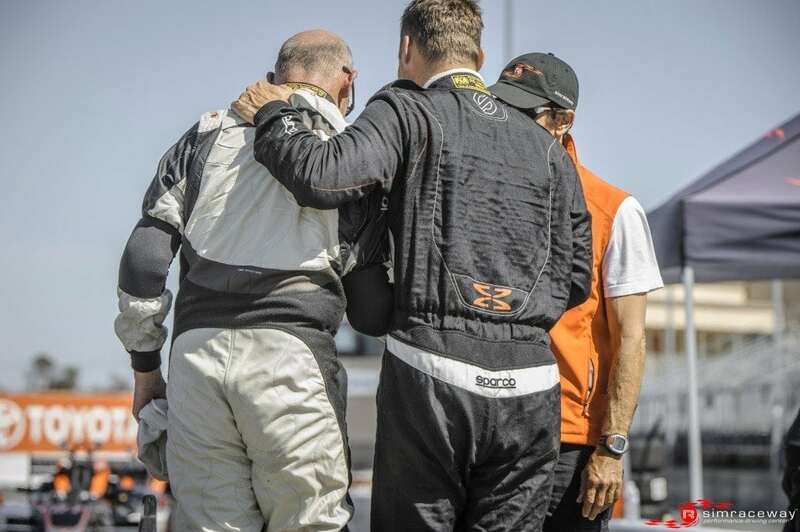 This intense battling allowed Mark Schiller to regain some time and he started to close as the race neared the end. 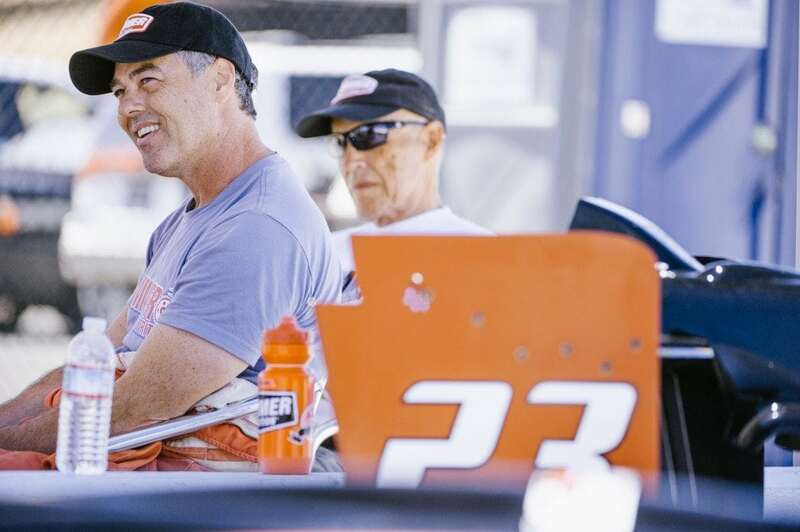 Also back down the order Erickson Shirley picked up some great pace and closed on the fading Jim McGuire to steal 6th place away with a few laps to go. 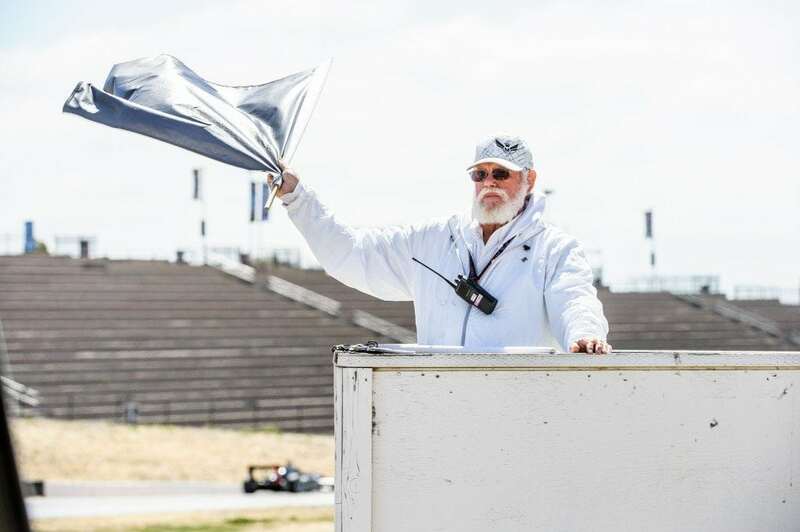 As the white flag flew you knew Tuttle had to do something different to get by Adolphson and different it was with a wicked move on the outside of 7 as Tim kept that defensive line on the right, but it wasn’t over then as Adolphson didn’t want to let that spot go without a fight back and made a brave late braking move into the turn 9 chicane, unfortunately he couldn’t keep control of the rear and spun on the corner entry allowing debut boy Mark Schiller to fill the last spot on the podium on his first try. 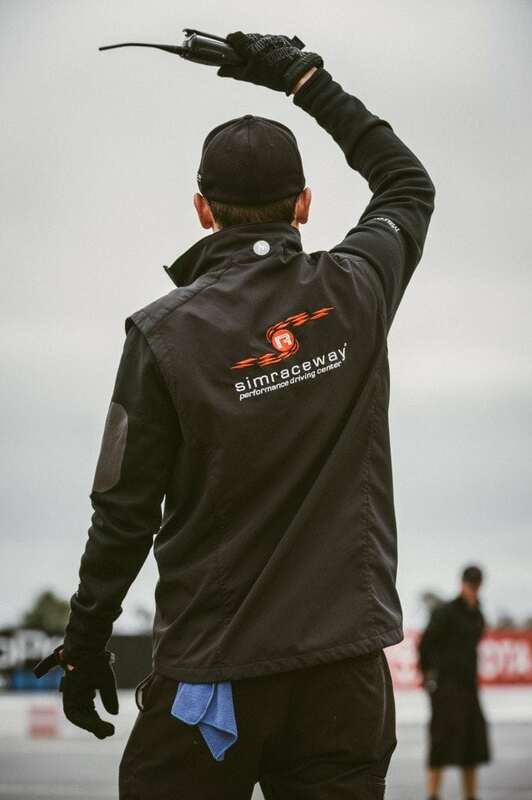 So Chase Murray notched up another impressive win unaware of the brilliant racing that went on behind him, as the season wears on the grid is tightening up so everyone is looking forward to what will happen next. 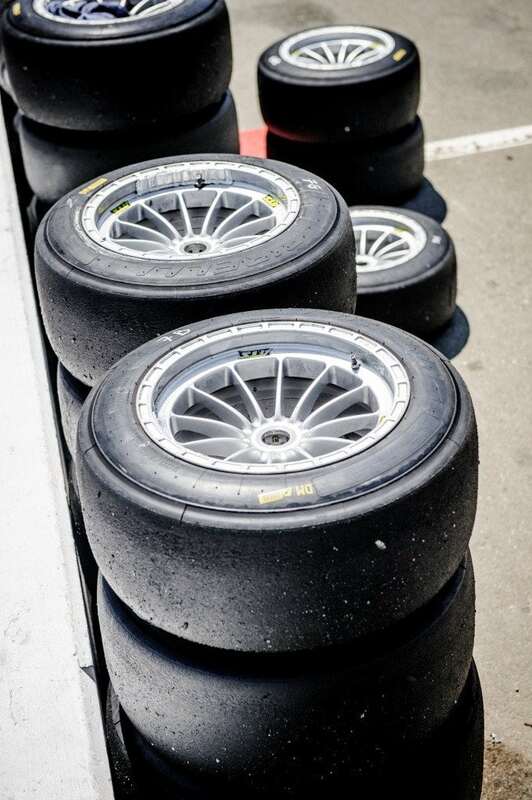 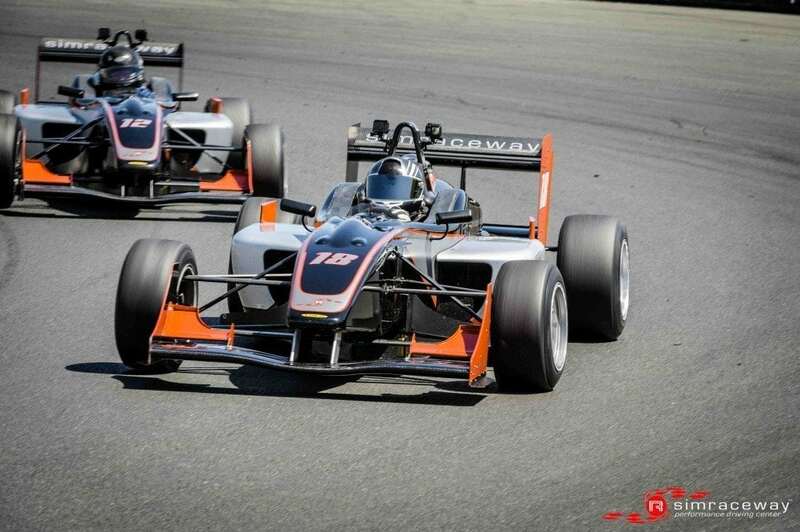 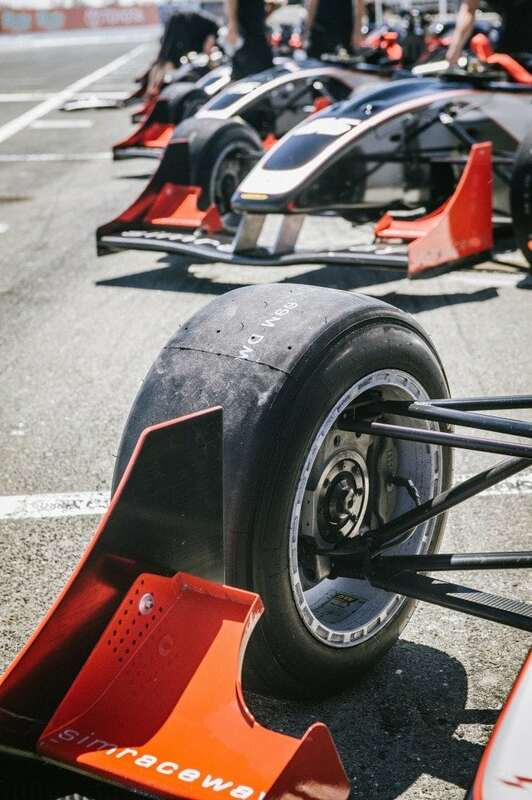 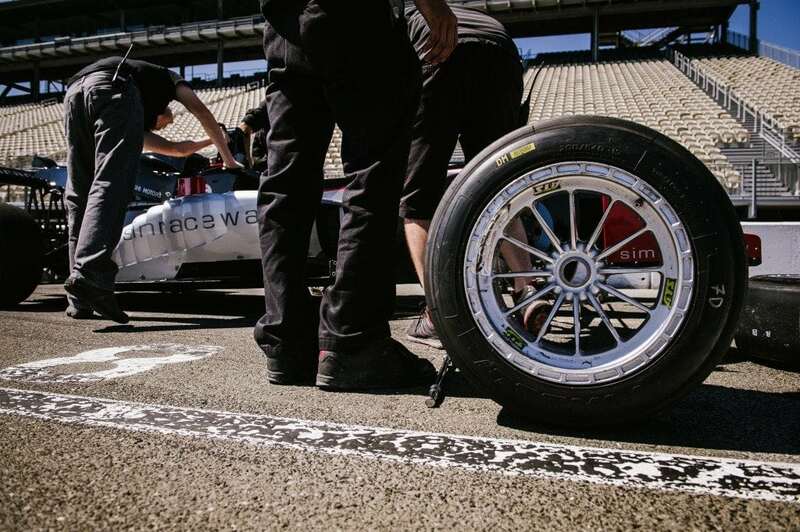 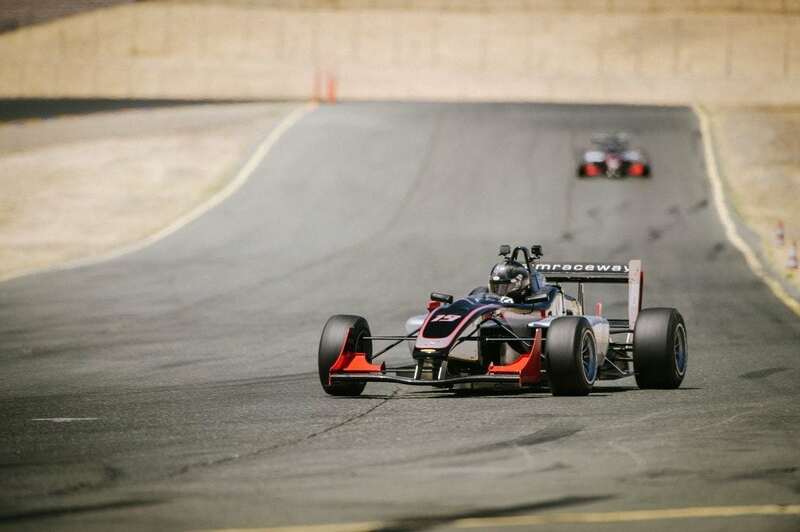 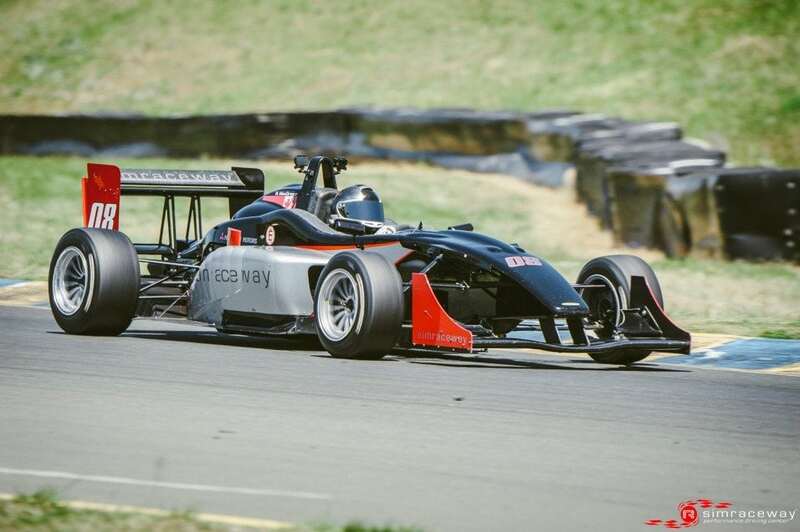 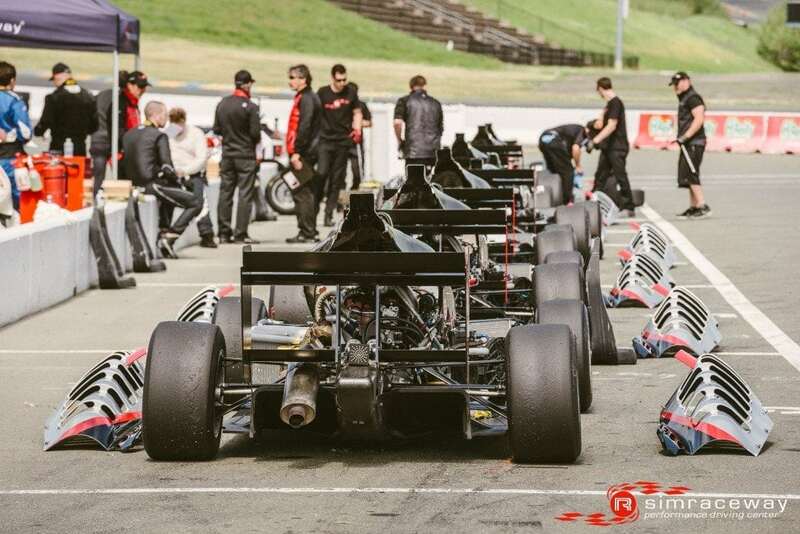 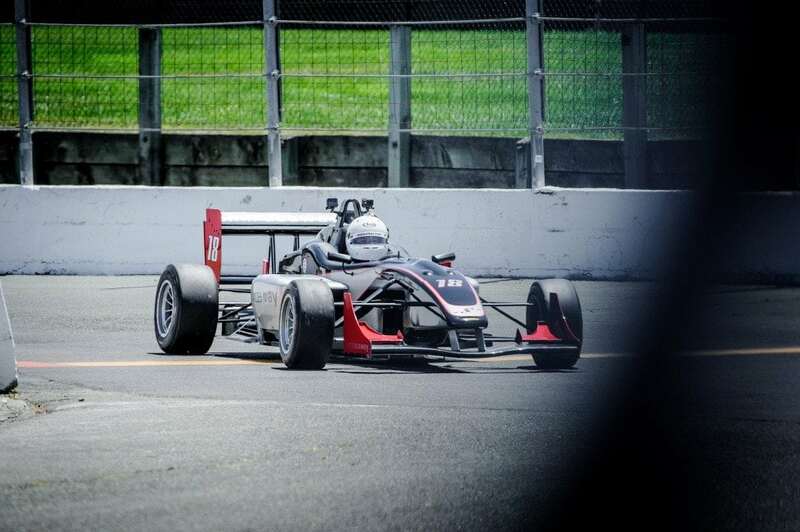 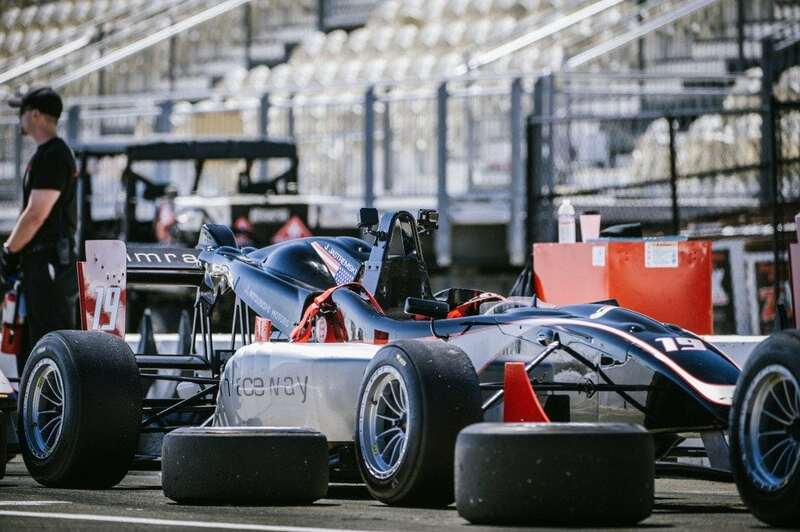 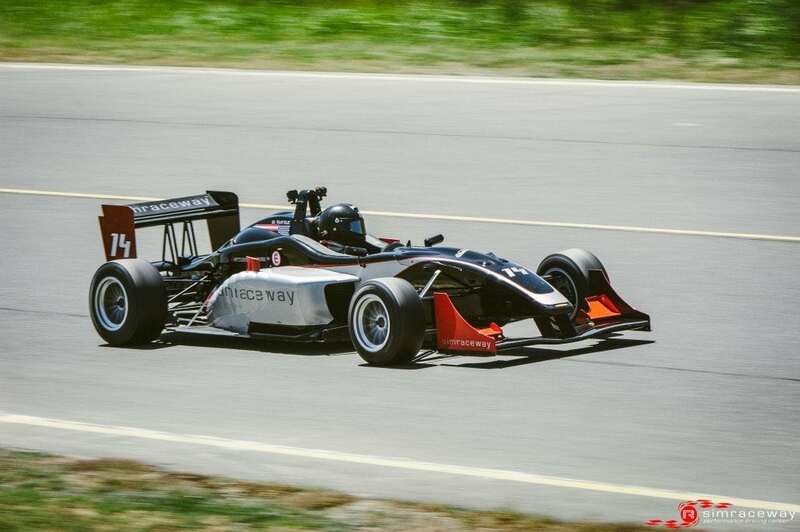 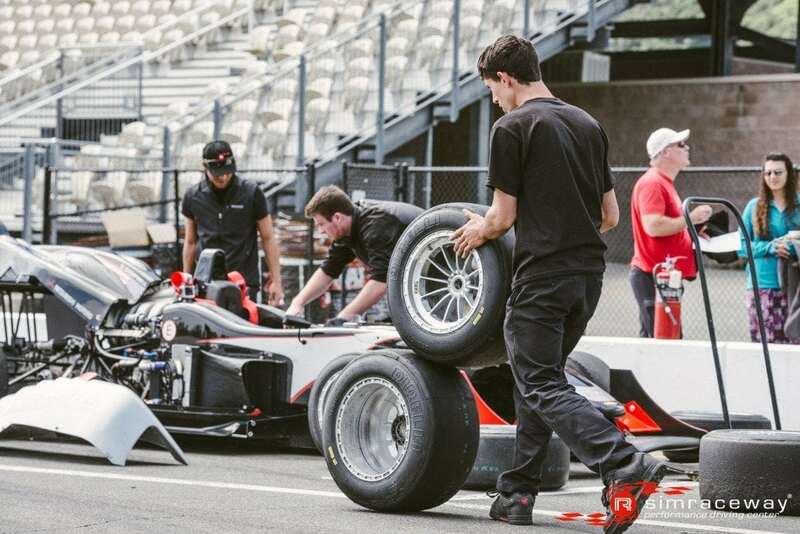 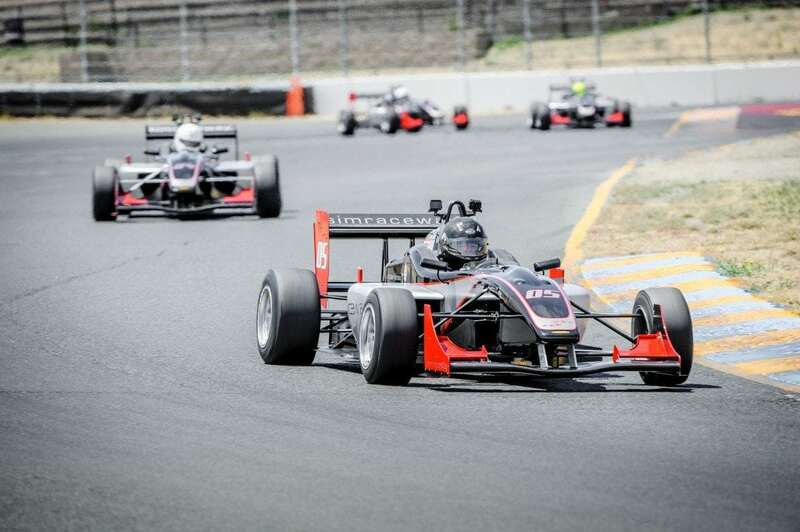 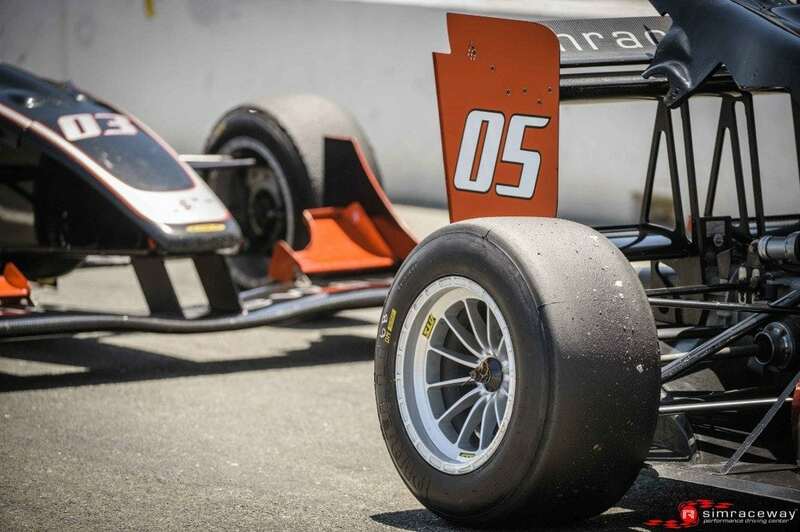 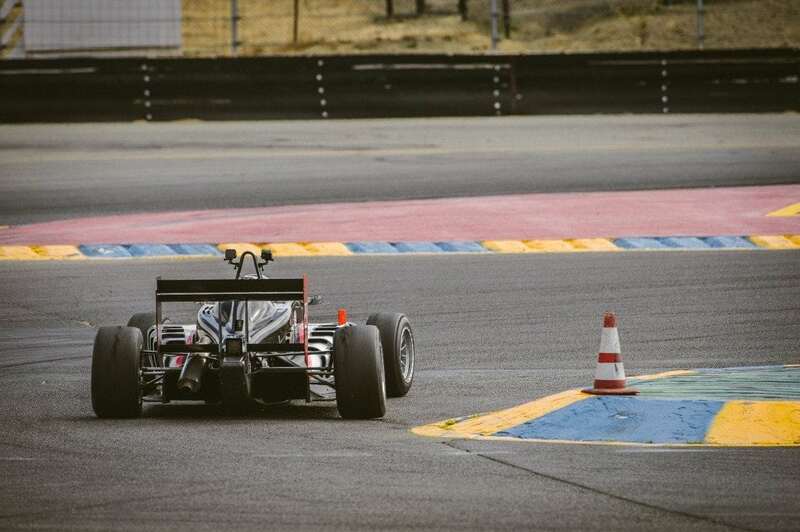 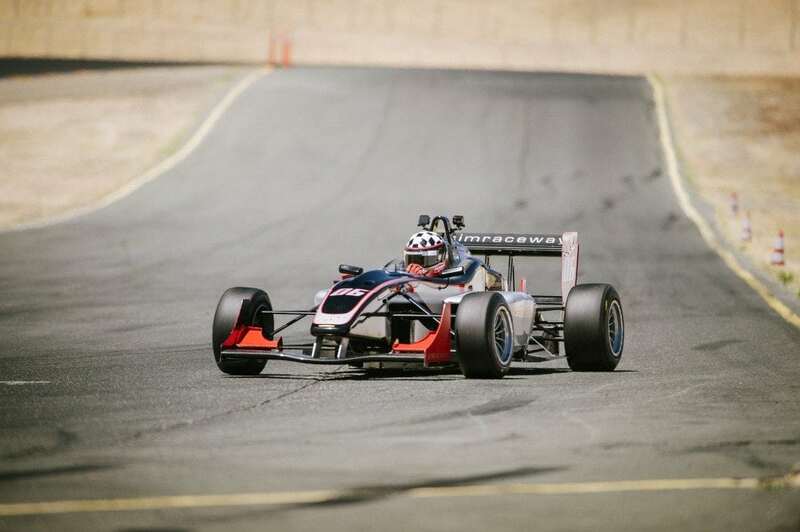 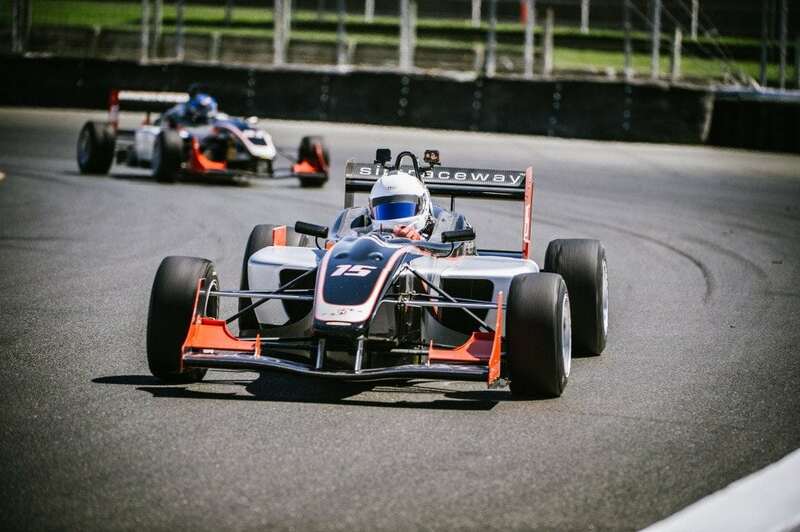 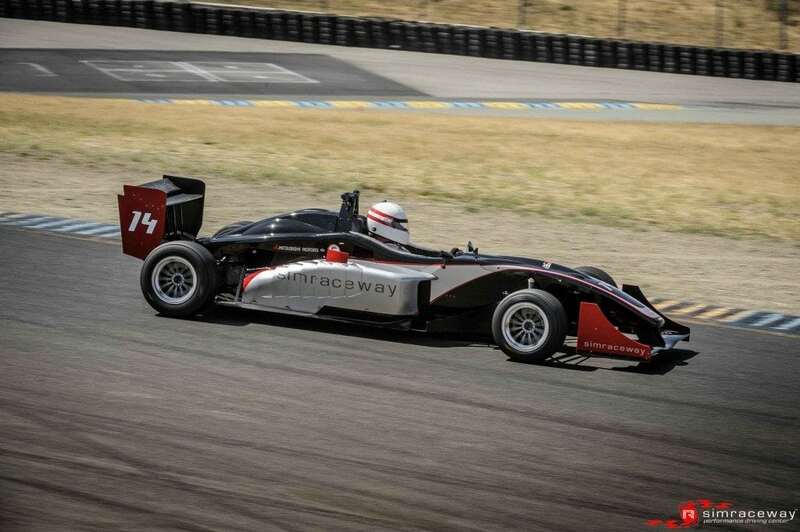 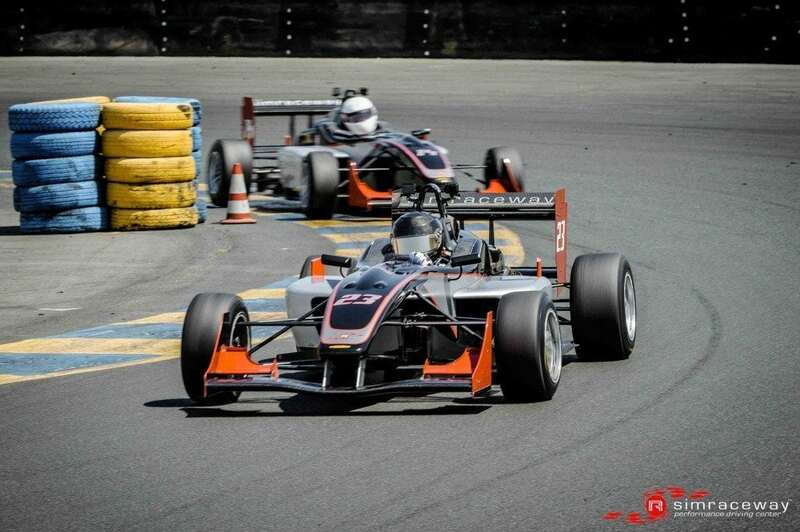 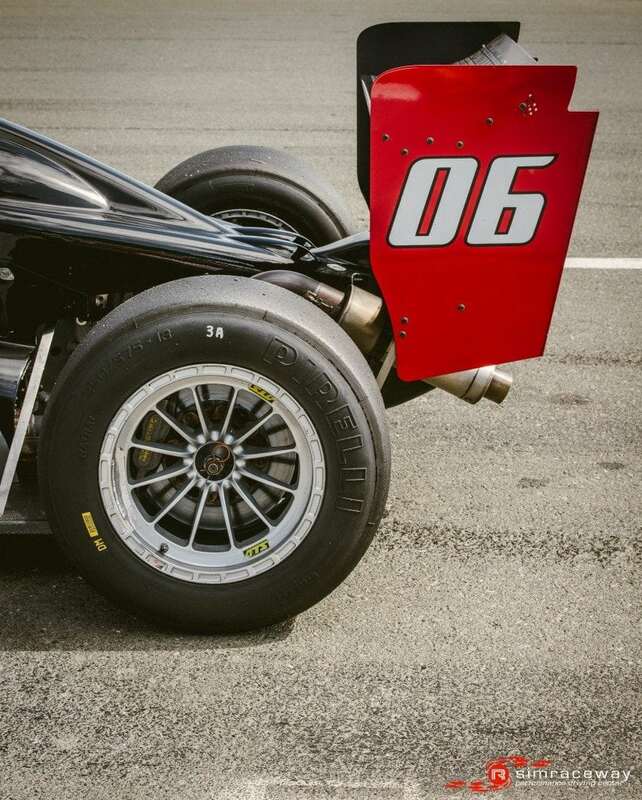 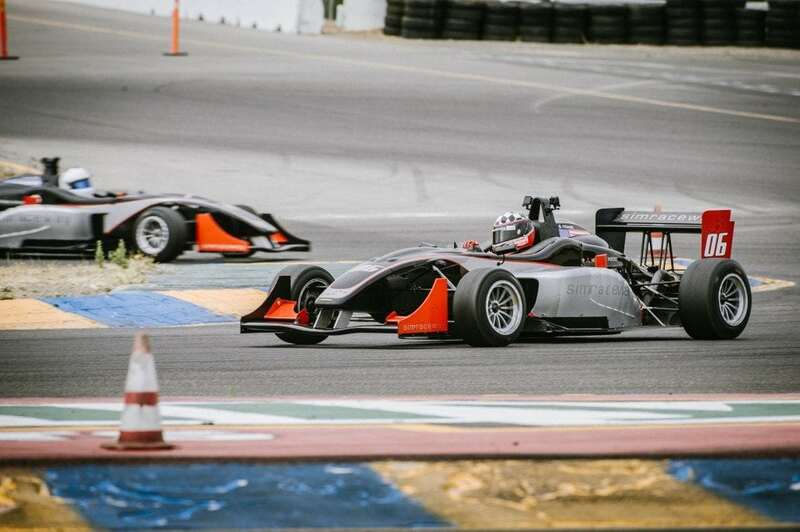 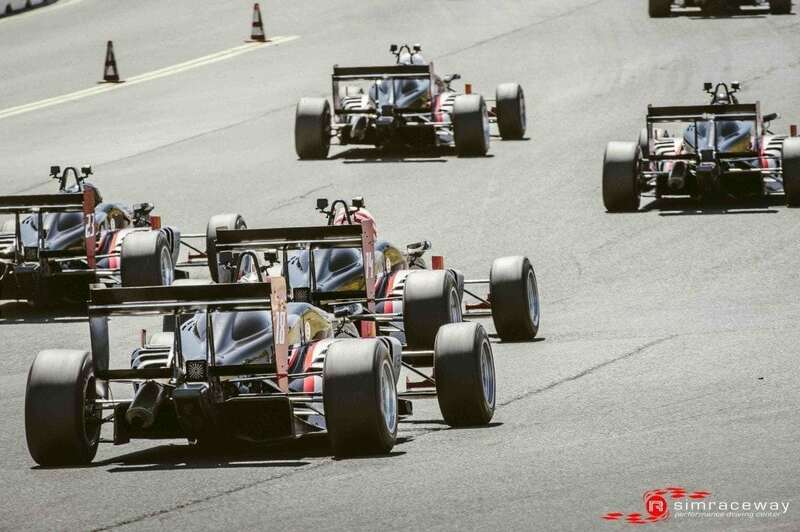 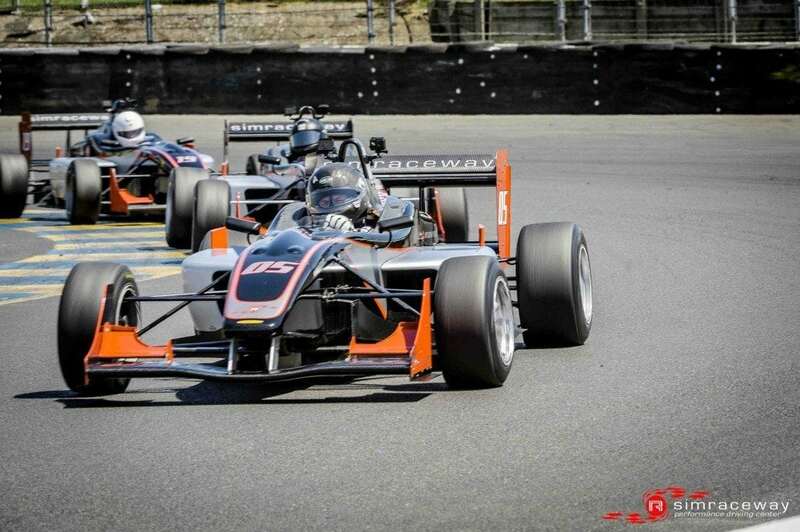 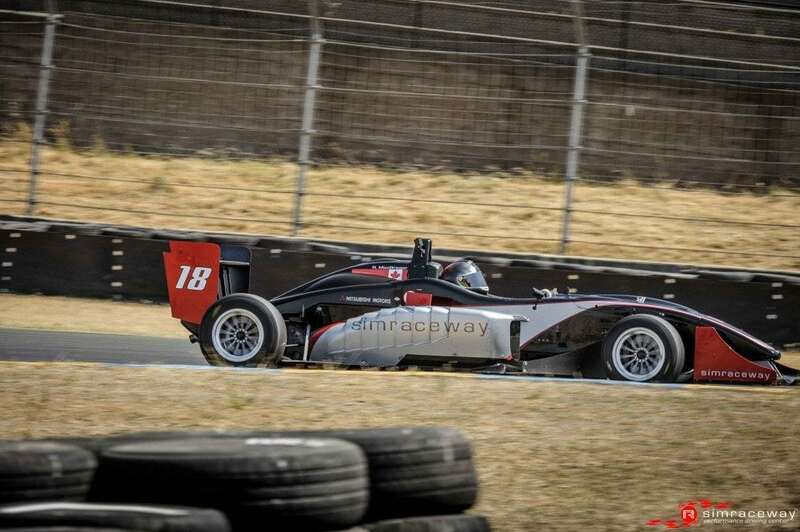 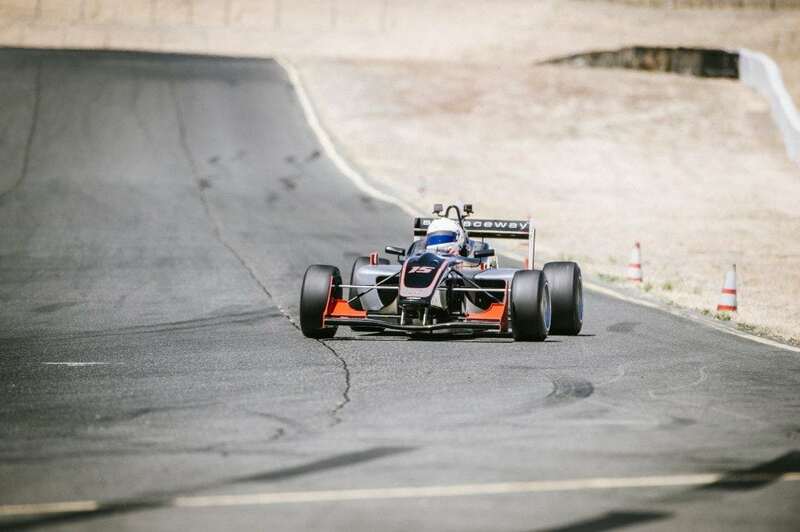 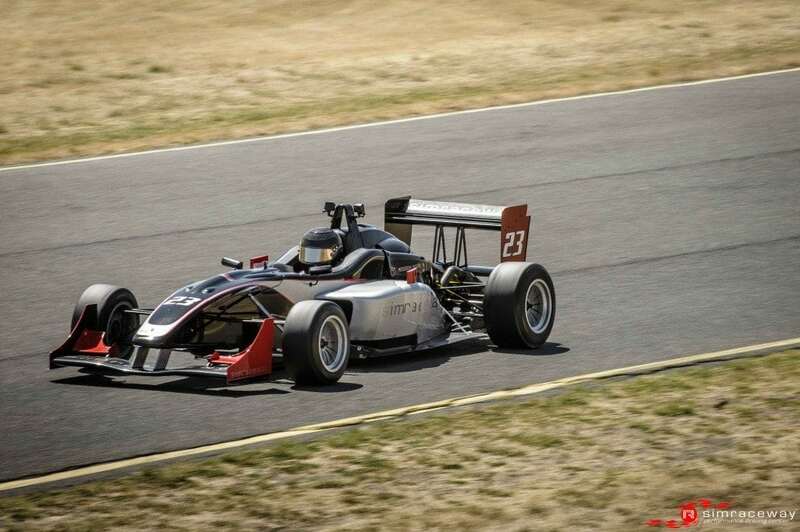 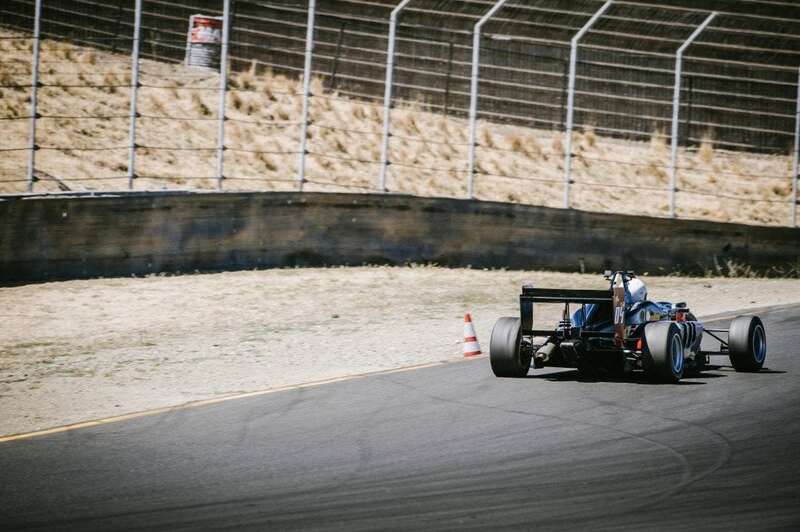 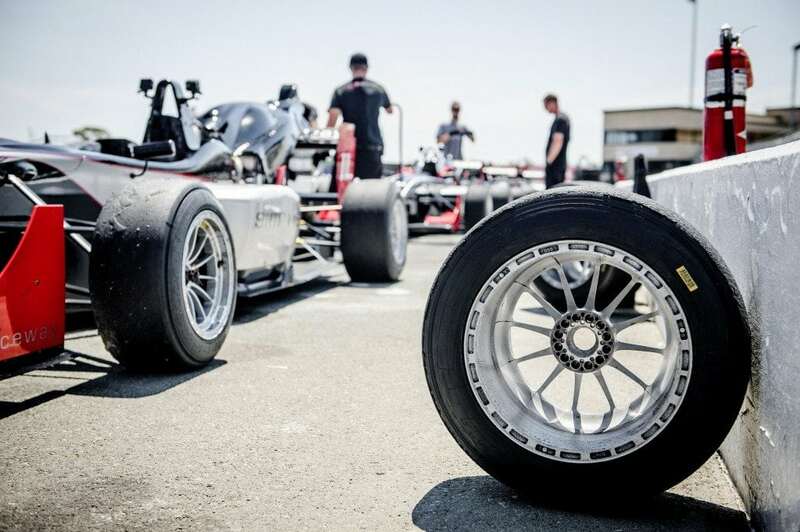 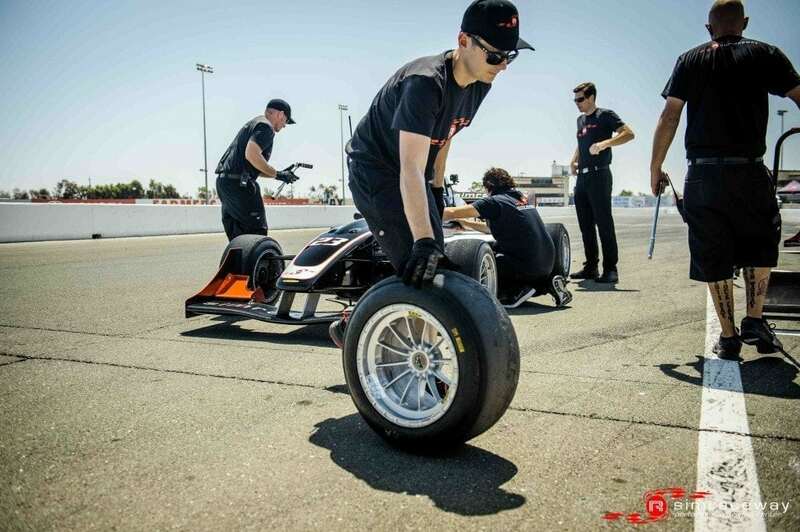 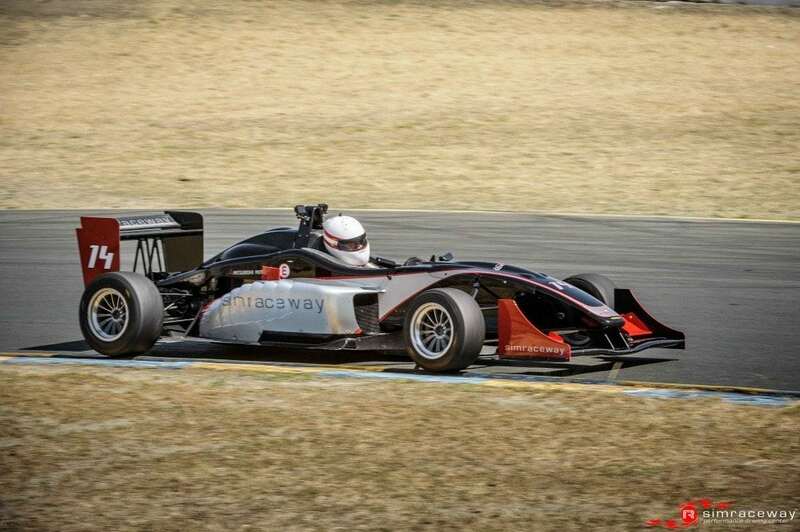 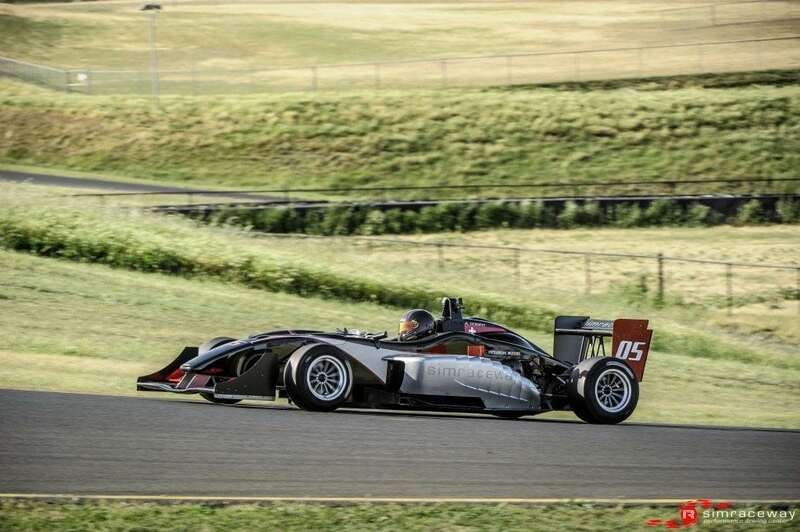 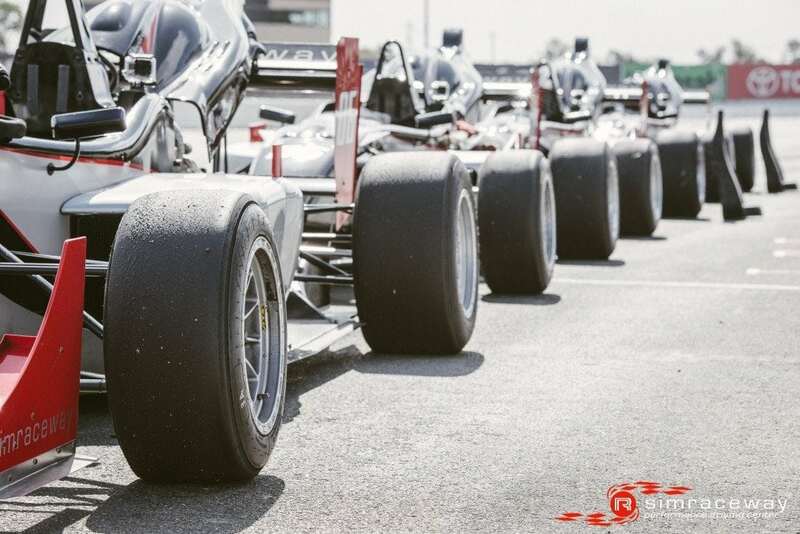 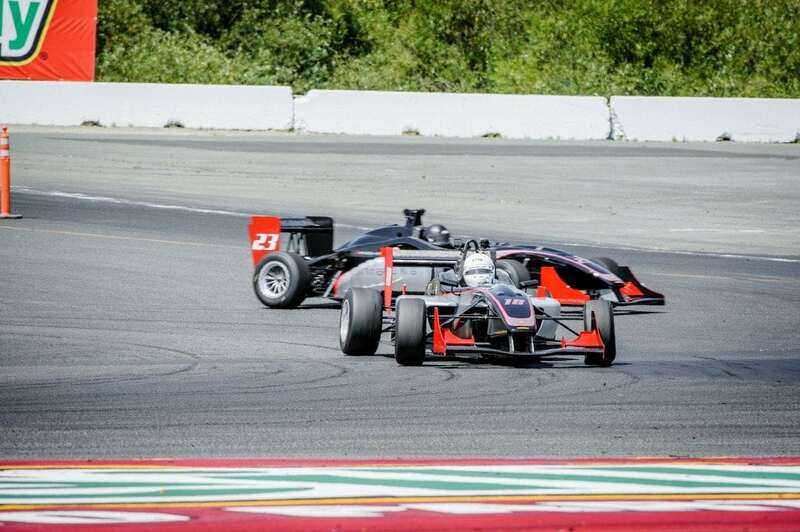 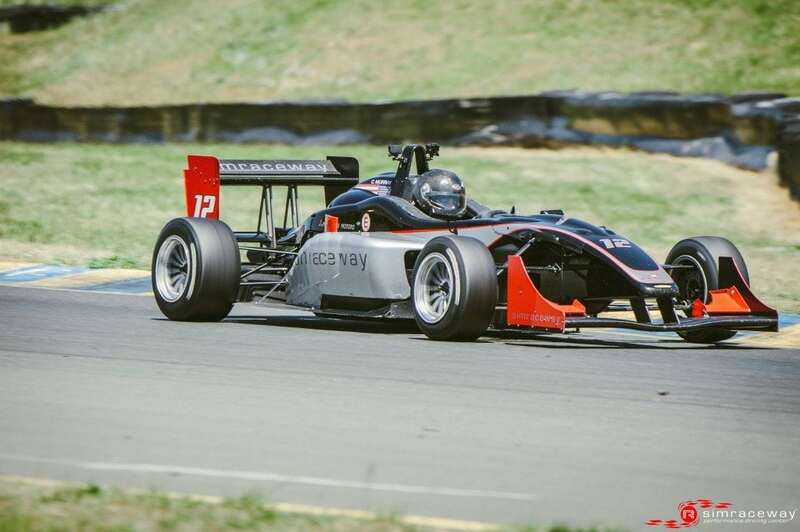 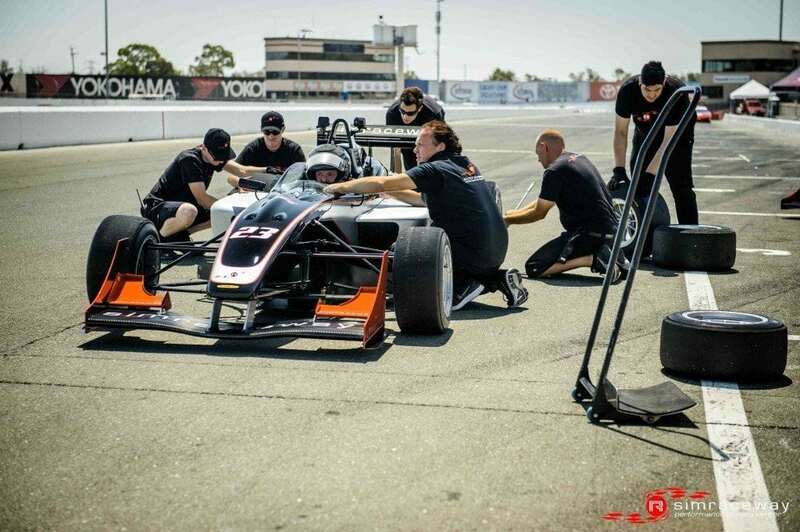 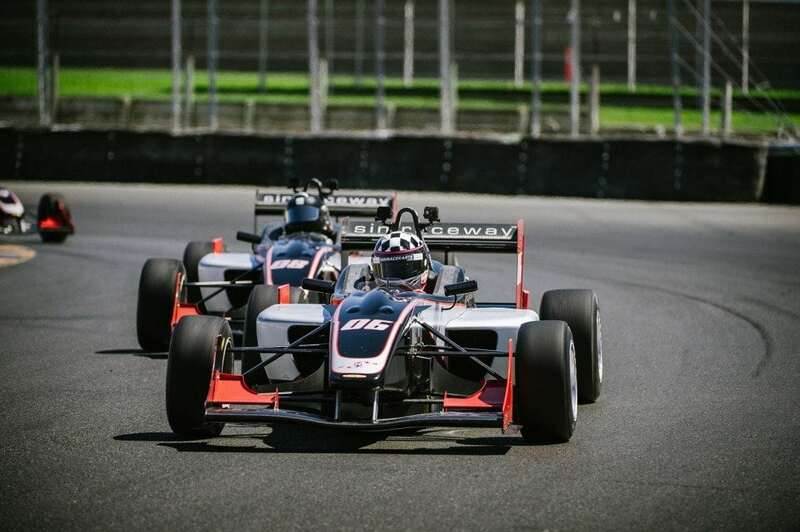 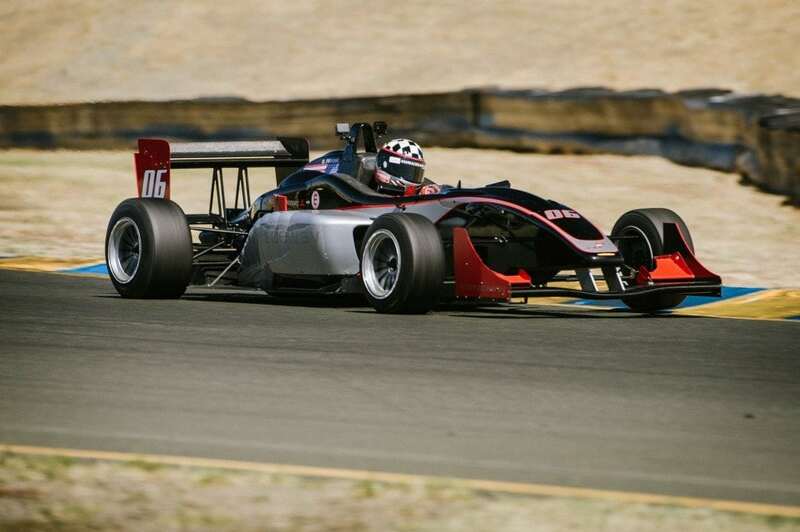 With the tarmac getting ever stickier on a scorching day for race 6 of the 2014 Simraceway F3 series It wasn’t going to take long for the Pirelli tires to get to working temperature nor as it came to be the drivers heating up the action on track. 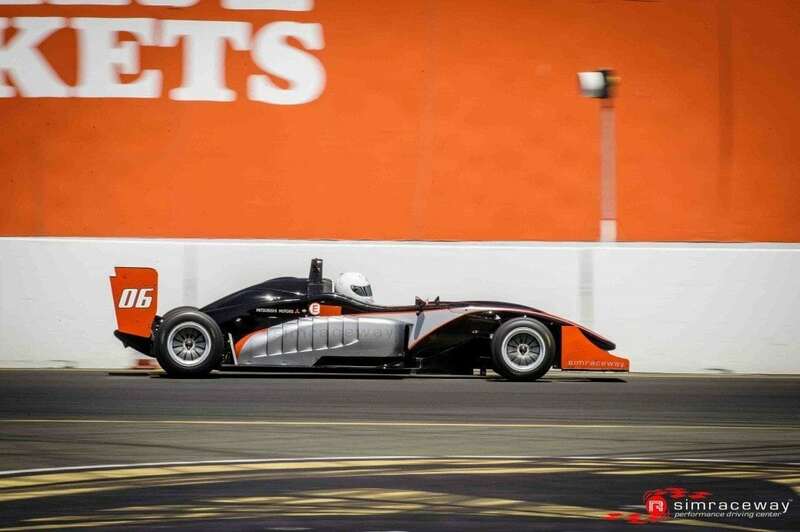 Race 6 saw a new poleman as Tim Adolphson put in a flyer late in qualifying to out gun fellow front row starter Doug Tuttle. 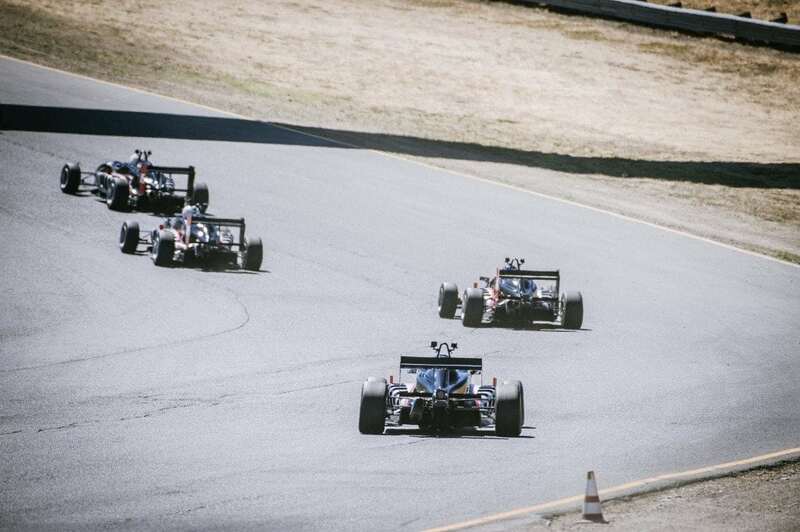 Green flag dropped & everyone made it through the first lap cleanly but no one could make a break away as Adolphson, Tuttle, Campbell, Schiller, McGuire & Shirley filed nose to tail for the first 3 laps. 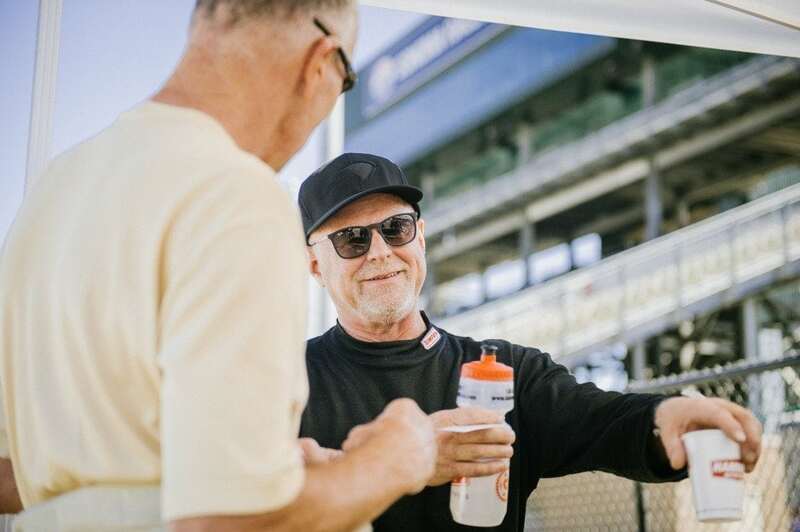 Not to be outdone the 7th through 9th battle was just as intense as newcomers Jim Cachot & Bob Irwin got to duke it out with Robin “Rocky” MacGregor. 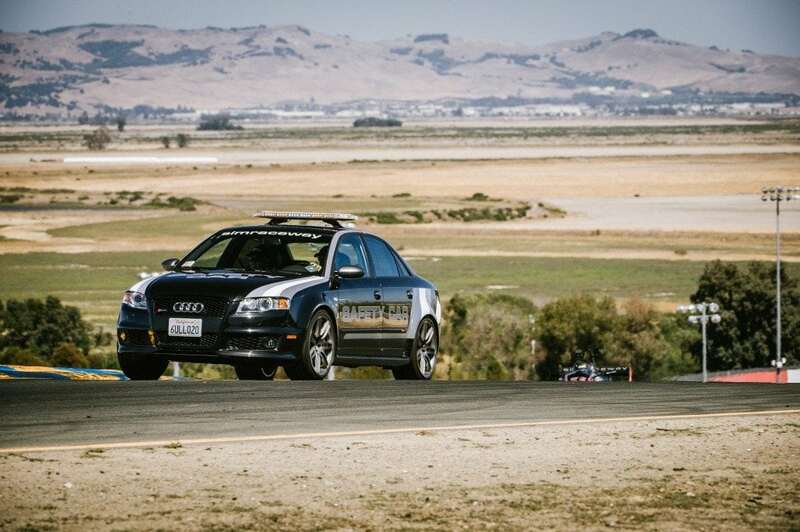 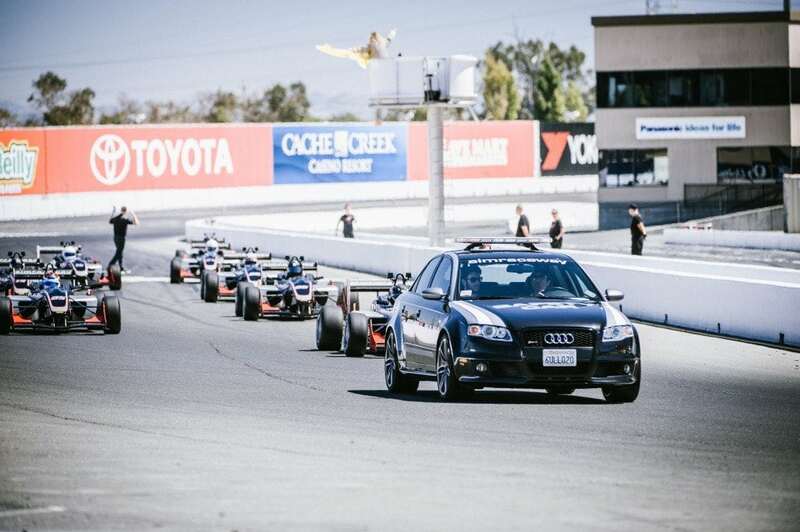 Working lap 3 saw a big change in the lineup as the gaggle filed into the turn 9 chicane leader Adolphson lost the rear of the car and was collected by 2nd place man Tuttle bringing out the use of the Simraceway Audi RS4 pace car. 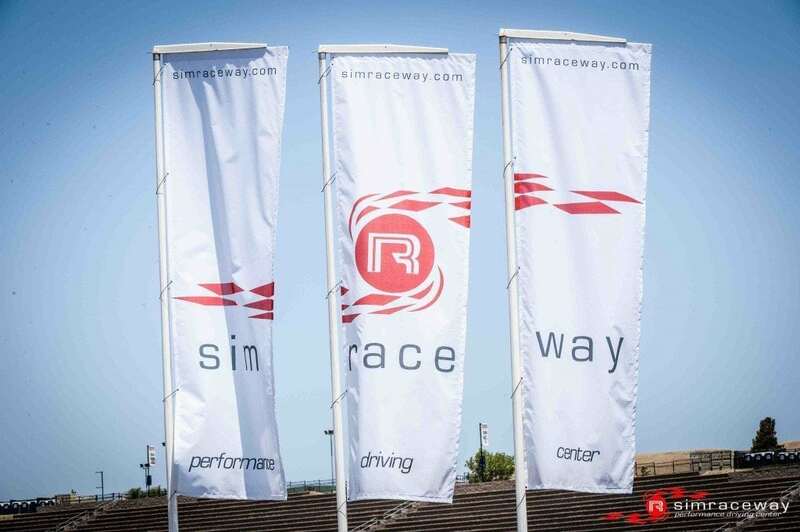 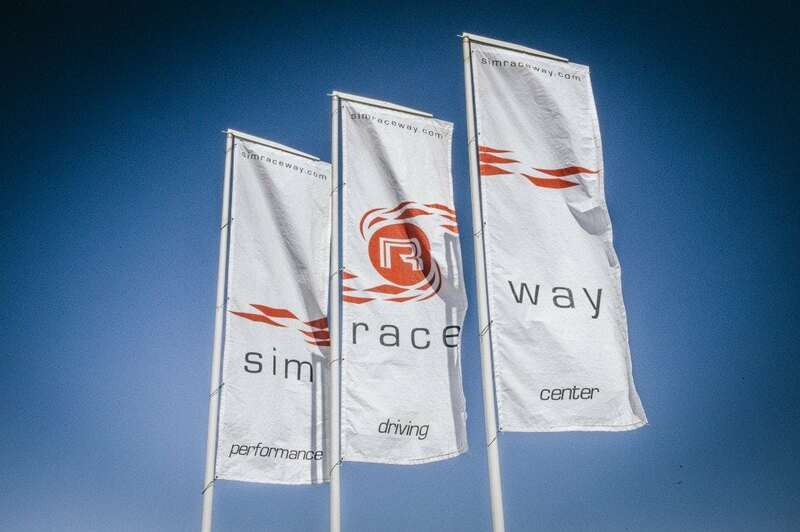 Once the cars had been untangled and sent back to the pits for attention from the awesome Simraceway tech team (who kept all the cars running to perfection all weekend long) it was time to go racing once again. 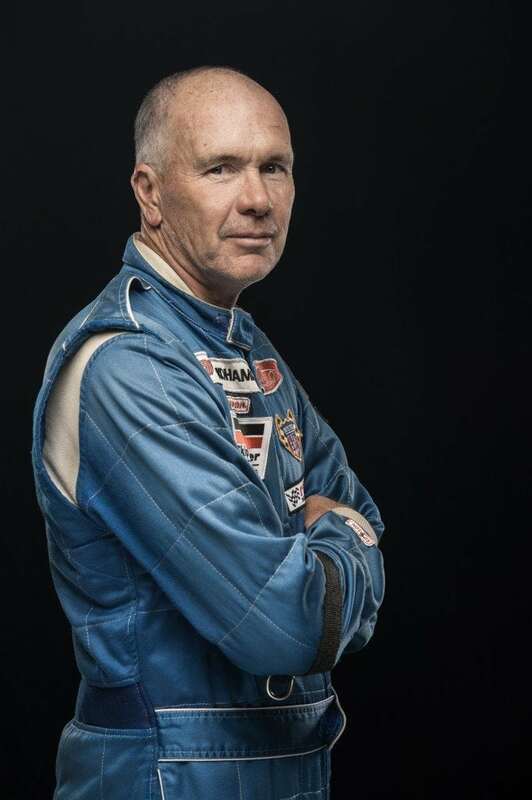 Steve Campbell made use of his experience and made a great gap on the restart, but Mark Schiller did not give up and closed back the gap with McGuire & Shirley in tow. 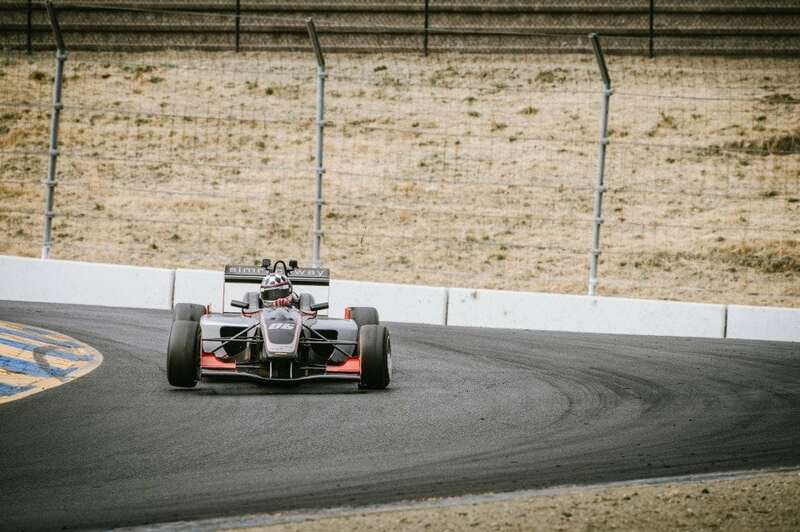 Heading to turn 11 on the penultimate lap Schiller made an adventurous move that didn’t pan out as he clipped & damaged his nose and wing on the right rear of the unsuspecting Campbell. 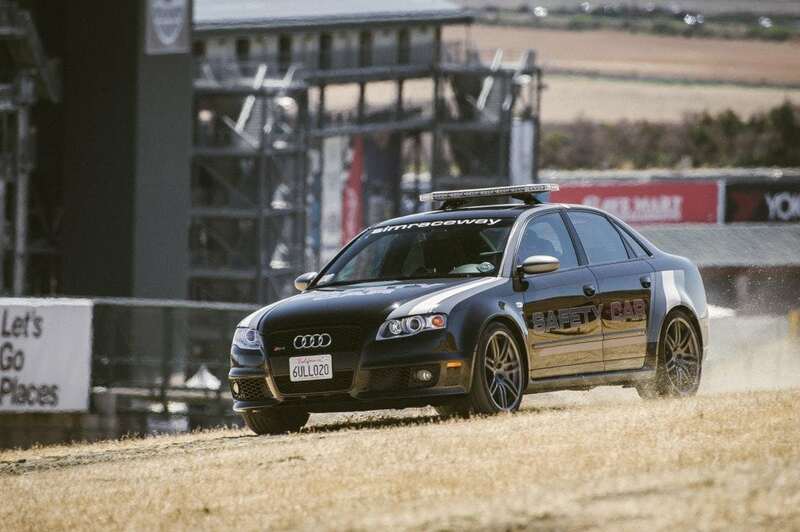 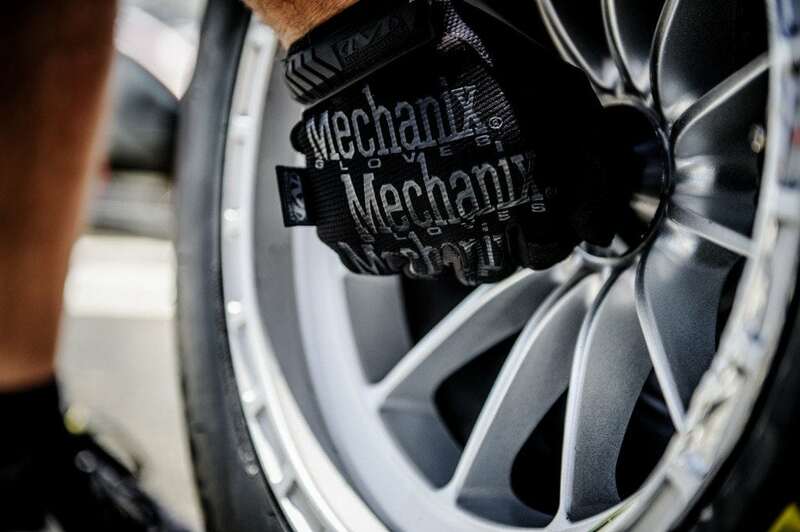 With no way of to hold pace with his injured car Mark steadily dropped back in the field and paid a visit to the pits. 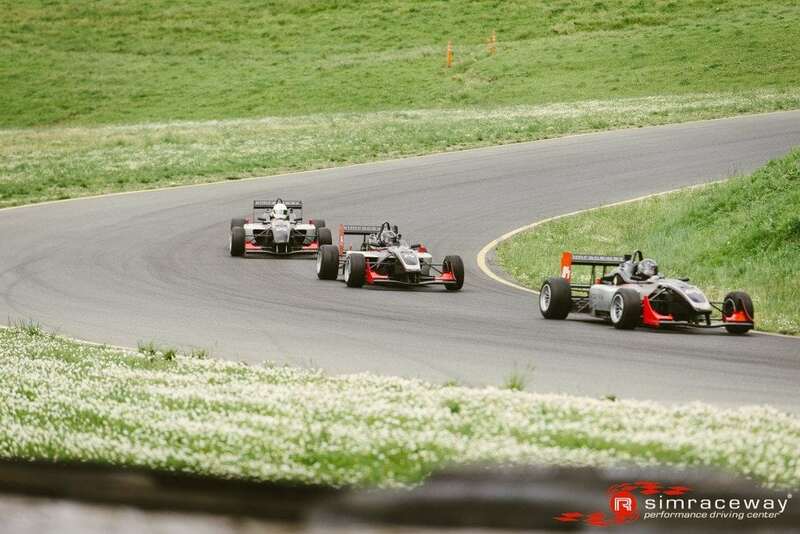 This left Jim McGuire and Erikson Shirley in 2nd & 3rd with Steve still holding 1st to finish the race. 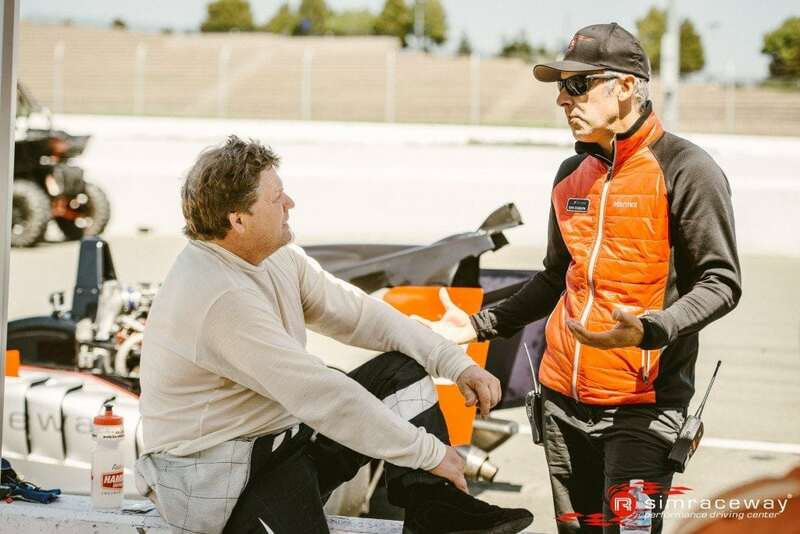 Unfortunately for Steve the rule book’s “no contact” policy dictated a penalty that dropped him down to 3rd spot elevating Jim McGuire to top spot and Erikson to 2nd. 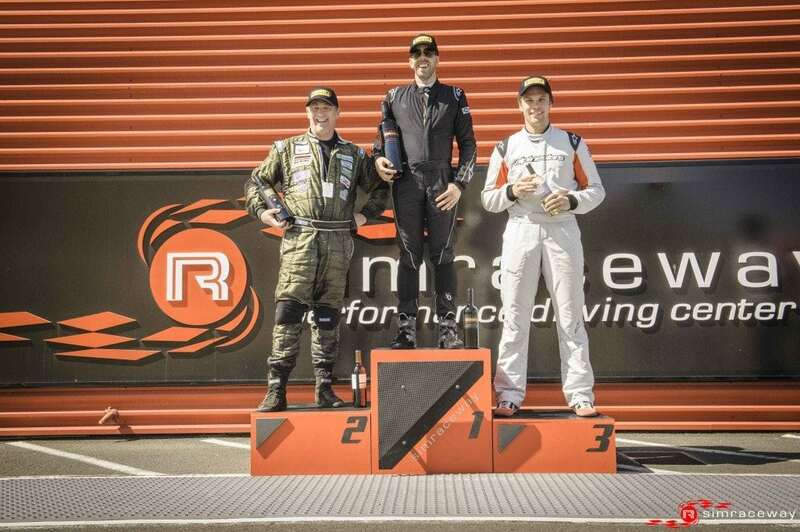 4th place came to series debutant Bob Irwin and 5th to Canadian Robin MacGregor. 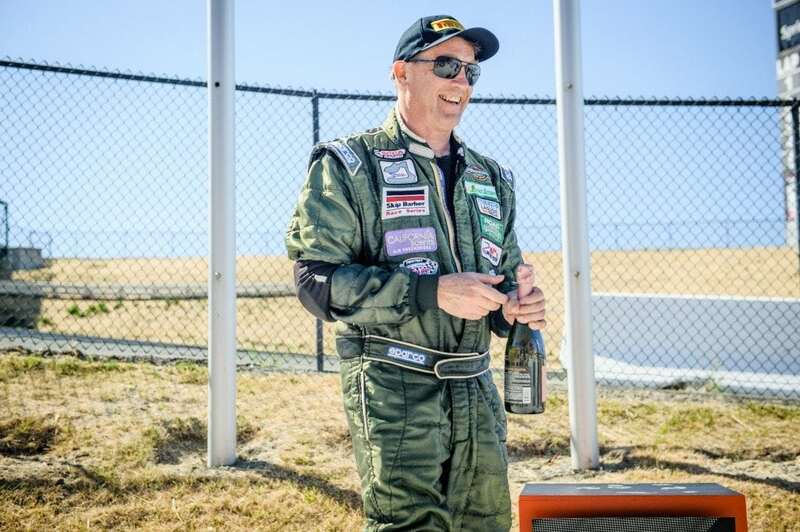 Jim “big moment” Cachot who showed a great turn of speed over the weekend had a big spin out of turn 6 in the dying seconds of the race which forced him down the order to 7th. 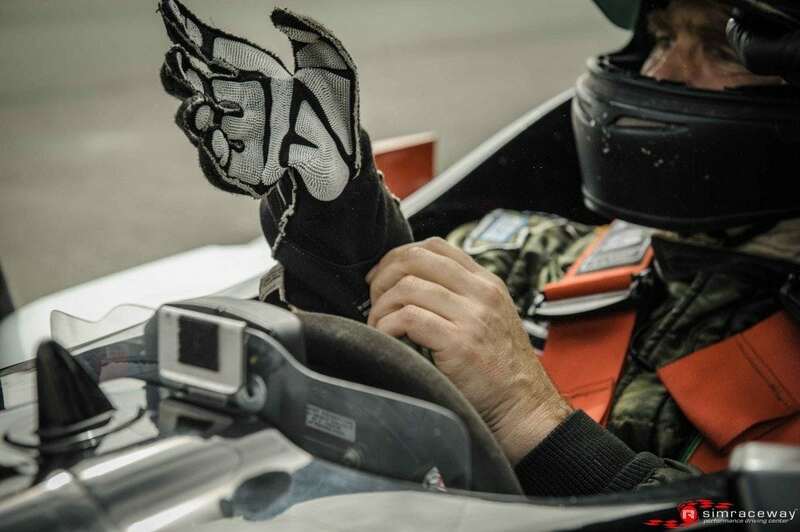 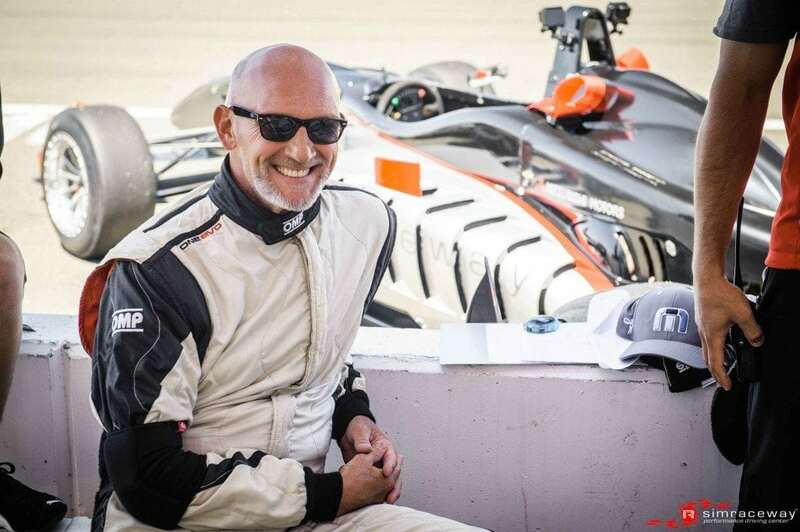 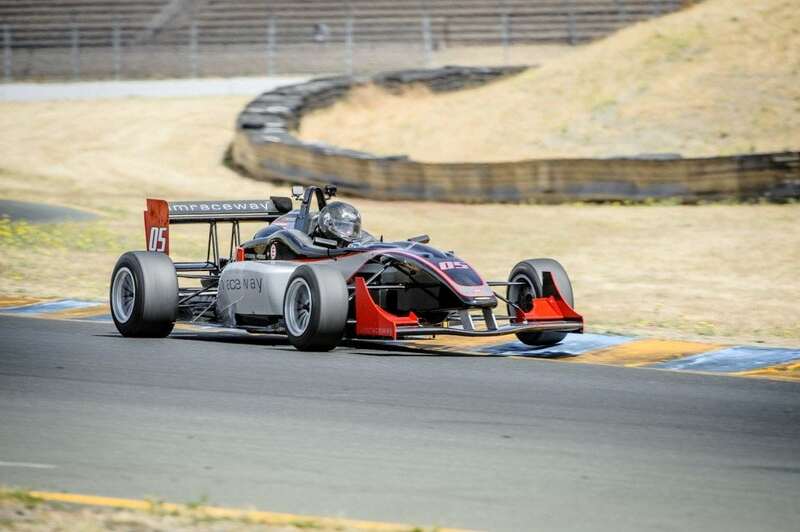 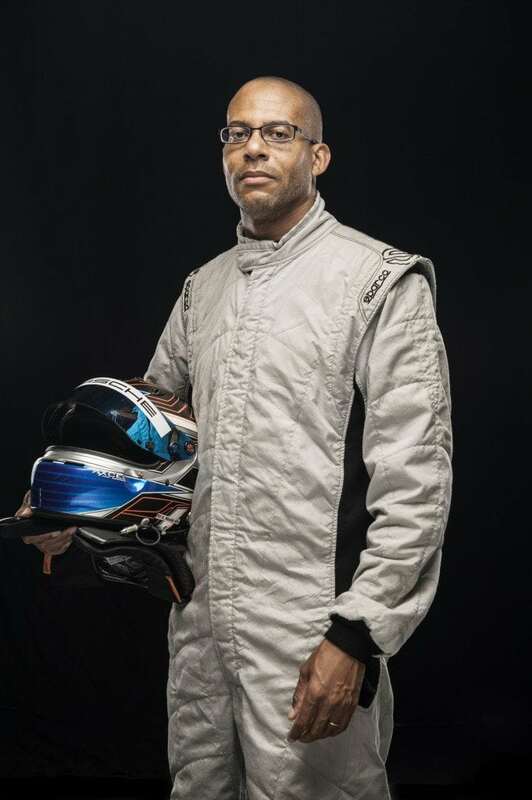 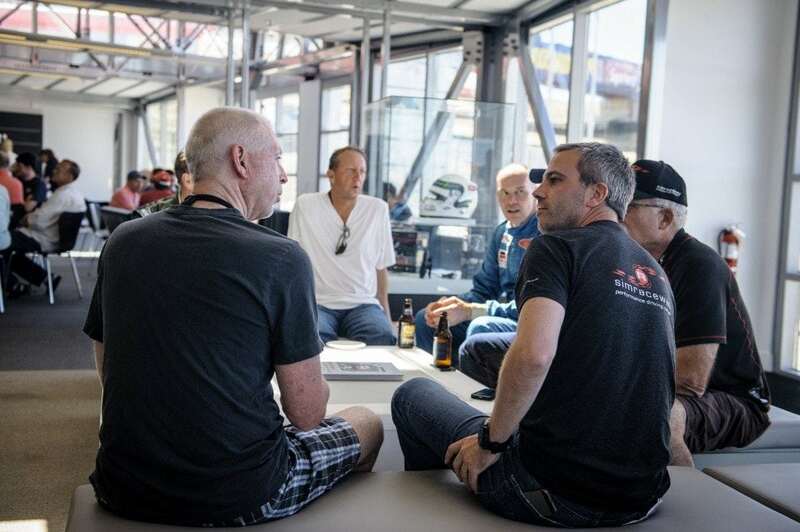 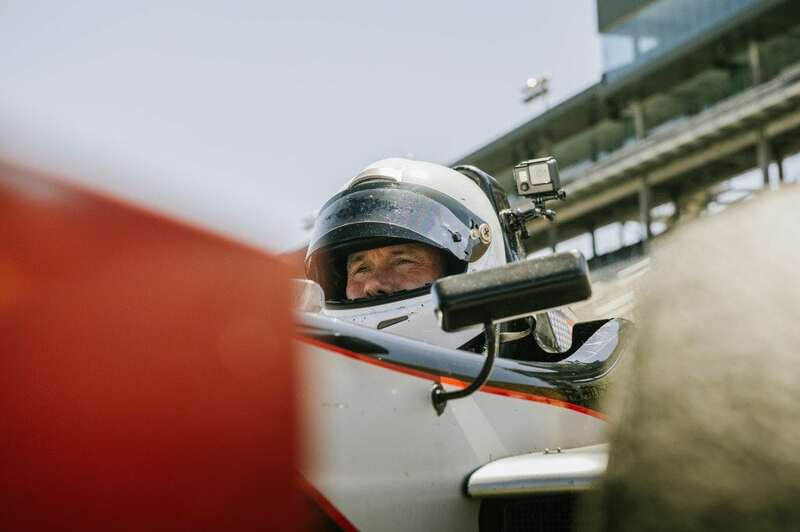 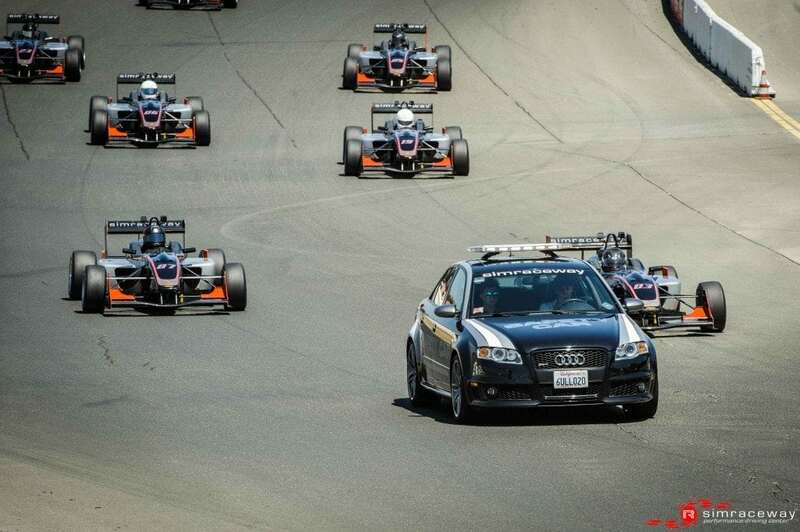 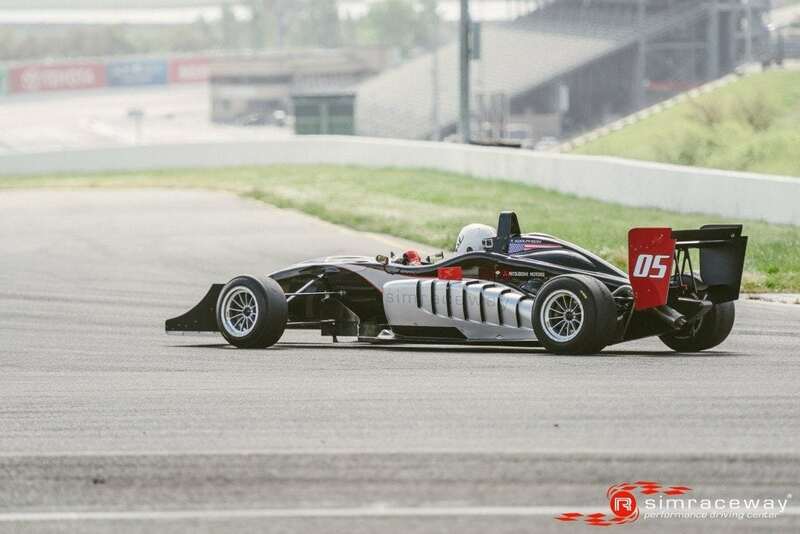 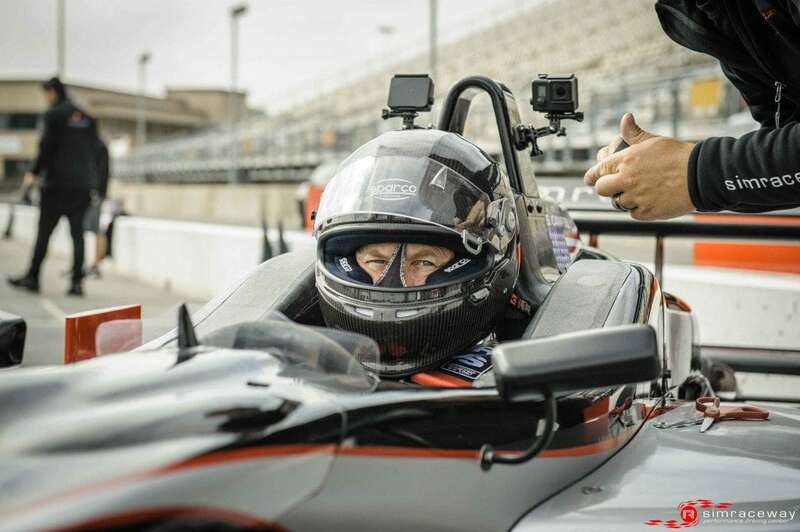 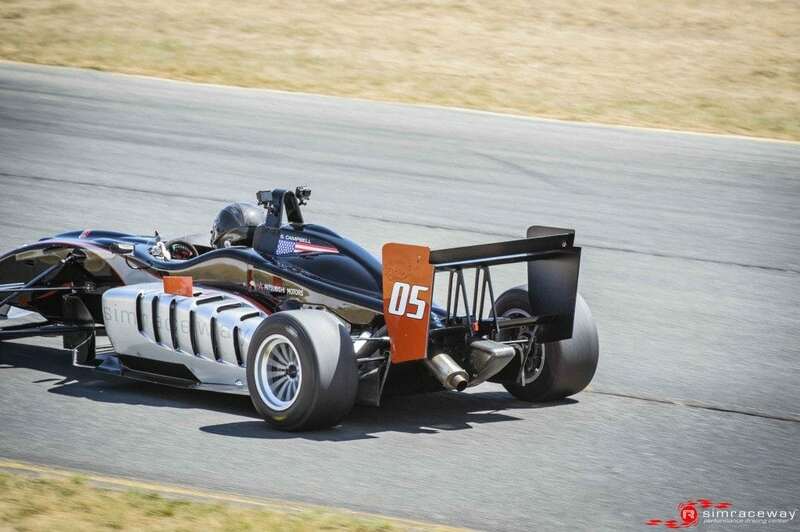 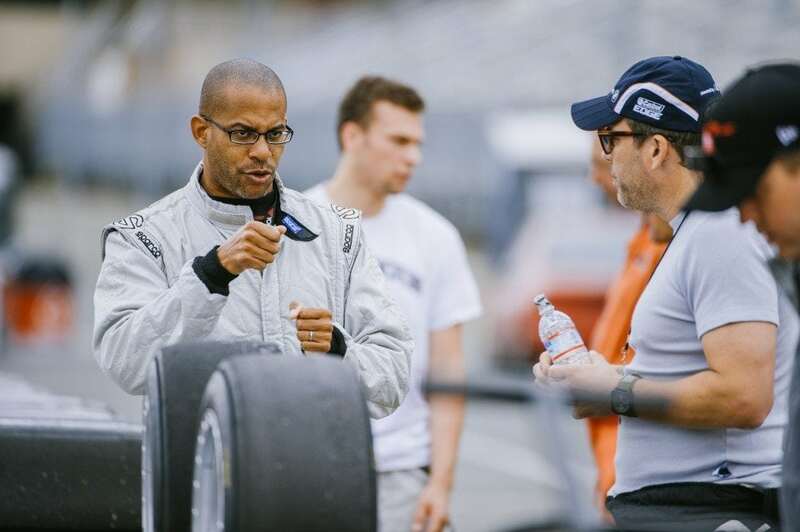 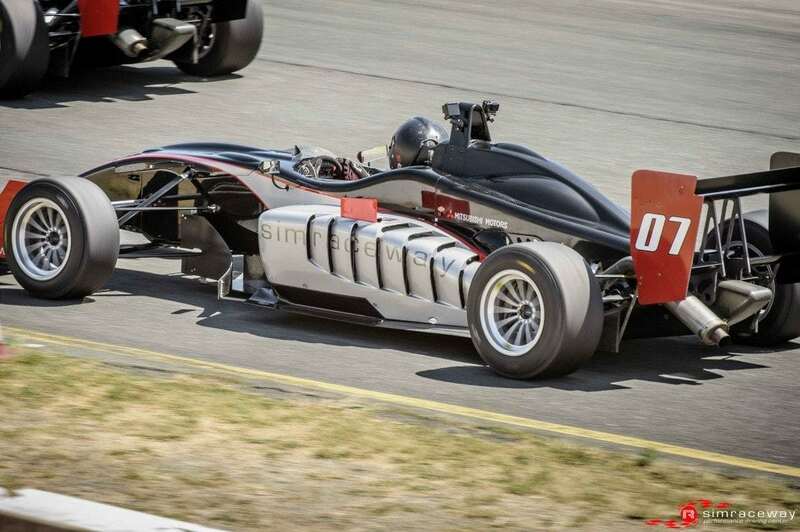 A little something old and new greeted Race 7 of the Jim Russell F3 Race Series as a new group of racers were enticed to sample the best damn series on the west coast. 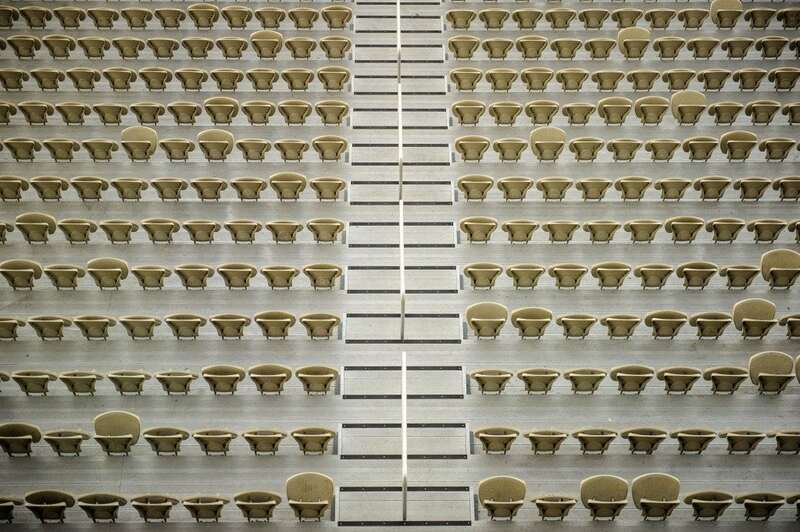 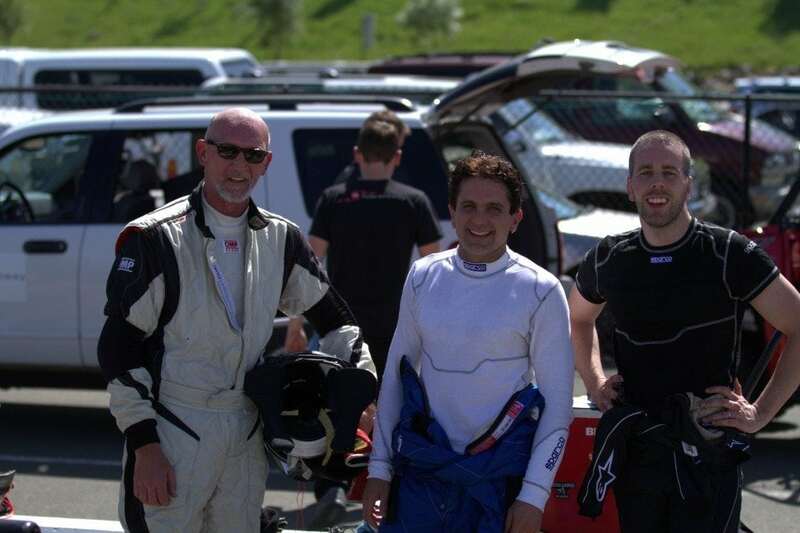 After an intense training session the day before everyone was raring to go for Saturday’s race. 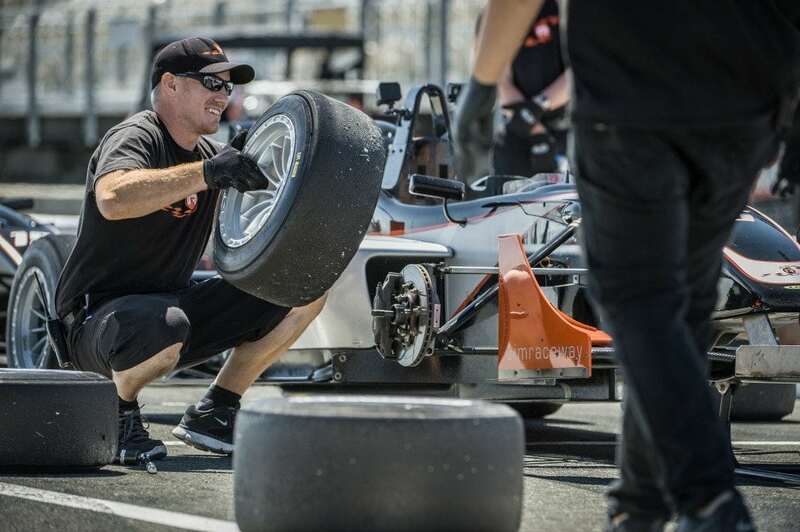 Cooler temperatures than we’ve seen of late saw Chase Murray back on pole with a dip into the 1.38’s followed by fellow front runner Doug Tuttle hoping to get some points on the table after being taken out of the running last race weekend. 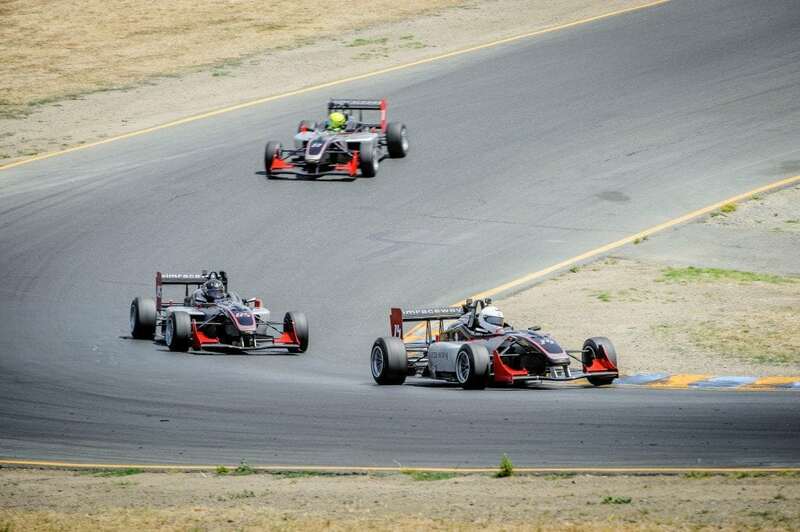 Lining up 3rd & 4th was impressive newcomer John Schauerman alongside fellow series rookie John Jastremski. 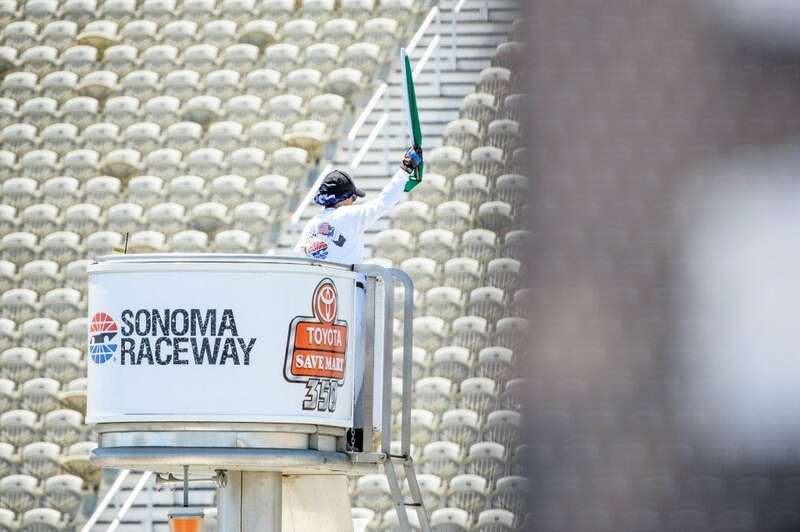 The green flag waved and the Texas flash Chase Murray dropped the hammer to solidify his 1st spot, shooting up to turn 2 with mighty speed. 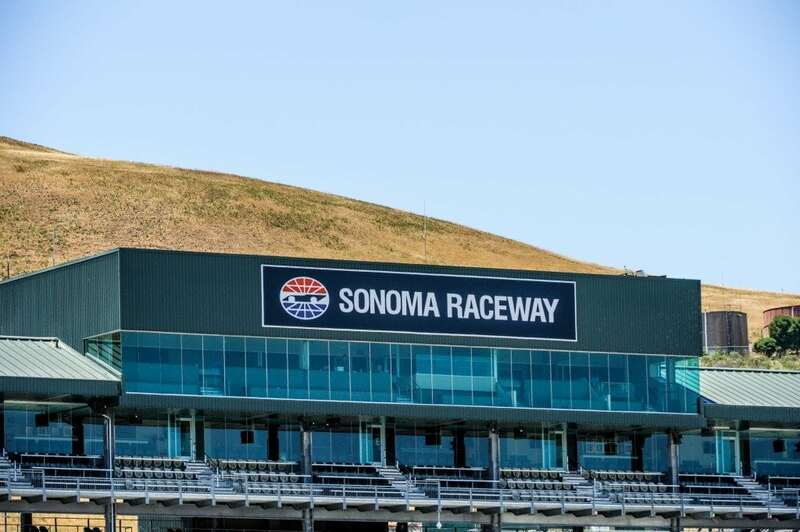 Tuttle doing the same in 2nd as the wily veteran made use of his race start experience at Sonoma to pull clear of the tentative green horns. 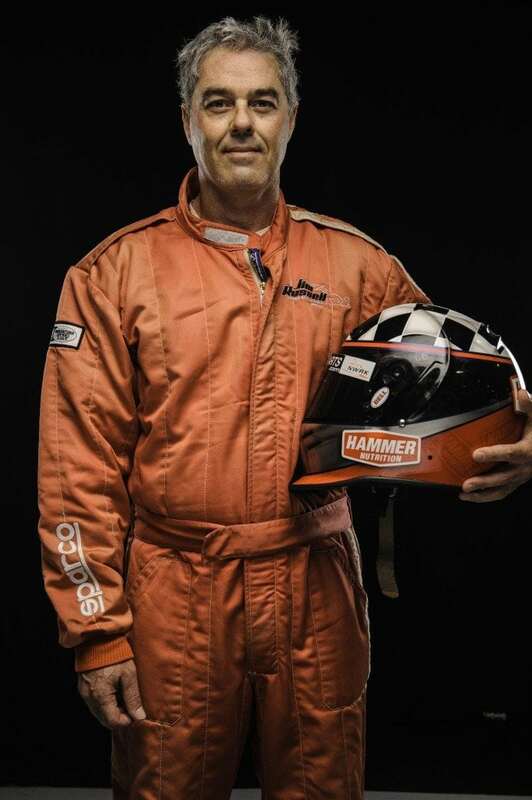 Also having a rocket start was Steve Campbell coming all the way from 6th to 3rd. 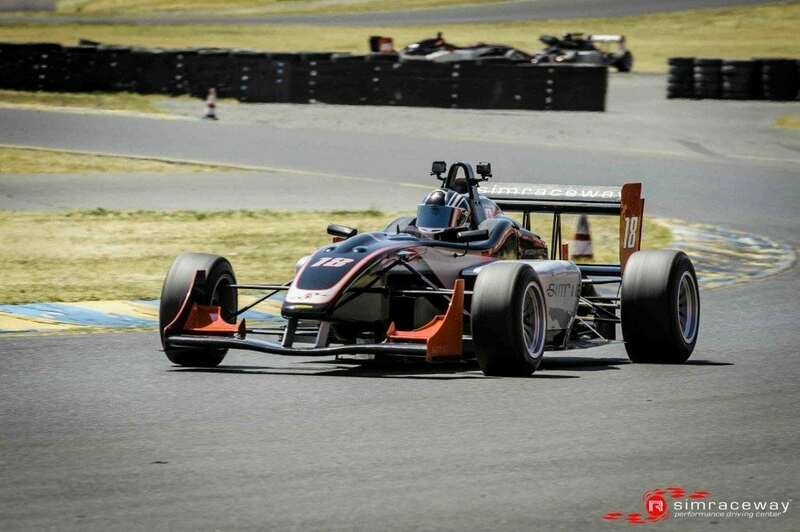 Everyone settled in the first few laps but then the battles started to rage, John Schauerman determined to make back his P3 spot started to ramp it up and had a great battle with Jastremski finally making it by and setting off after Campbell. 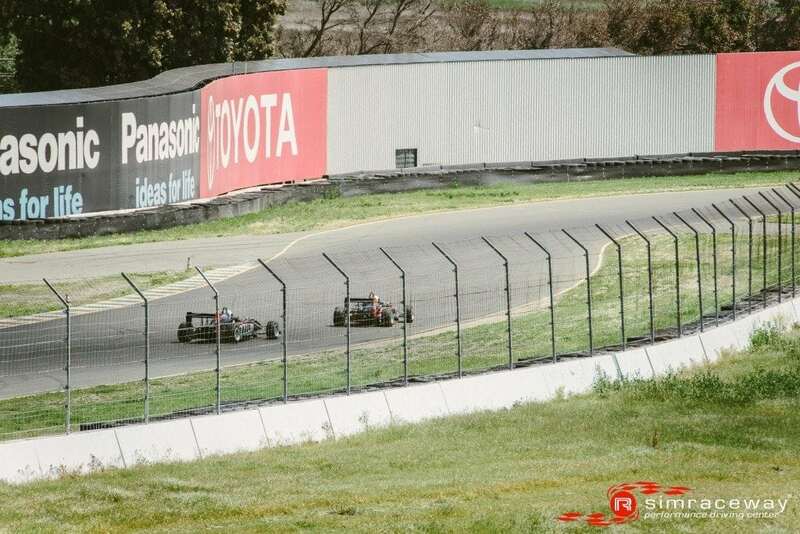 But catching and passing is a whole different discipline as lap after lap he tried to solve the puzzle that was Steve Campbell at turn 7, always getting a great run but no matter how early he made the inside move Campbell was already there. 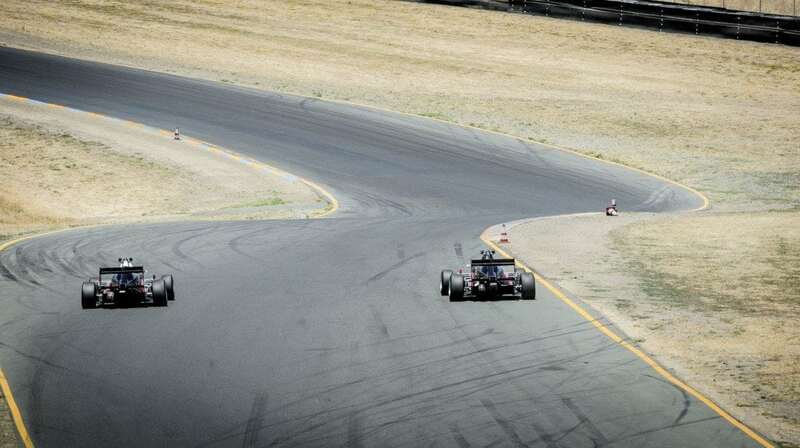 Finally in a daring move he popped to the left and ran the long way around the outside and kept just enough momentum to keep ahead into the esses. 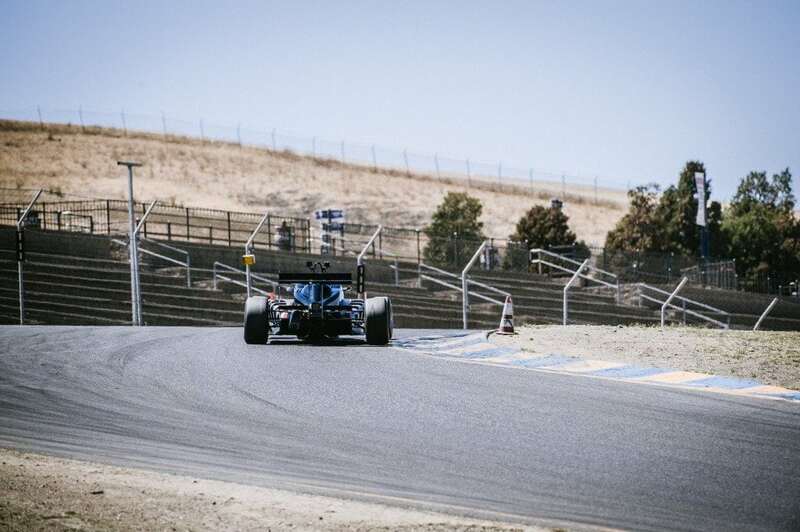 Campbell was not giving in lightly and tried to brake super late into the 9 chicane, which didn’t pay off as a brief saunter onto the grass landed him into the clutches of the next pack of Jastremski, Catchot and hard charging Roy Block. 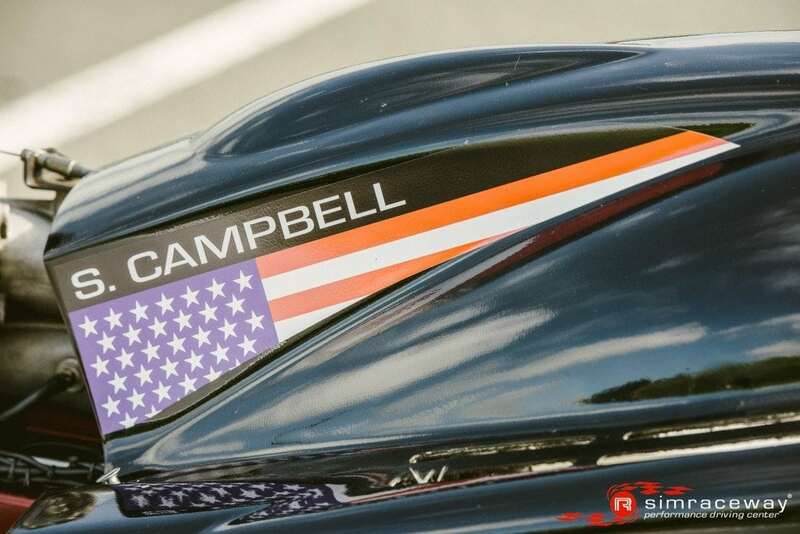 Campbell now struggling to find his early pace wasn’t able to hold off Jastremski and Catchot could smell another spot but perhaps took his eye off the ball and lost it out of 7 spinning to a stop and falling down the order to 7th before getting back underway. 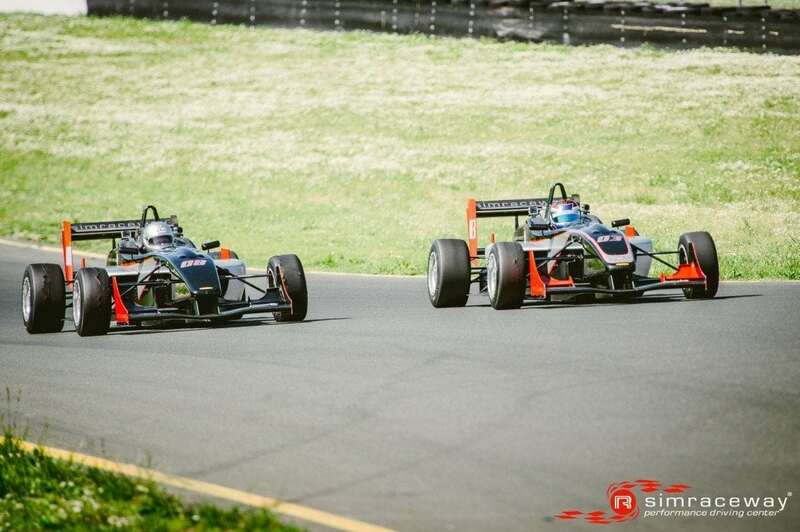 Next it was Blocks turn to have a go at Steve, but he wasn’t having any of it and was relentless with his defense, but in another not uncommon sight during this season Roy got inside on the last corner to beat Campbell to the finish line in 5th place. 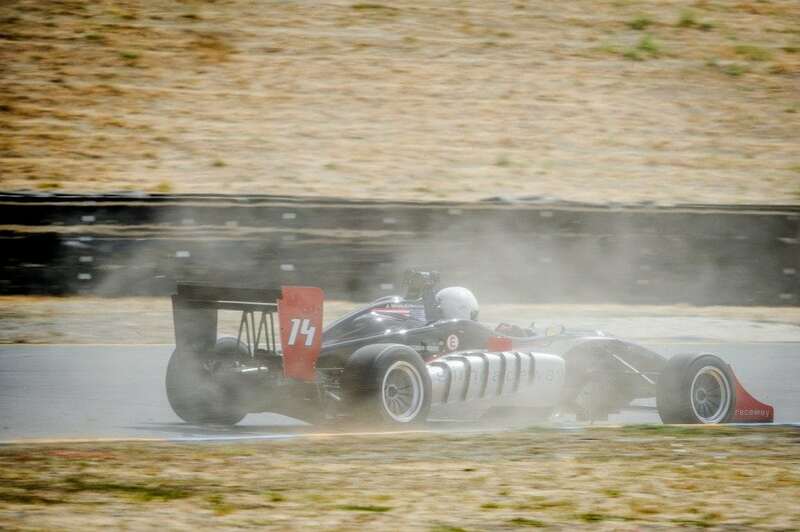 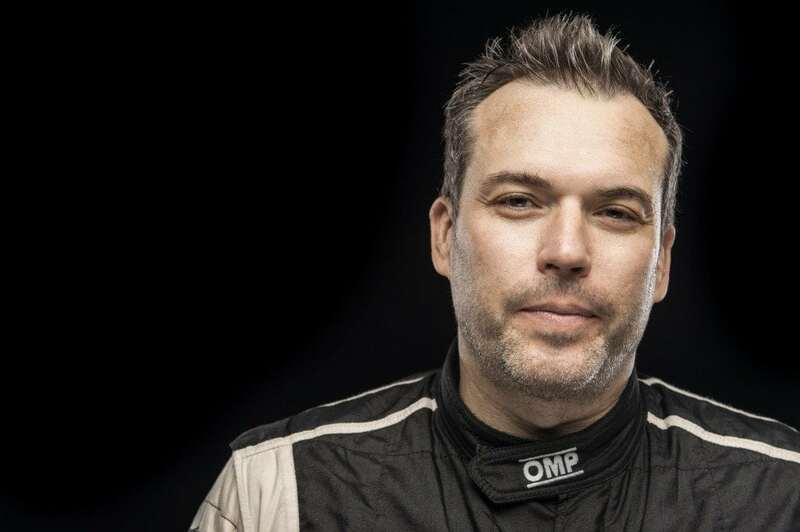 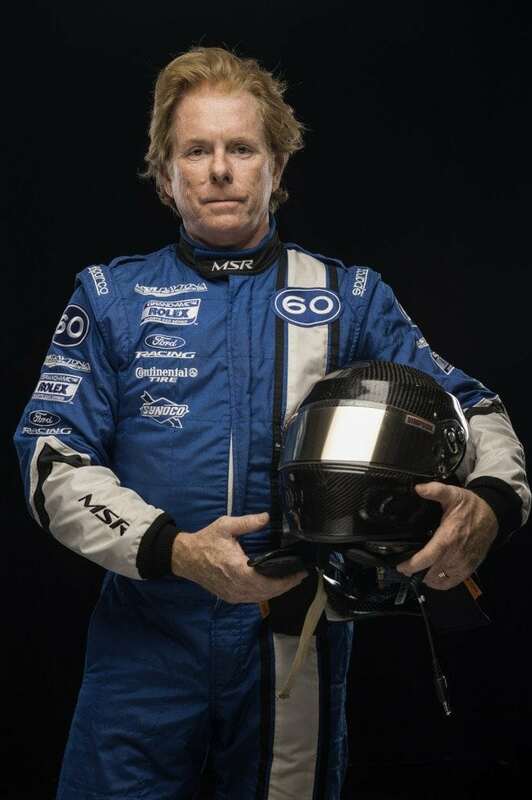 An early spin for Dan Lochner saw him recover to 8th and ever improving Walter Kuhn coming home 9th after a mid-race stop and go for an off-course excursion. 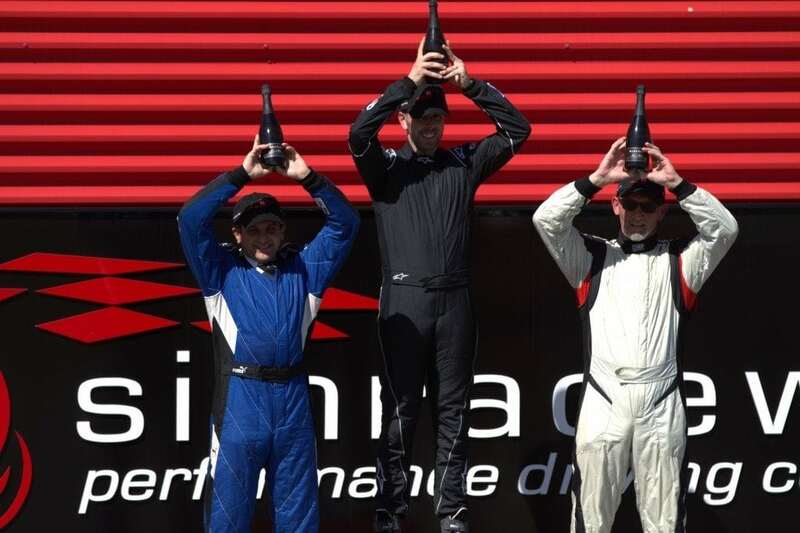 It may have been a lonely race for Chase and Doug but it didn’t make the champagne taste any less sweet as the podium saw the Mumm Pink (in commemoration of the “Pink for Papa” celebration at the Silverstone’s 50th GP celebration of recently deceased John Button, father to Jenson) raised above their heads, and the impressive John Schauerman filling out the last podium spot and the last Pirelli hat very nicely. 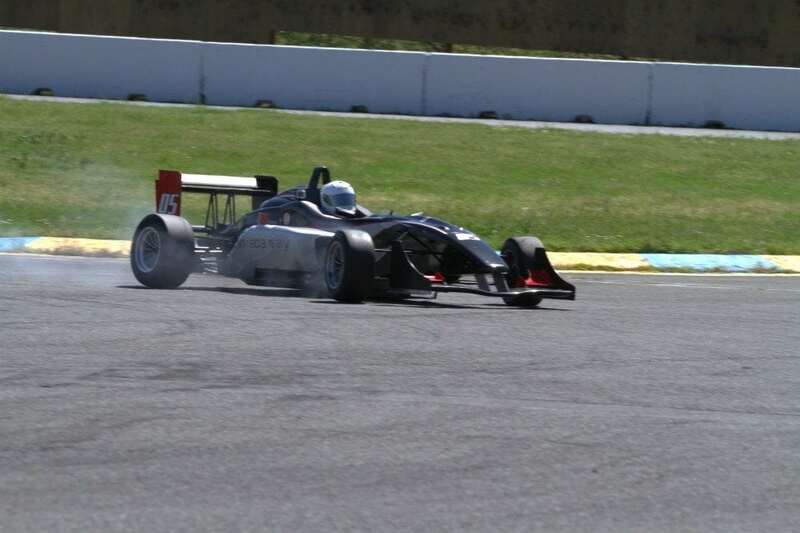 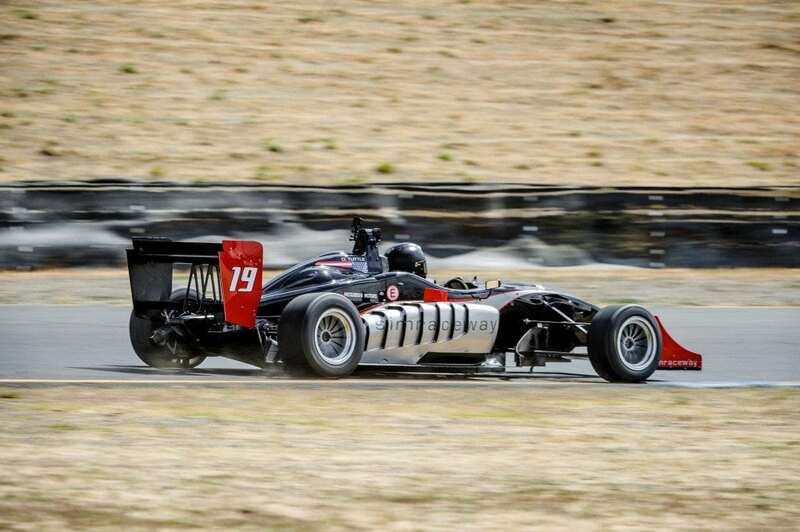 To say race 8 of the Jim Russell F3 racing series was exciting may be an understatement, so let’s go with barnstormer! 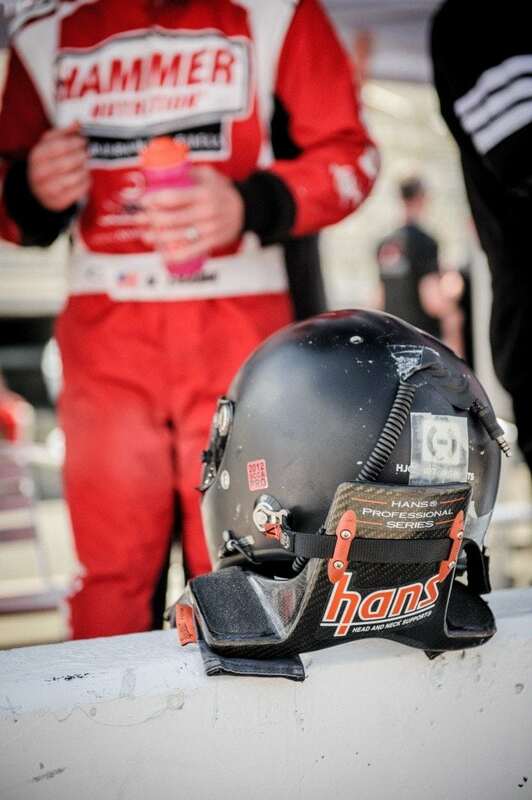 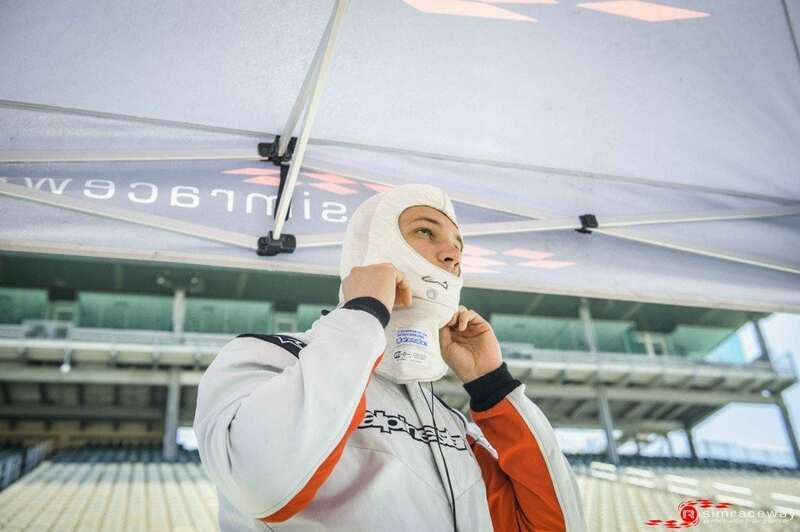 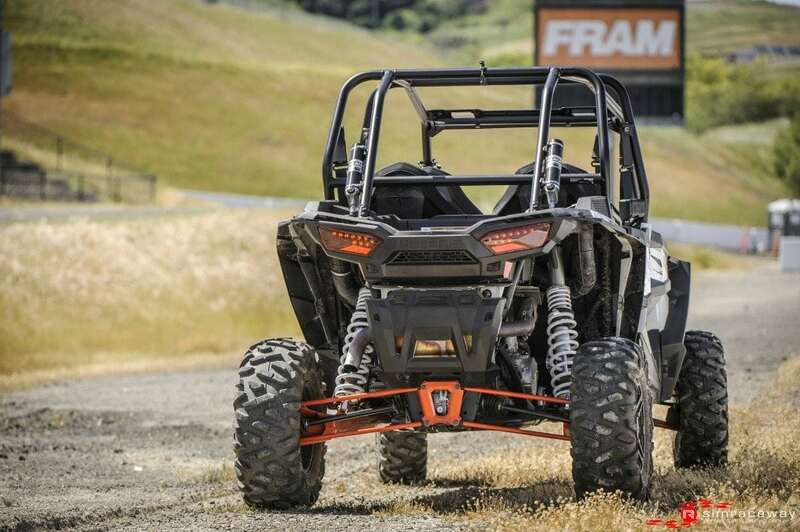 In fact the buzz was high before the race as an extremely tight qualifying had everyone ready for an action packed event. 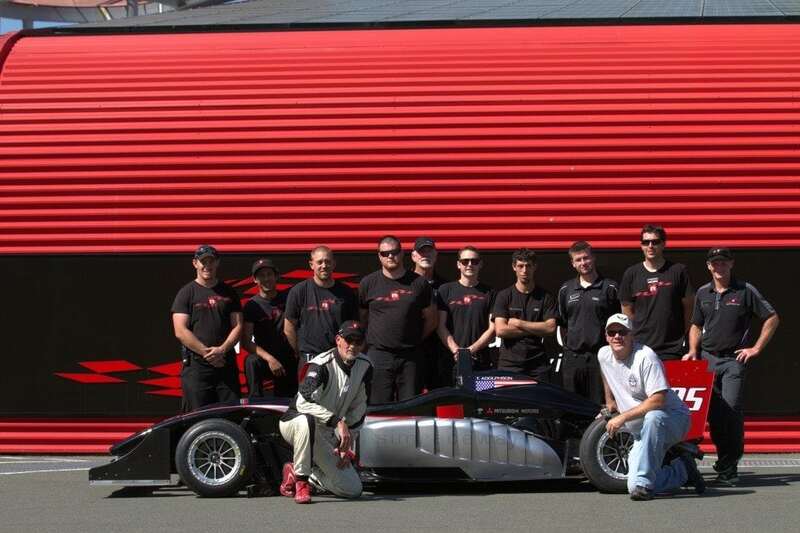 On the front row were Doug “Ninja” Tuttle in P1 with race debutant and Hammer Nutrition guru Brian Frank alongside. 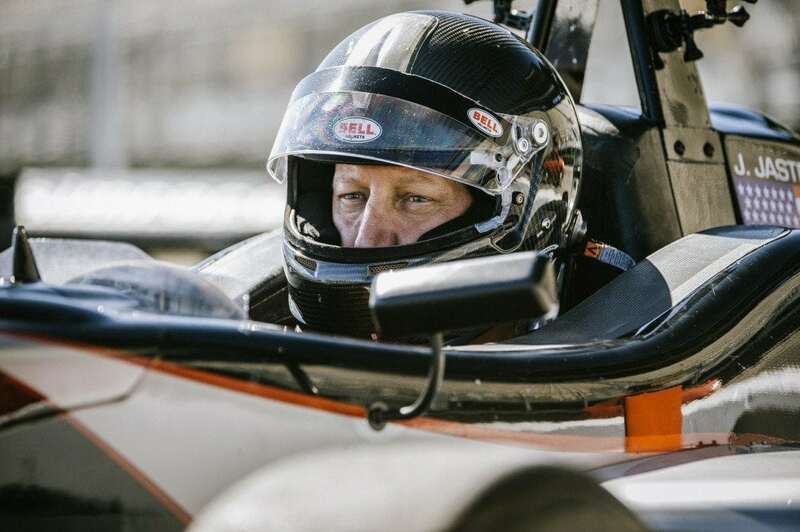 Both drivers traded fast lap in Quali with Tuttle the victor in the end, row 2 saw Mark Schiller back in action with Jim Catchot next in line, followed by, Schauerman, Lochner, Irwin, Block & a much improved Walter Kuhn. 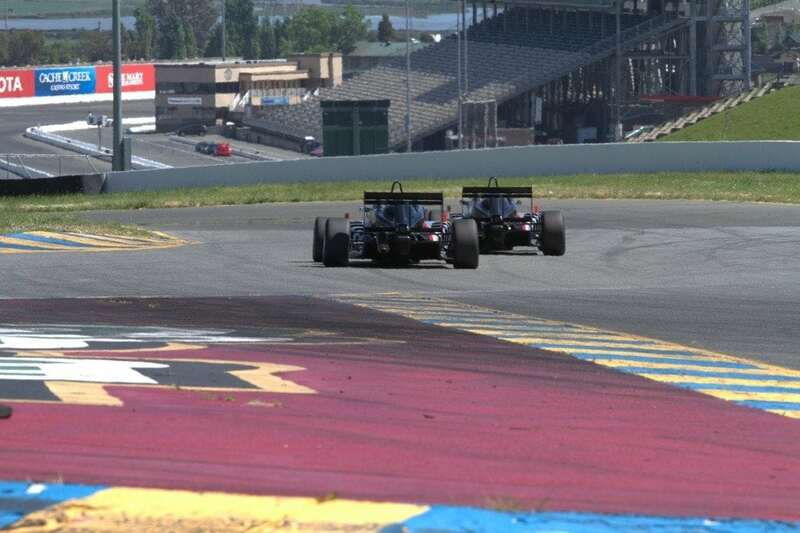 The race start was clean but very soon the battles started to emerge all the way through the field as Tuttle & Frank made a break away, then next was Catchot, Schiller and Dan Lochner with an impressive turn of pace. 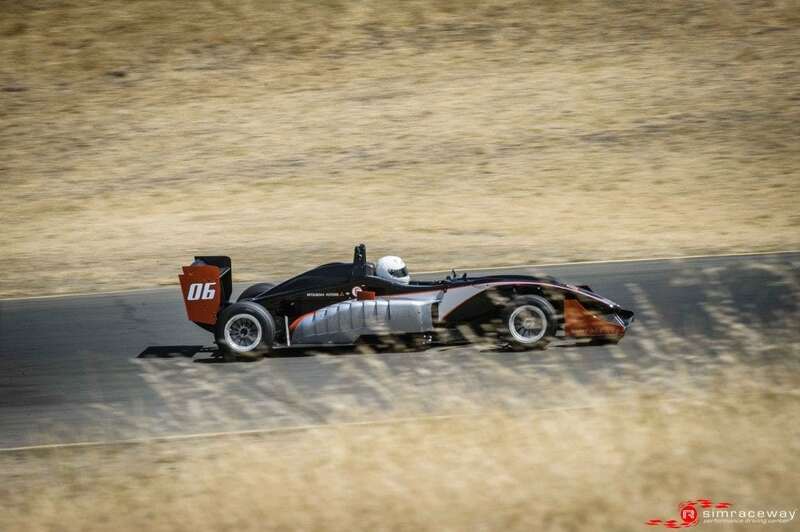 Our third battle was perhaps the most exciting as Schauerman, Block, Kuhn & Irwin staged an almighty war with side by side action throughout the early laps even including the perilous Sonoma esses! 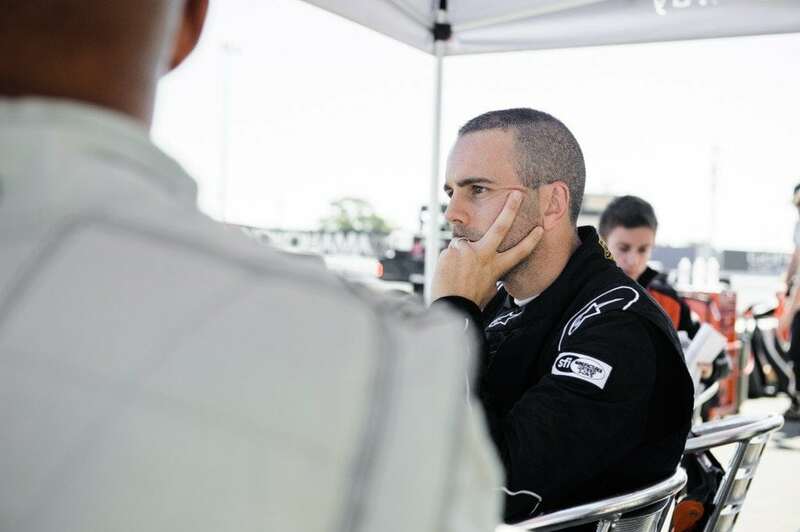 Brian Frank made the first pass for the lead on lap 3 as the two re-ignited their battle for supremacy from qualifying, but Tuttle was not done yet. 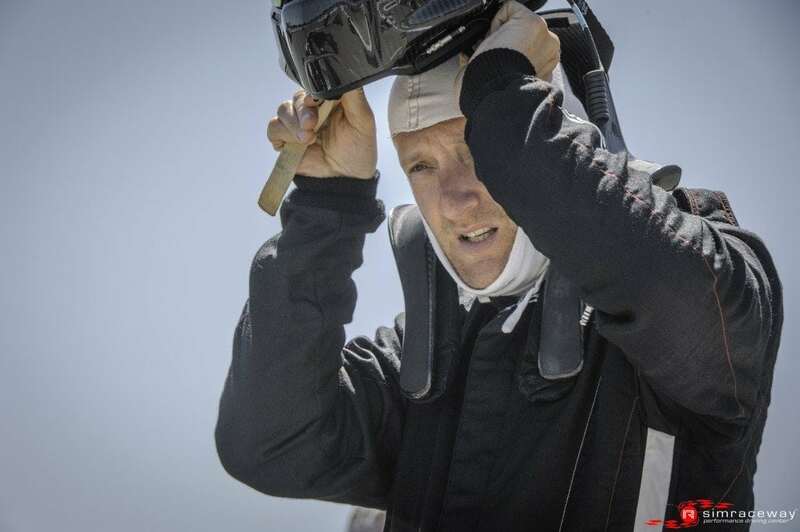 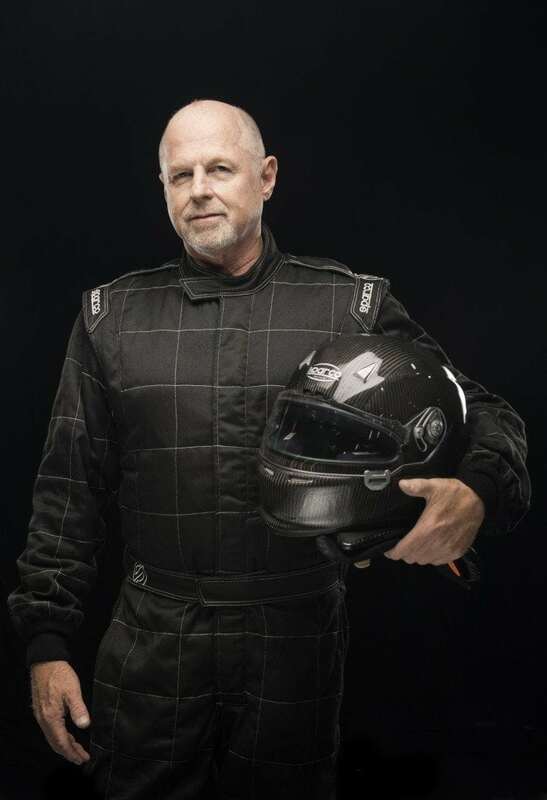 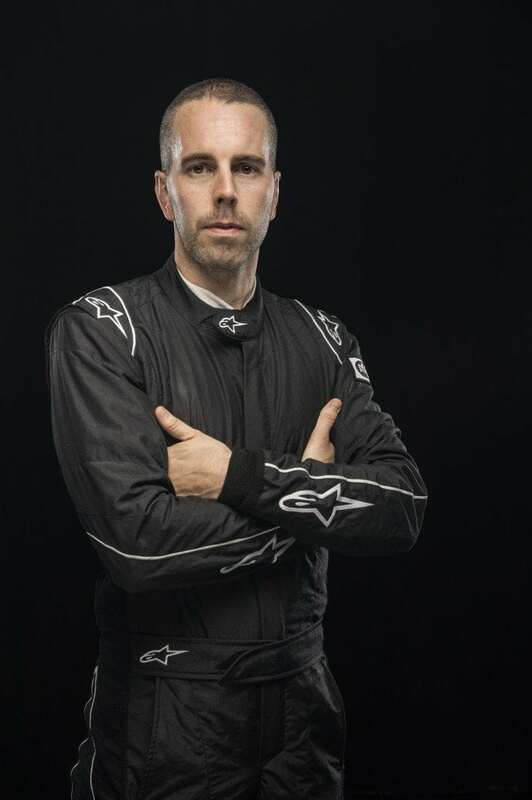 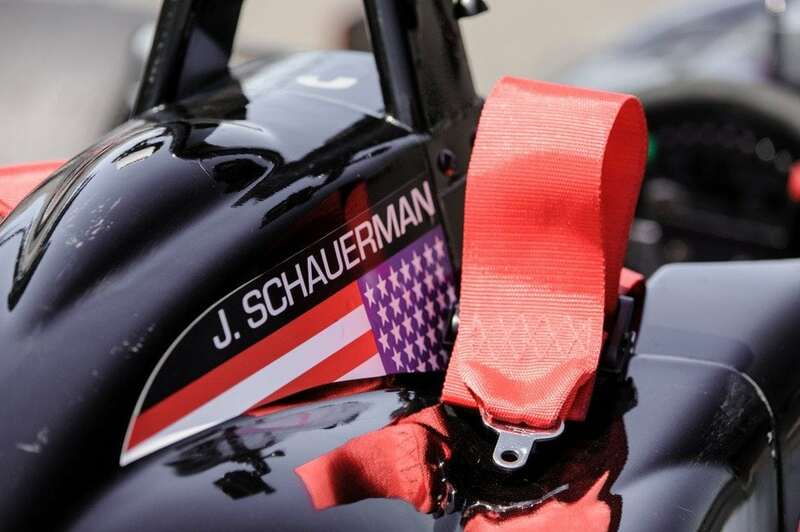 Further afield Race 7’s 3rd place finisher Schauerman(6th) started to make up for his slow start and began to pick up the pace and chase the intense 3-way battle for 3rd as an extremely entertaining fight still raged between Block, Kuhn & Irwin. 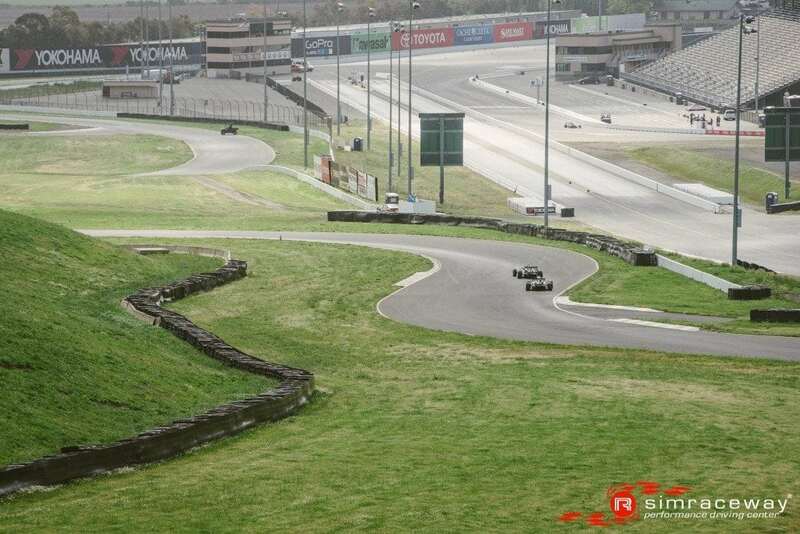 There was passing action at both ends of the track as turns 7 & 11 made for several examples of the classic pass / re-pass but lap 8 saw 2 major changes in the standing as Tuttle got back by Frank, both drivers seeming not to like the lead role and changing lines allowing the other to close back in. 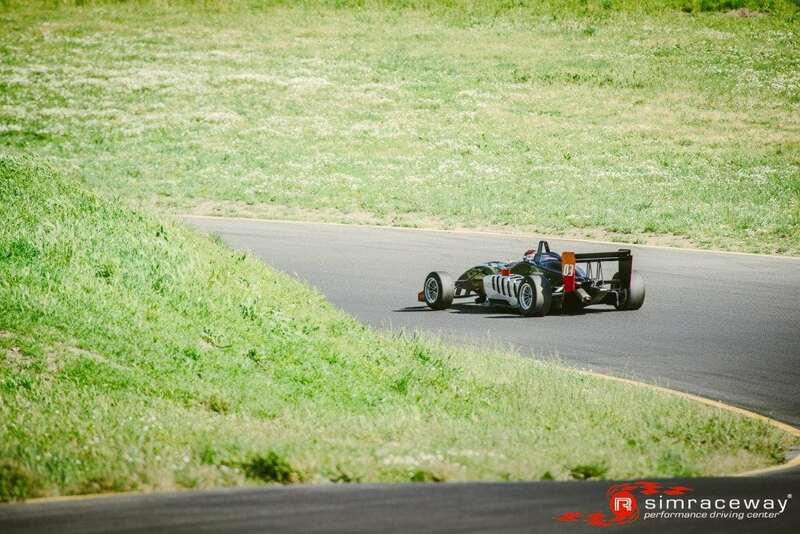 Schauerman was on the charge and got by Lochner on lap 8, & Schiller on lap 9 and set about chasing down that final podium spot held by the “nearly French” Jim Catchot. 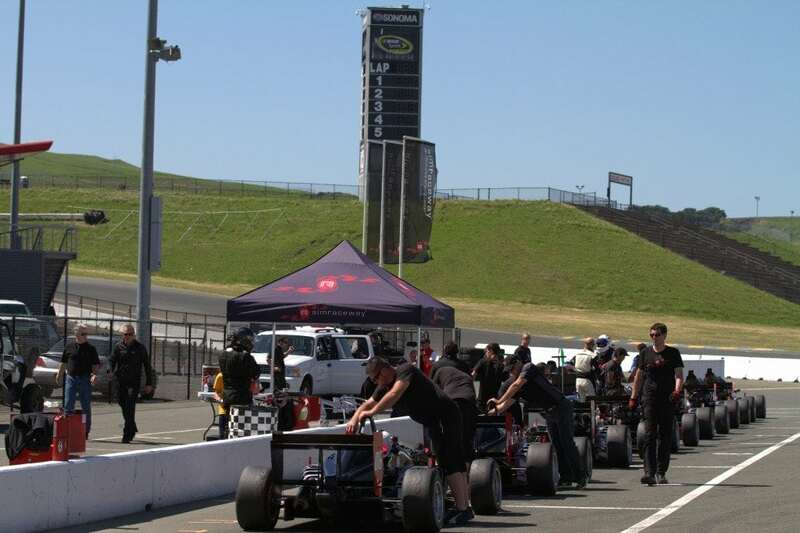 Lap 11 saw Frank sizing up Tuttle again as he made a setup in 11 and got the run past start finish to get inside through the daunting turn 1-2 complex , a great move that Tuttle in the end could not find an answer to as Brian had sized up Doug mid–race to not allow another move before the checker, although Tuttle kept him honest just inches off his gearbox. 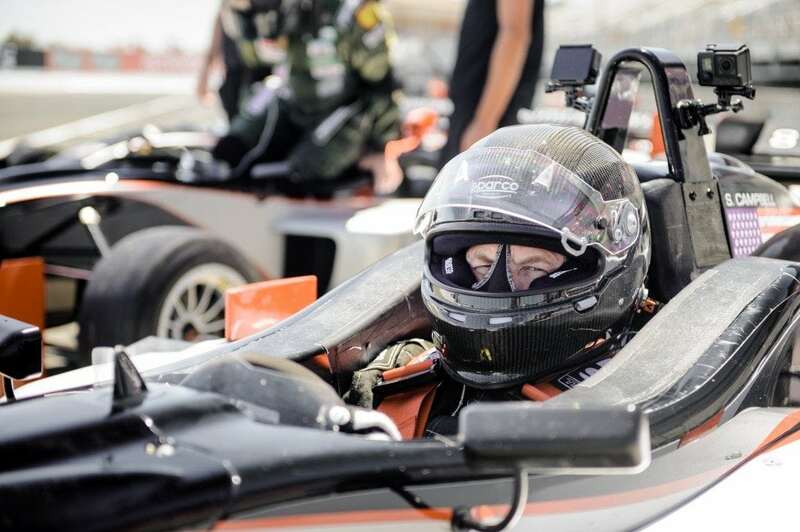 Also Dan Lochner set his fastest lap of the day while getting by Schiller for 5th. 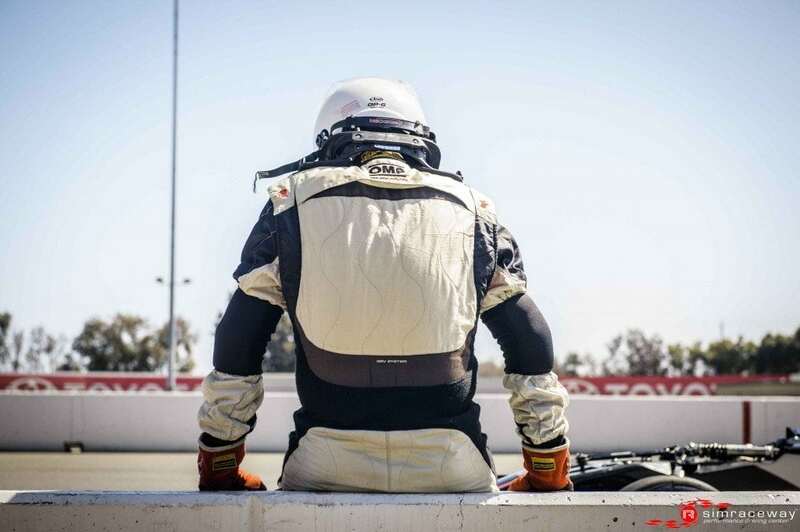 But the race was not over yet, not by a long way. 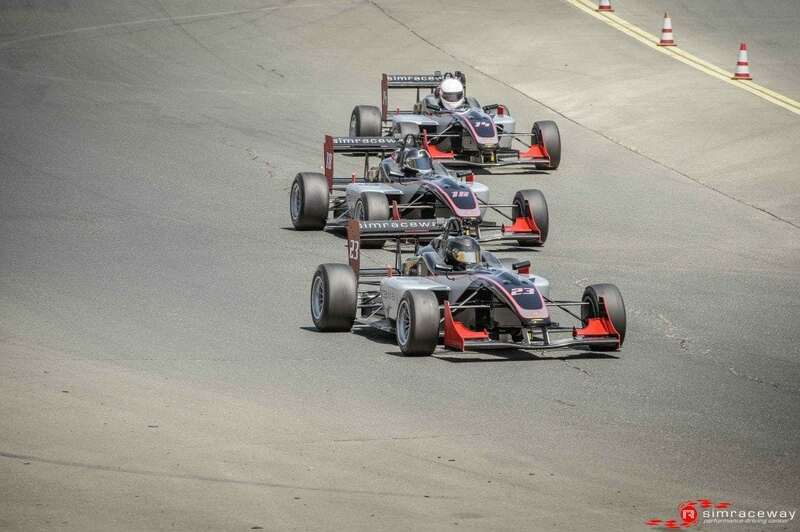 Schauerman still improving every lap ran down Catchot to claim 3rd spot, who made a mistake the following lap allowing Lochner & Schiller by. 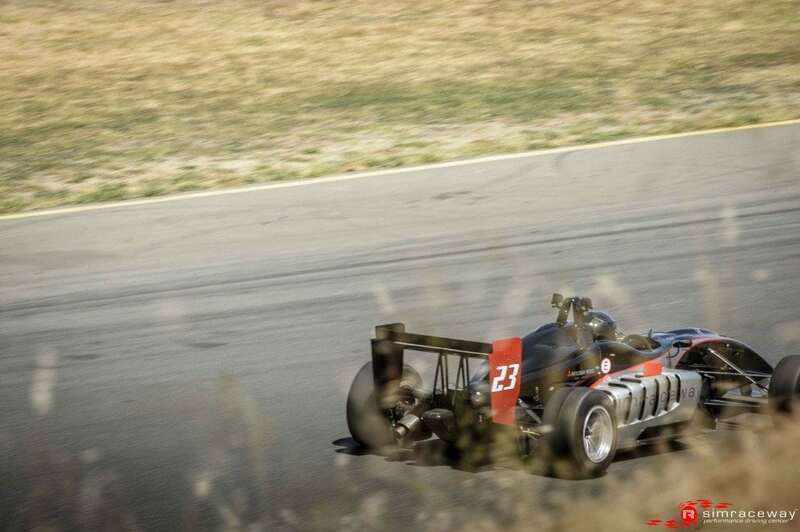 Sadly the much improved pace of Walter Kuhn was not to reap any rewards as Walter got it wrong exiting turn 3 clouting the wall and ending his day. 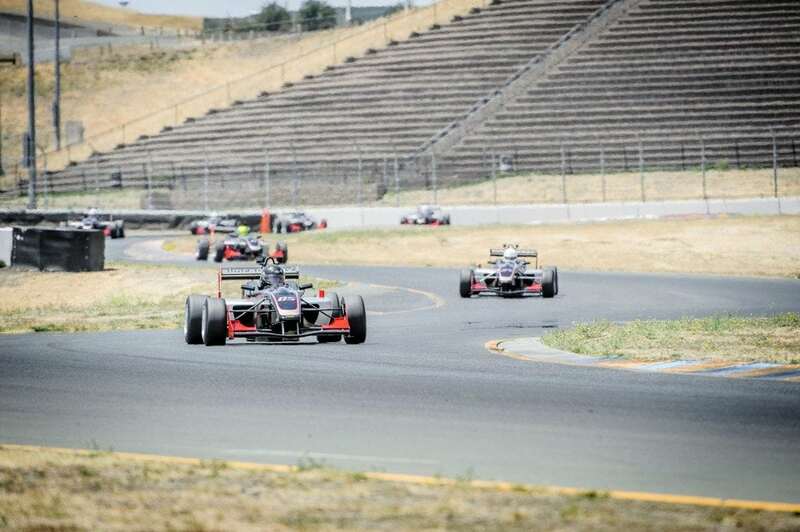 The yellow flag at turn 3 caught a few drivers napping and Lochner made up 3 secs on Schauerman to be able to put the pressure on into turn 9 for the last time, it nearly paid off as they were side by side on the exit, but John just managed to hold Dan off to hold the final podium spot. 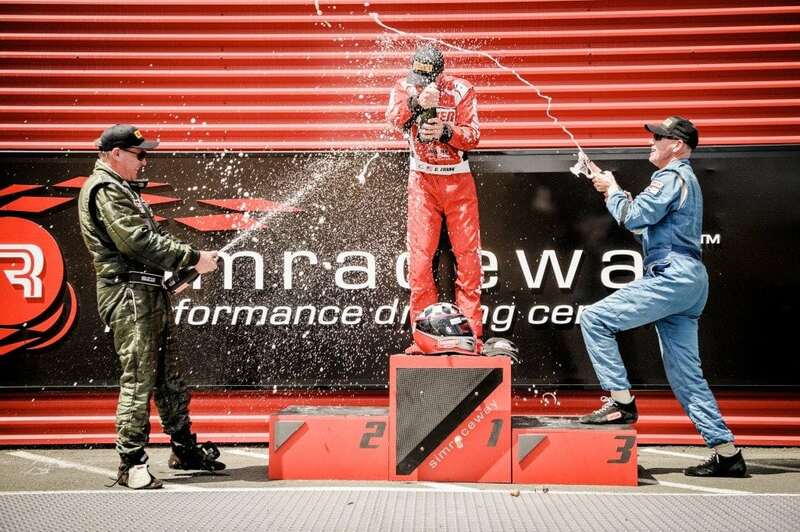 The pink Mumm champagne soaked all nearby as Brian Frank celebrated his victory in true style, a fantastic show by all. 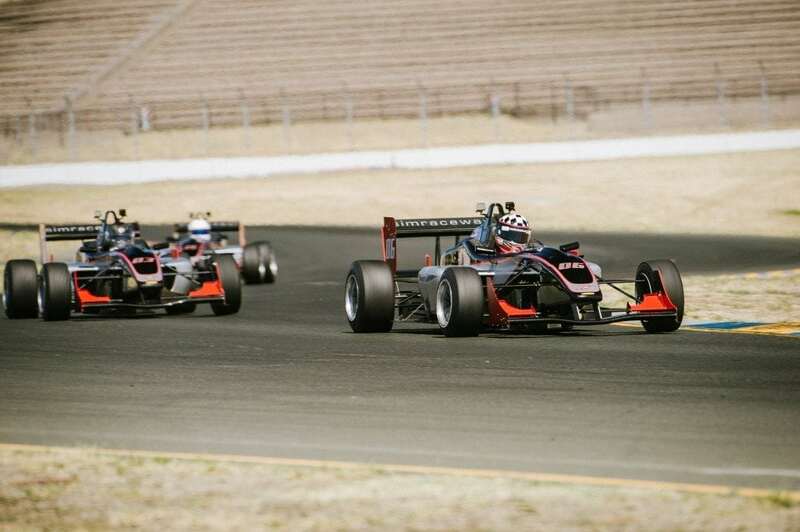 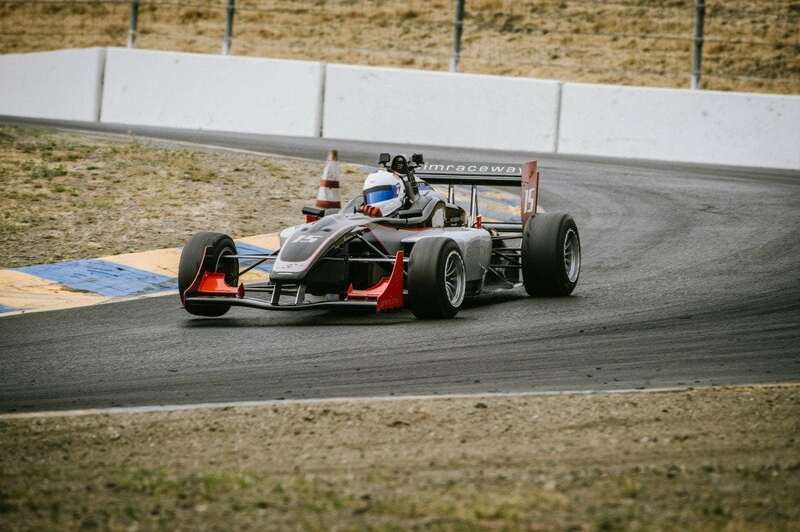 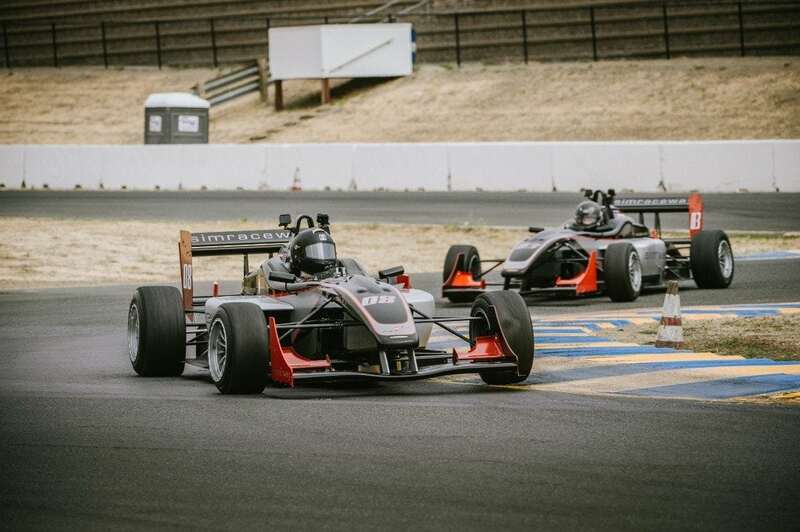 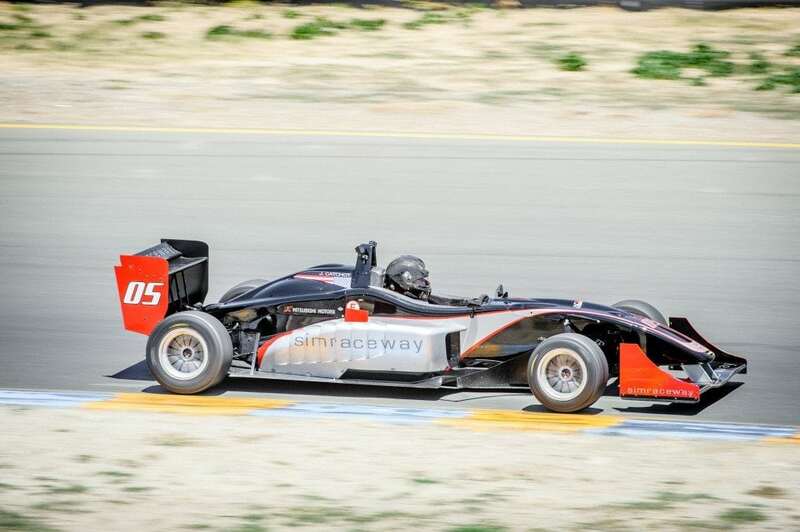 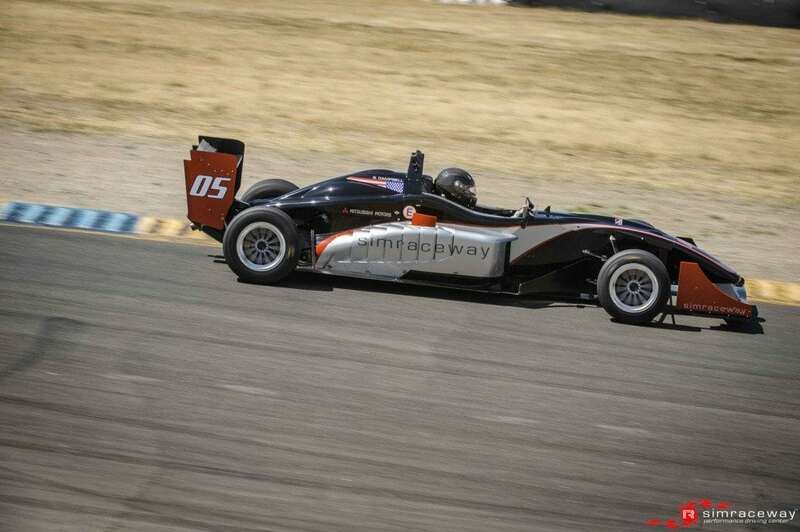 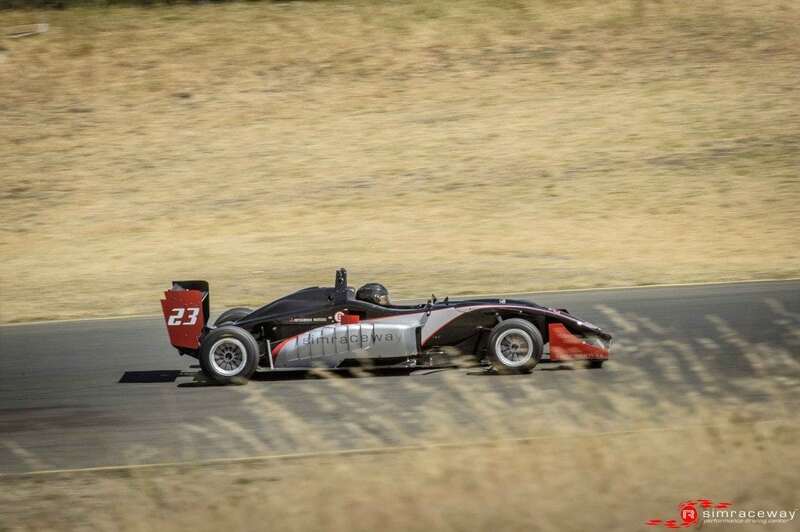 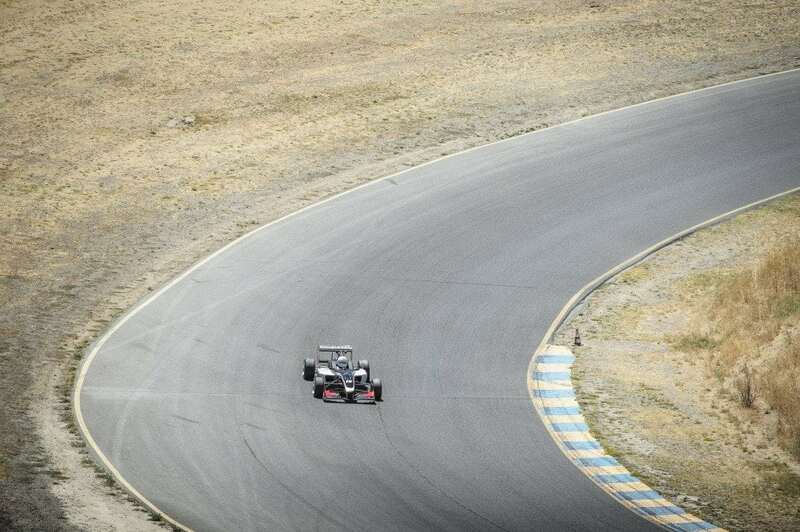 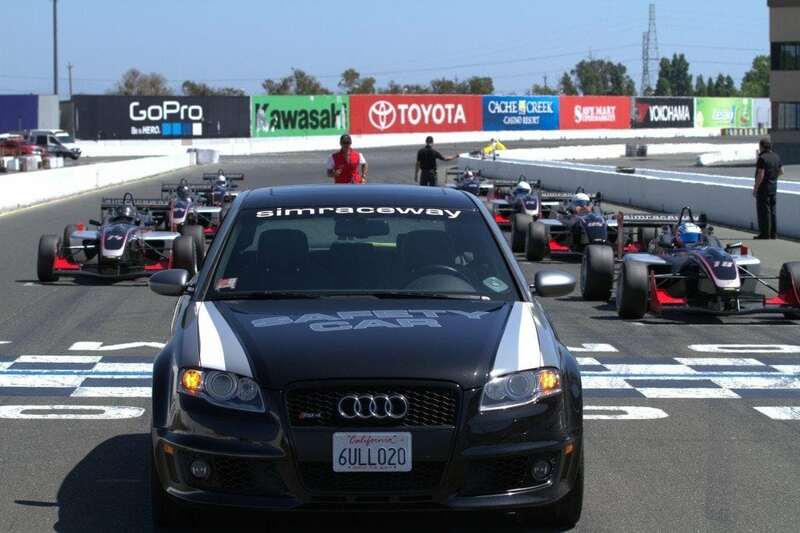 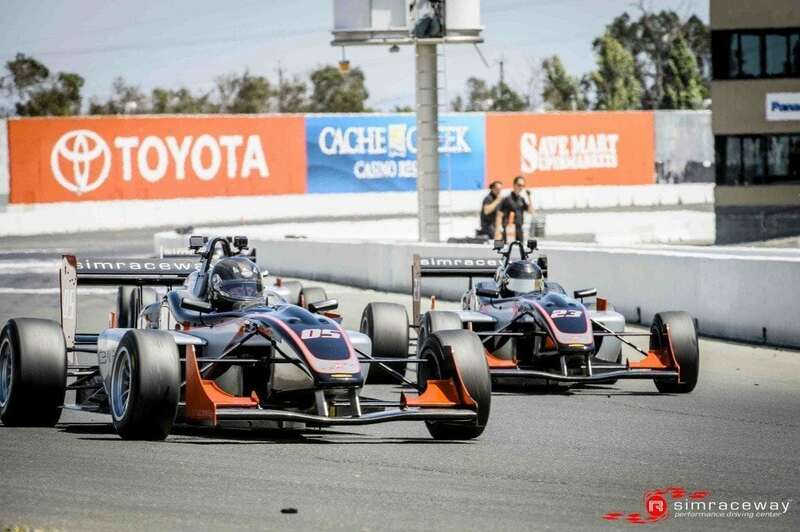 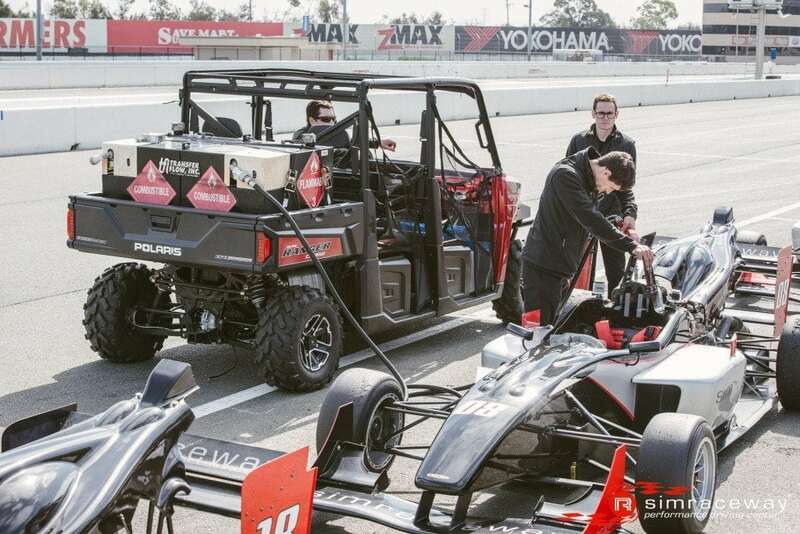 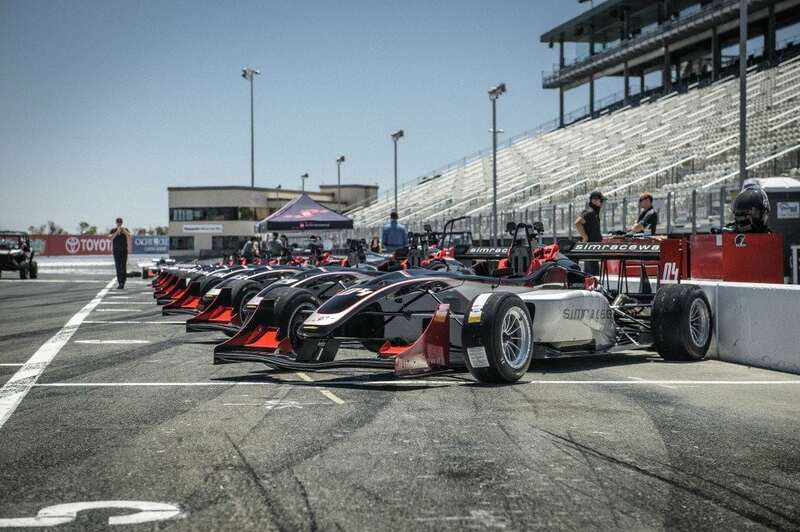 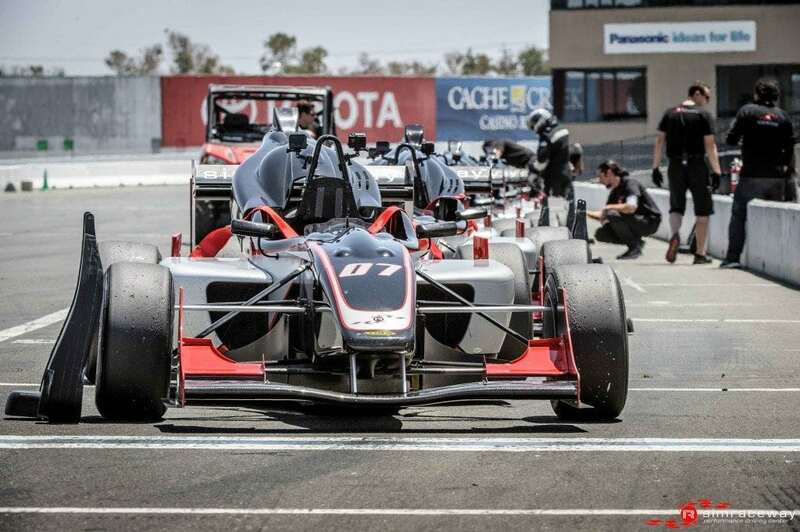 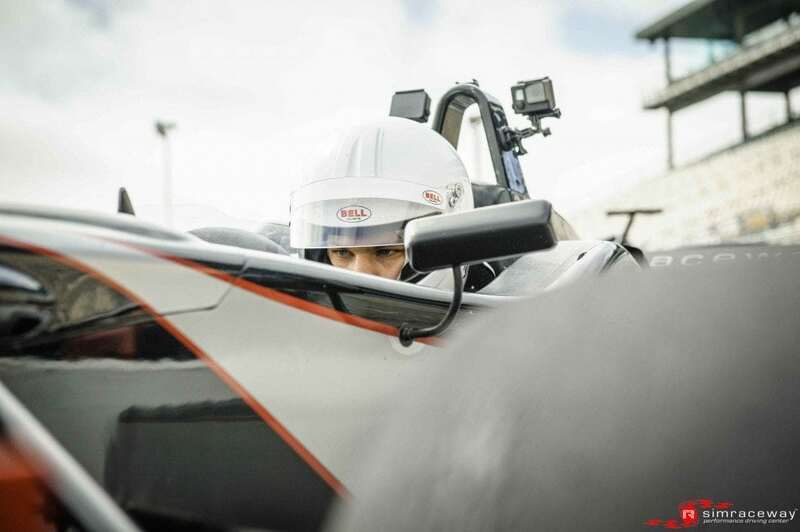 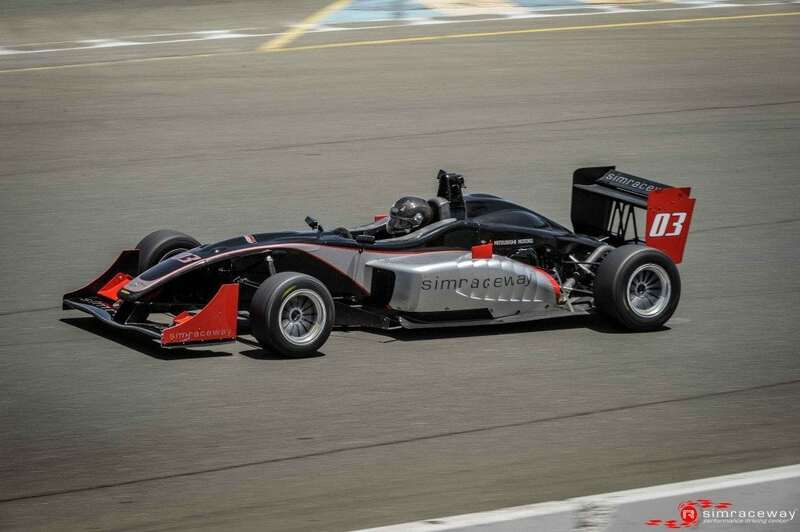 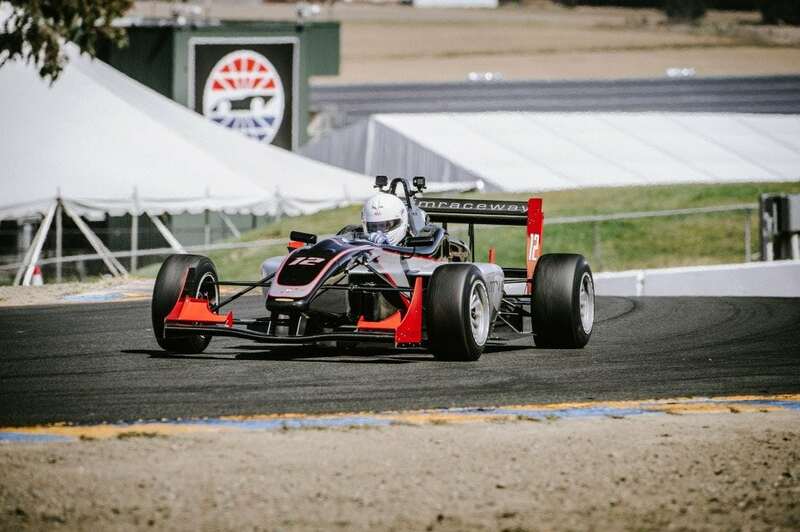 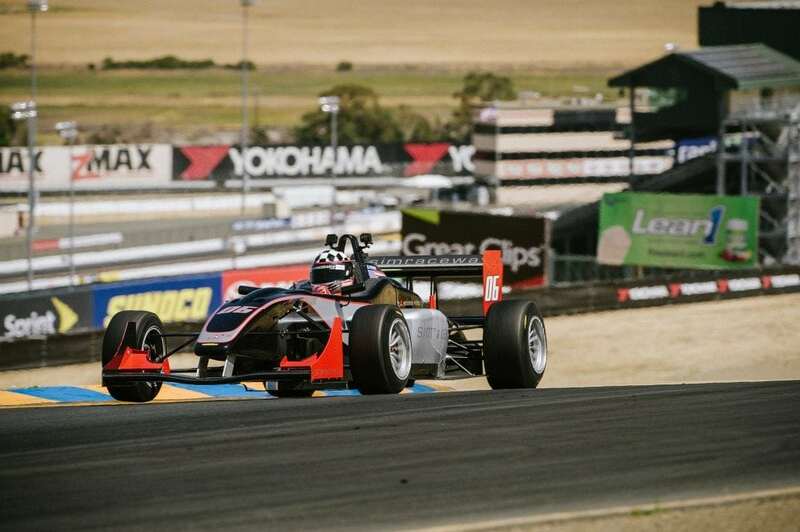 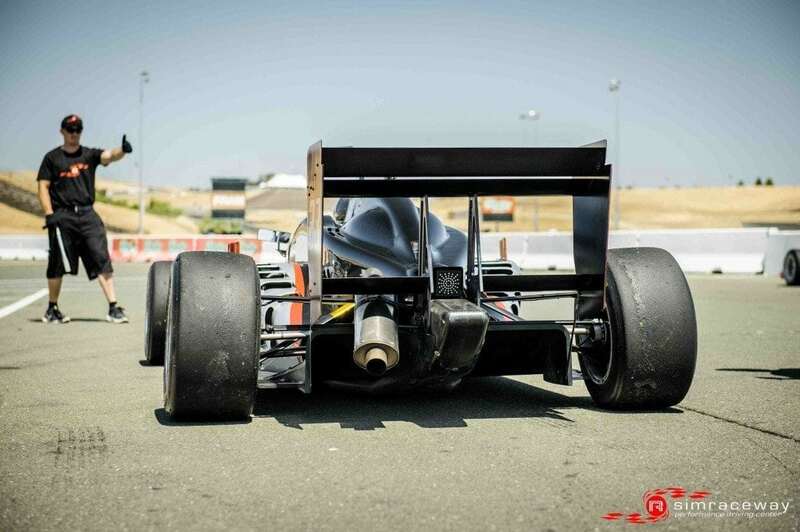 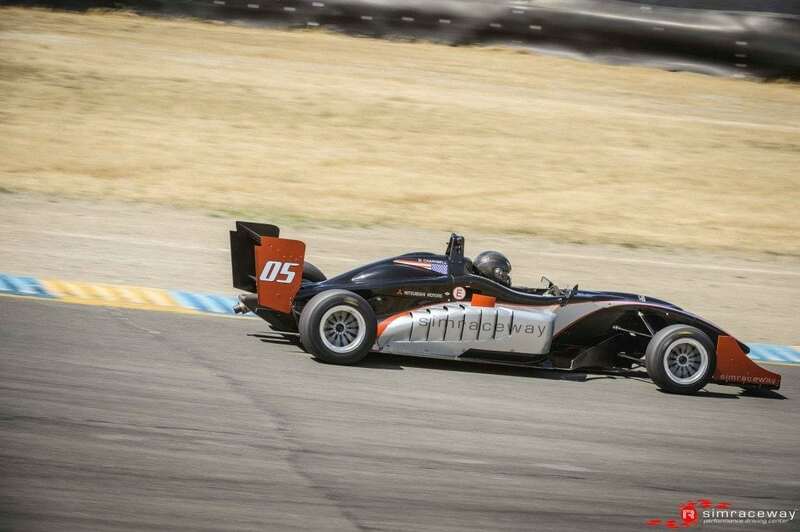 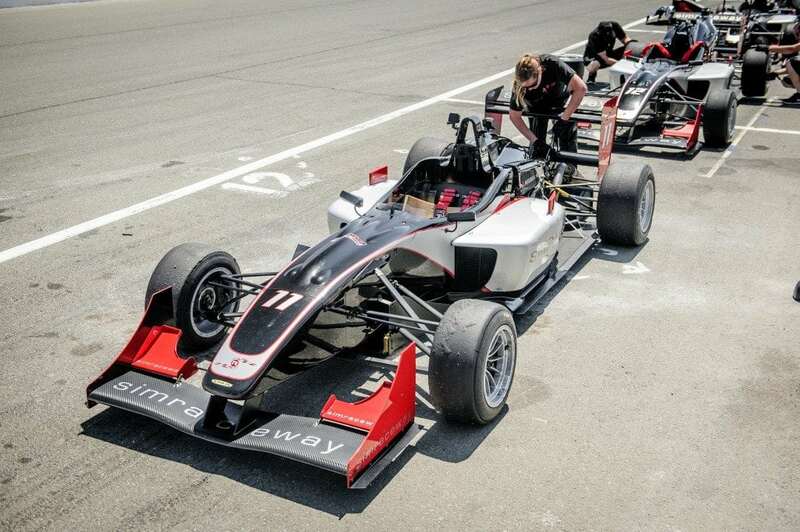 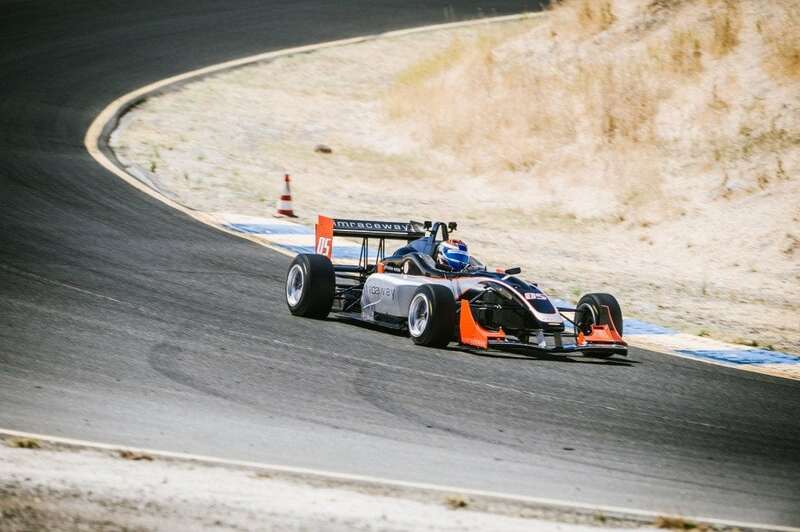 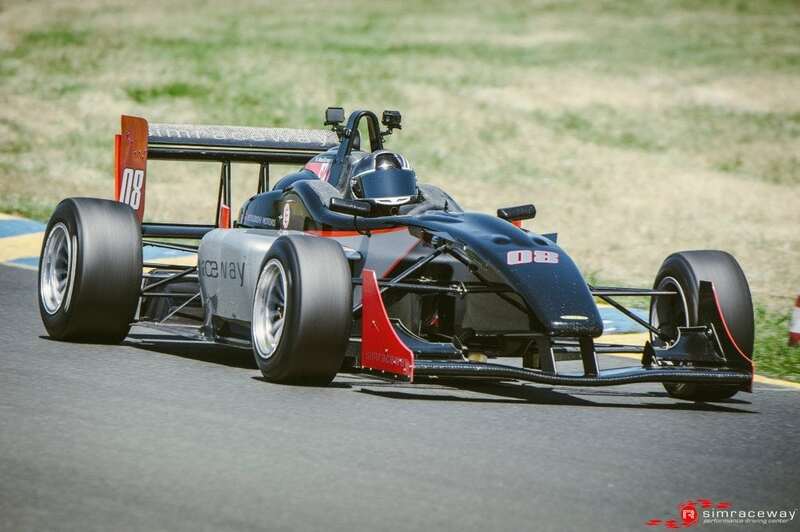 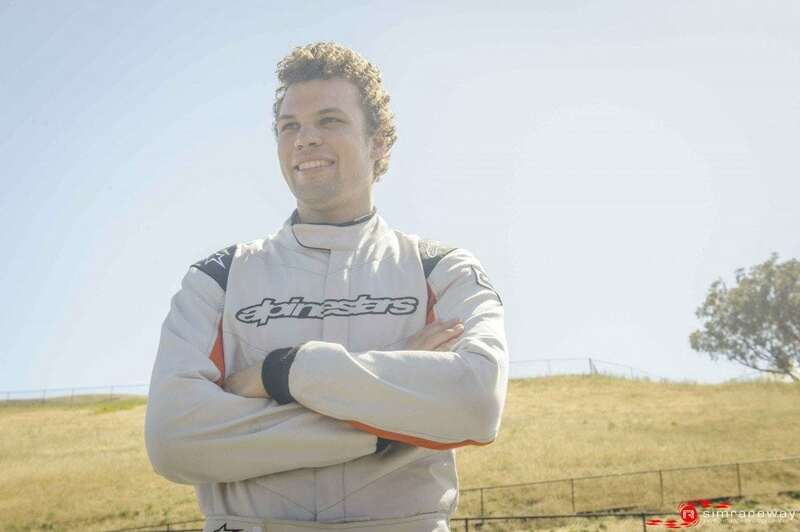 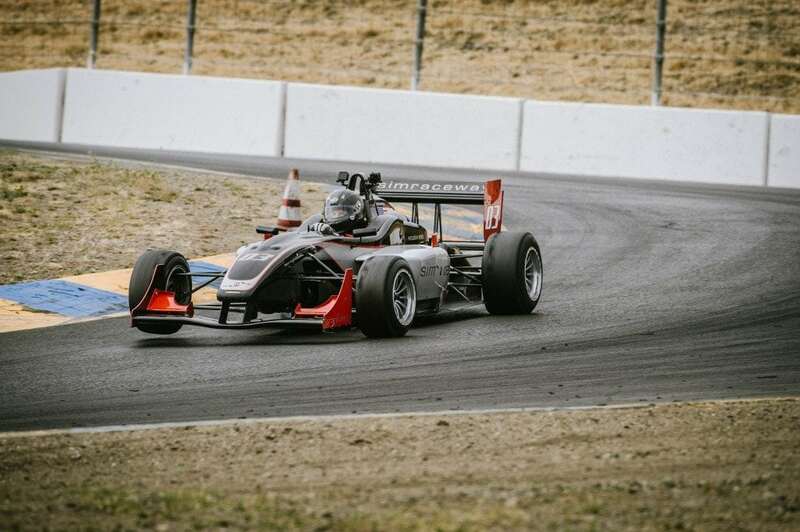 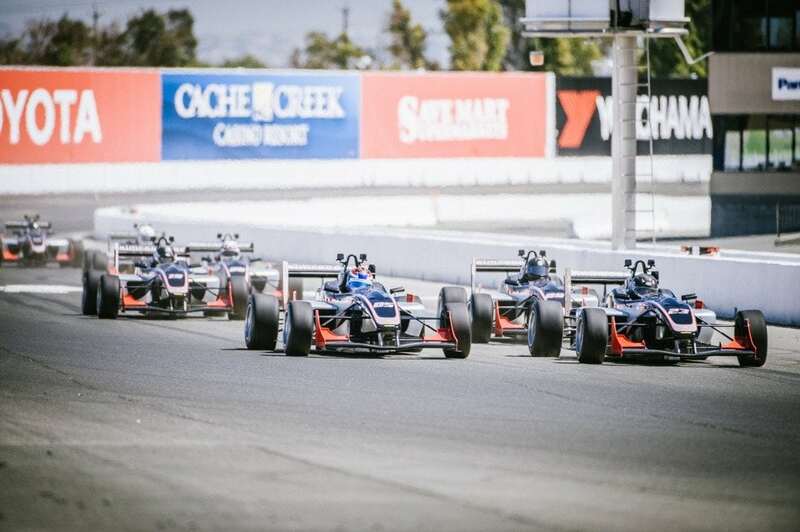 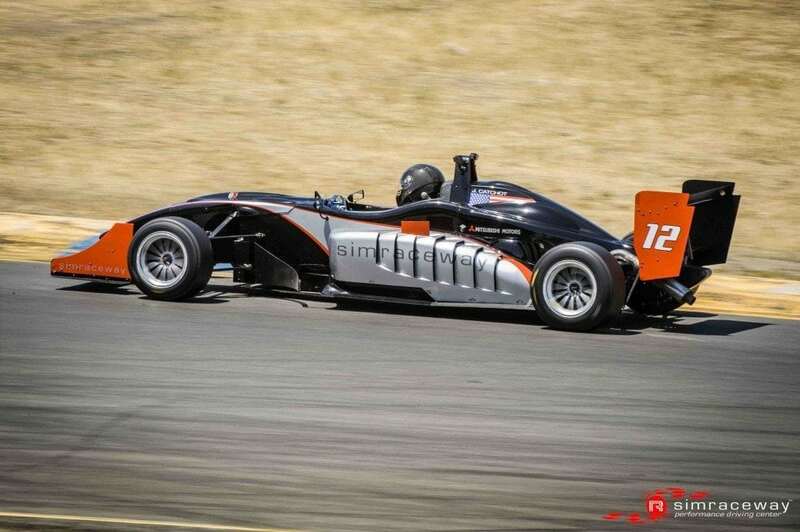 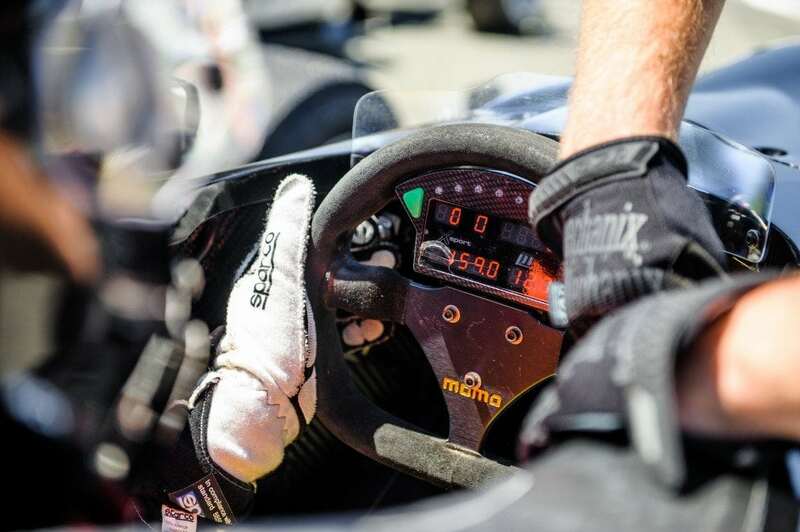 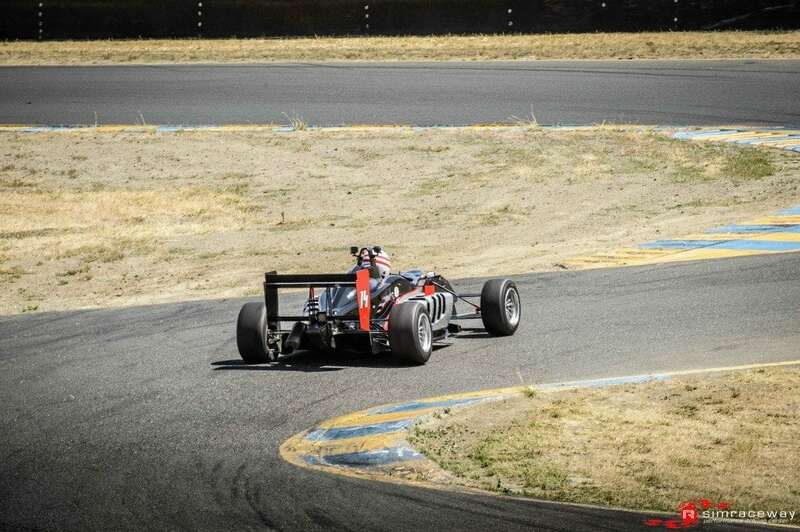 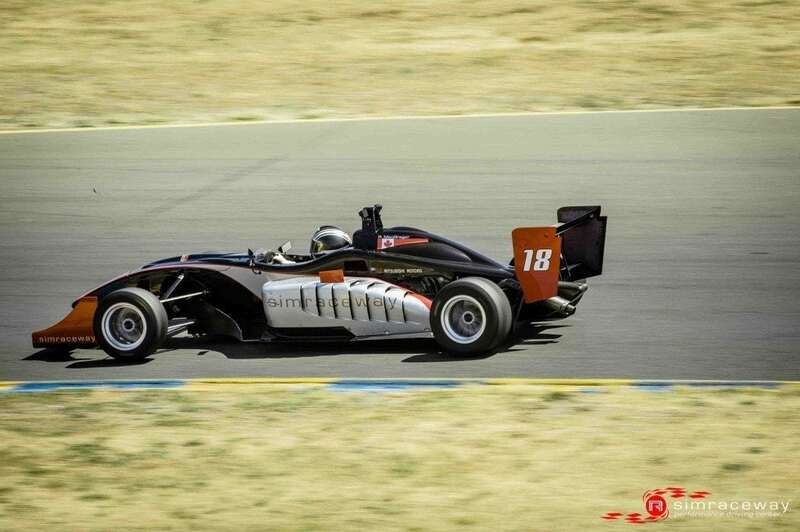 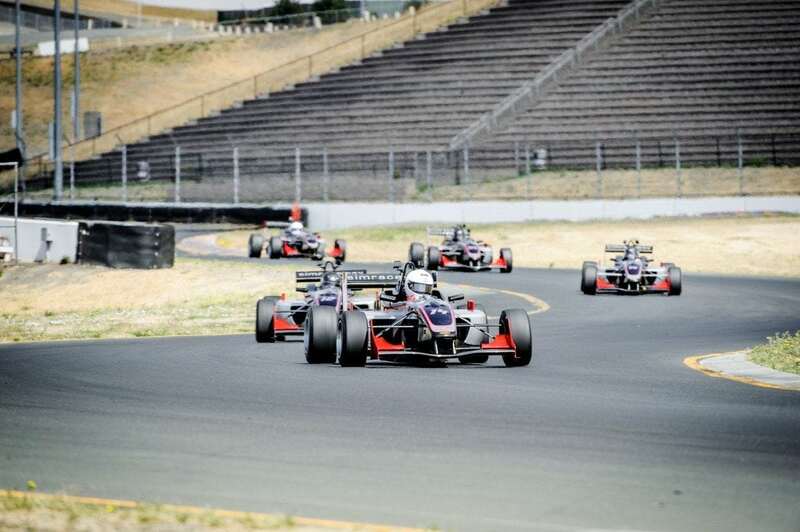 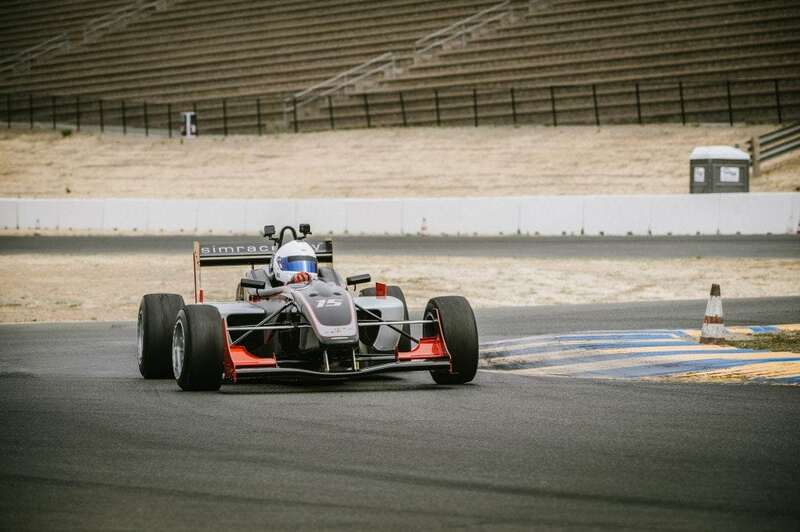 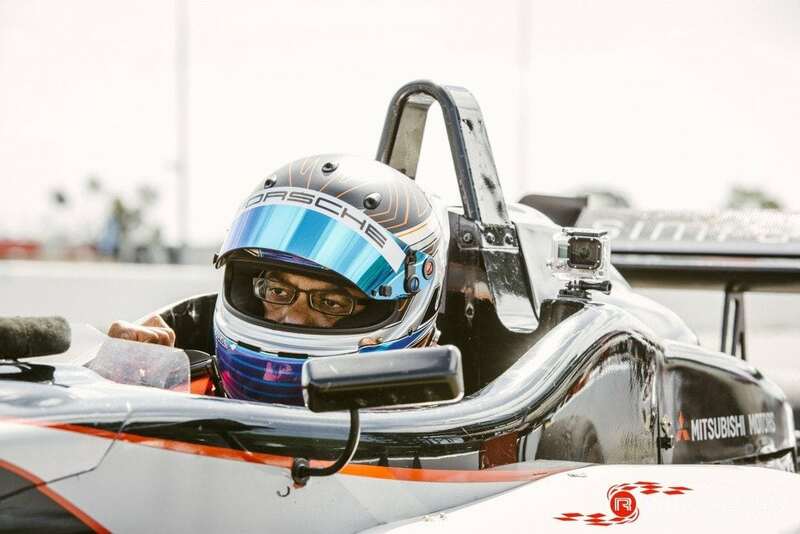 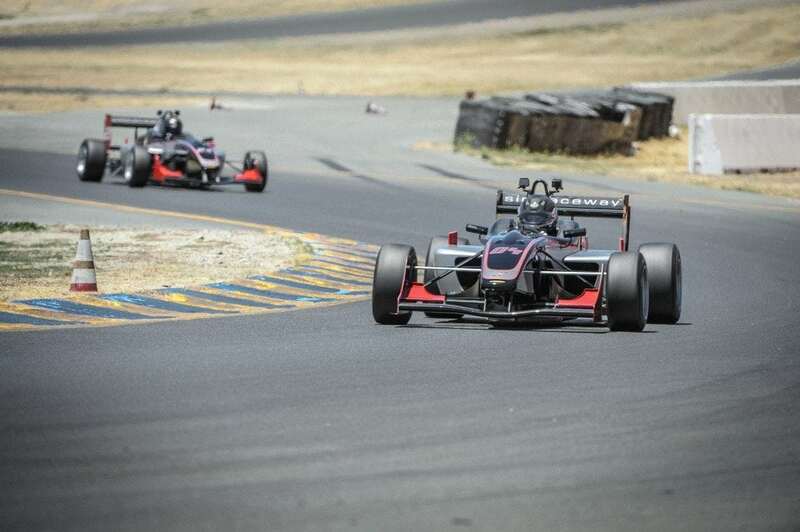 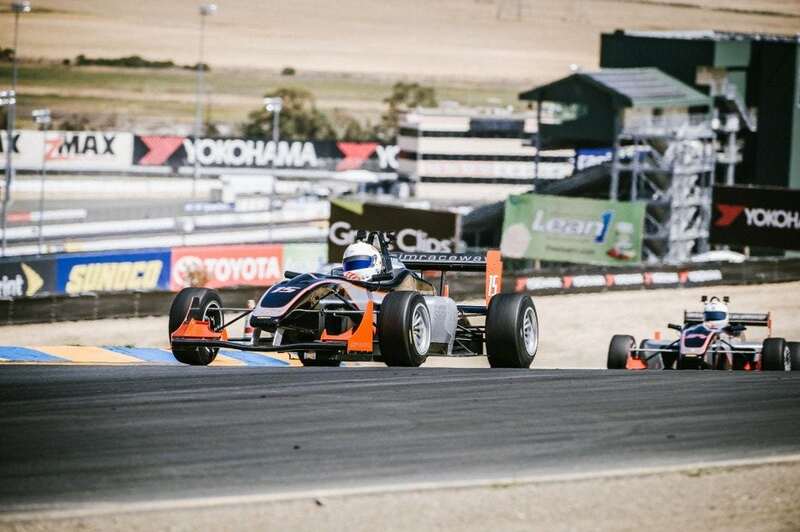 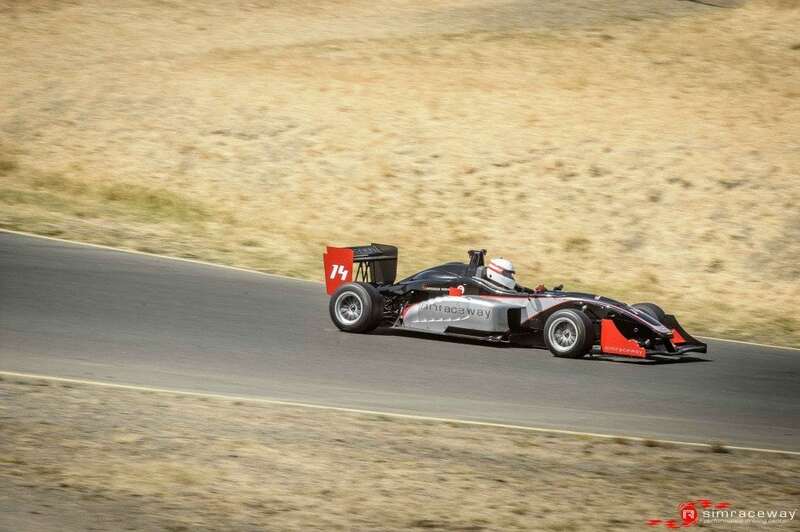 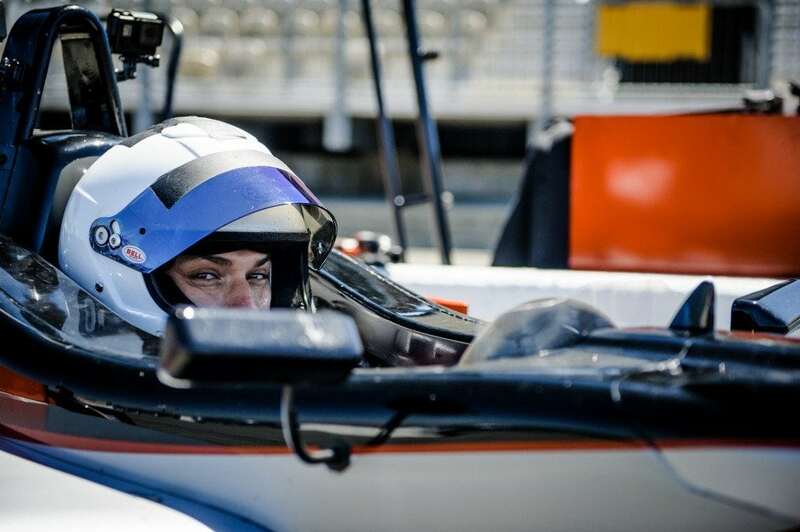 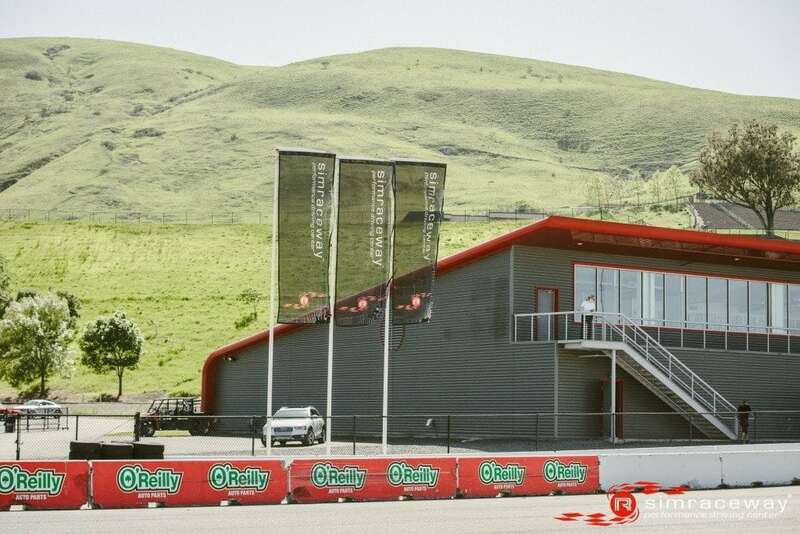 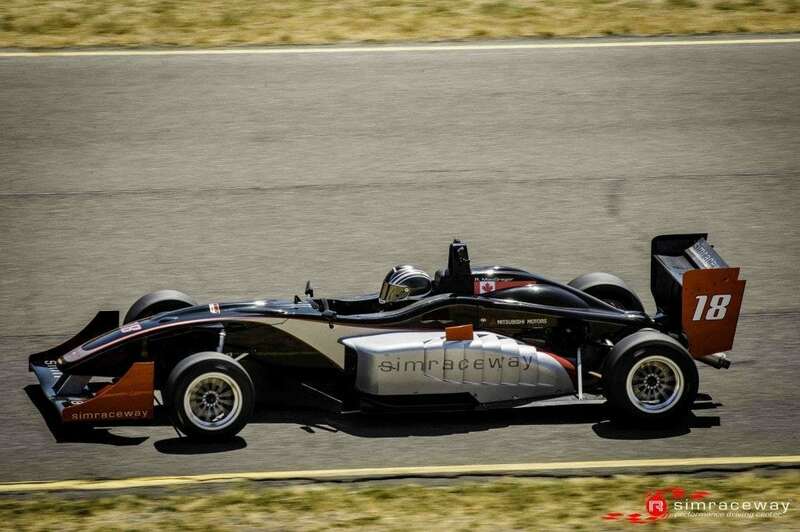 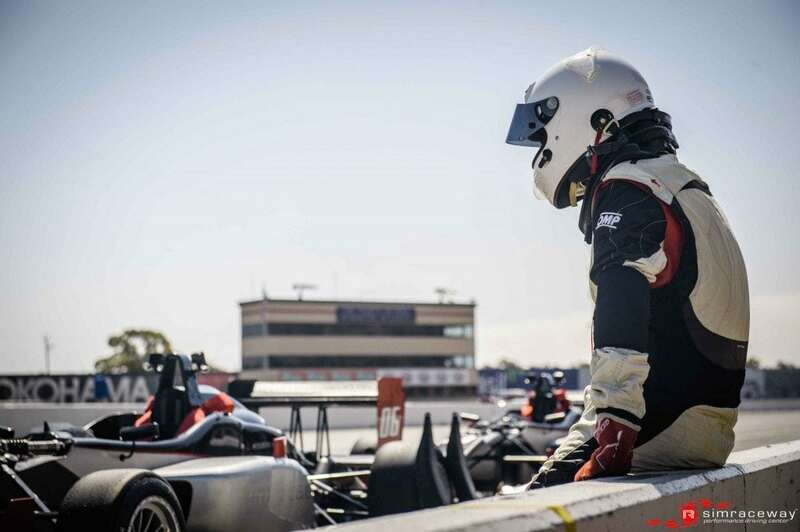 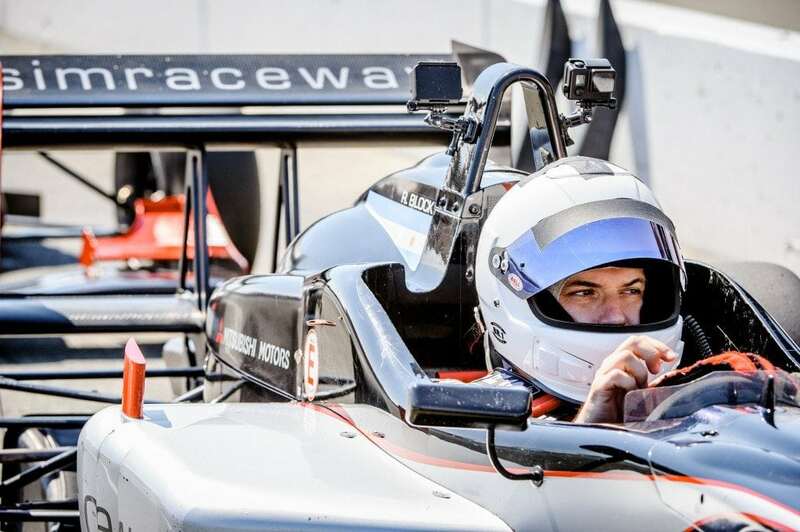 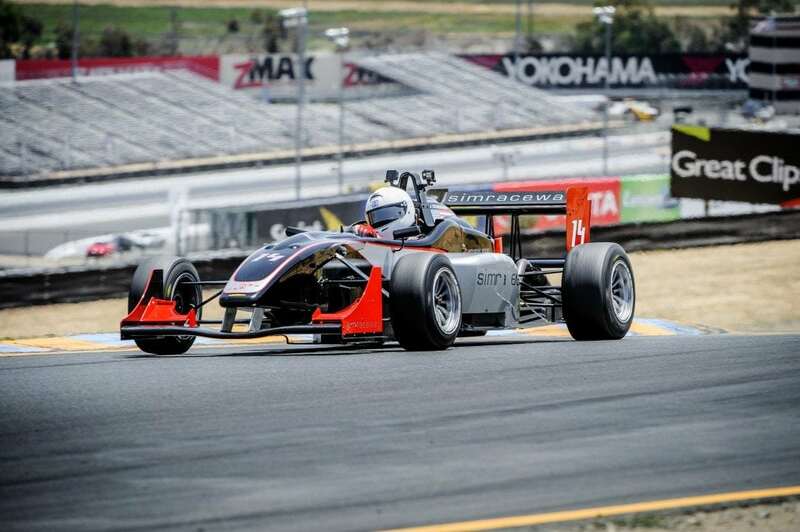 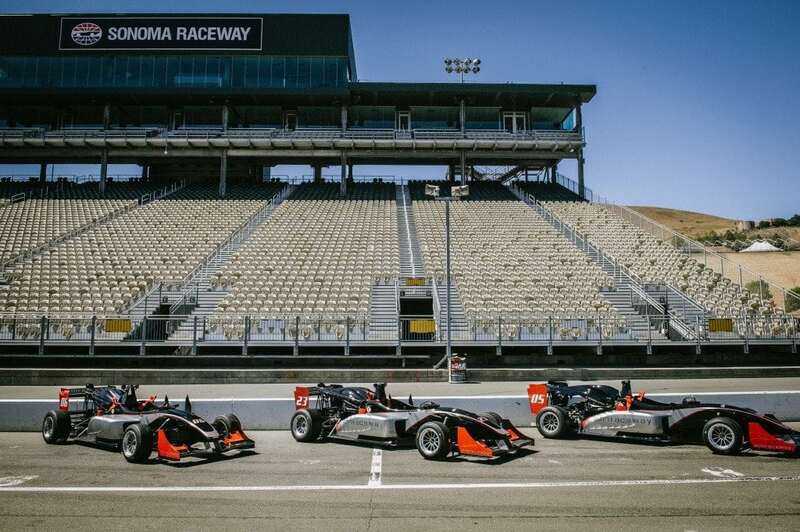 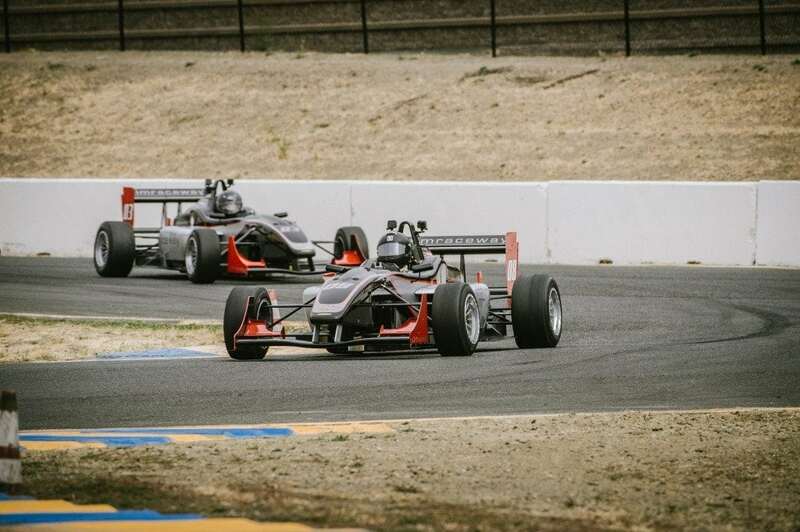 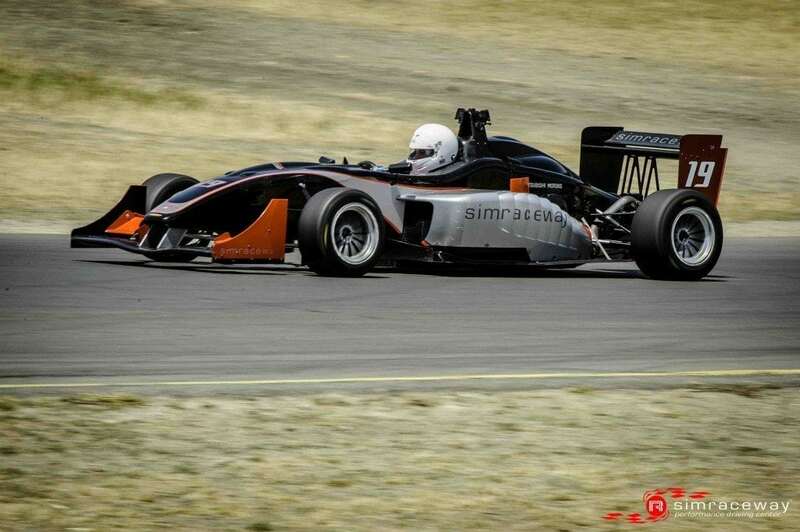 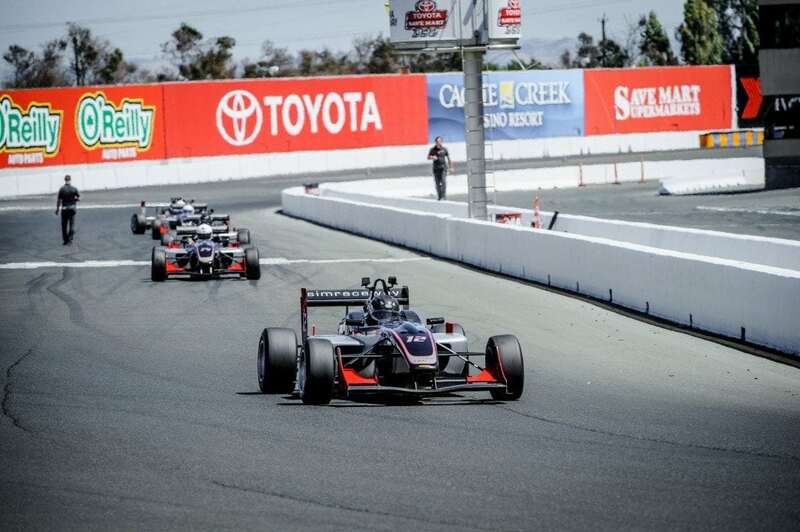 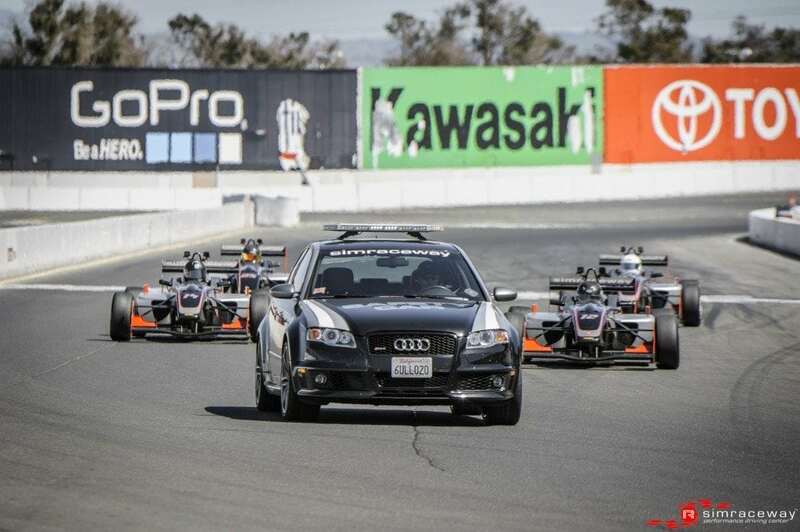 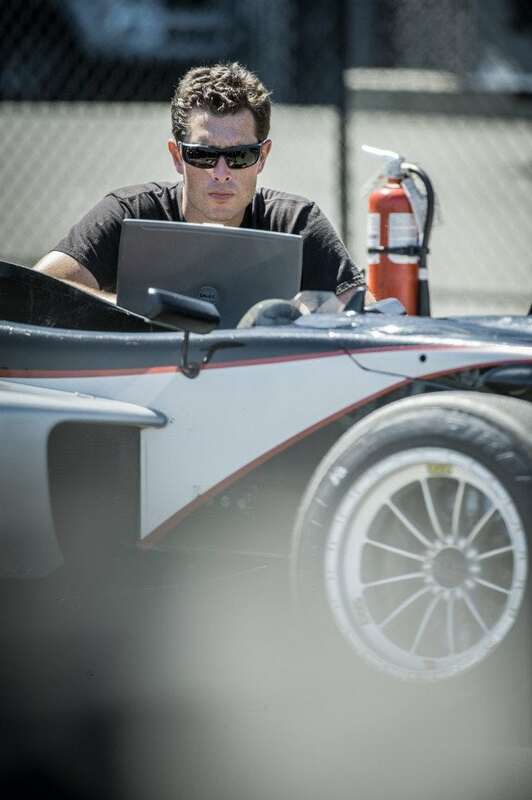 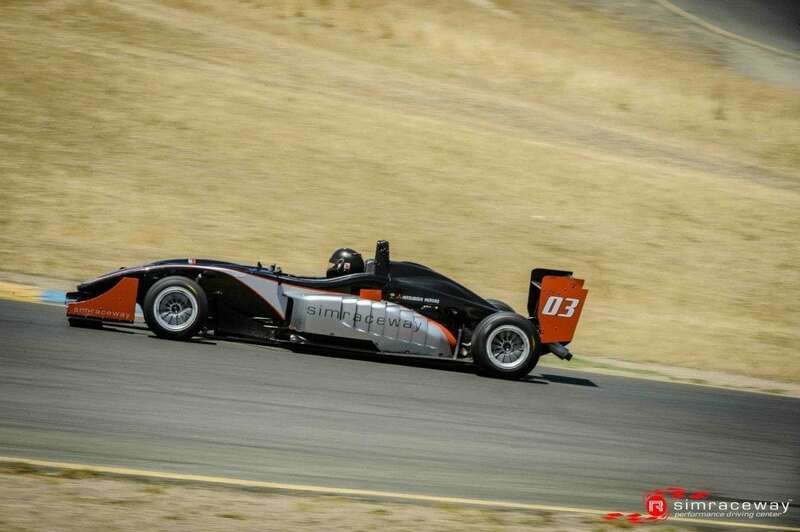 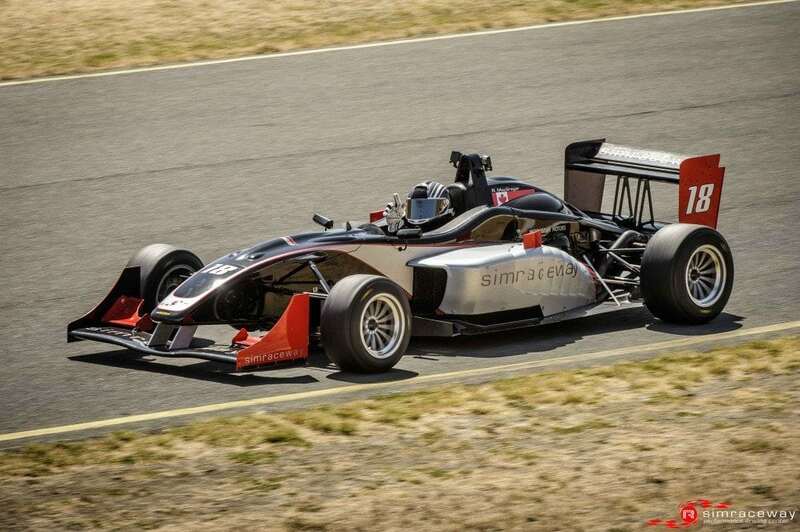 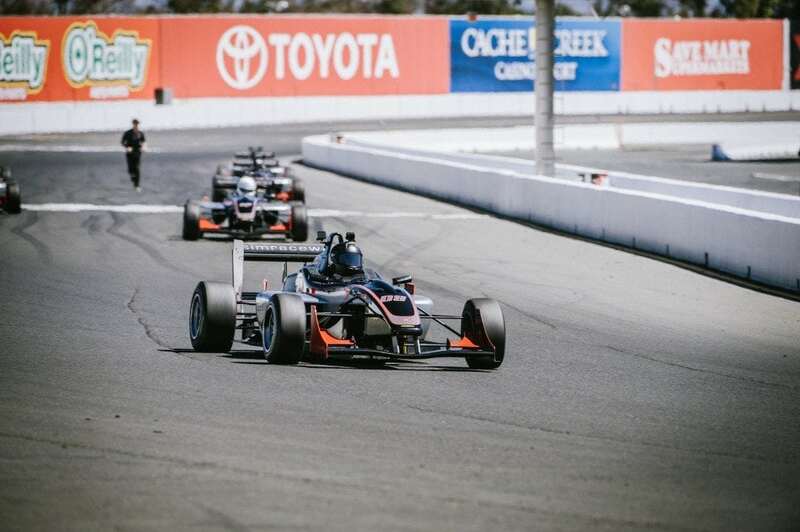 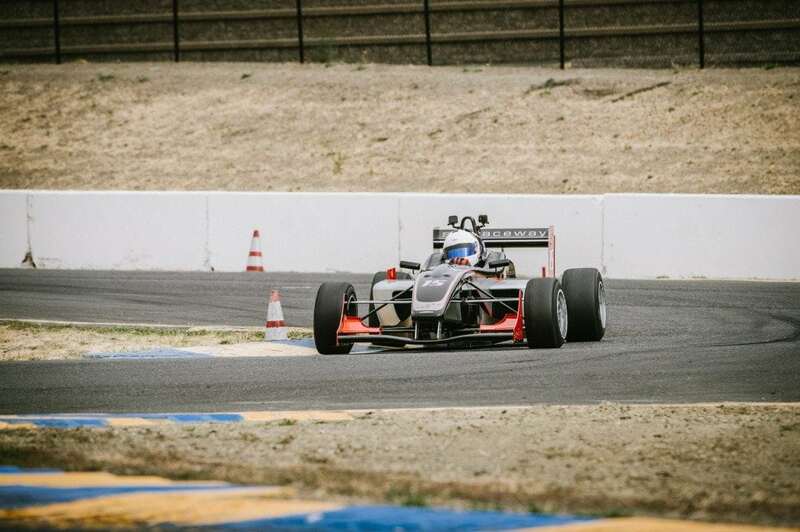 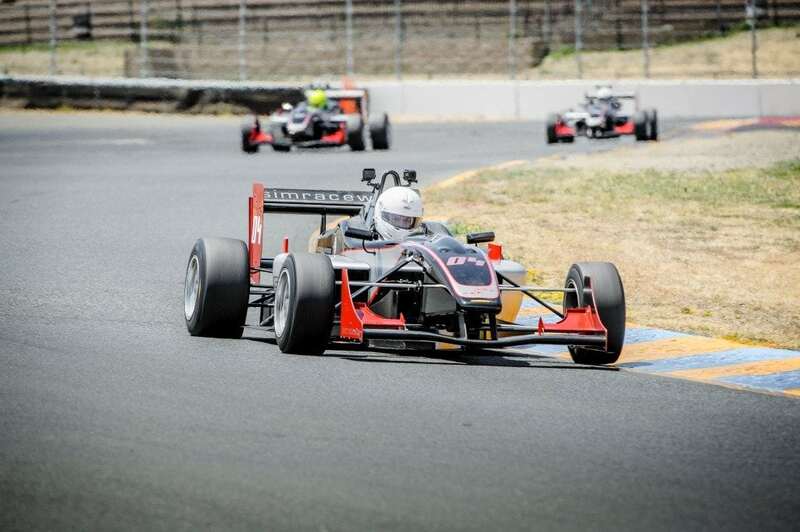 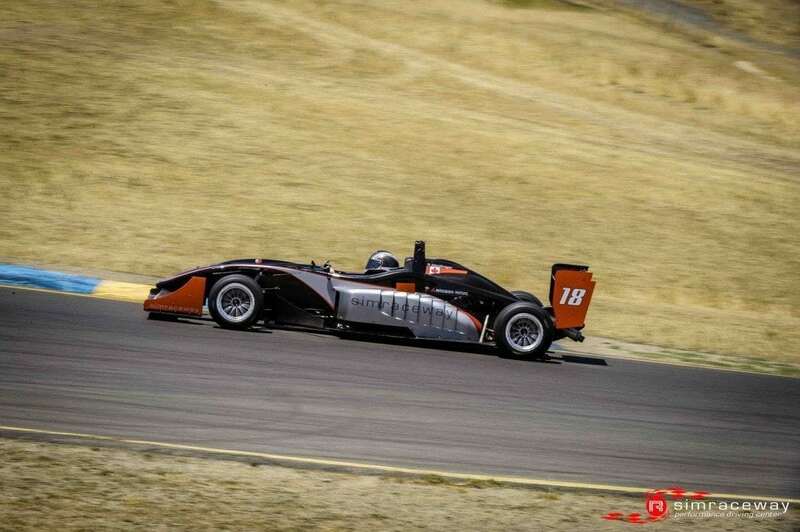 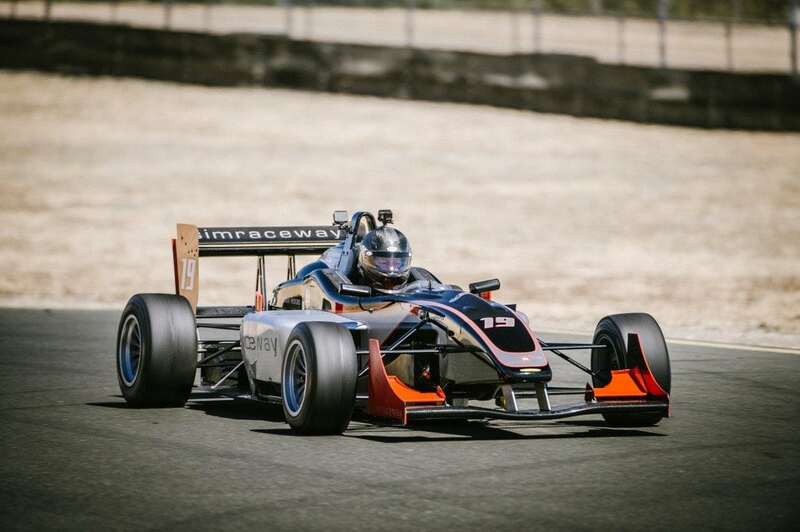 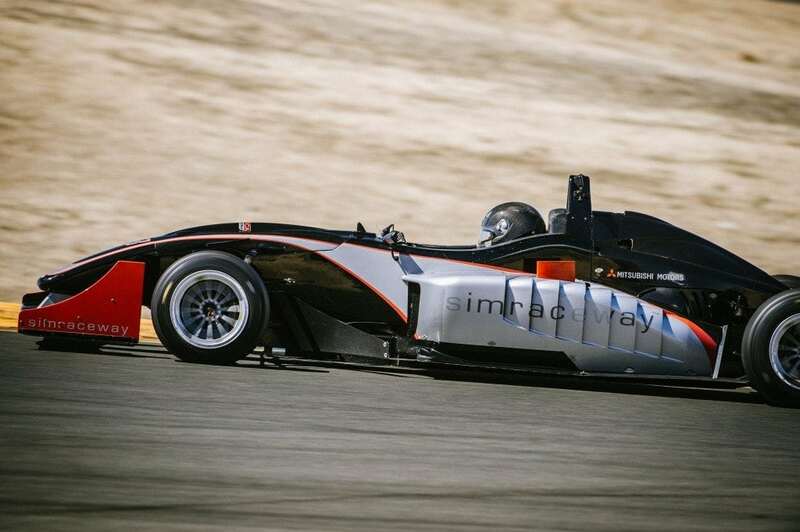 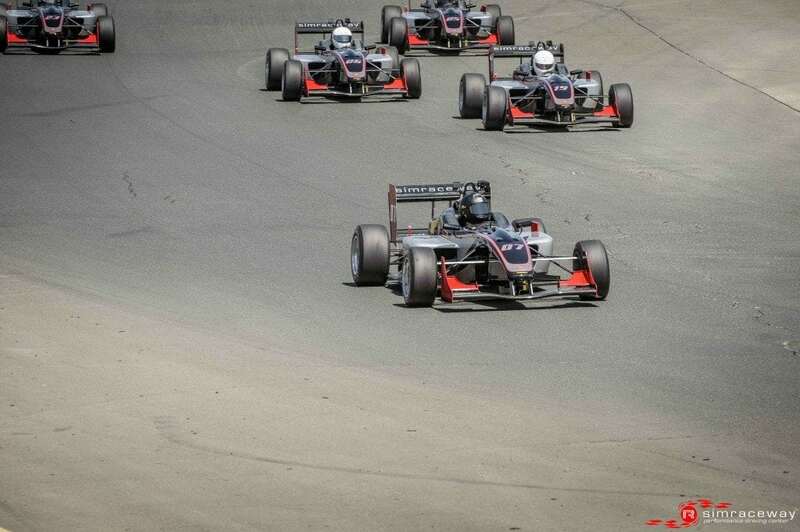 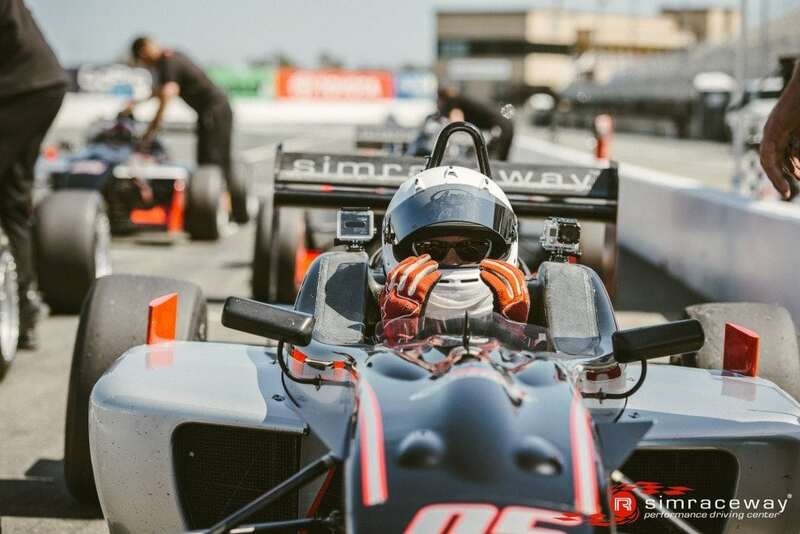 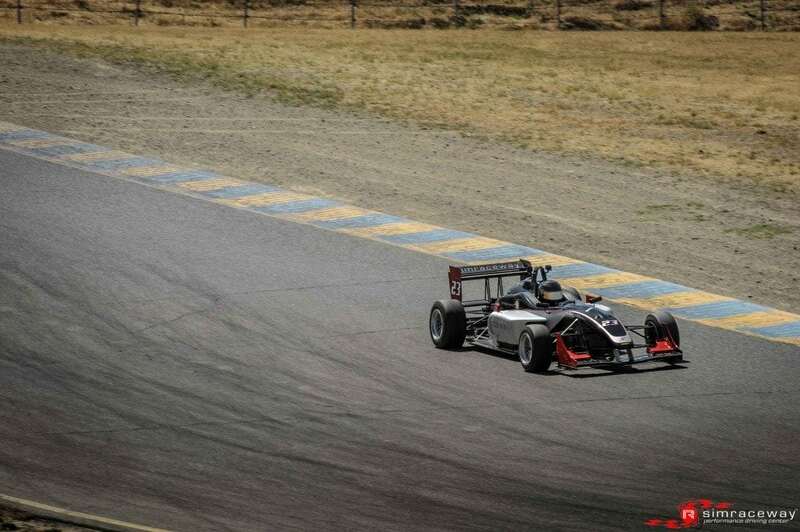 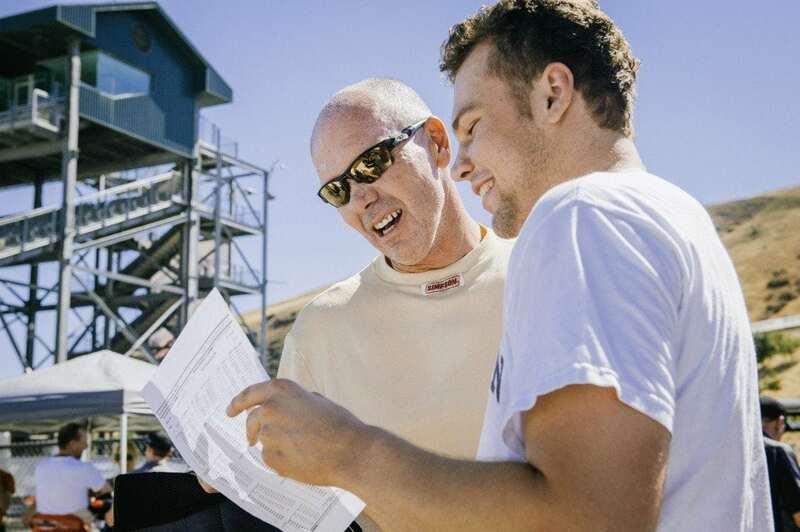 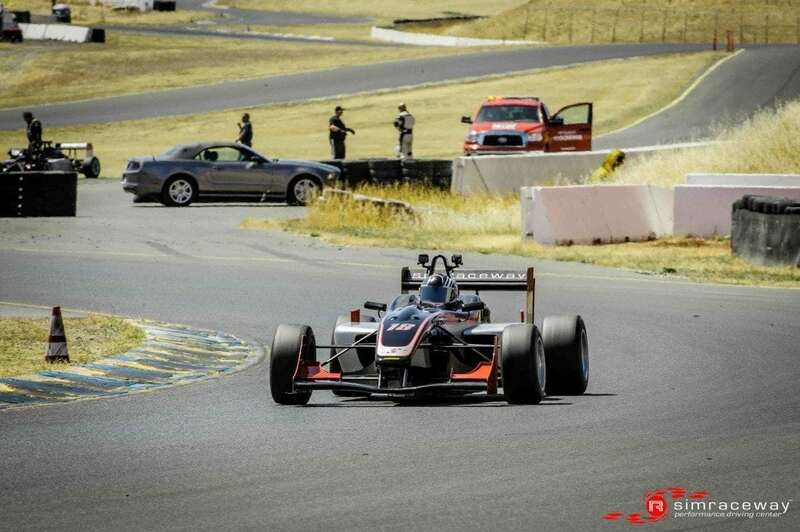 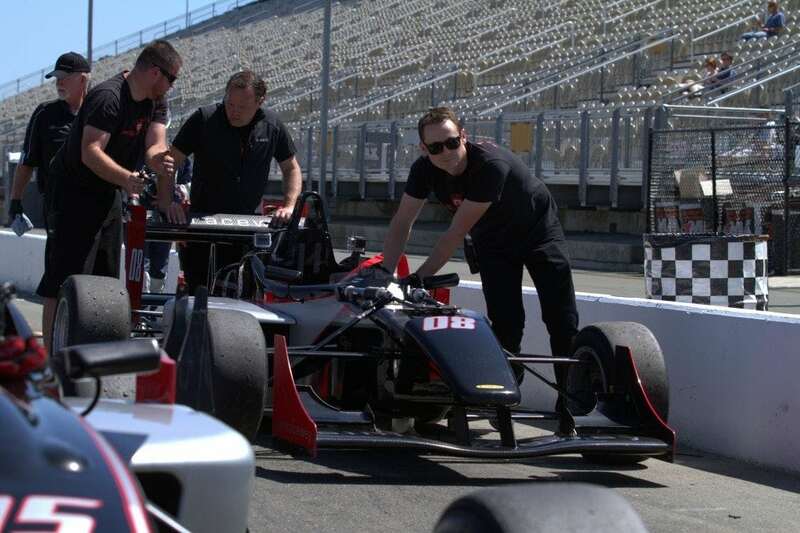 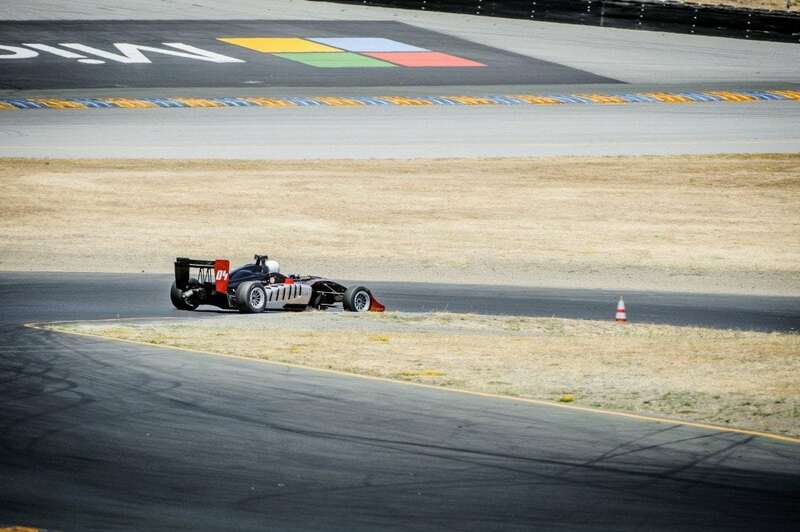 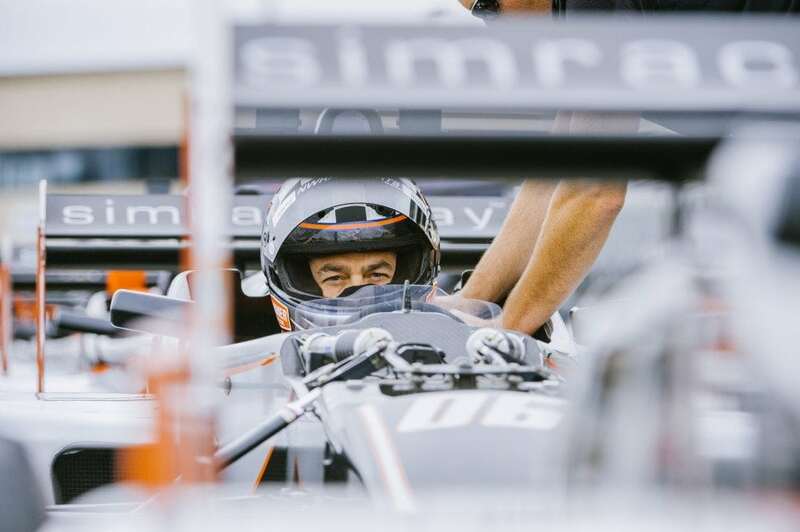 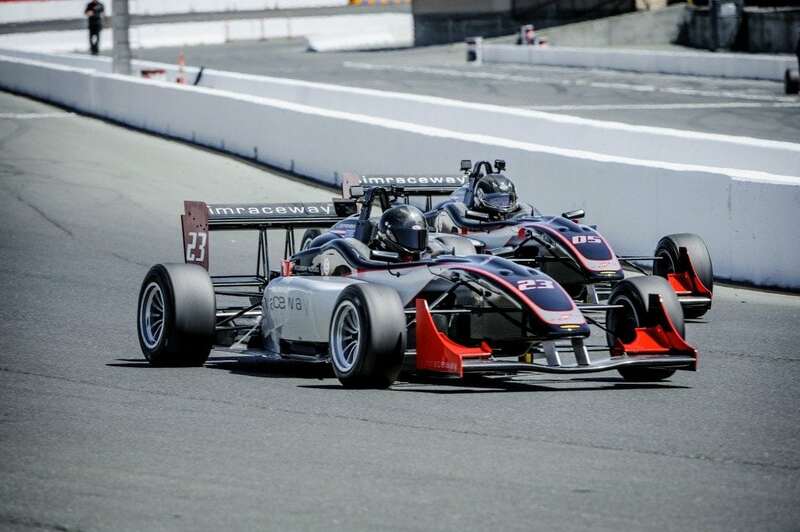 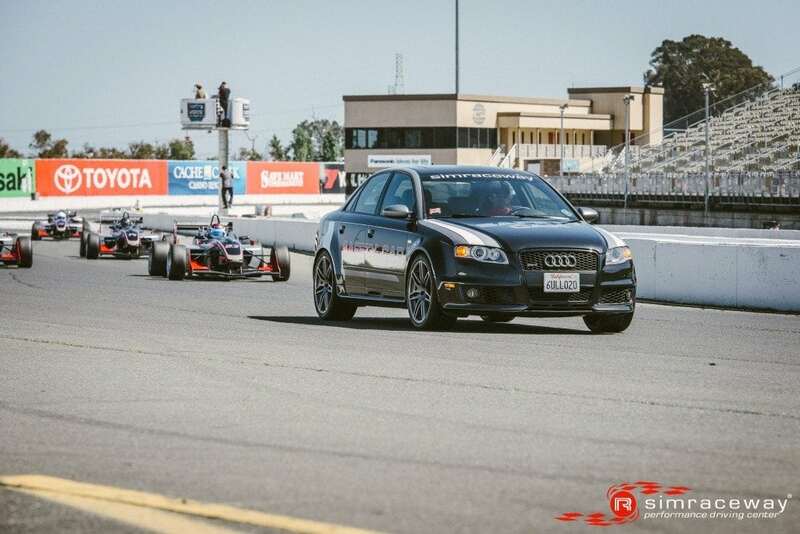 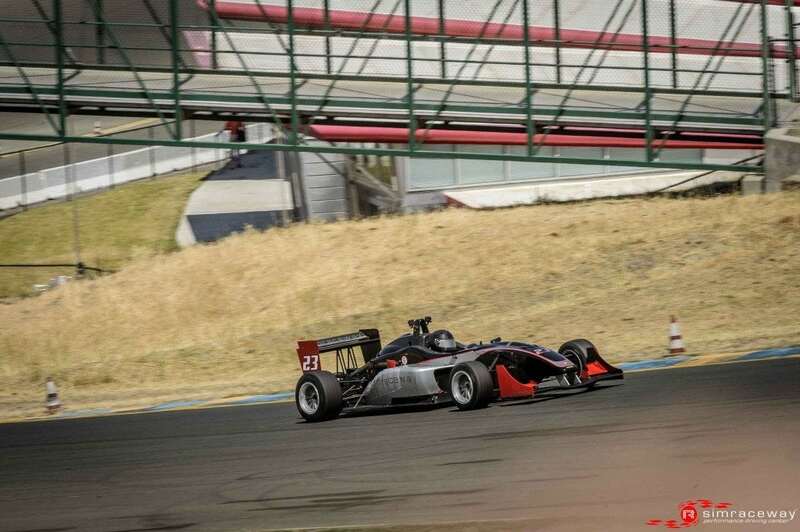 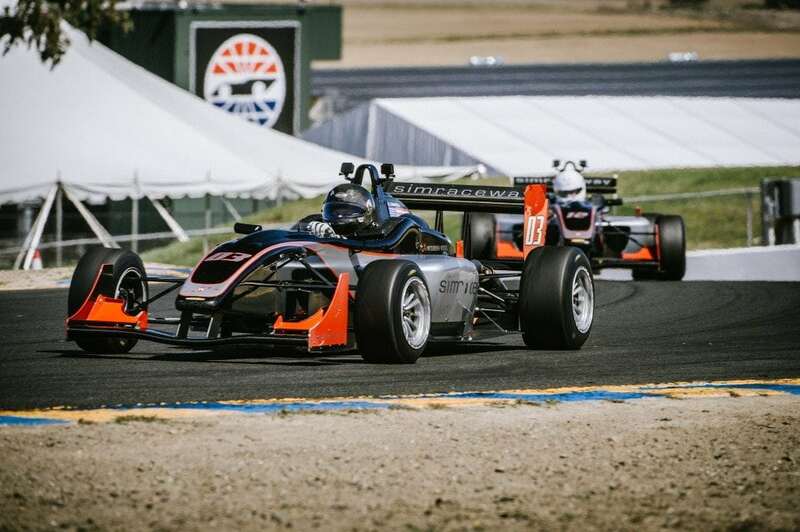 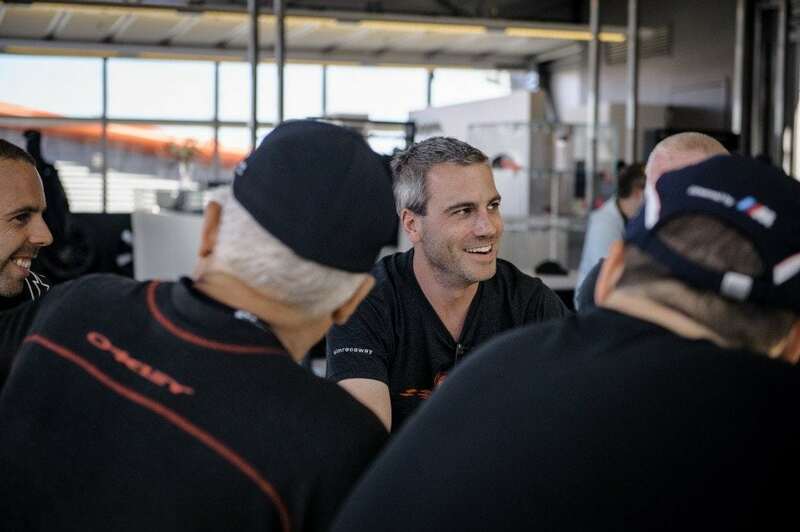 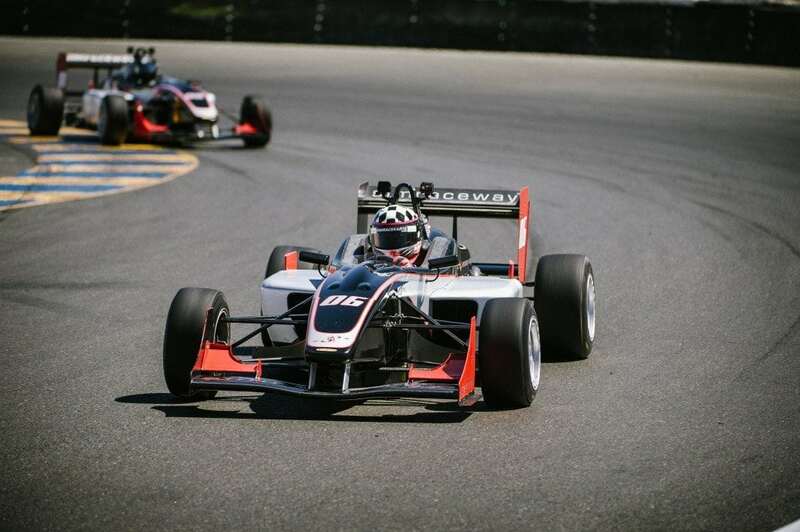 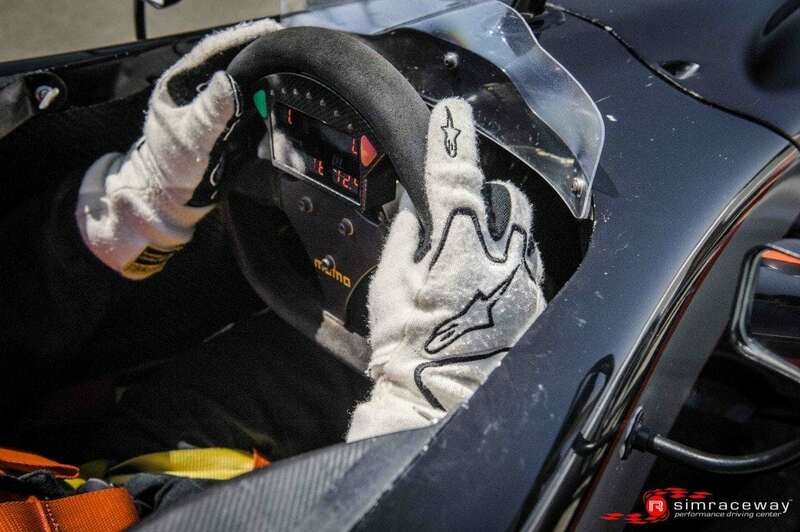 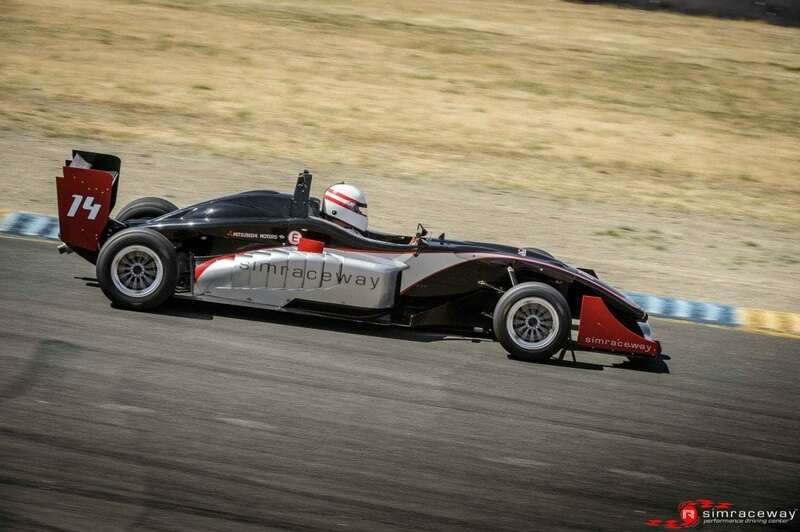 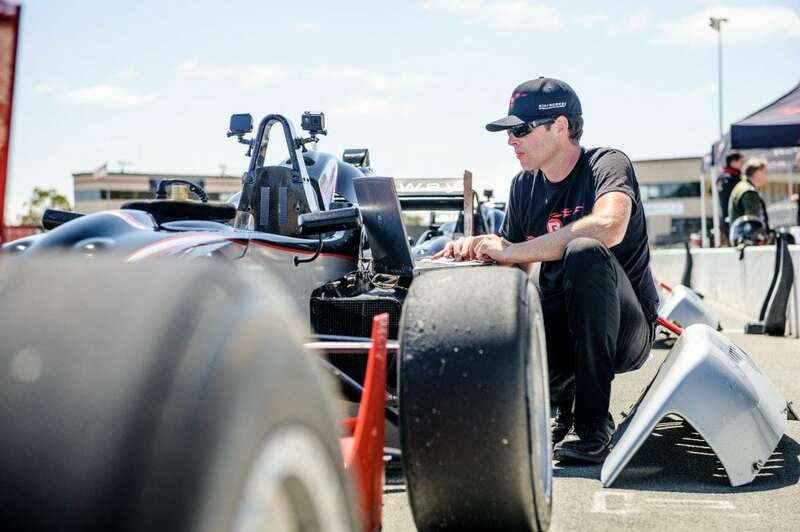 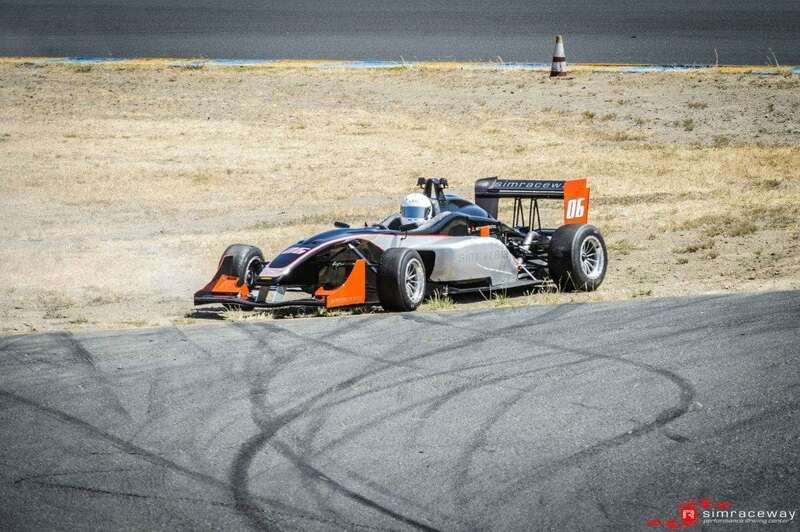 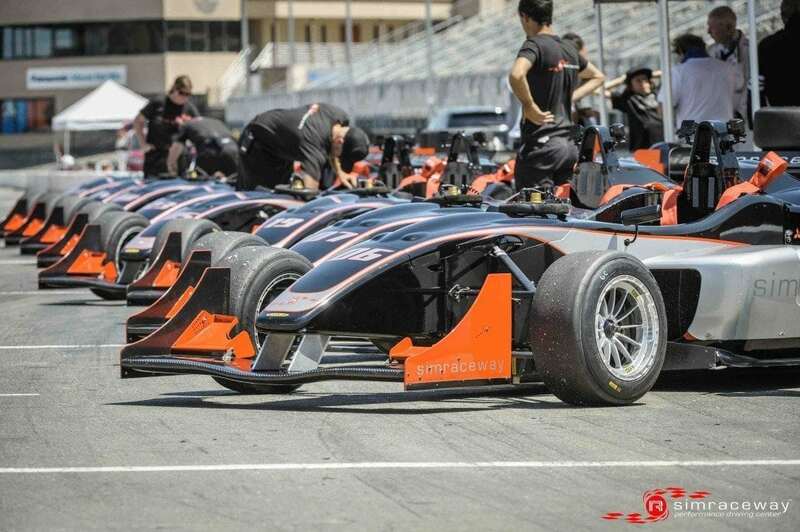 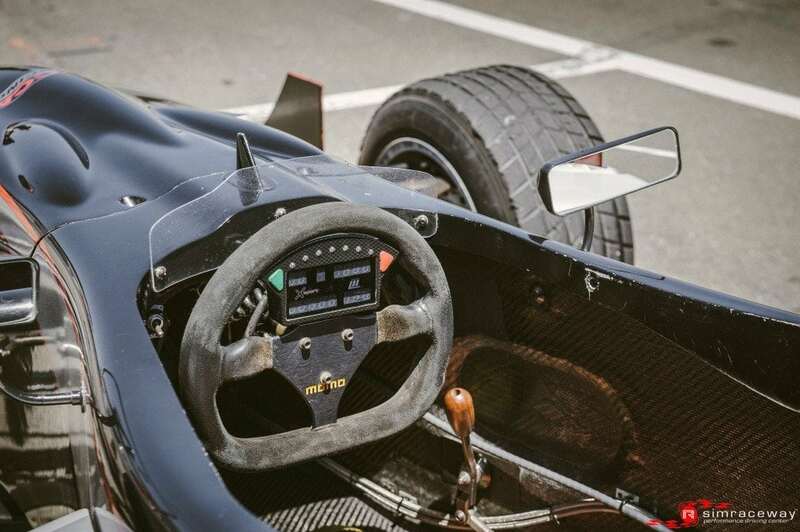 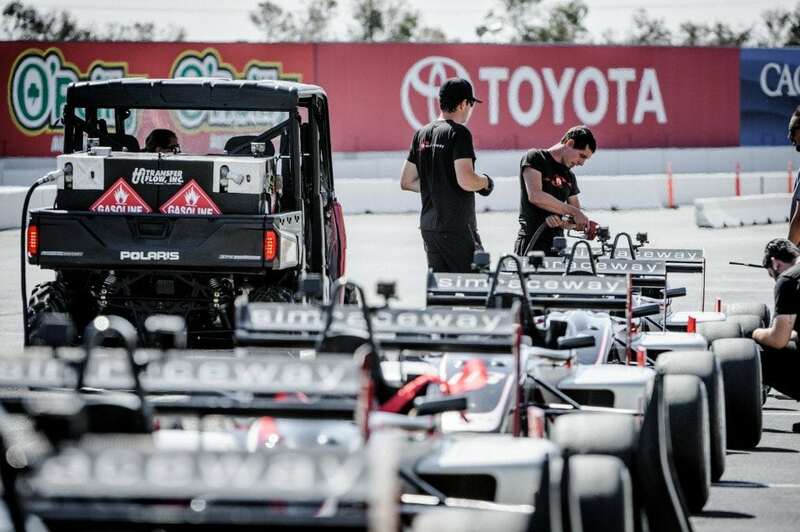 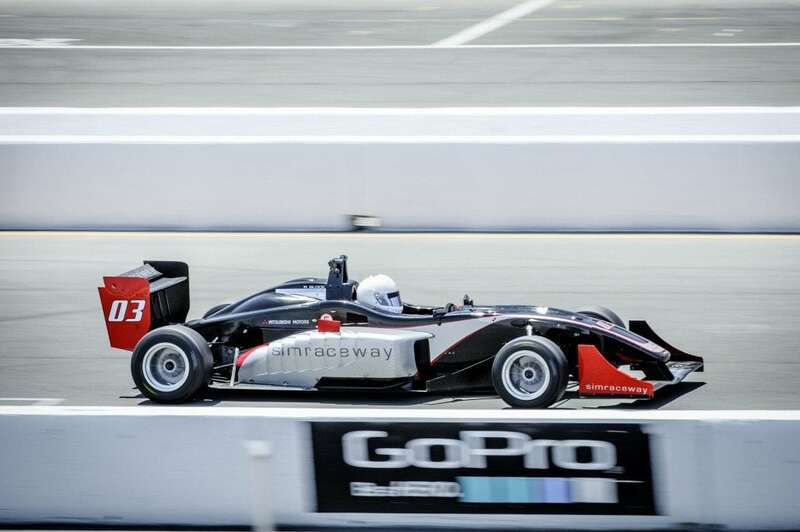 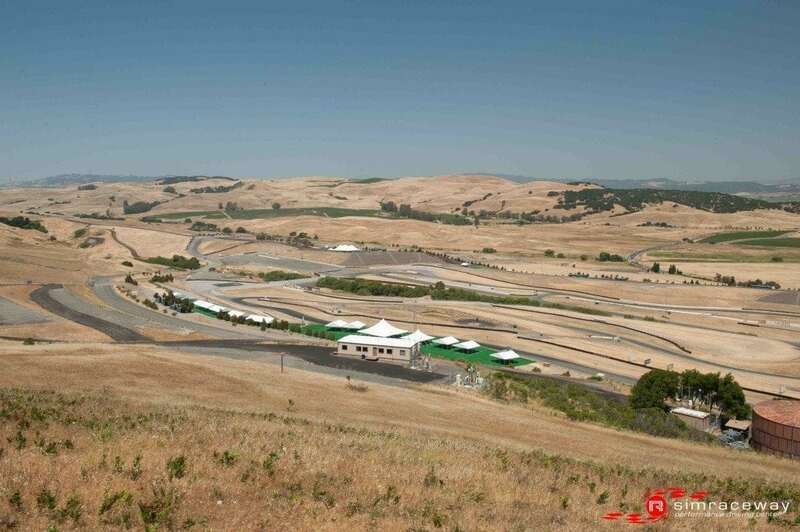 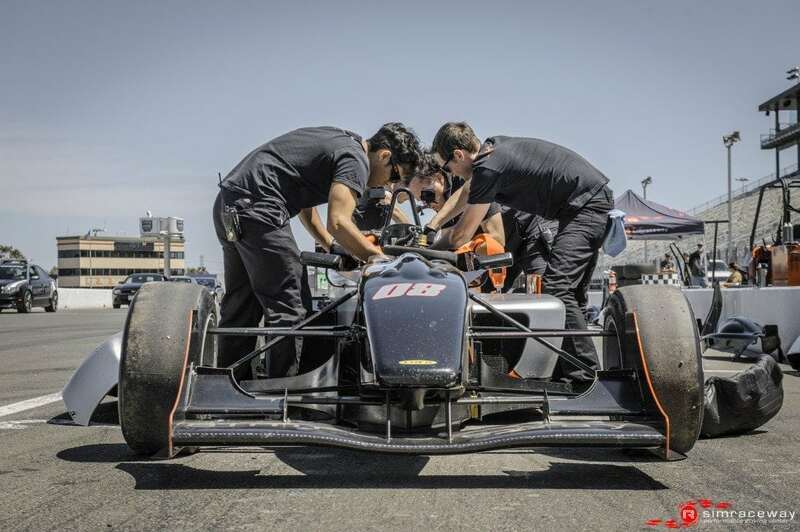 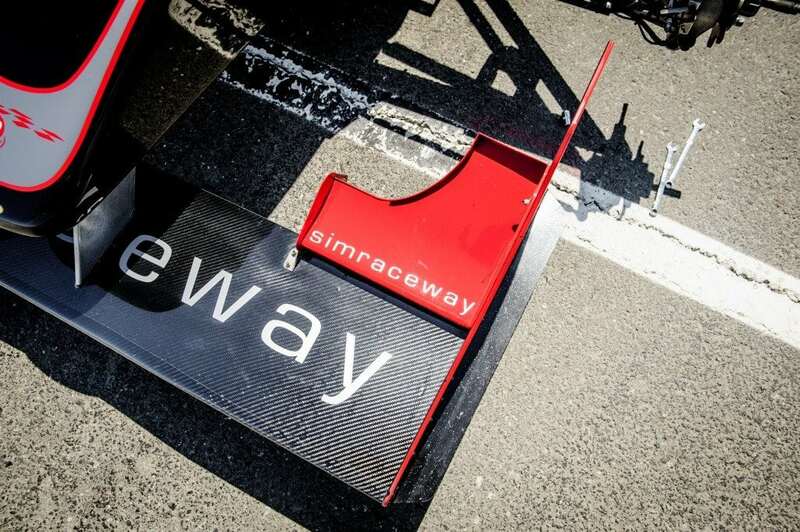 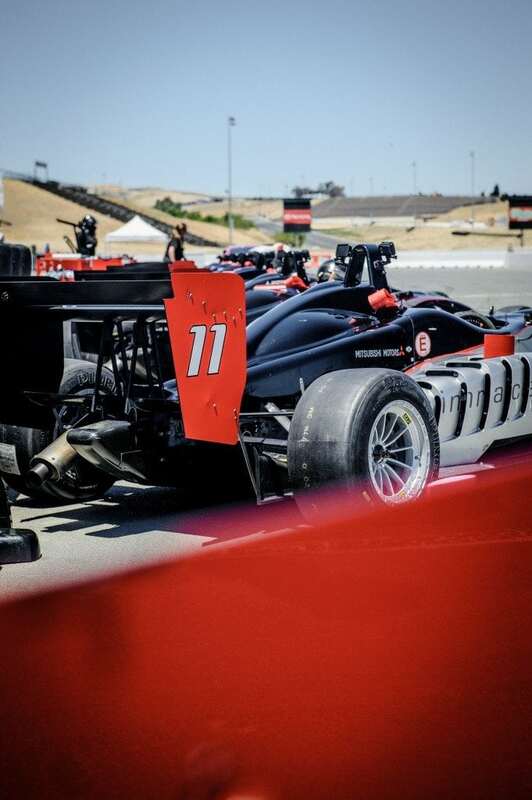 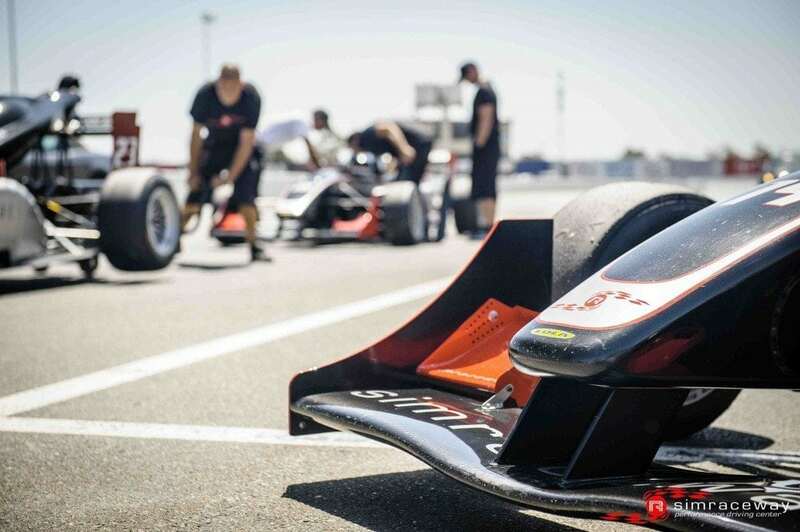 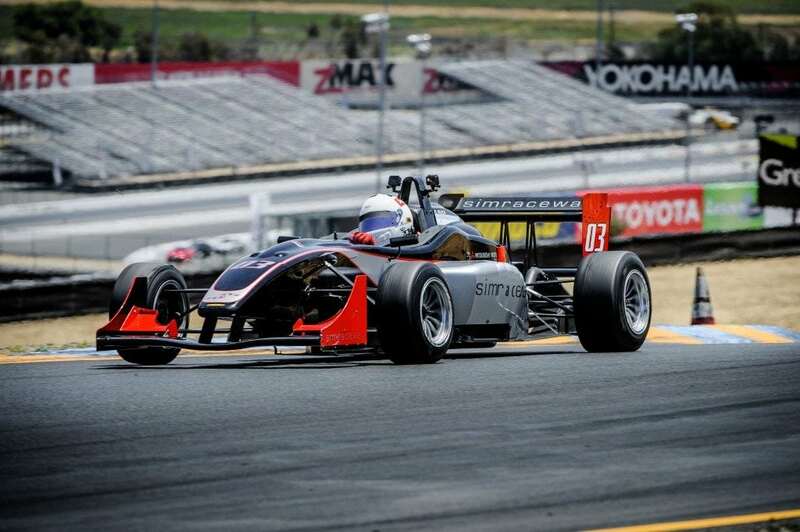 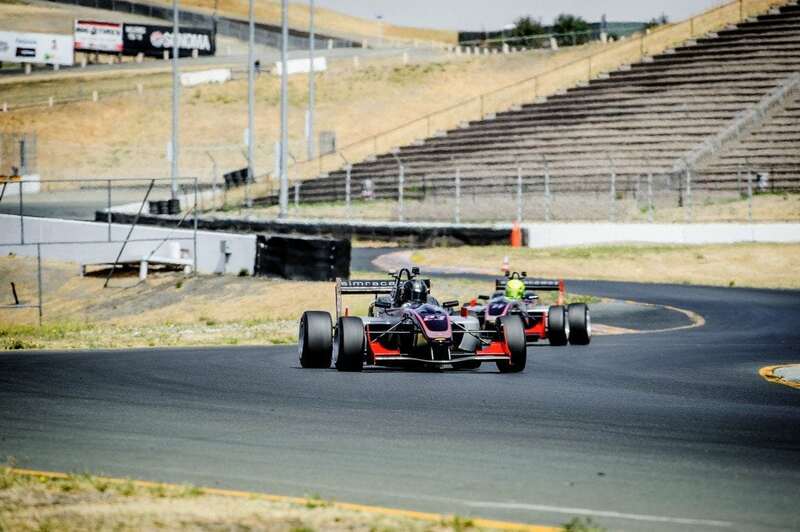 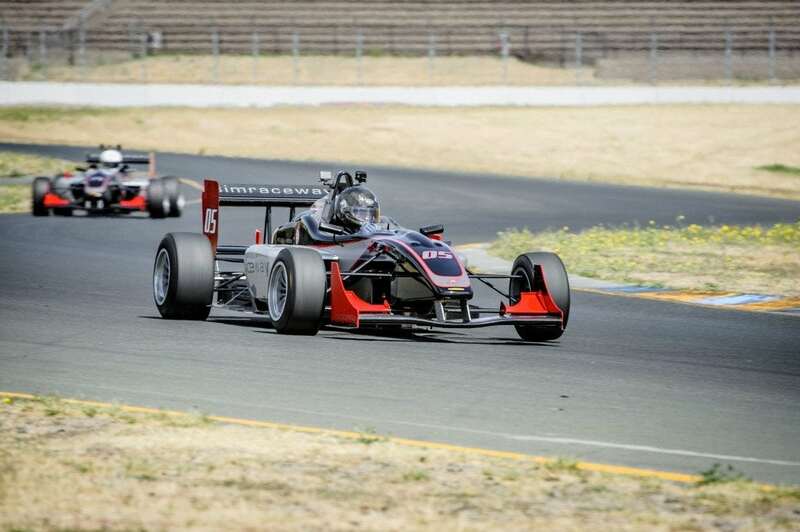 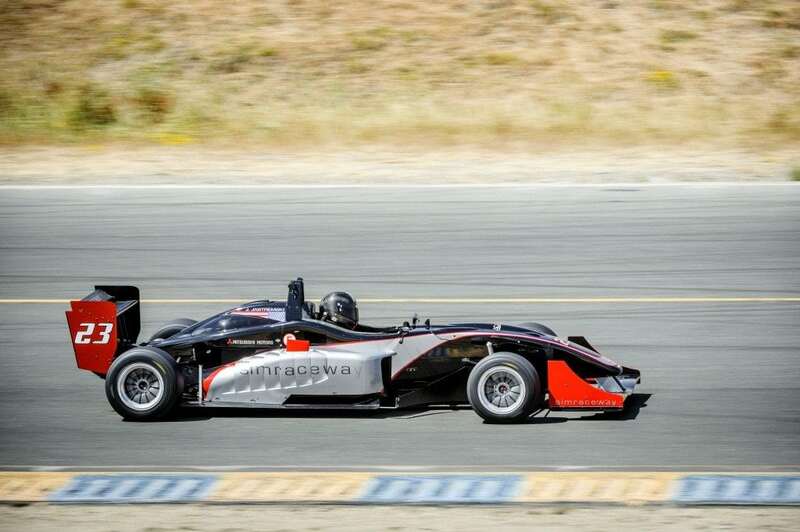 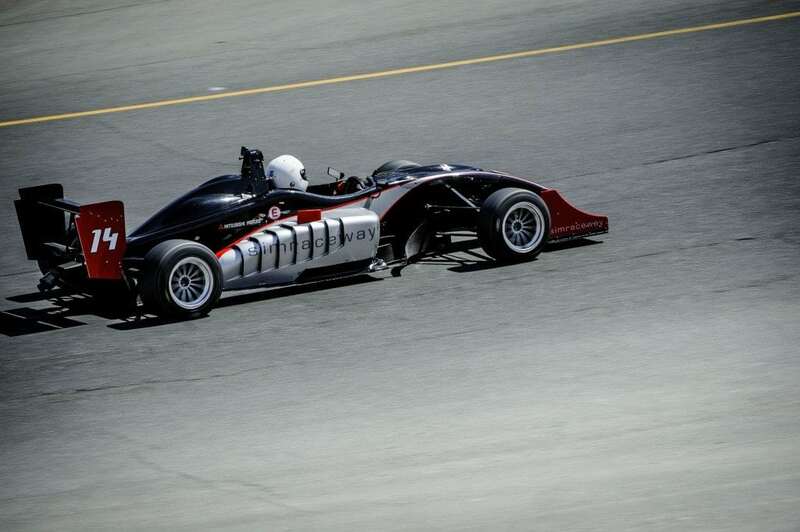 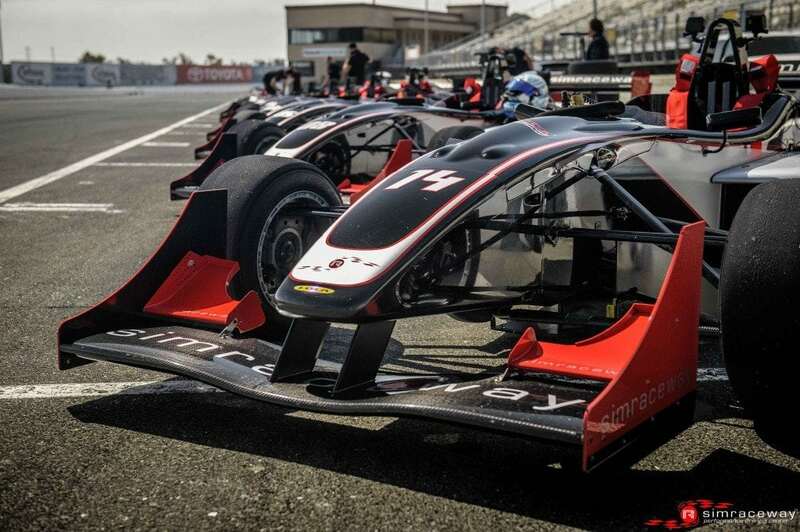 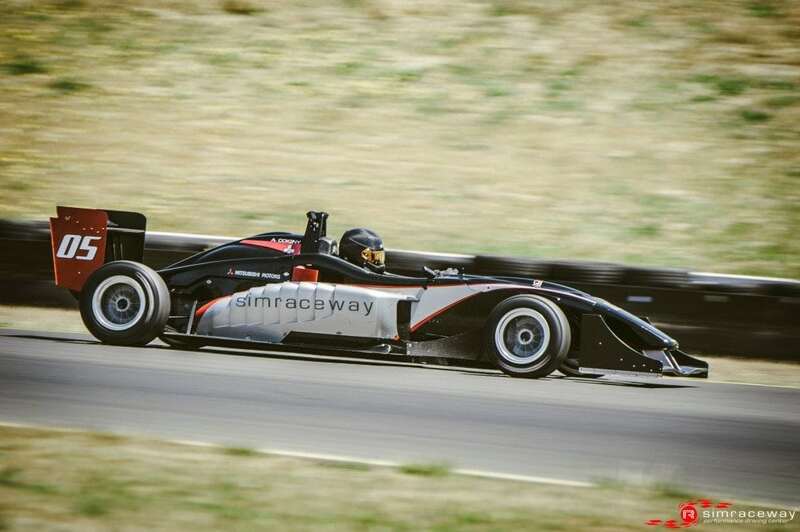 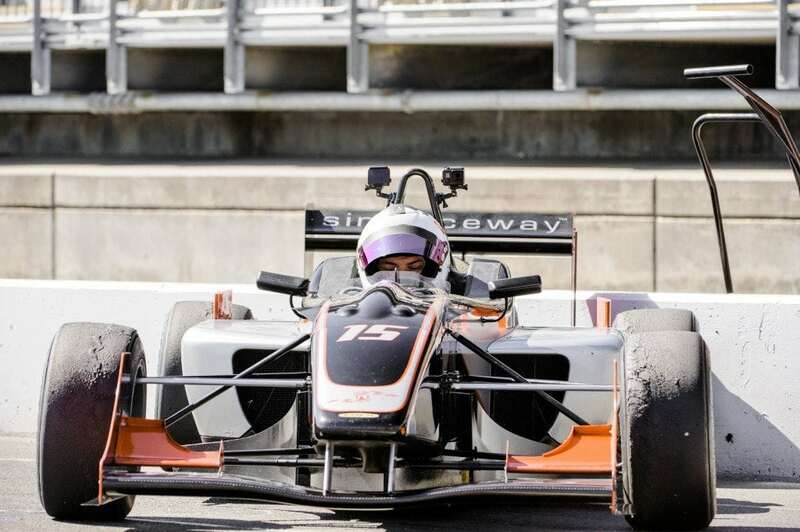 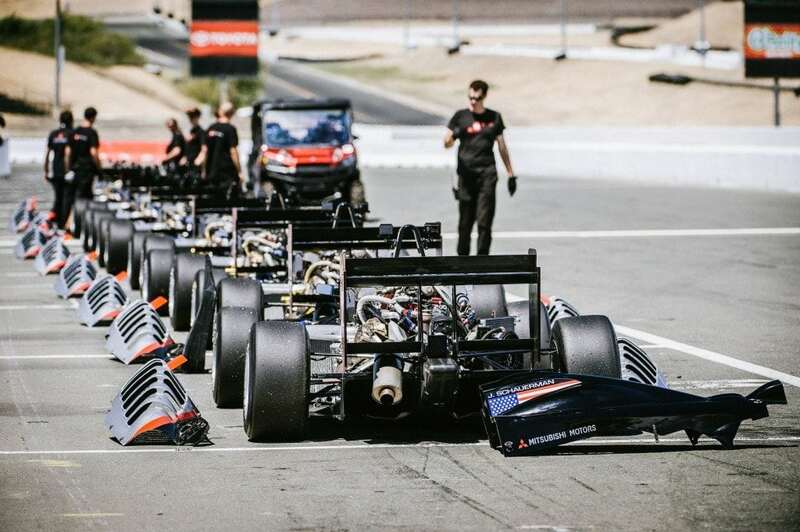 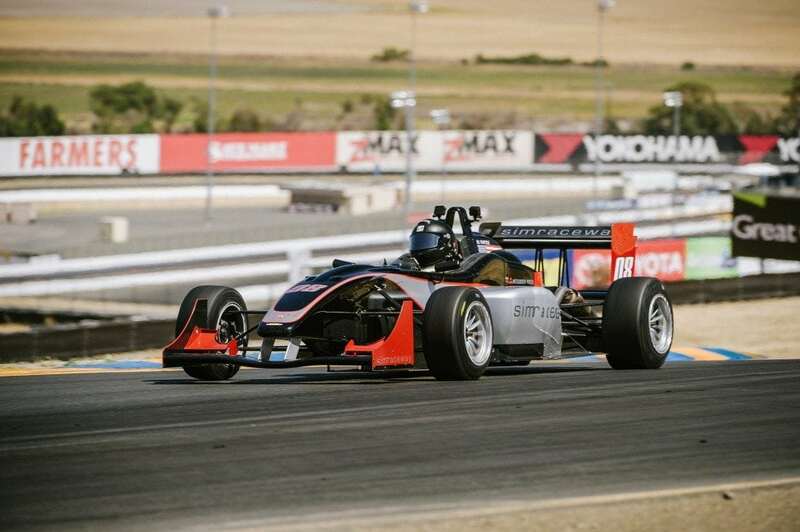 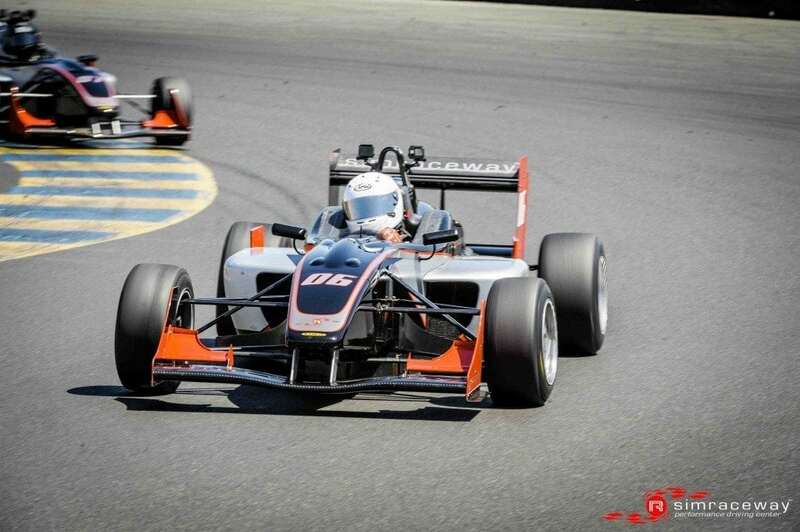 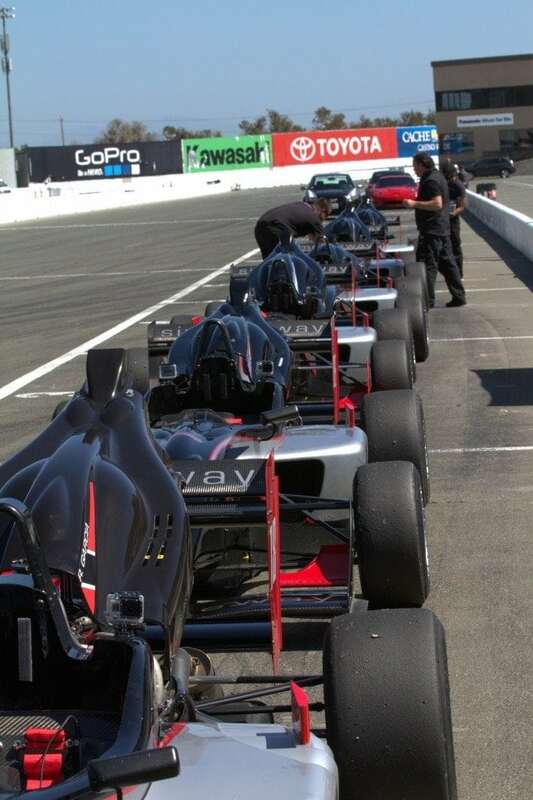 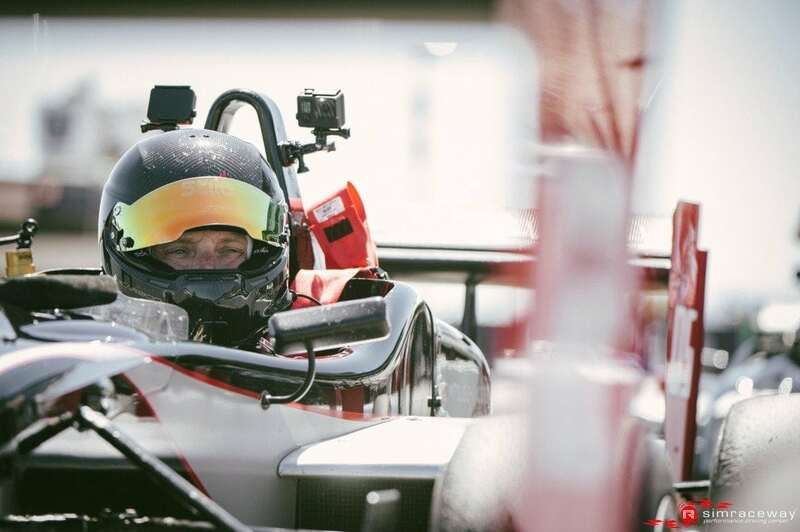 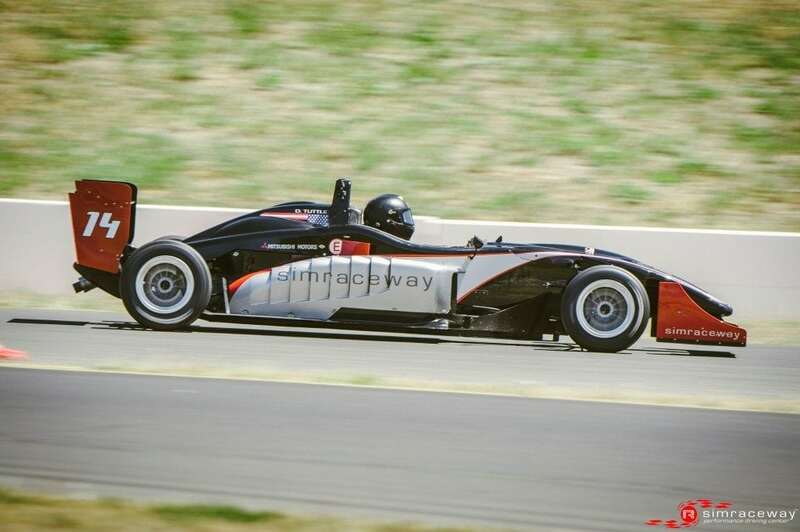 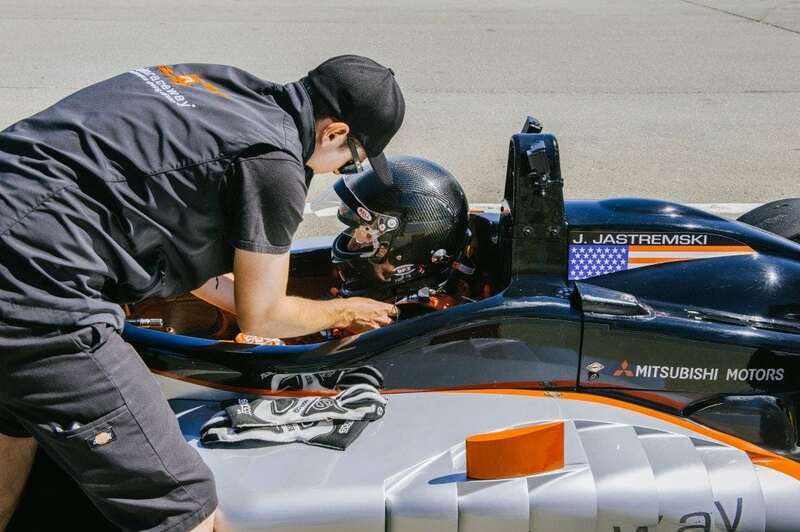 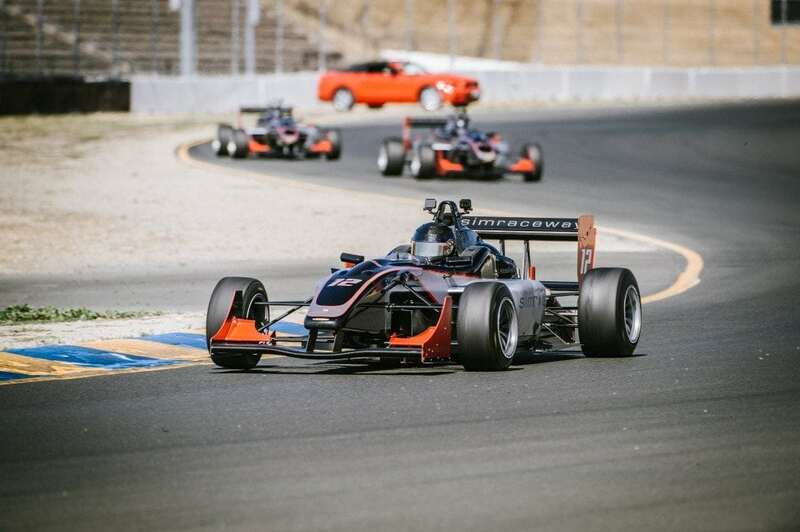 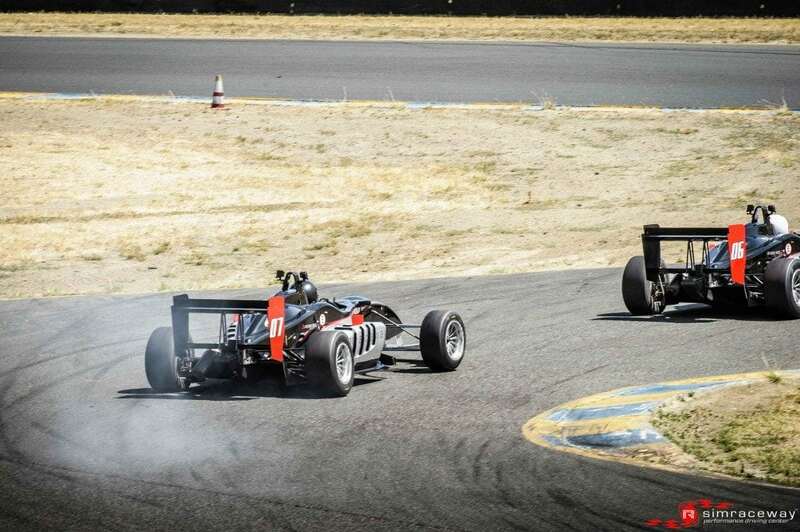 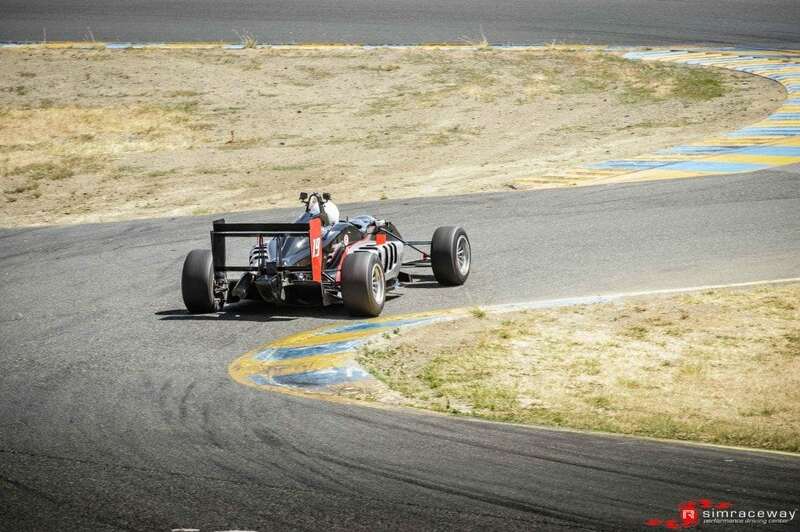 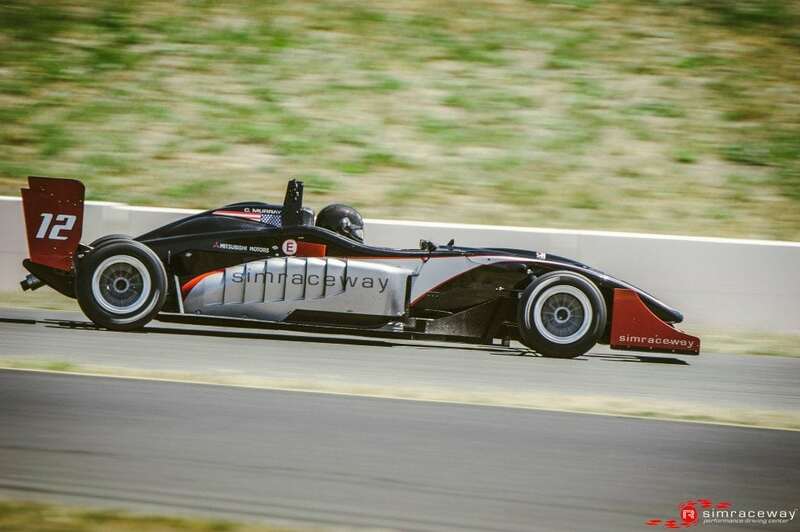 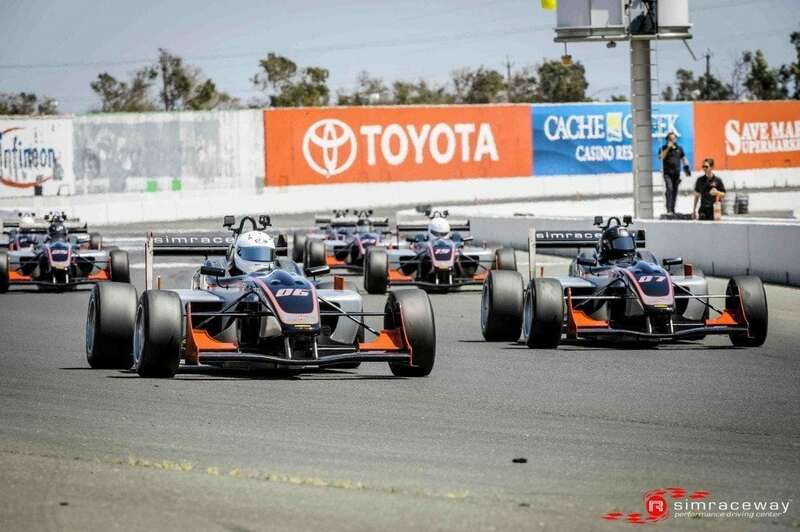 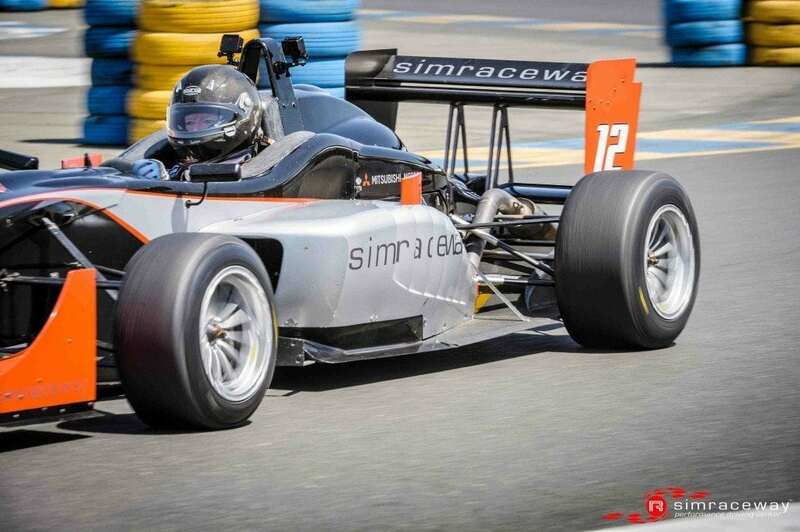 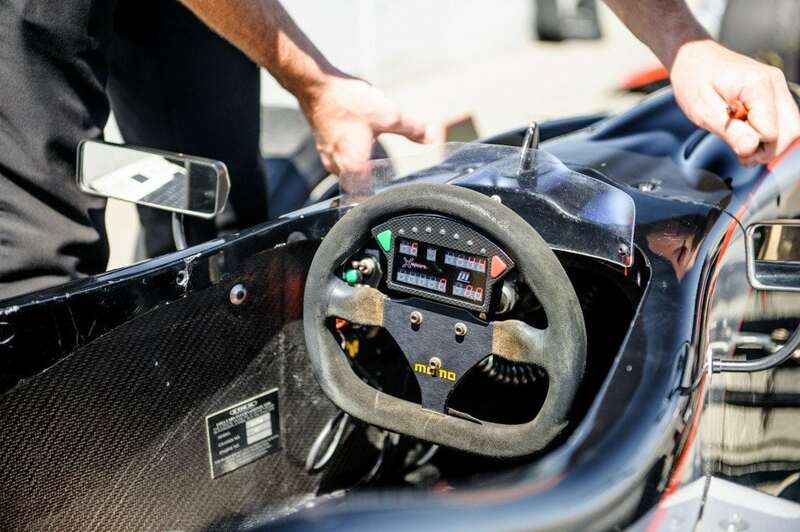 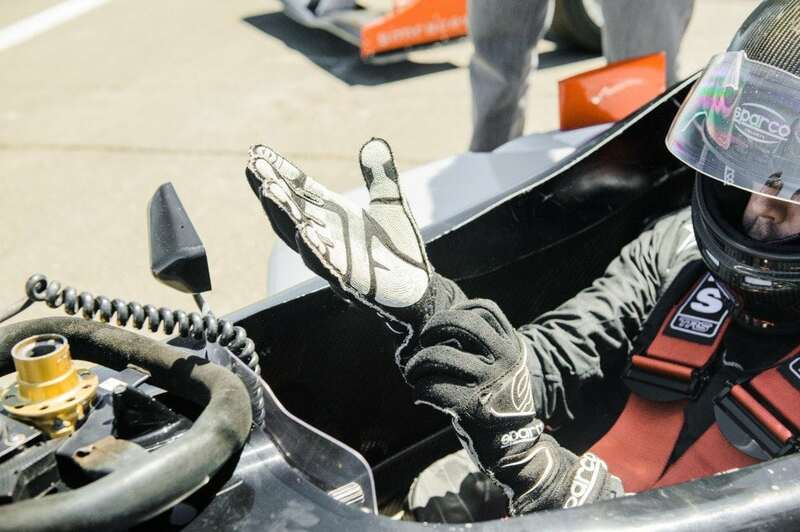 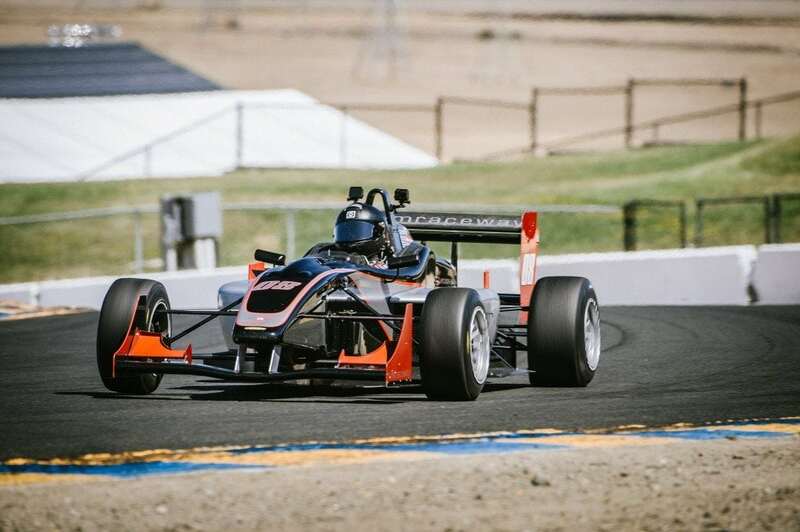 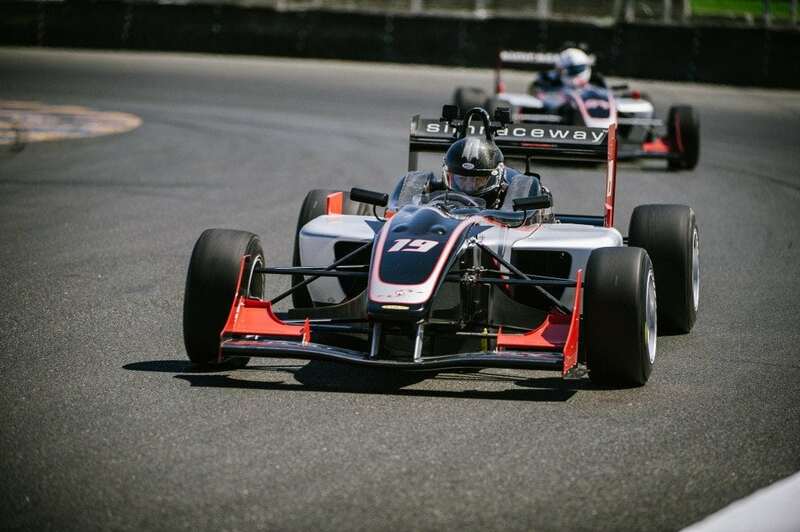 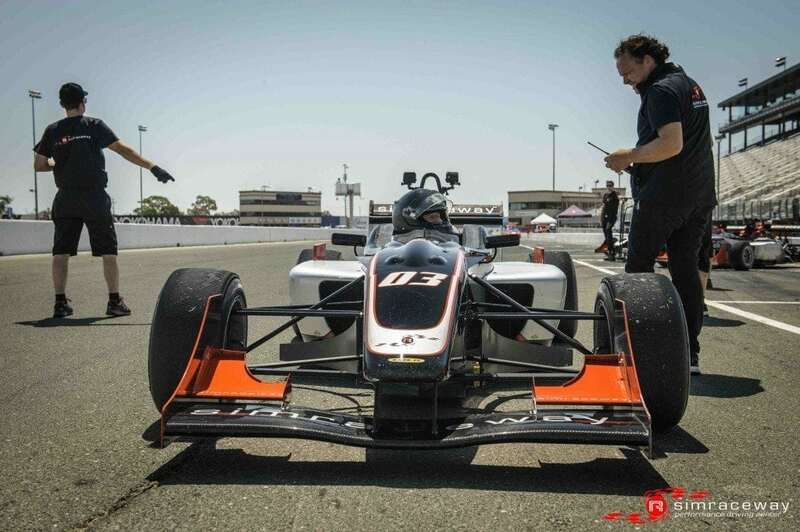 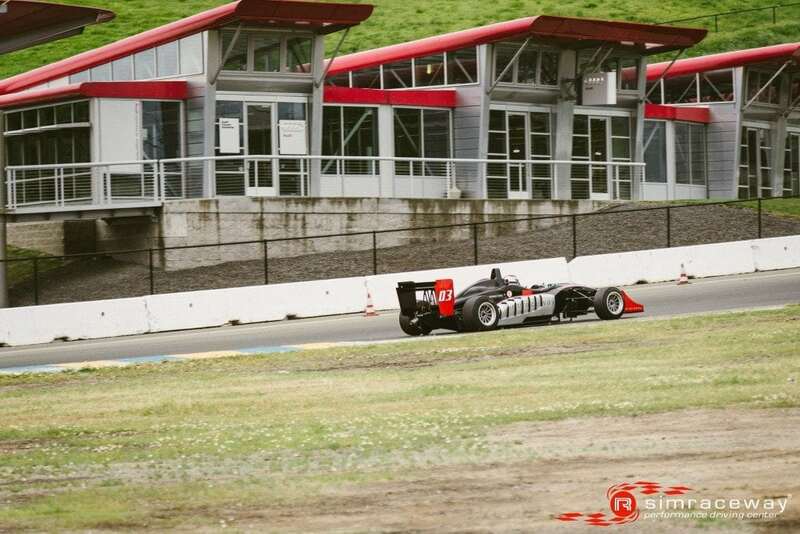 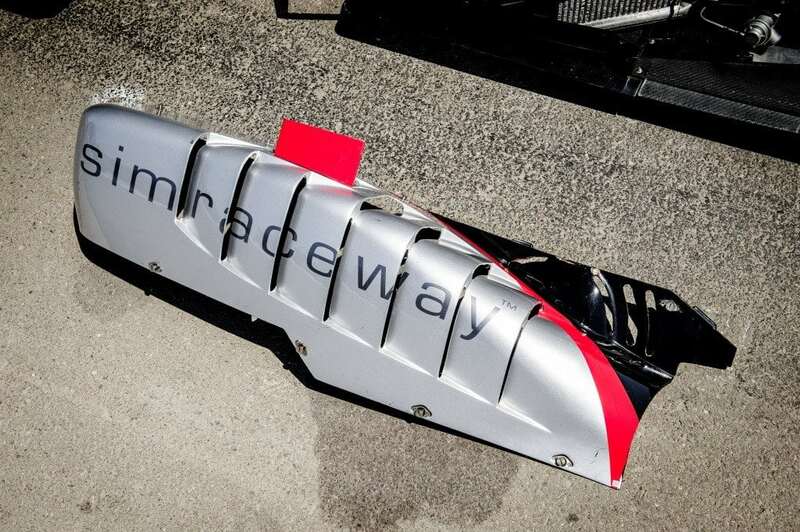 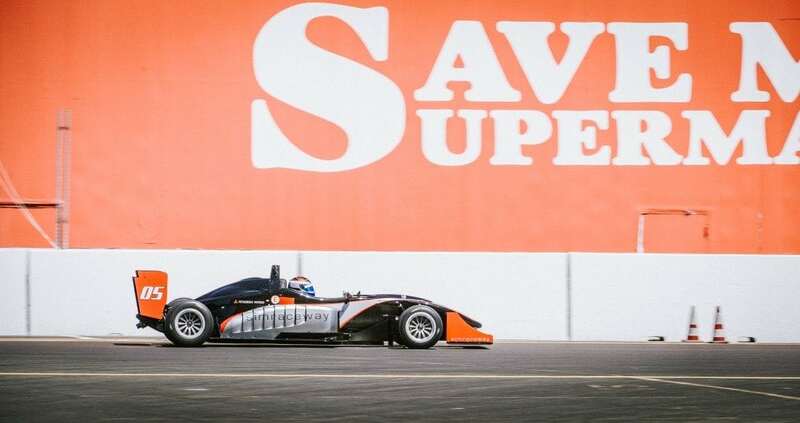 Another hot sunny California day greeted the penultimate round of the 2014 Jim Russell F3 series at Simraceway Performance Driving Center’s home base of Sonoma raceway. 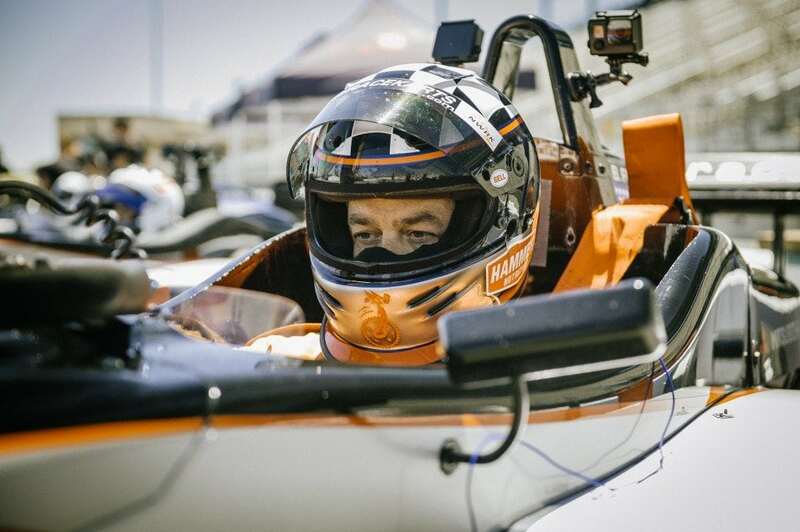 A full grid of drivers were raring to go with arguably the fastest 2 drivers of the series Kevin Woods & Chase Murray ready to go toe to toe for top spot. 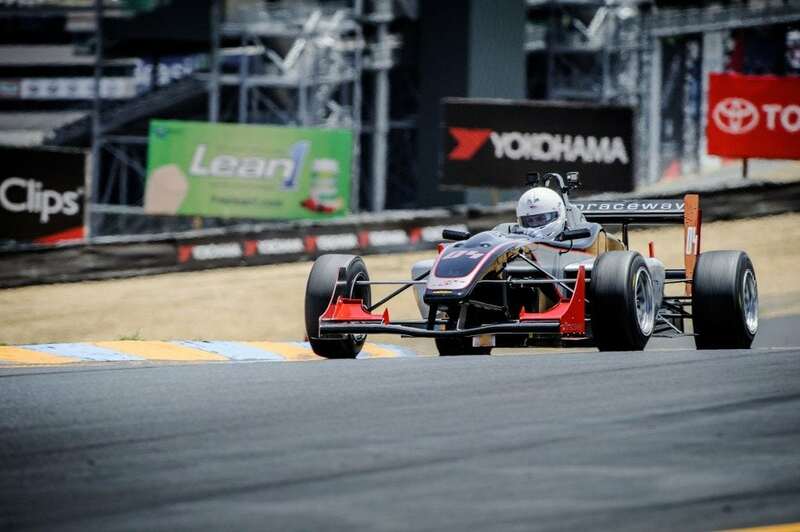 Qualifying was a thriller as both Kevin & Chase bantered pole position back and forth lap after lap till finally Chase secured P1 on the board in the last throws of the session. 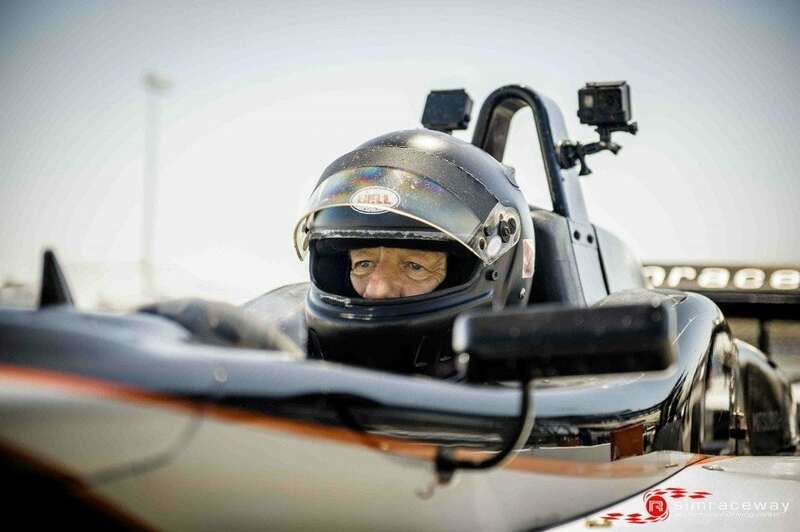 Filing up in equally competitive runs were Doug Tuttle, John Jastremski , Brian Frank, Roy Block ,John Schauerman, Steve Campbell and crowd favorite and past victor Jim McGuire. 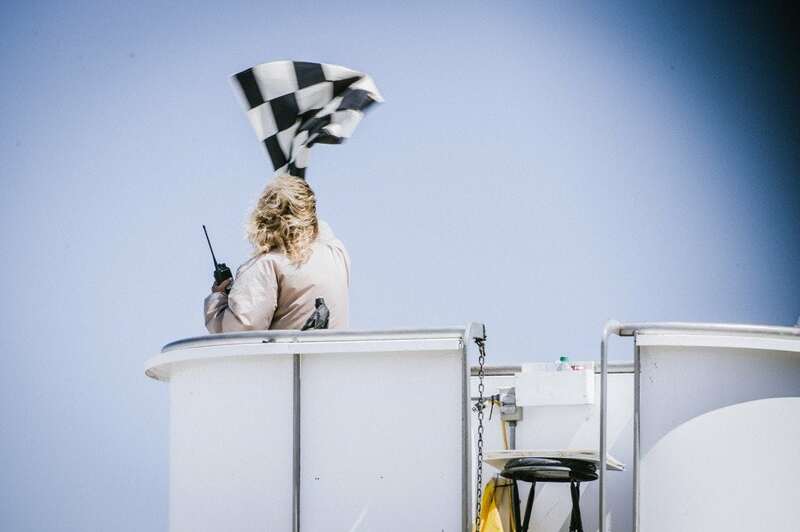 The tight field stayed well bunched as the pace car pulled off and stayed that way all the way into turn one, Woods & Murray running side by side all the way to turn 3 where Chase managed to get completely in front. 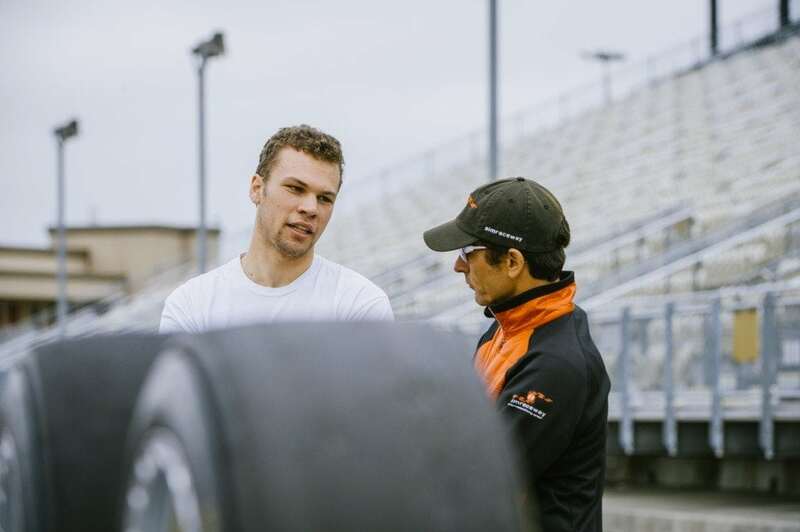 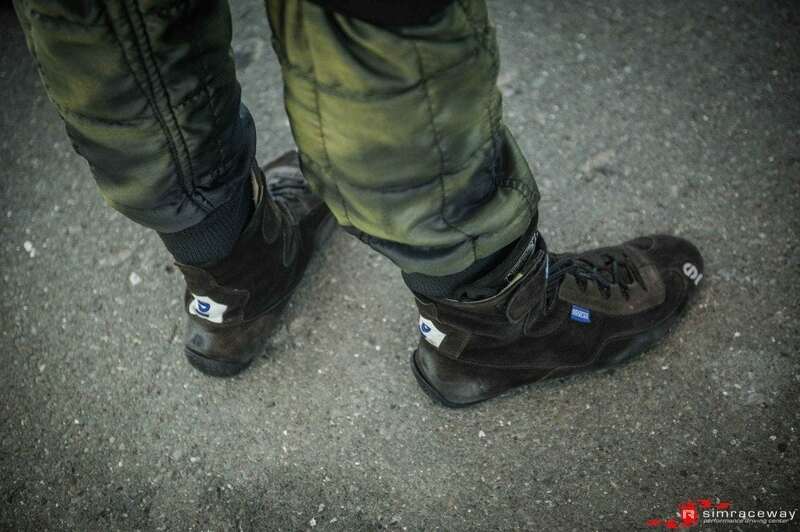 But Kevin new an early pass on colder tires would be crucial to have a good chance of putting another 60 points in his pocket, and so it was that on the rundown through the esses he stayed closer than most dare to the back of the no.23 Texas Tiger. 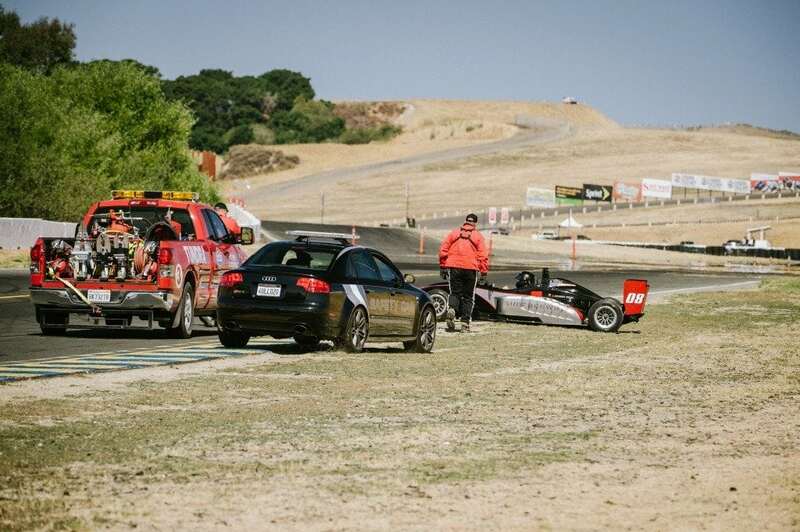 Chase covered the predictable inside pass but Kevin jinked to the outside and with Chase now off-line to the inside was able to brake a bit later and show his car to the outside. 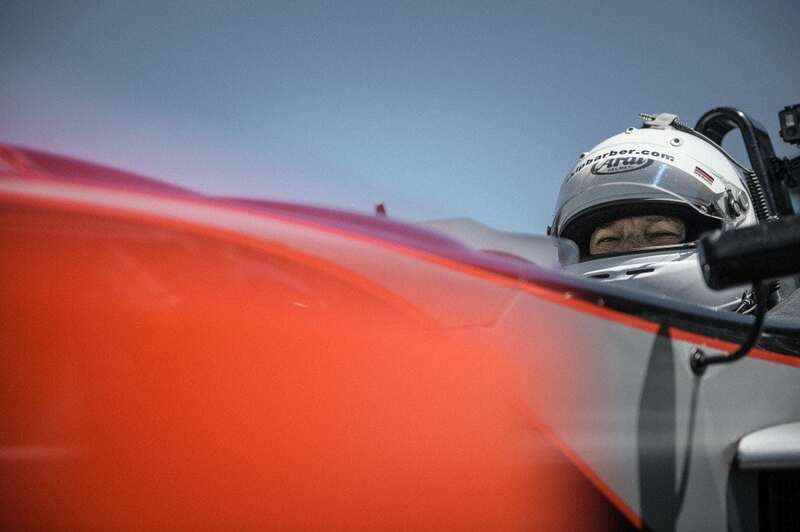 As they entered the turn in point with Kevin’s nose just an inch or two ahead Chase checked up his speed to allow a clean run for both through the Chicane, Woods was now the point man. 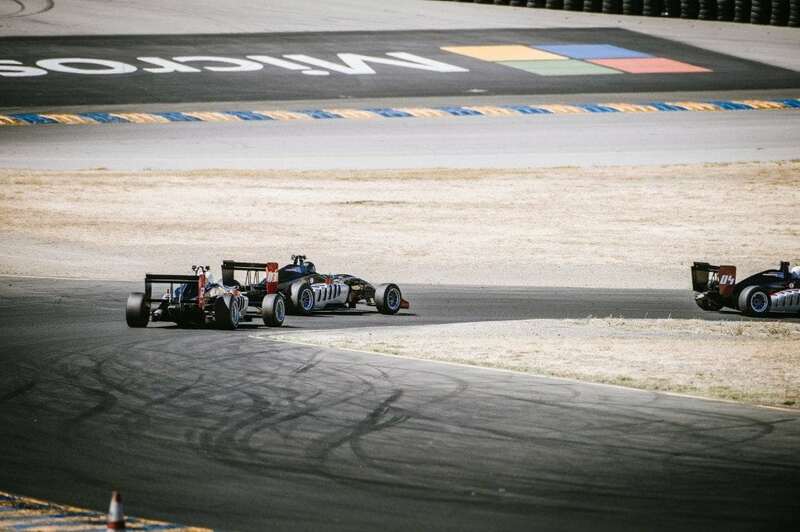 The lead battle raged on till lap 10 when Chase tried to get close to Kevin going into turn 6 as this leads to the best passing opportunity in turn 7. 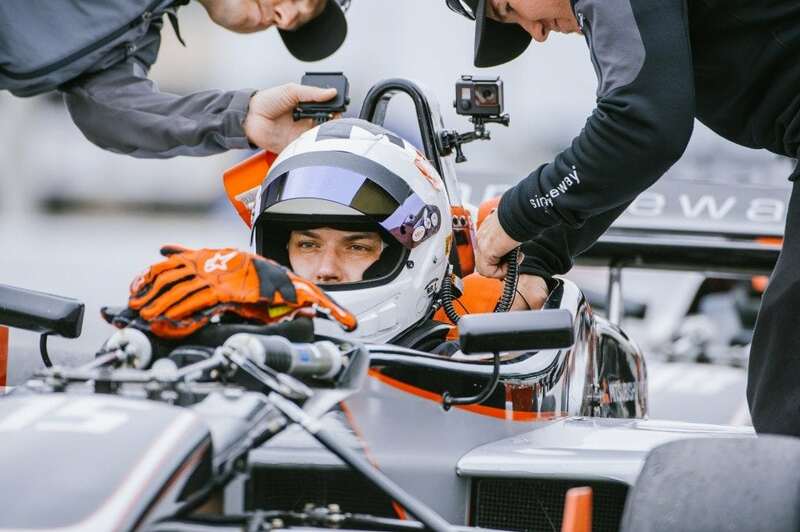 But with a little less aero from following the lead car it proved just a little too difficult and Chase lost the rear end spinning to the middle of the track & although he was able to get back under way was never able to recover and ended up in 9th place at the finish line. 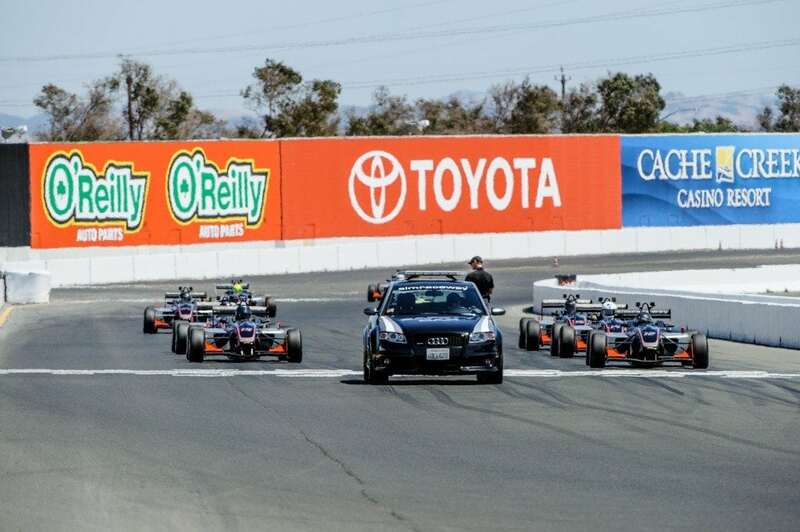 The field then got separated from each other as they made their way past the stationary Murray car to end the race with no battles to speak of. 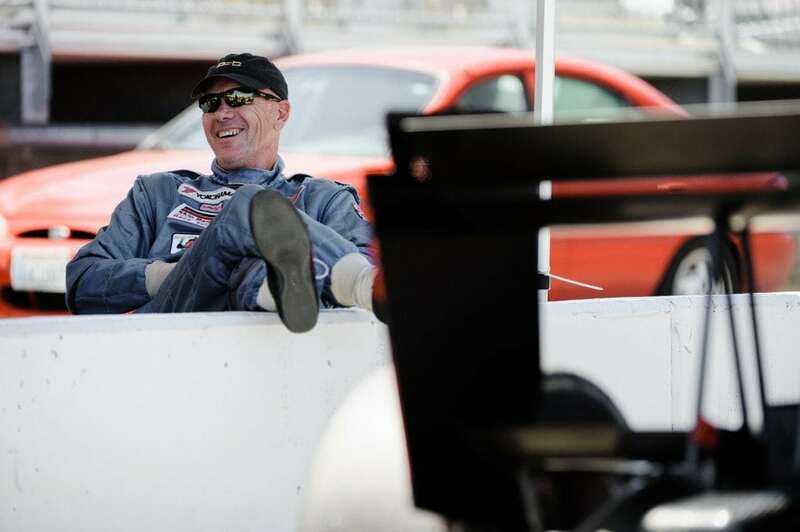 Brian Frank claimed 2nd spot on the podium with Doug Tuttle making another appearance on the famed steps. 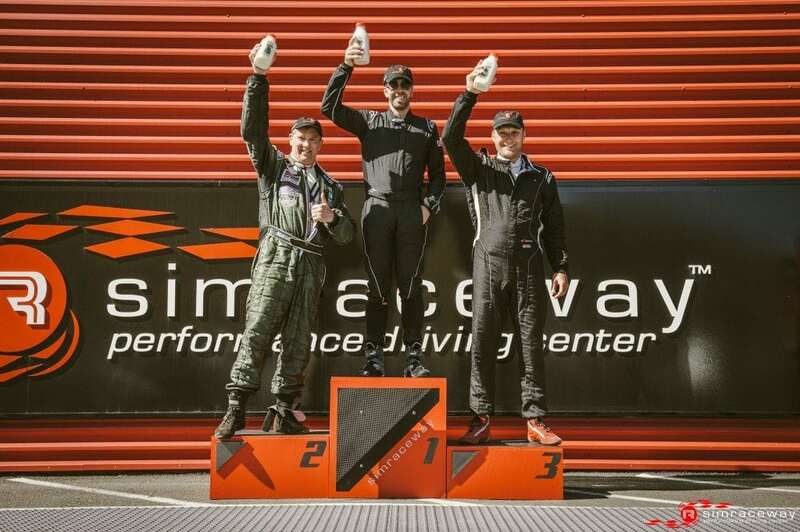 As is always the case a nice bottle of bubbly greeted the top 3 but this time in acknowledgement of the start of the 2nd half of the F1 season at the famed Spa Francorchamps circuit with a fine Chimay Belgian Beer, what could be better! 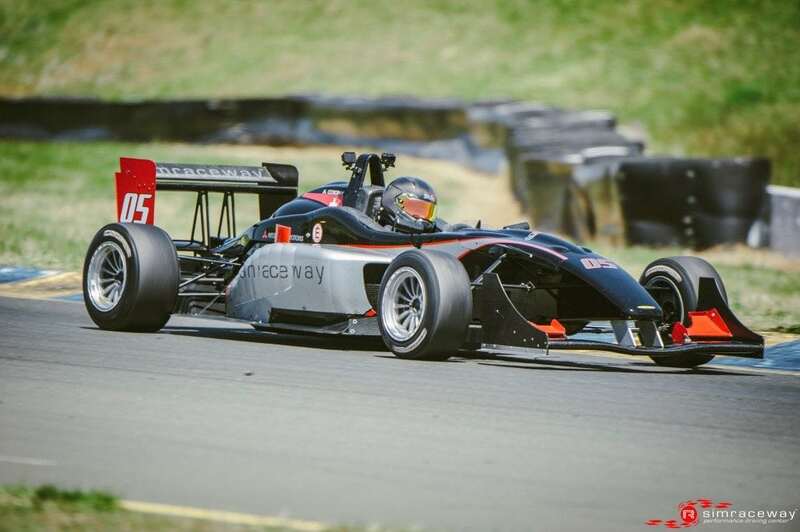 It was Round 10 & the curtain call for the 2014 Jim Russell F3 series and once again Chase Murray held the point in qualifying with Kevin Woods close behind, the rest of the field stacked up even tighter with an extremely small margin from front to back. 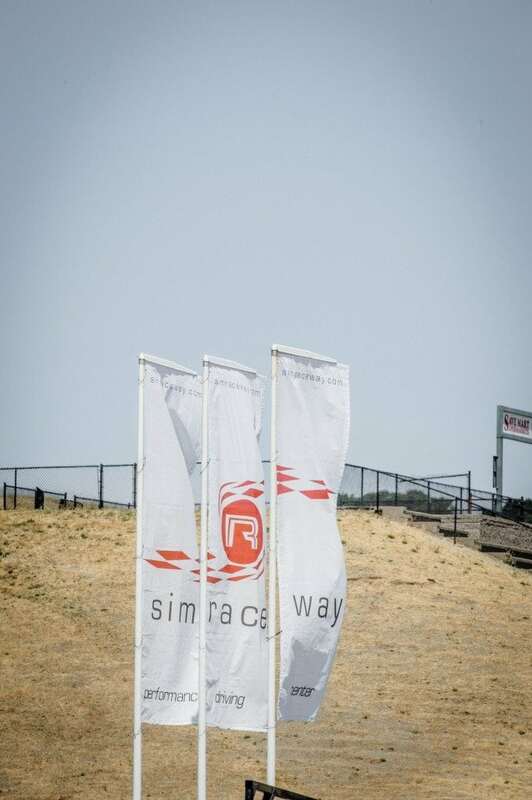 This time the field was led to the flag by the new Simraceway SEAT Touring car, so a brisk pace lap led to a fast start by Murray making sure he got the jump on Kevin into turn 1. 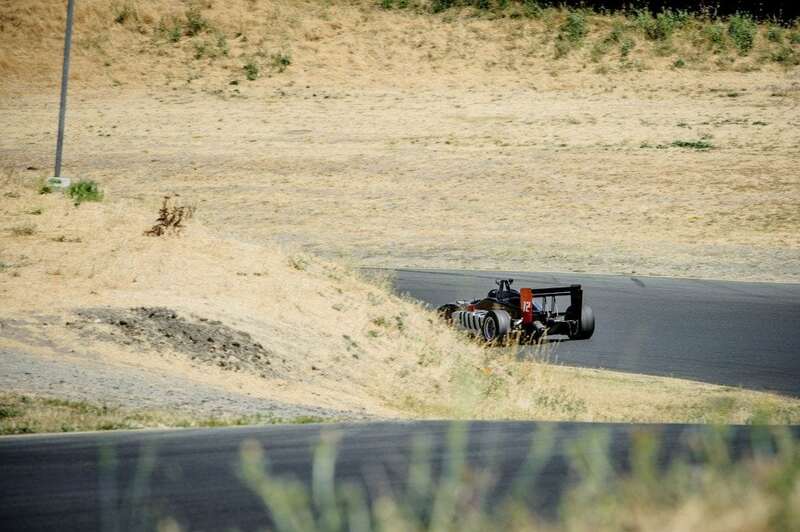 Behind them Frank and Tuttle made some space as a gaggle of cars ran side by side through the mighty esses with Schiller coming off worse as he ran off line while running alongside John Schauerman and had to check up his speed as the freight train ran by. 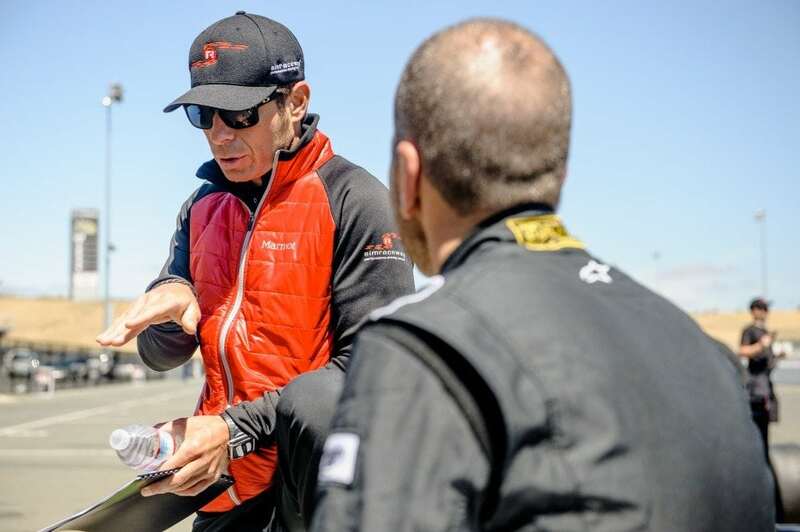 Once again Woods knew an early pass would be important but Murray didn’t let him have a go this time, lap after lap Kevin got more aggressive over the turn 9 chicane curbs till finally he took just a little too much and ended up rotating the car as it came down off the curb in 9b. 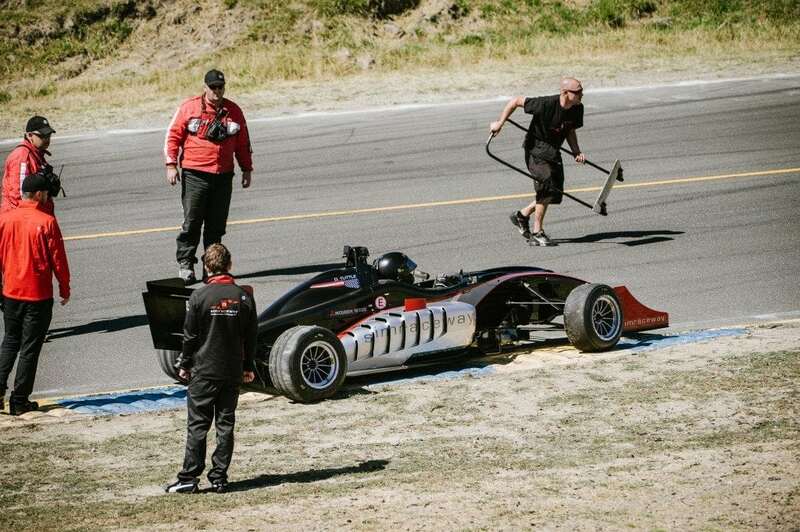 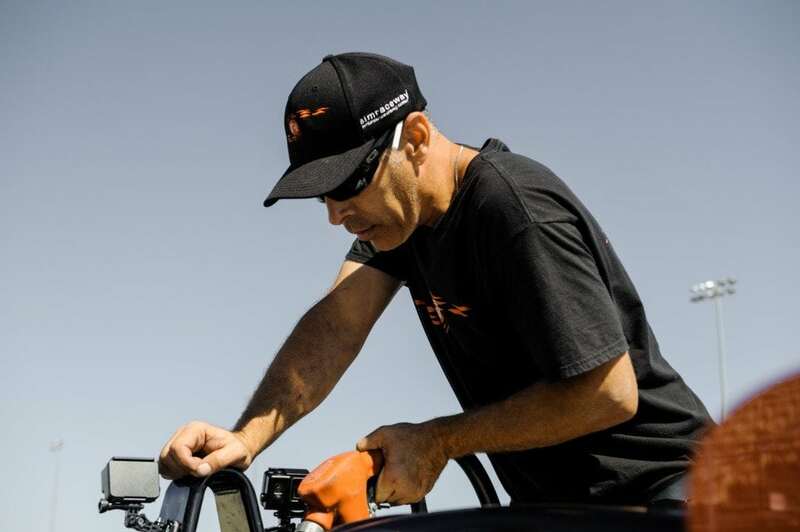 Once the field came through he tried to get the car back in the right direction as quickly as possible but ended up breaking a driveshaft in the process. 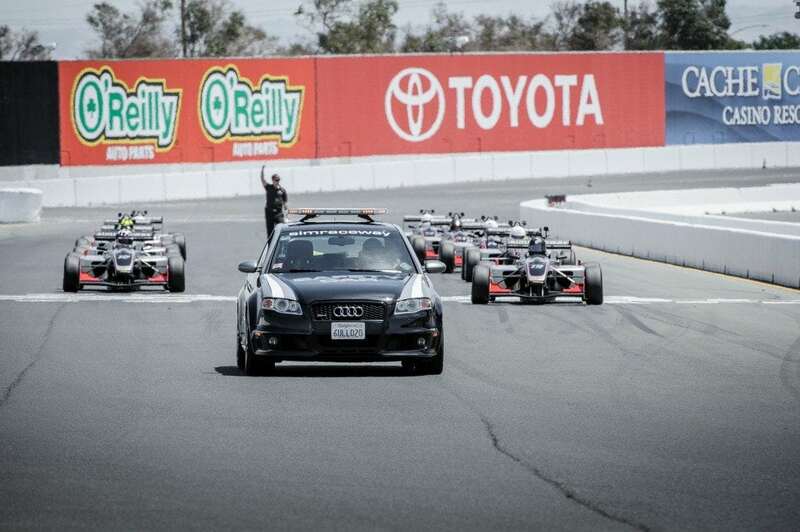 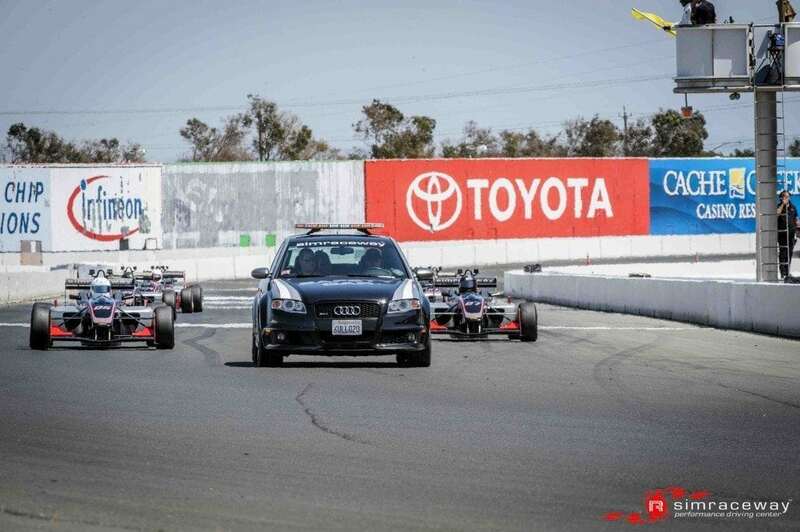 Pace car activated for just a couple of laps till the car was pulled into a safe spot and the drivers were at it again, tightly bunched some quick reacting right feet made for entertaining sight of side by side action past start finish and up to turn 2. 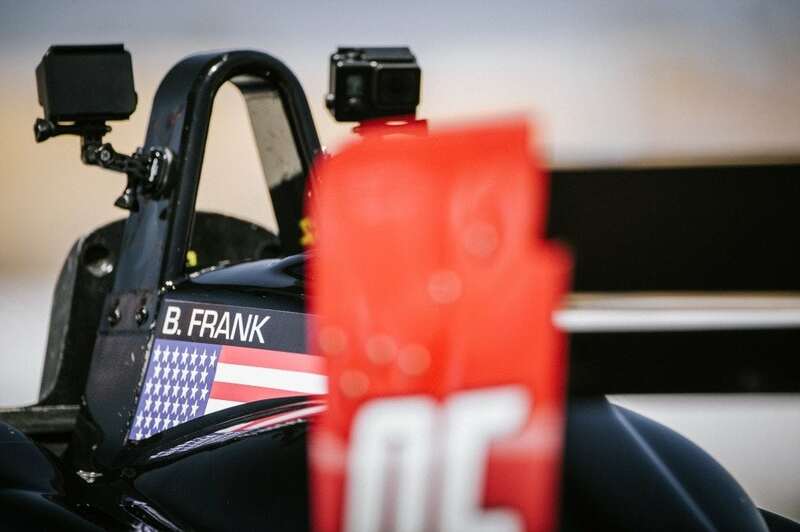 This time Brain Frank held onto Chases tail a little longer and kept him honest for a few laps before losing touch, Tuttle equally close behind. 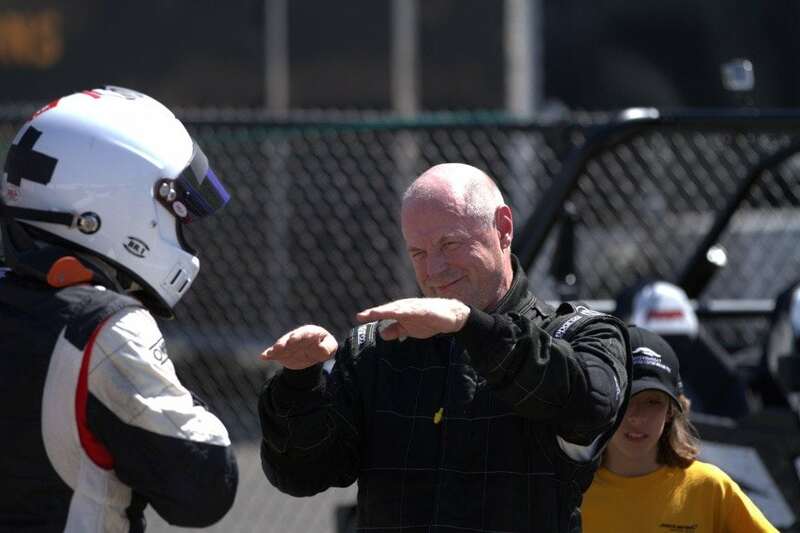 With Roy Block solidly in 4th the biggest battle emerged with old sparring partners Steve Campbell and Mark Schiller. 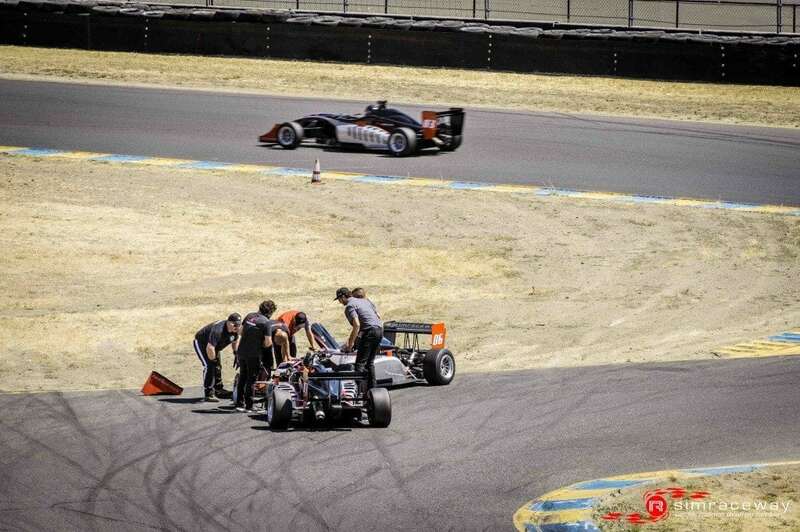 A frantic last 3 laps saw some side by action in turn 11 till the last corner last lap move by Schiller saw a drag race to the finish line with Mark an FIA nosecone ahead at the checker. 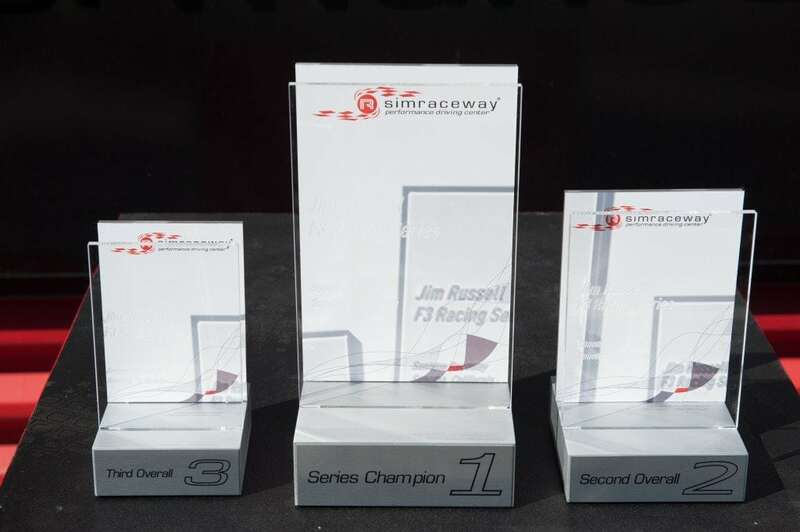 With the season over it was time for the Championship trophies to be handed out. 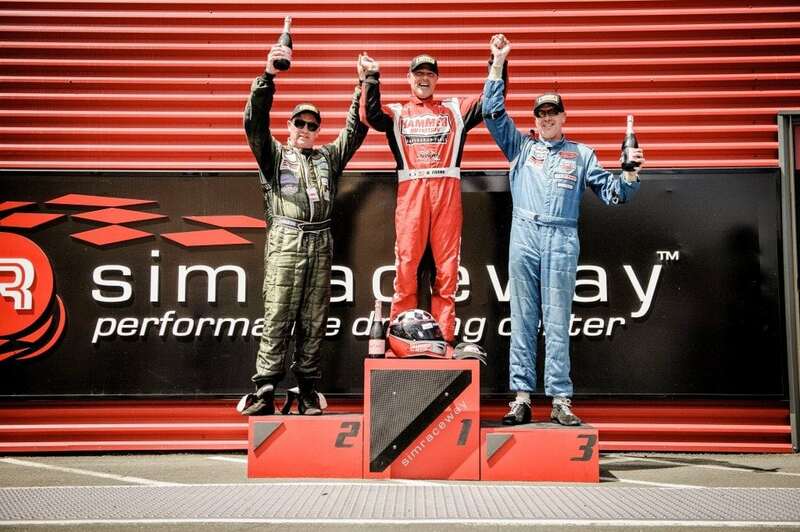 1st place went to the Texas Tornado himself Chase Murray with a fantastic and consistently quick season long campaign, 2nd place went to Doug Tuttle who on his day was as quick as anyone and made sure it showed in the standing, 3rd slot went to Tim Adolphson who although absent from the last weekend managed to stand on his early season points haul to nip Roy Block by 7 pts. 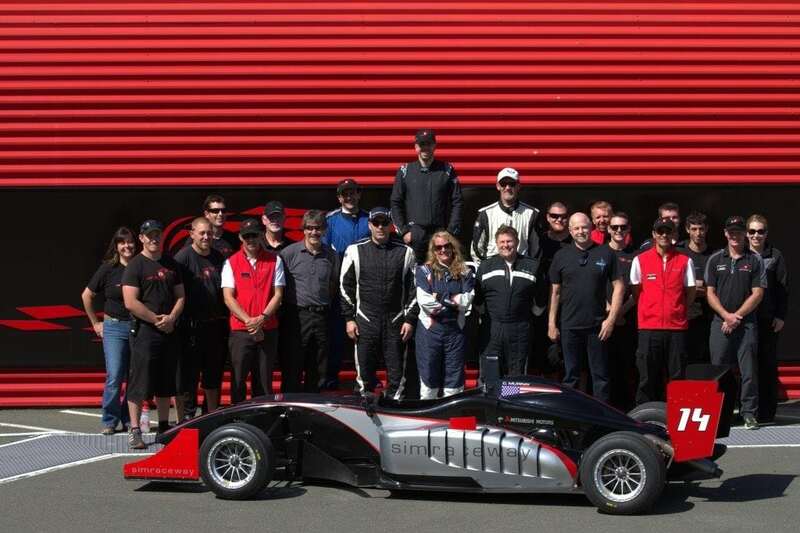 A great season is done but a great beginning to the new era of the Jim Russell Race Series and Simraceway Performance Driving School roll on 2015!